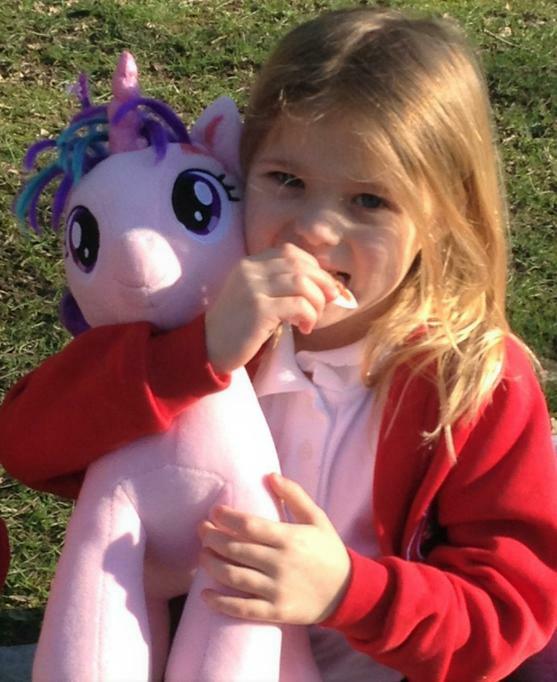 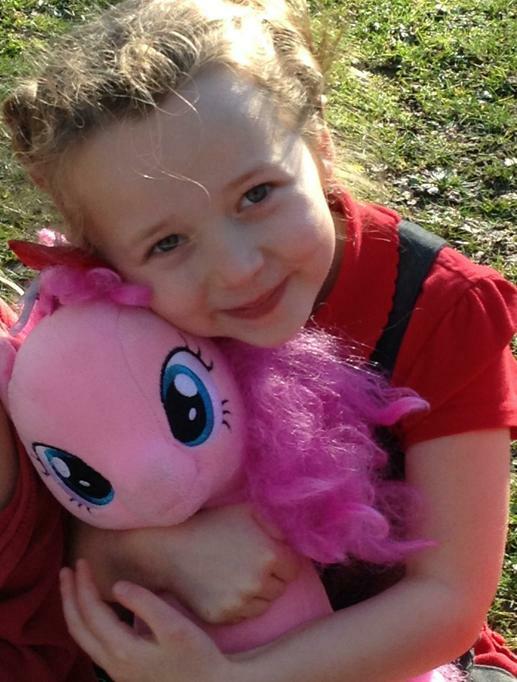 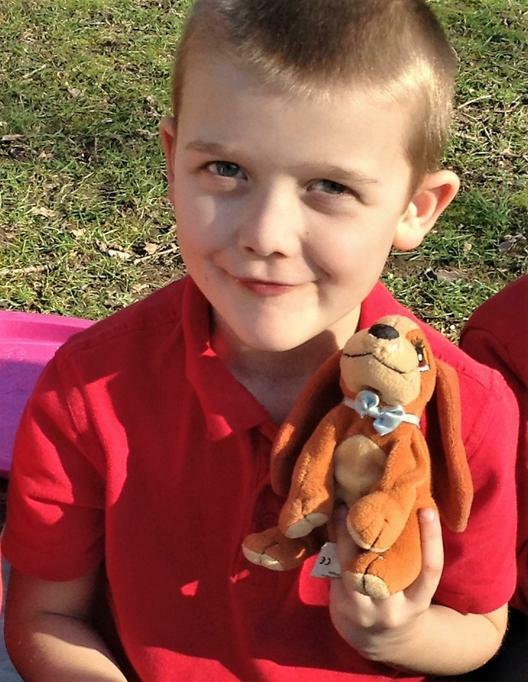 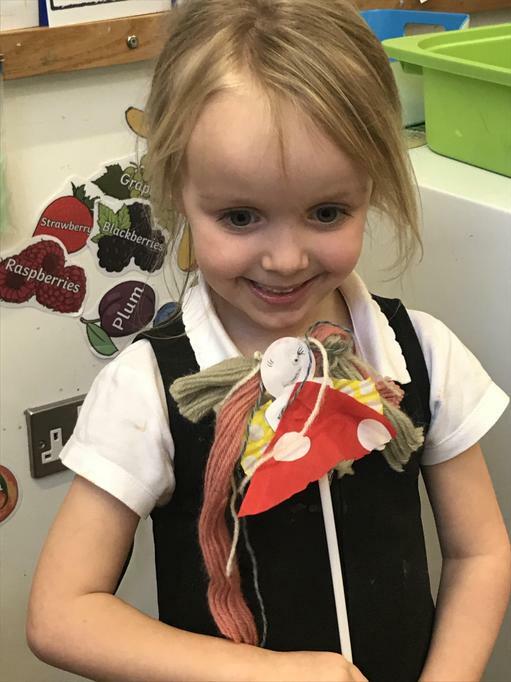 This half term our topic is TOYS!- hooray! 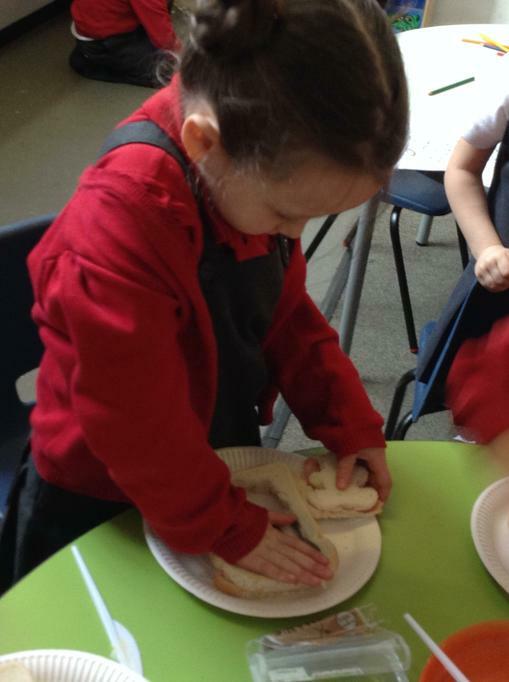 materials, and designing and making our own toys - both for ourselves and for other people. 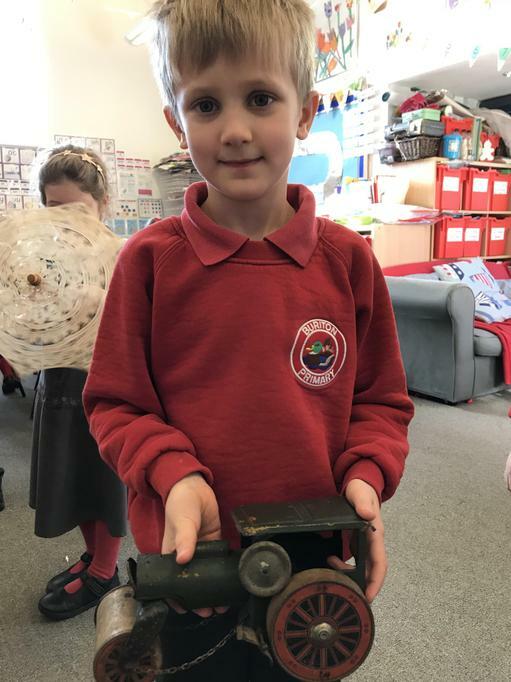 We will also be learning about the history of toys - examining how they have changed and developed. 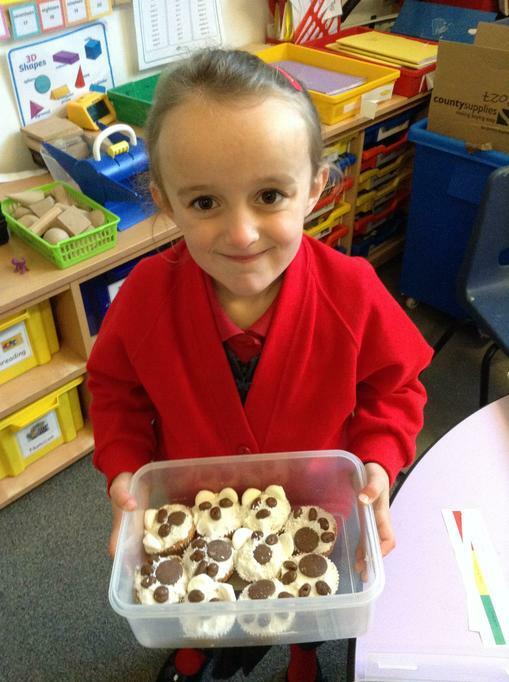 Week 6: Teddy Bears’ Picnic! 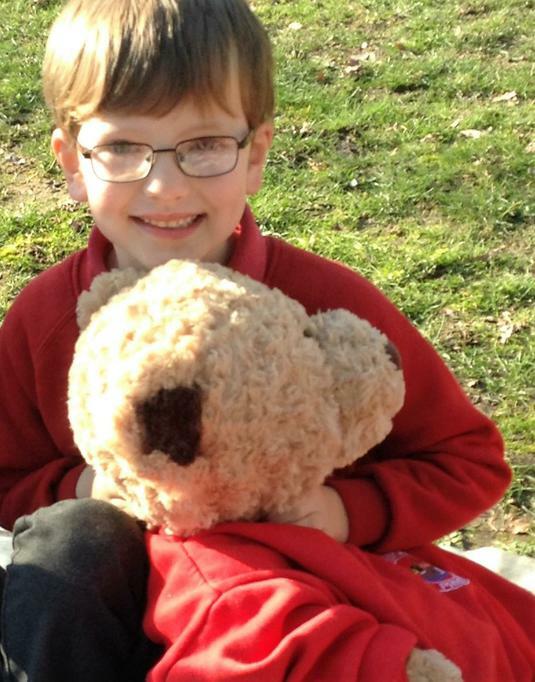 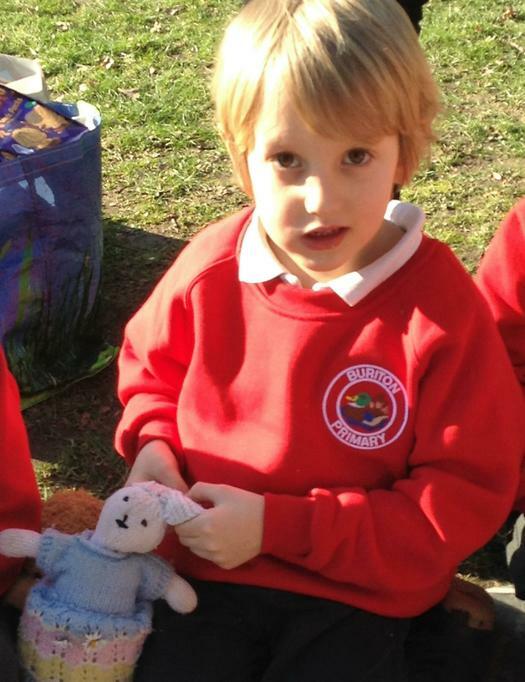 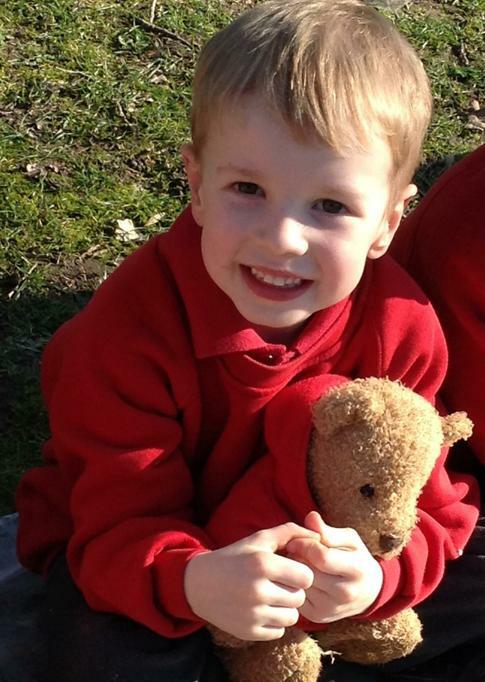 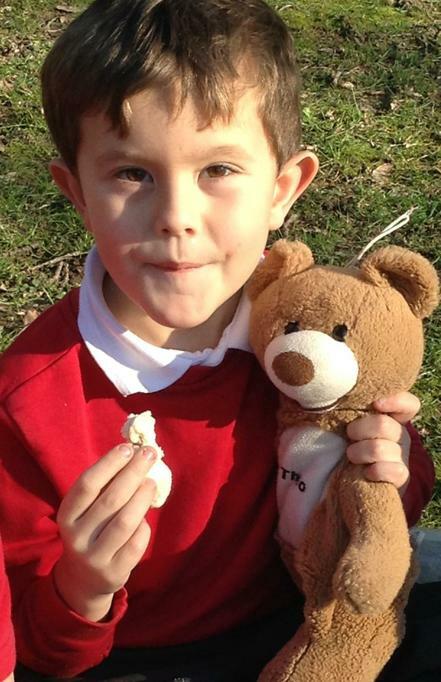 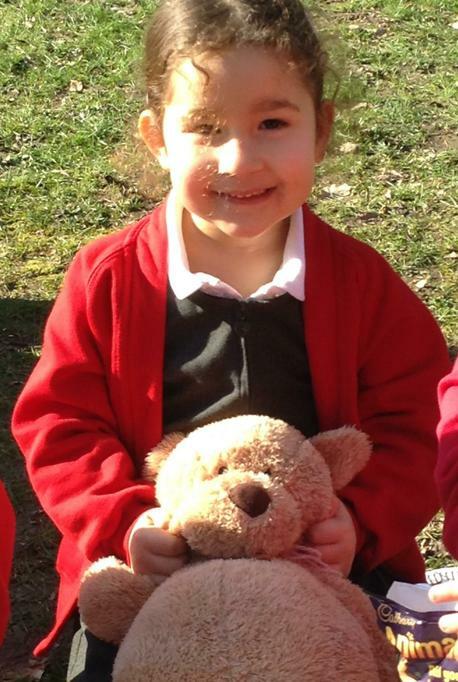 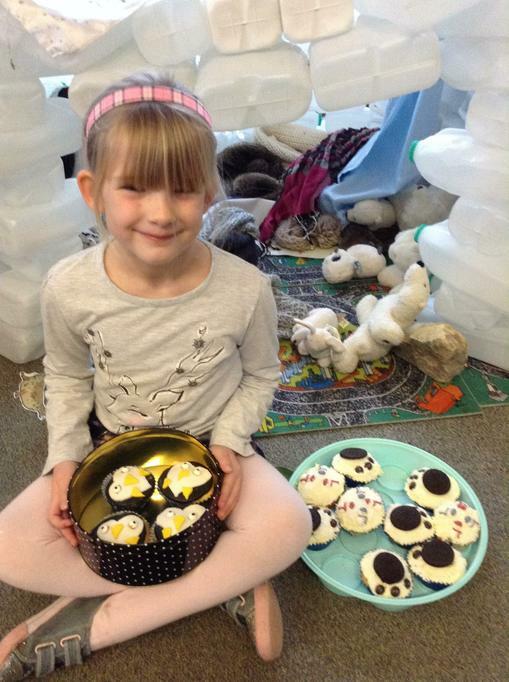 We learnt the song The Teddy Bears’ Picnic, and decided that we would like to host a Picnic for our favourite Teddies. 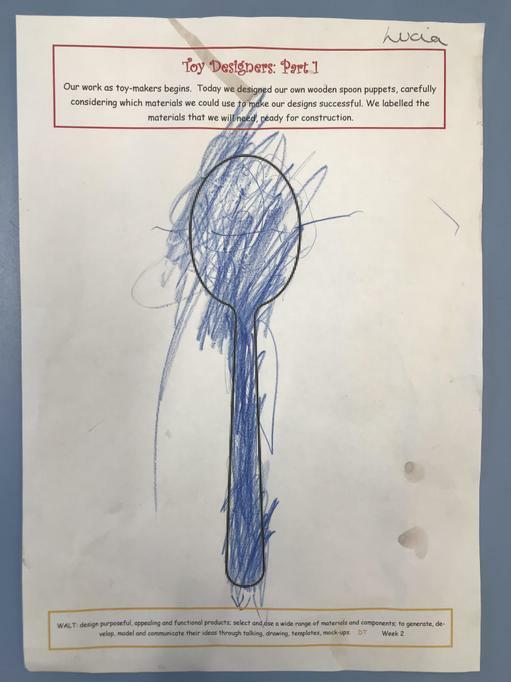 We wrote them an invitation, so that they would be certain when to come. 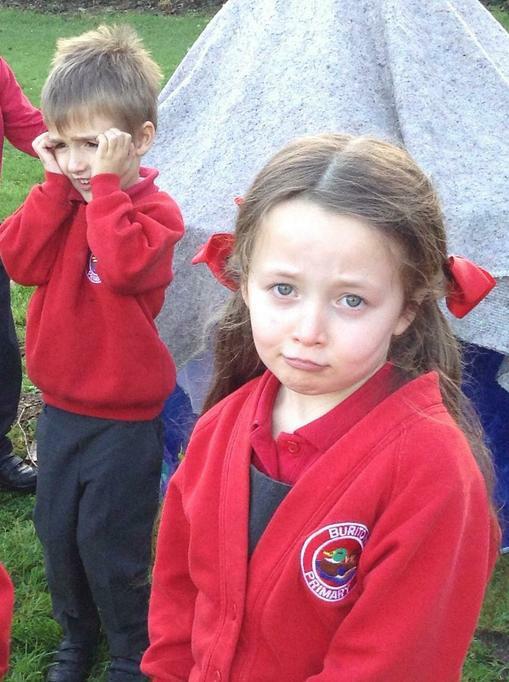 They were all so excited to come to School that we had to sit them on the sofa to calm down! 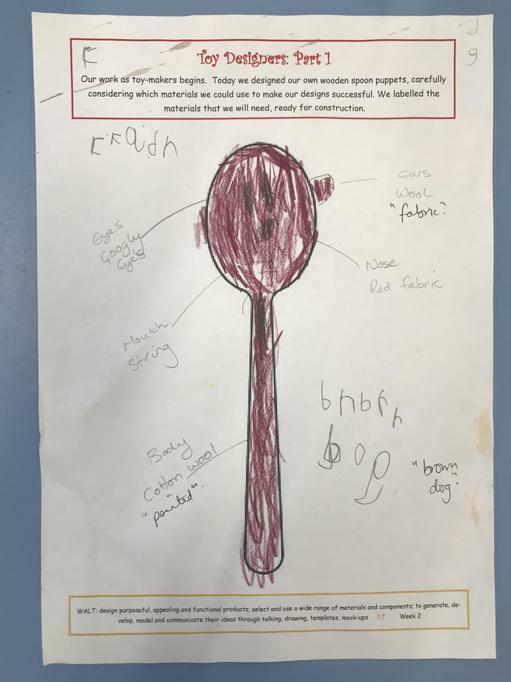 We drew a picture of our teddy and measured it, and then imagined what Teddies would do at a Teddy Bears’ Picnic. 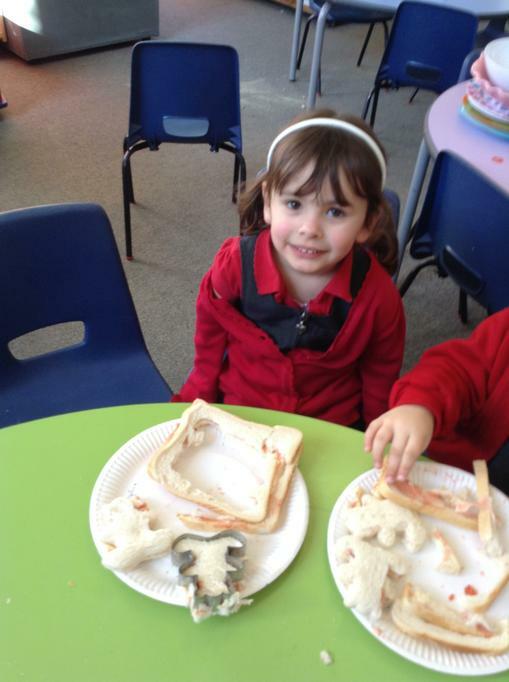 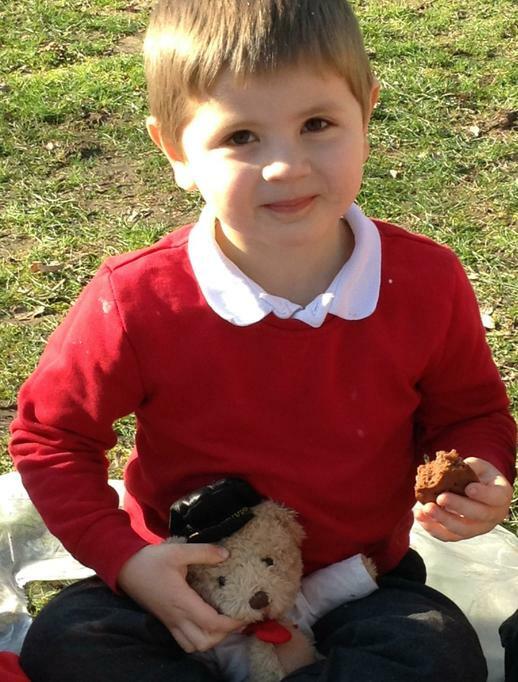 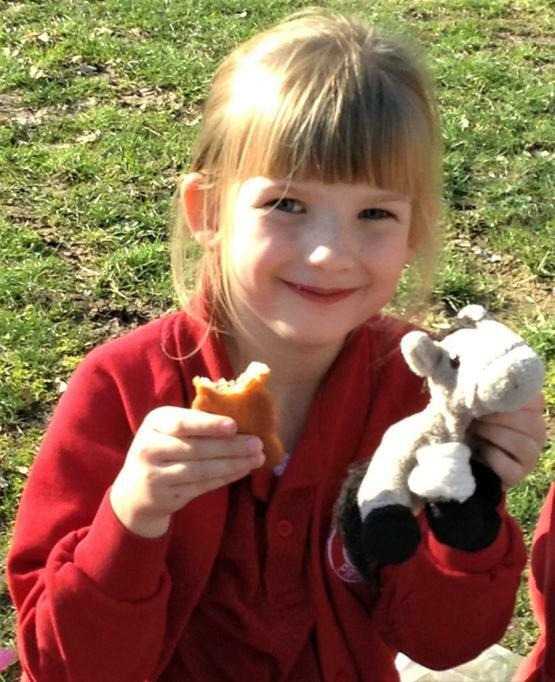 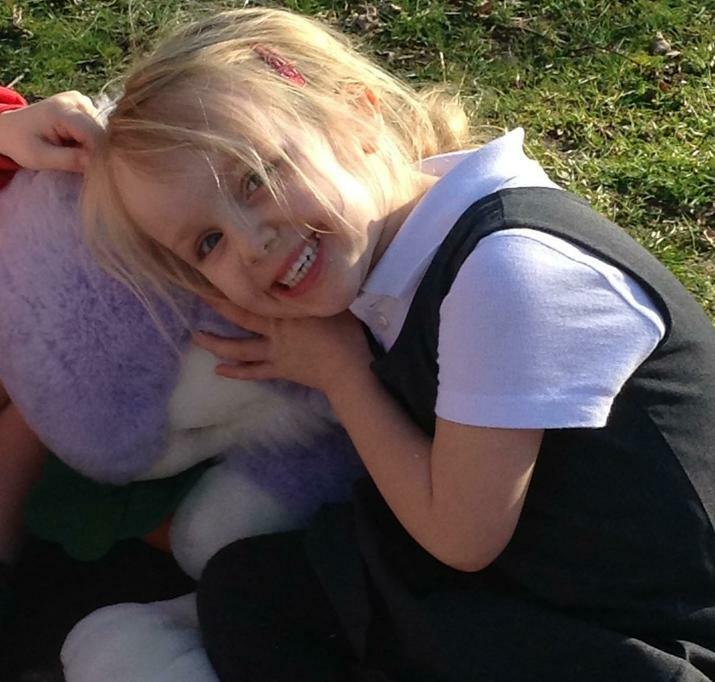 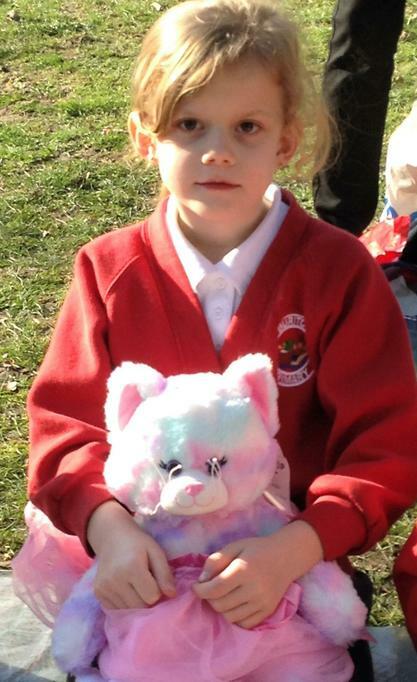 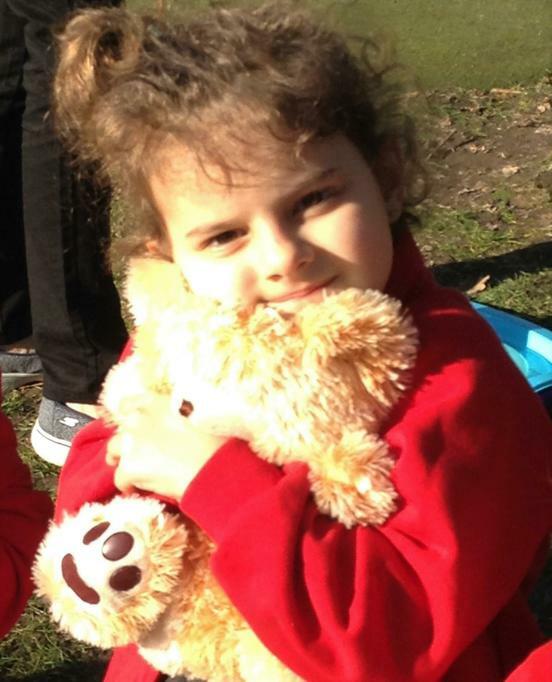 We all made our own sandwiches for ourselves and our Teddies, and took our furry friends out on to the Meadow. 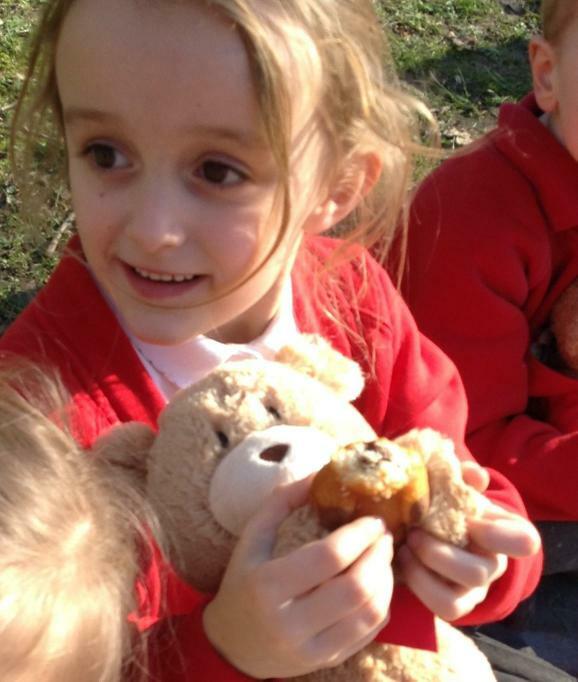 The Bears really enjoyed playing Hide and Seek, and climbing on the Timber Trail, before we settled down for our yummy picnic. 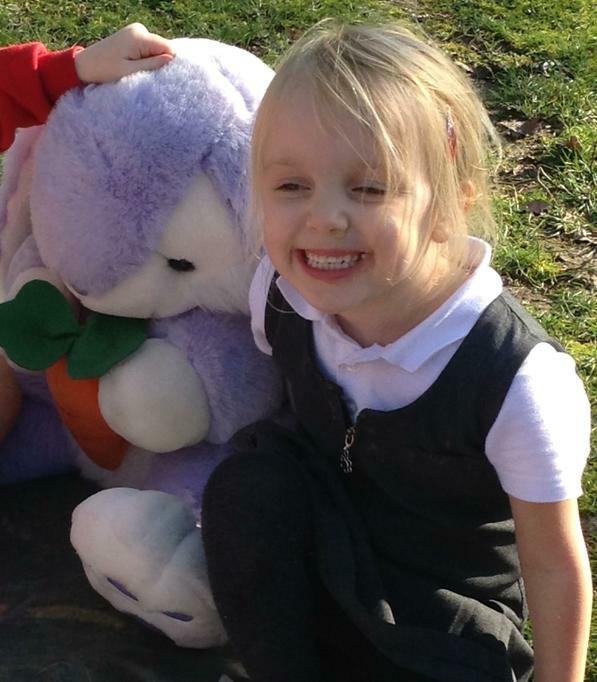 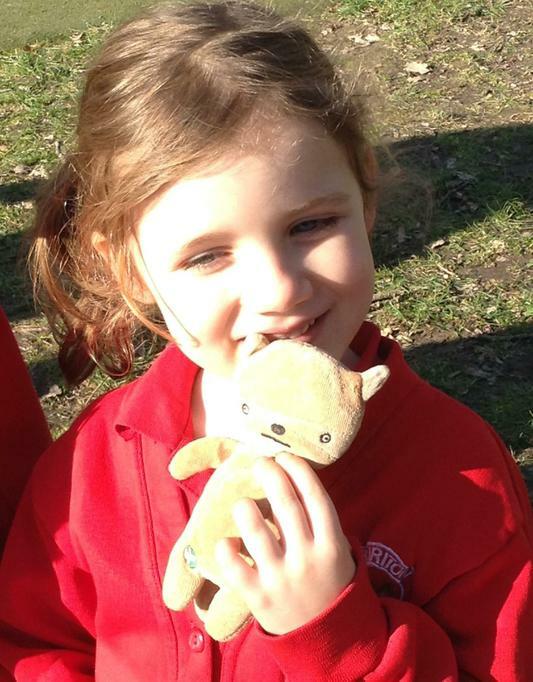 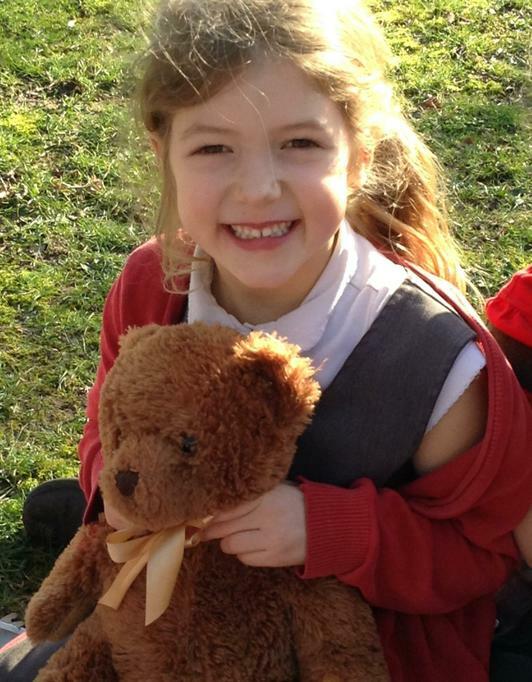 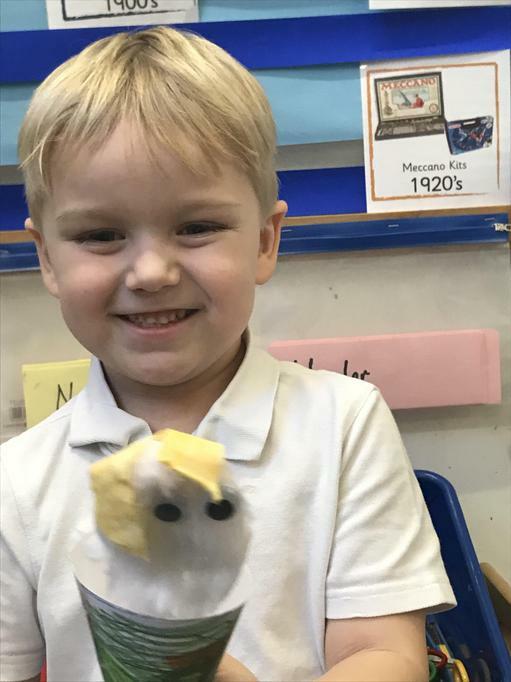 Week 6: Teddy Bear Week! 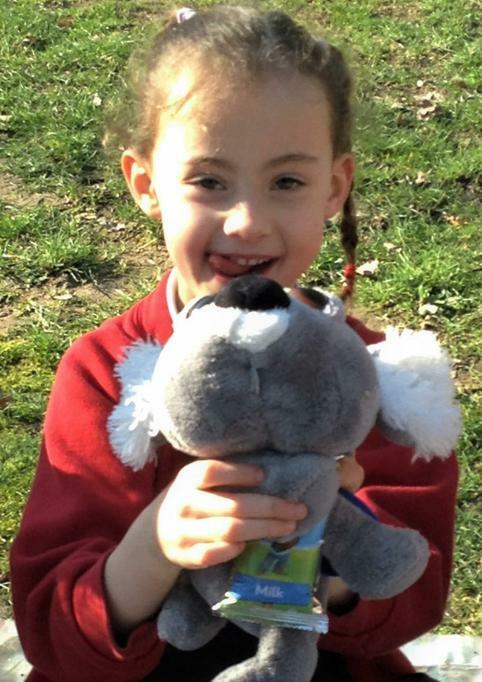 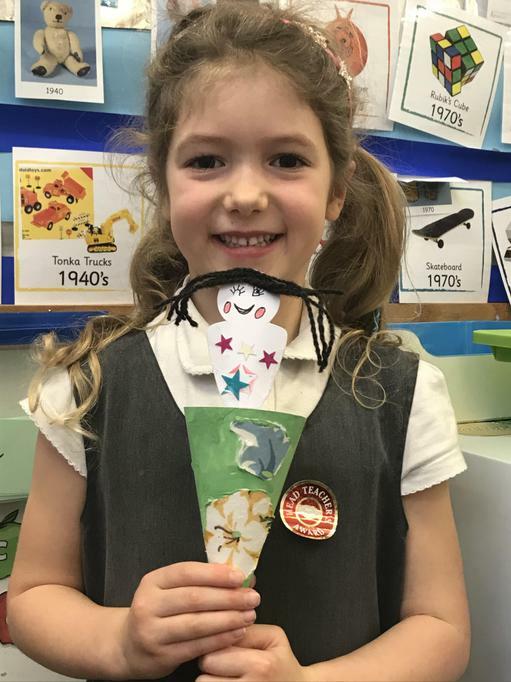 Having learnt about the history of Teddy Bears, first named after ‘Teddy’ Roosevelt in 1903, we know that Teddies come in all shapes and sizes. 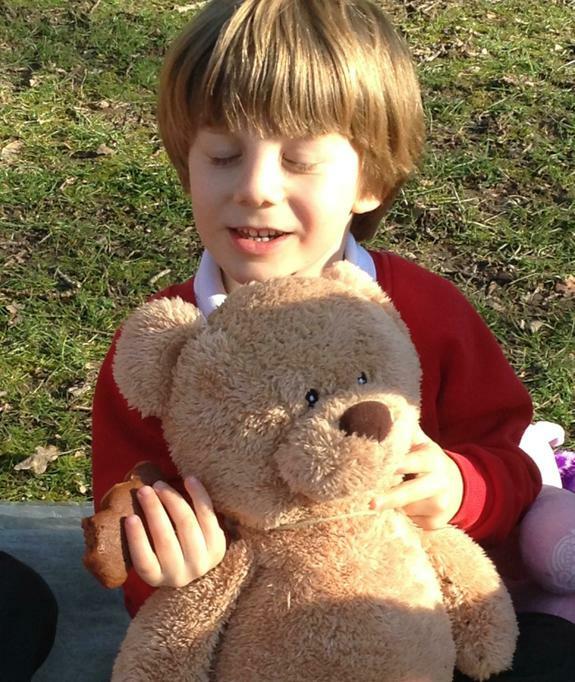 We examined a selection of teddies and tried to observe them closely. 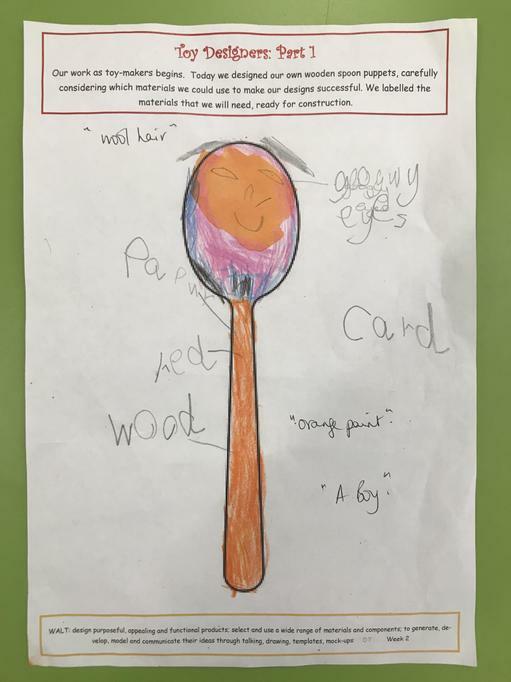 We used art pencils to try to convey the idea of their different textures. 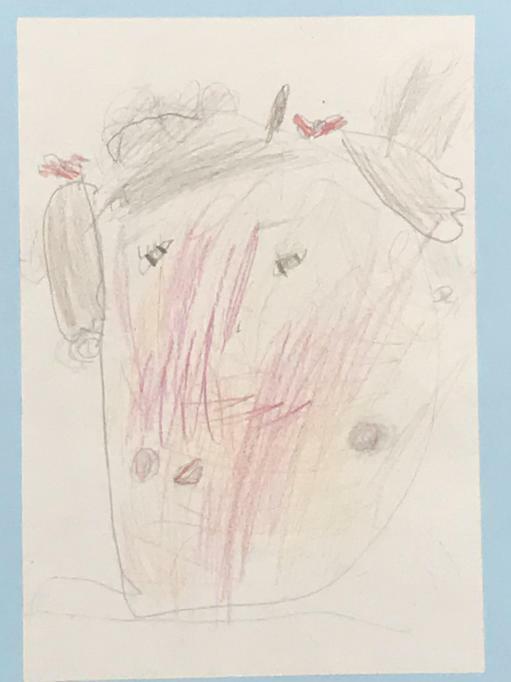 Can you spot the teddies you drew? 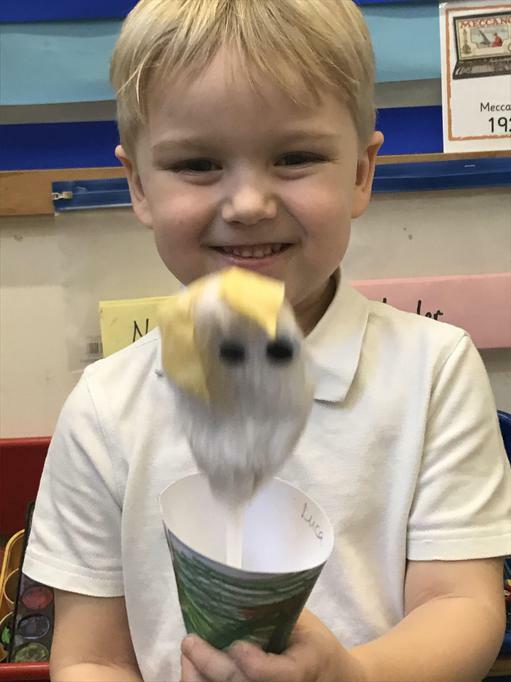 We had great fun learning about the history of puppet shows: we roared with laughter when we watched clips from Sooty and Sweep, and shouted "He's behind you!" 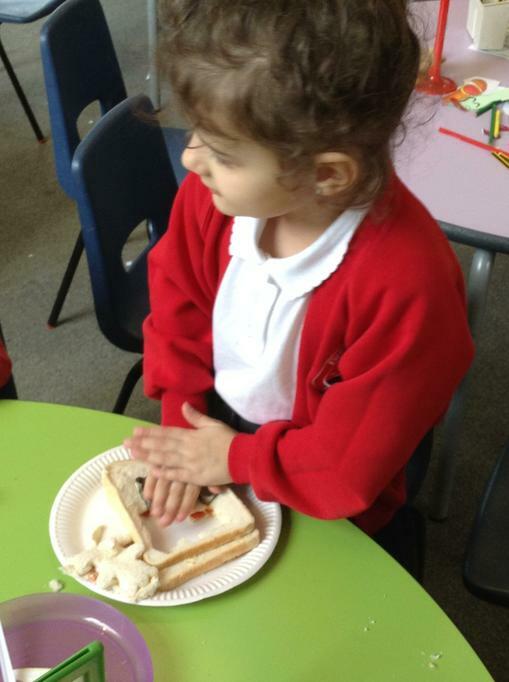 very loudly when the Crocodile tried to steal the sausages from Mr Punch! 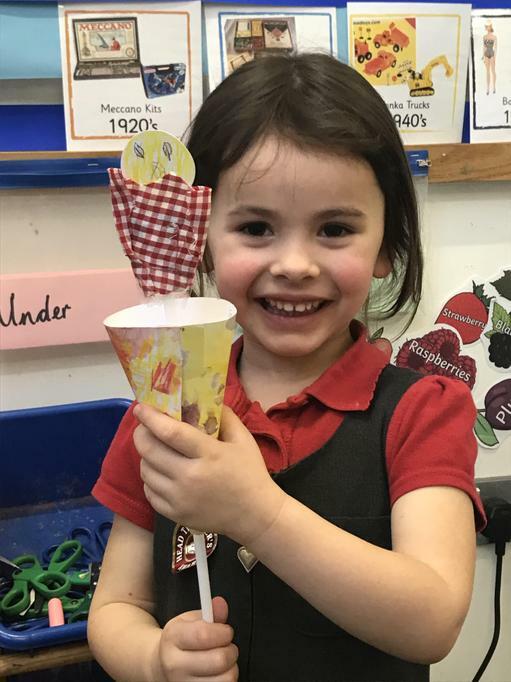 We then staged our own Wooden Spoon puppet shows to an appreciative audience. 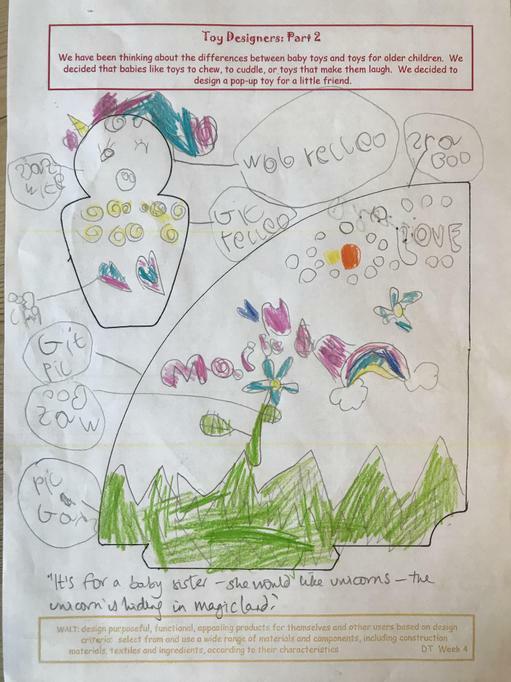 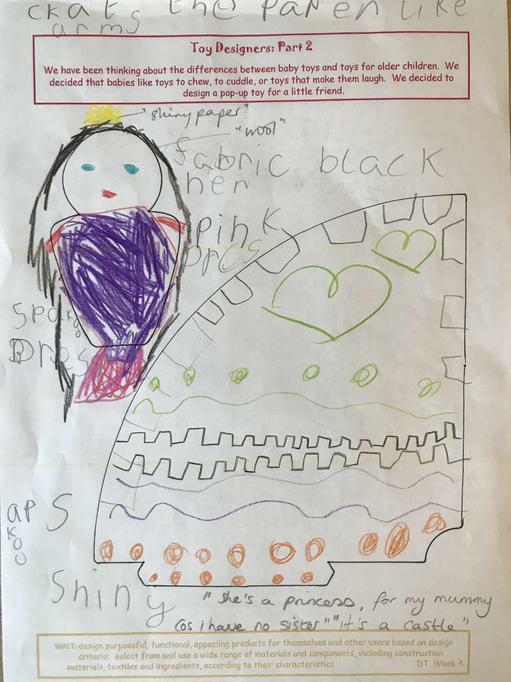 We watched a story about Zid—a little alien who tried and tried and tried to make “The Best Dress Ever”, by never giving up, never settling for just ’alright’ and by listening to her friend Mab’s kind and helpful advice. 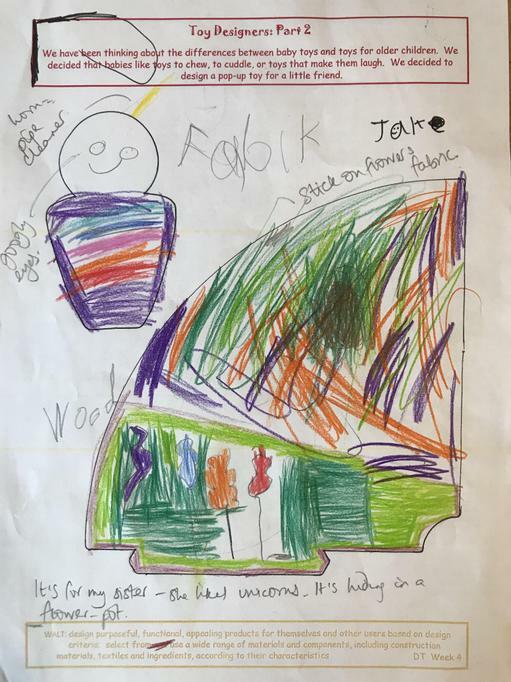 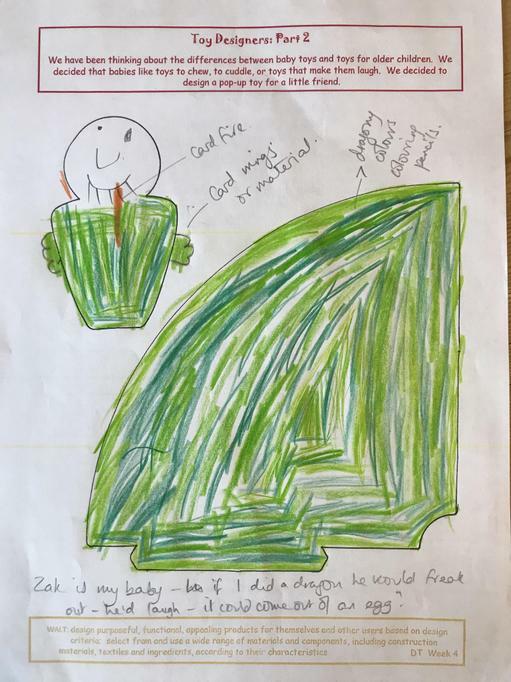 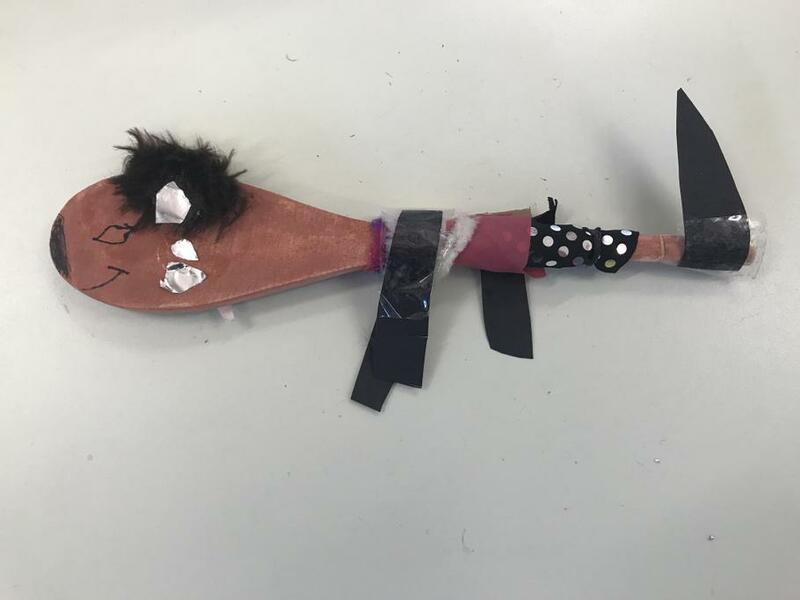 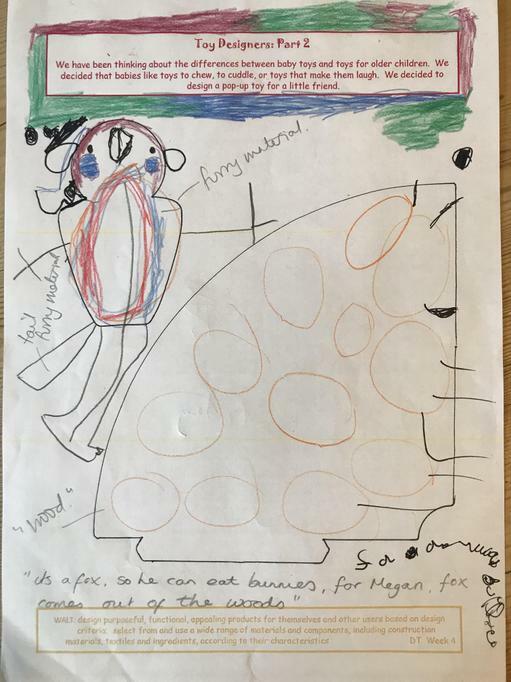 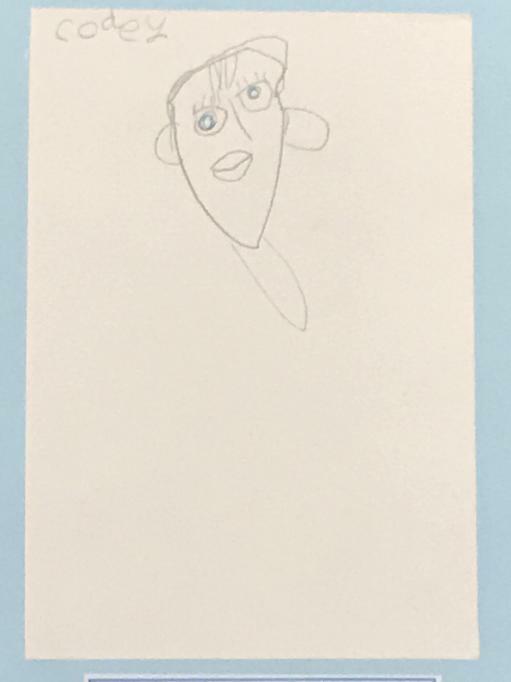 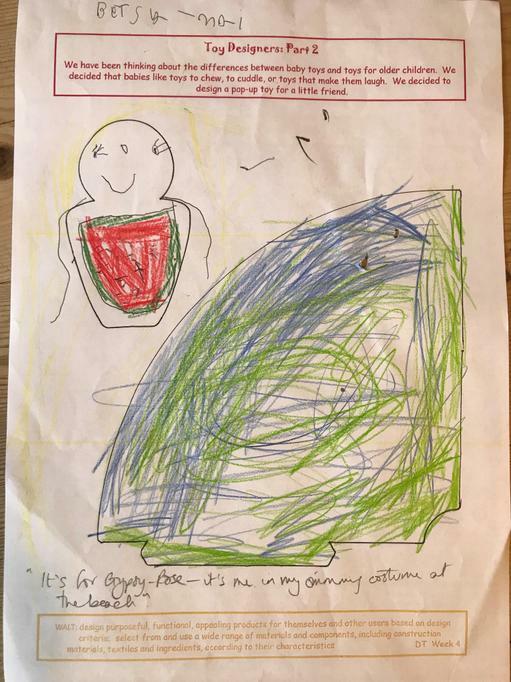 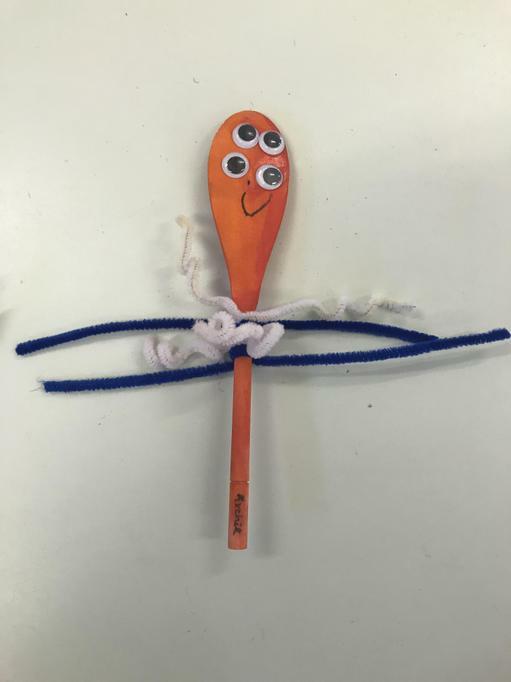 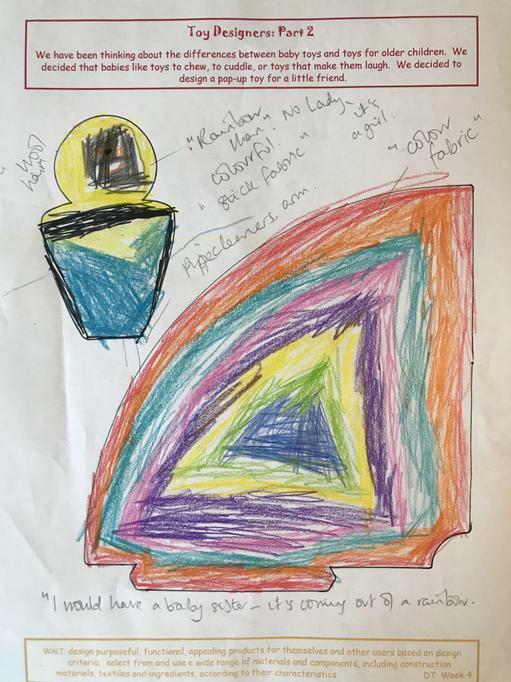 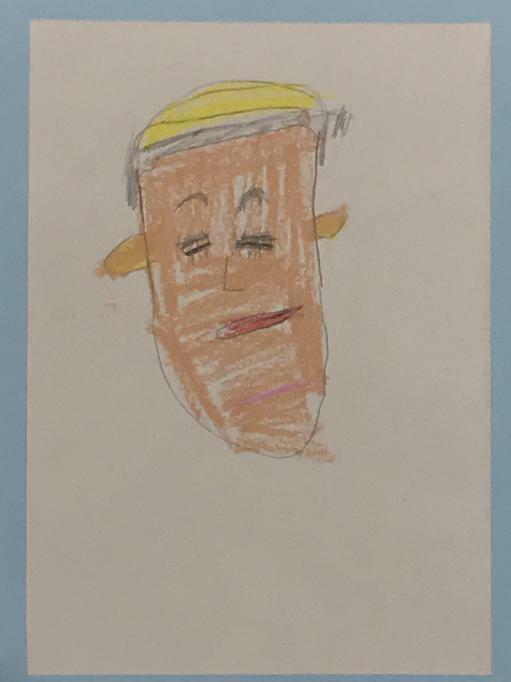 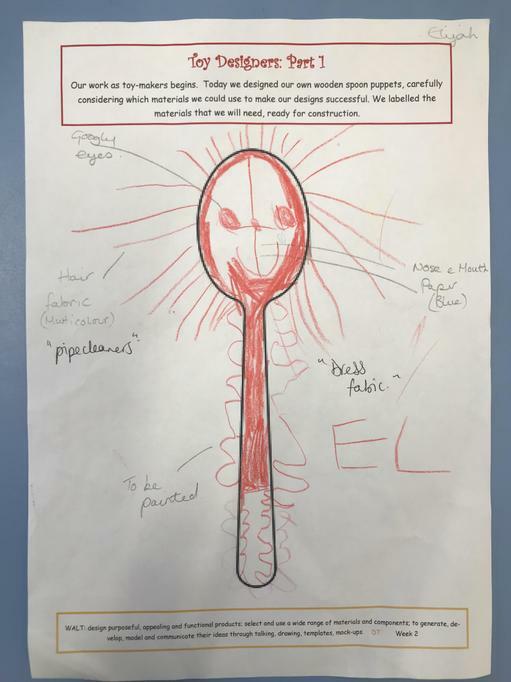 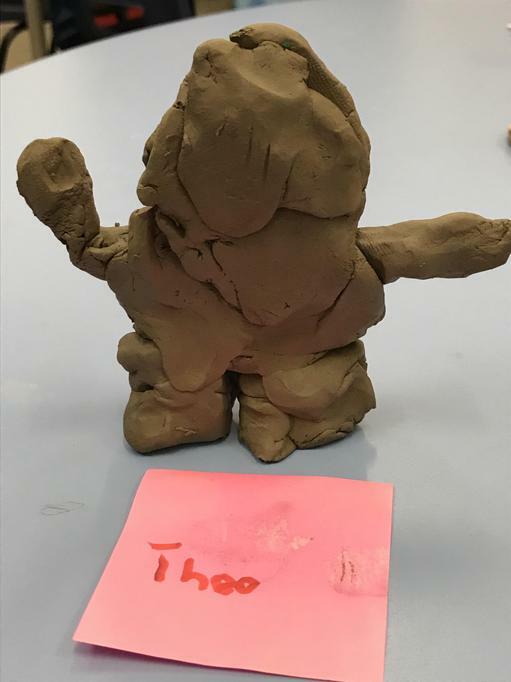 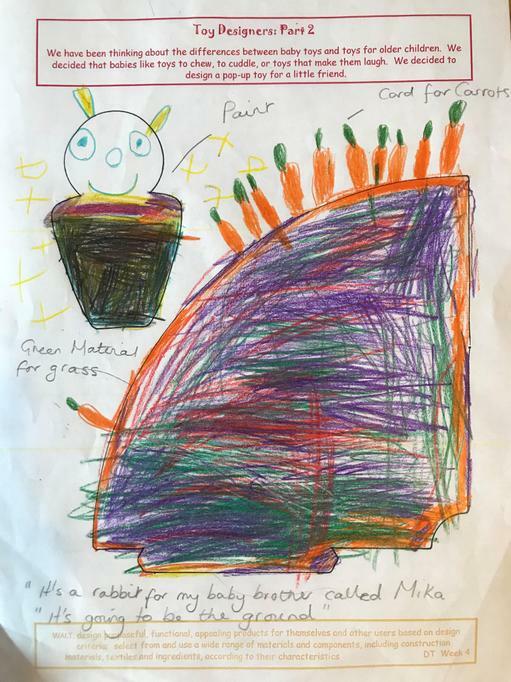 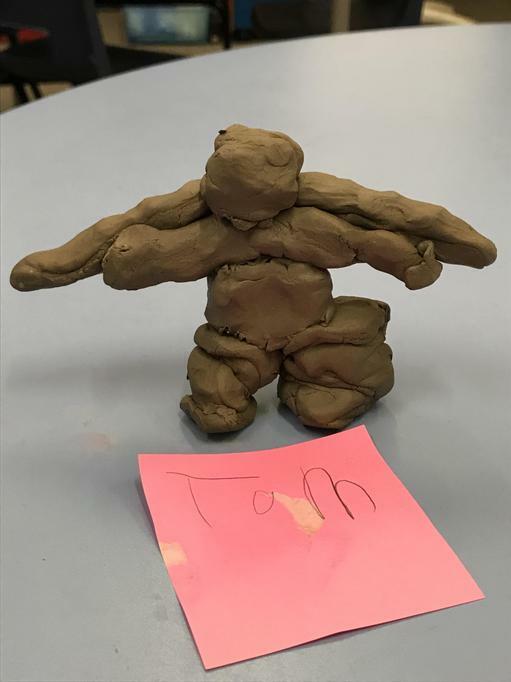 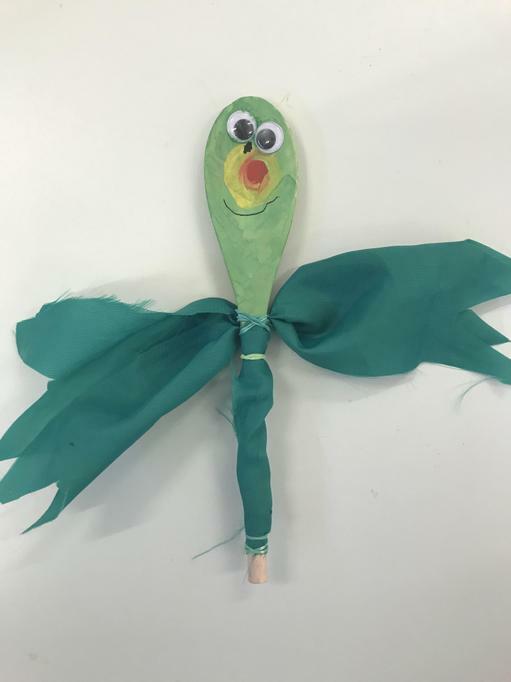 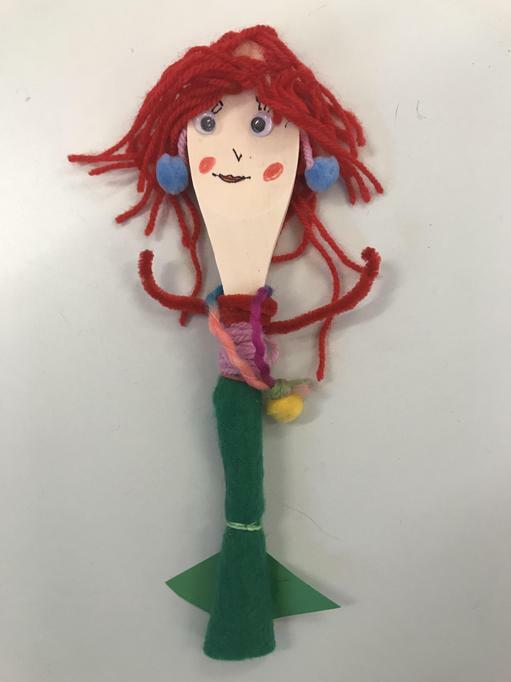 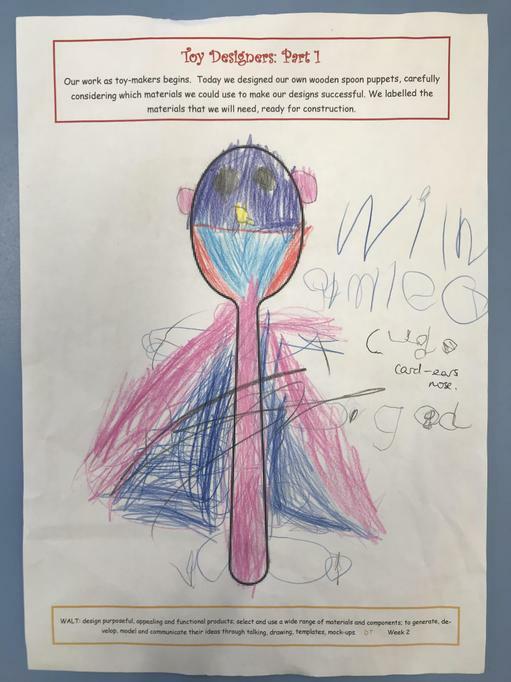 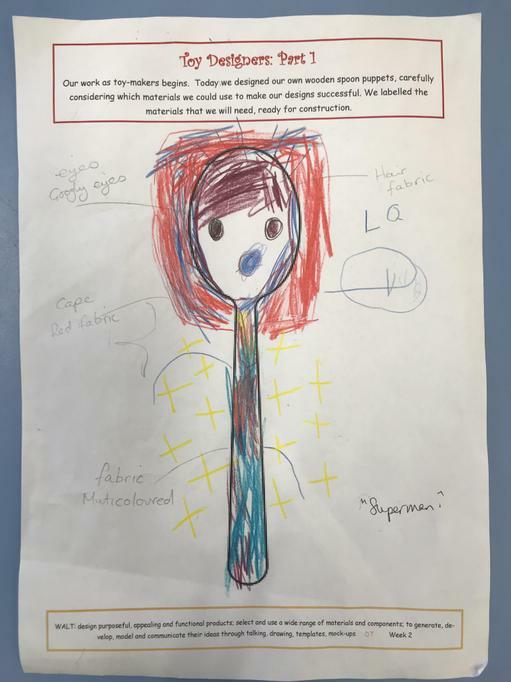 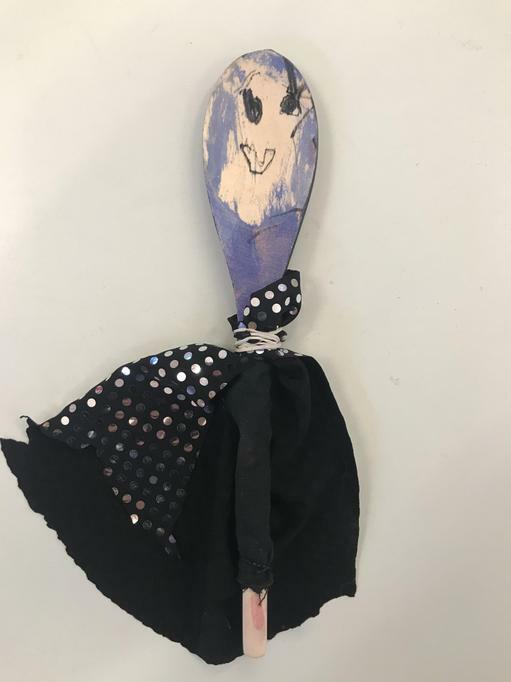 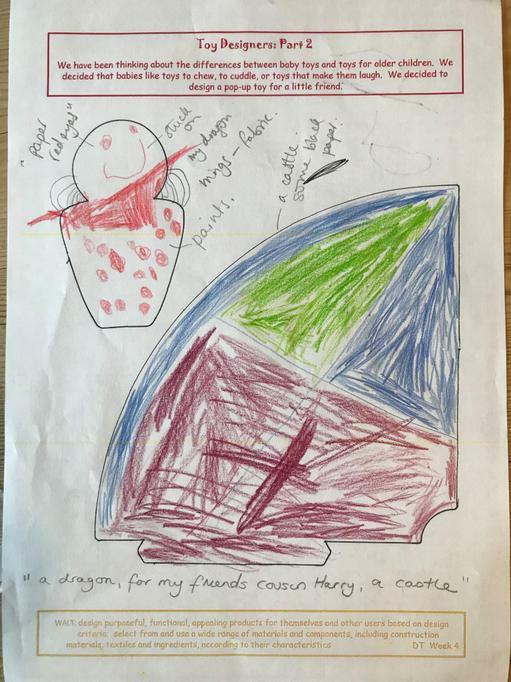 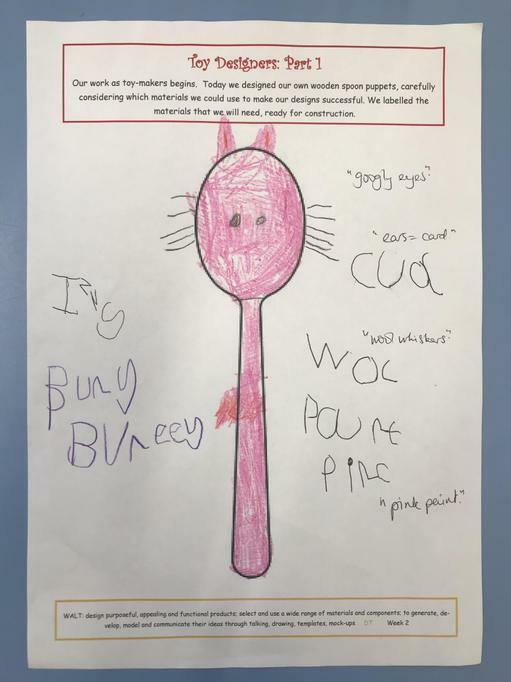 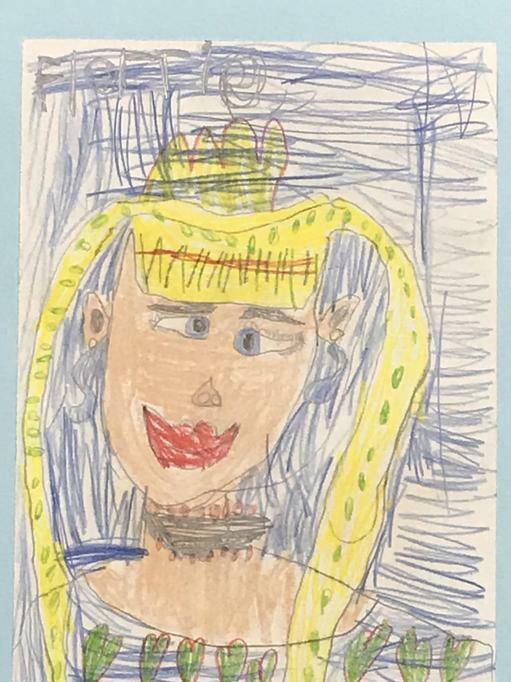 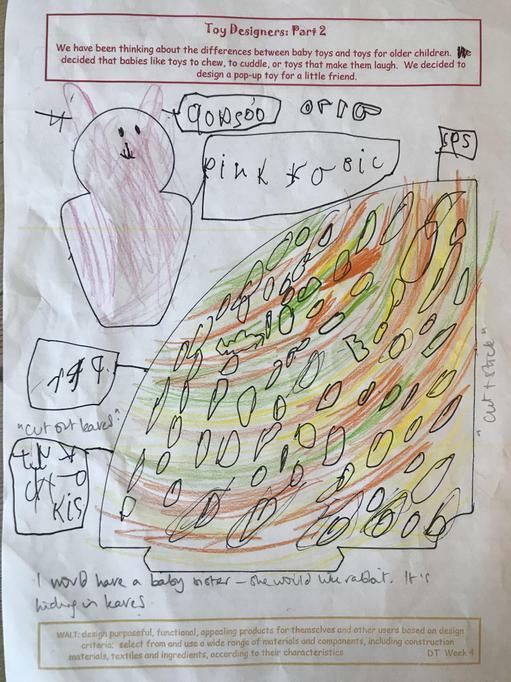 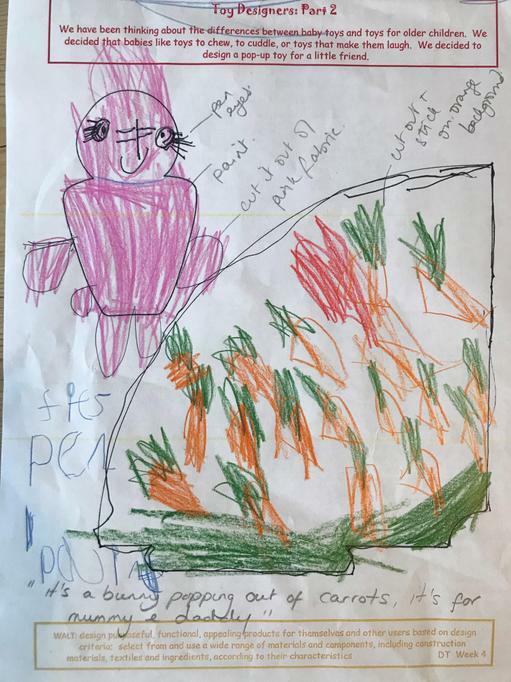 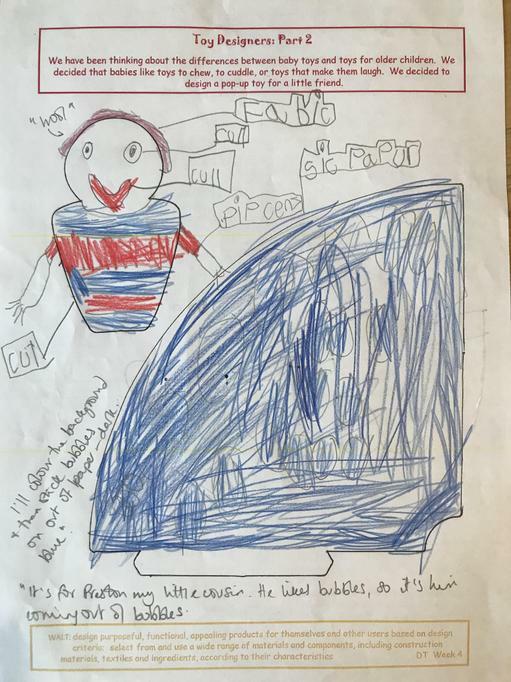 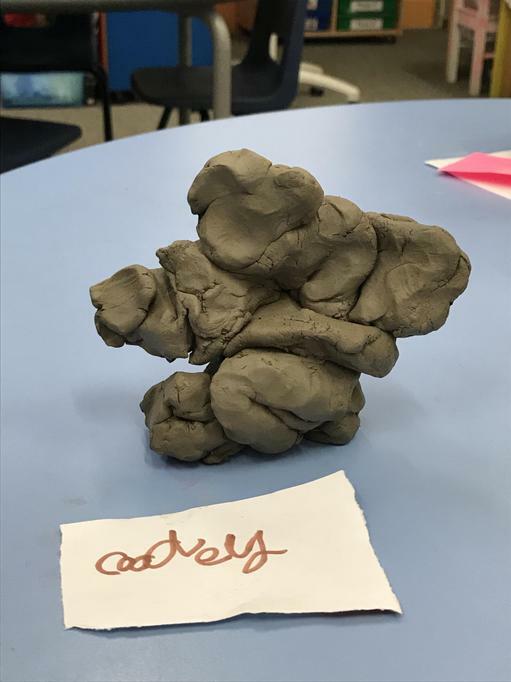 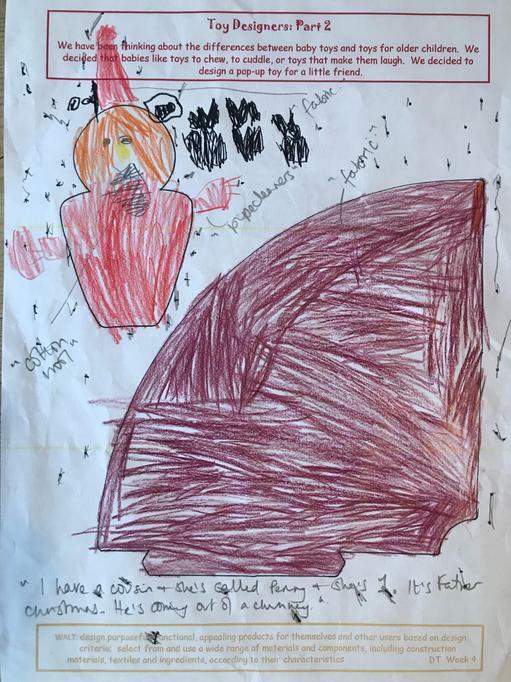 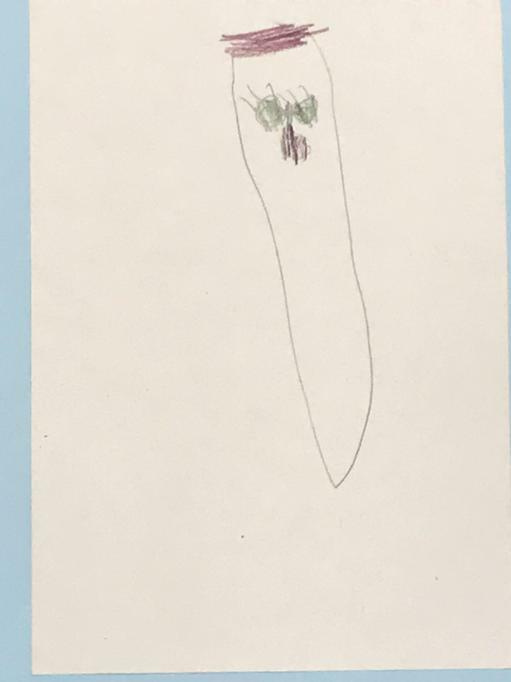 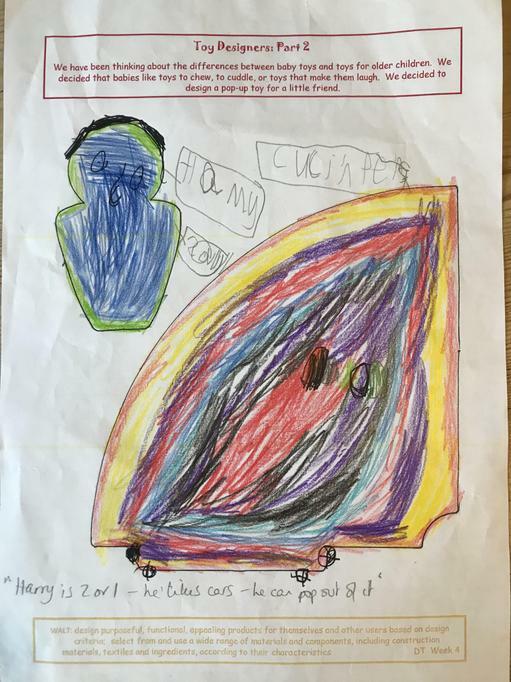 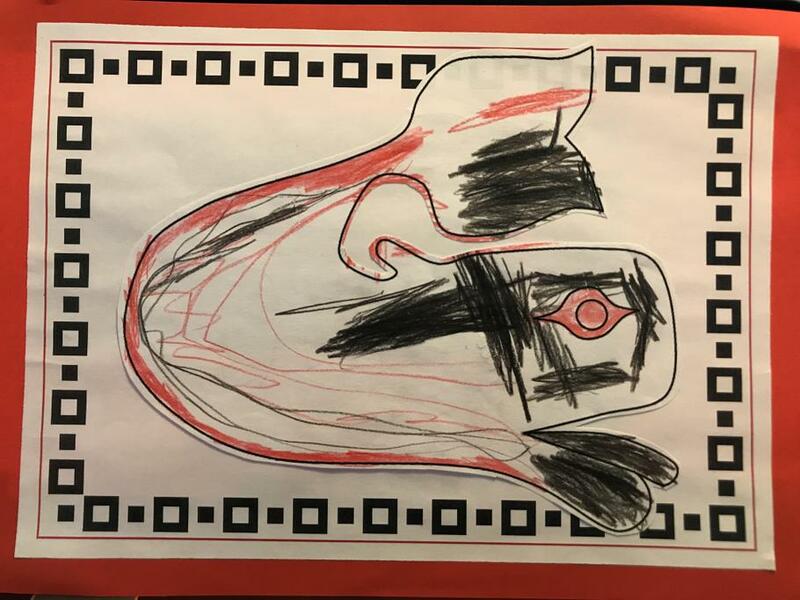 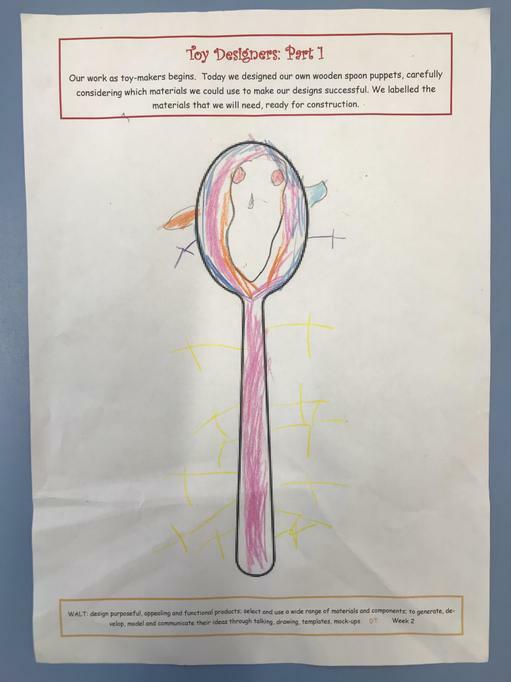 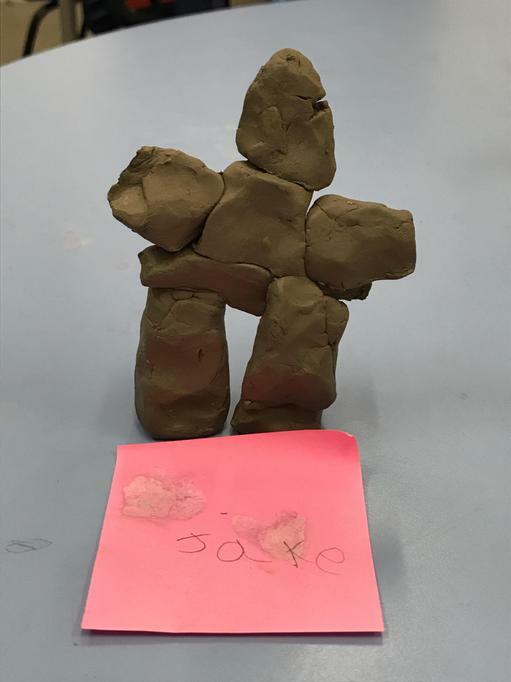 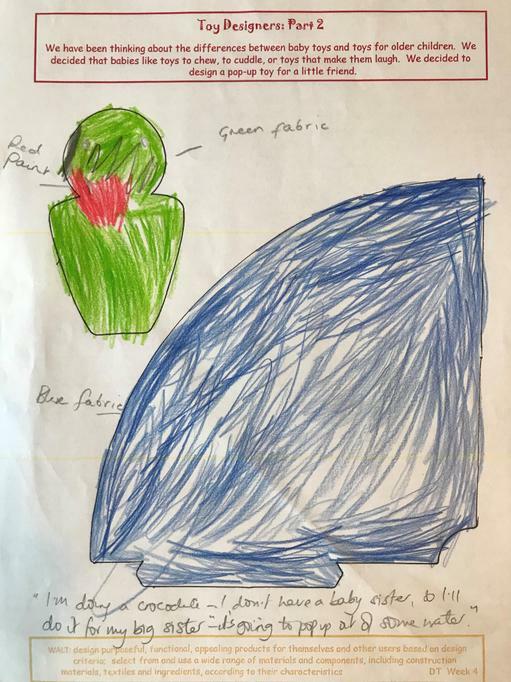 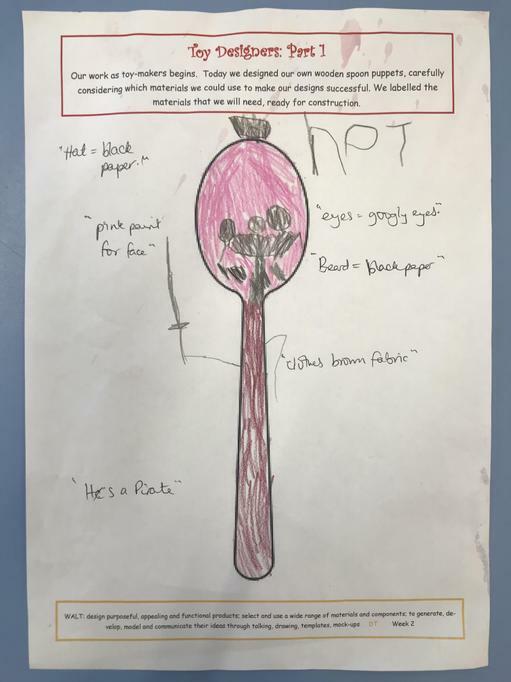 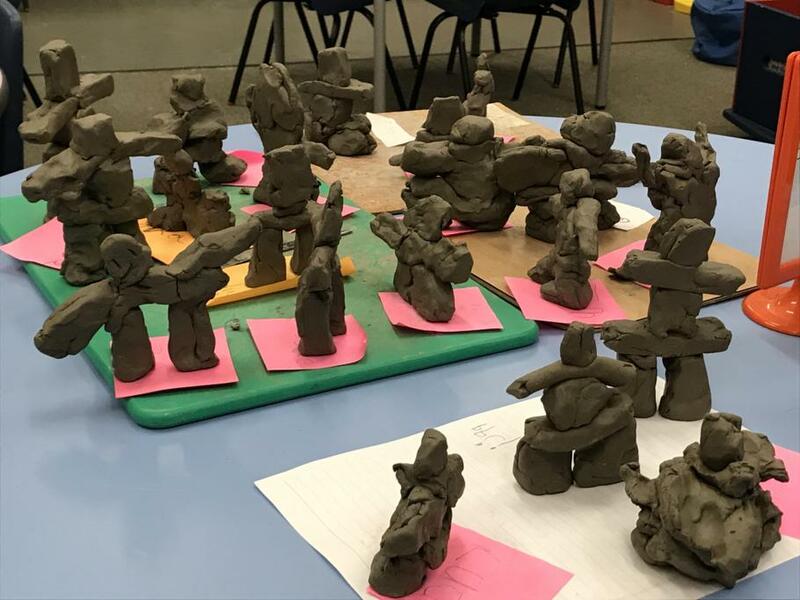 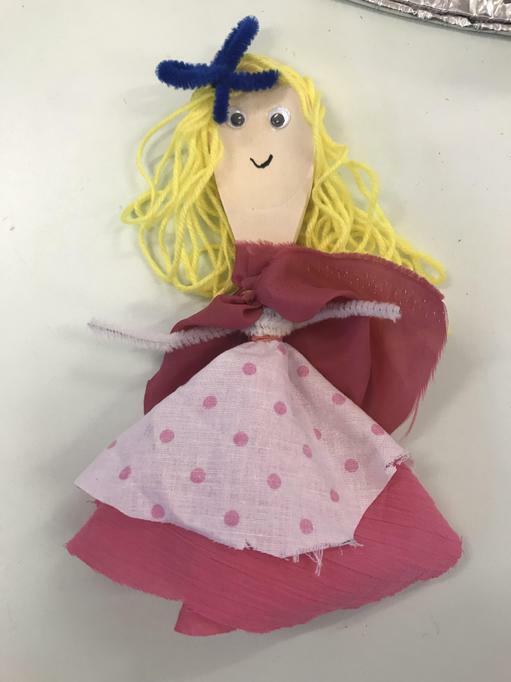 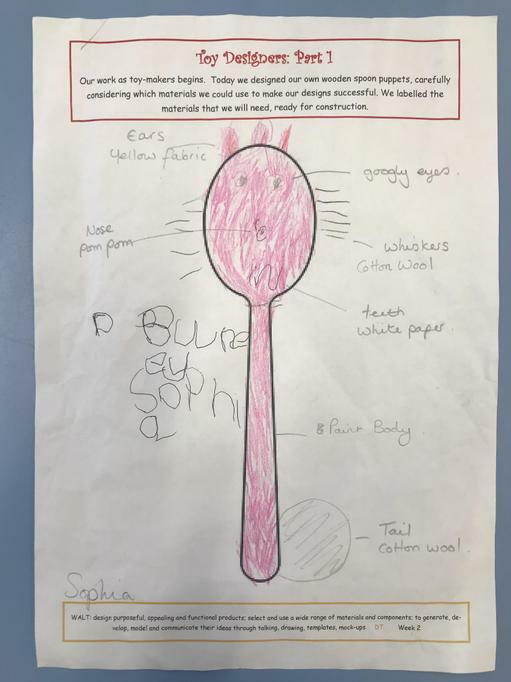 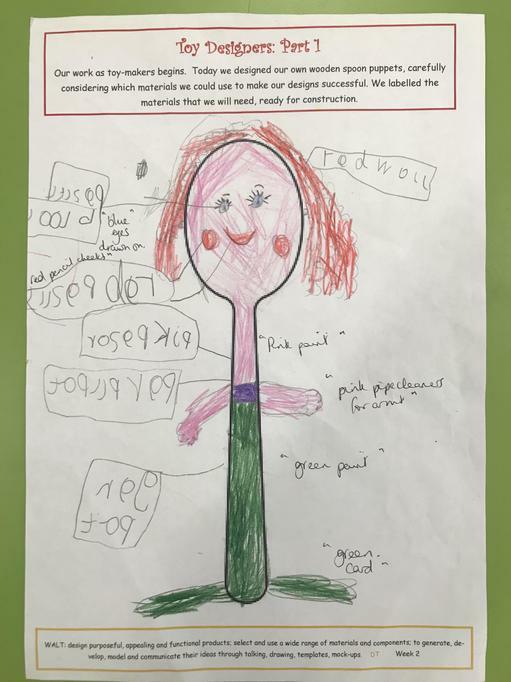 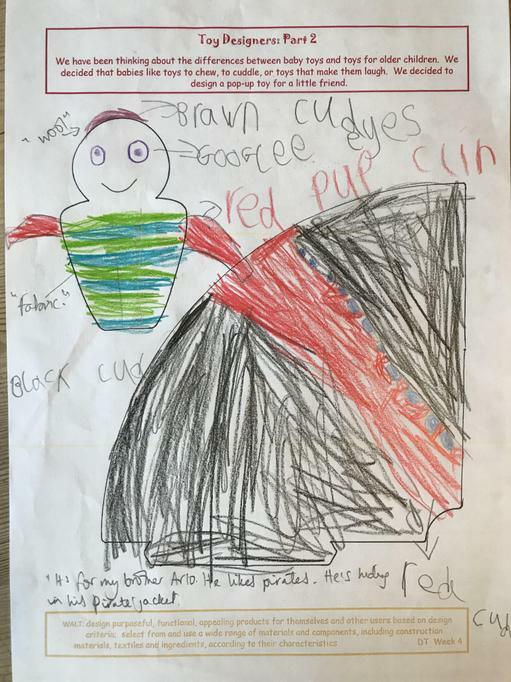 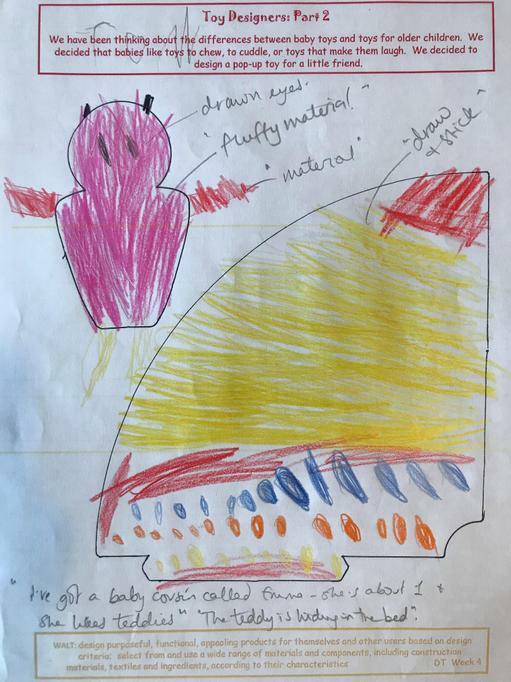 As an exercise in improving our work and striving to do our best to be ‘Super-Learners’, we returned to an observational drawing we did two weeks ago, of a toy from our Toy Museum. 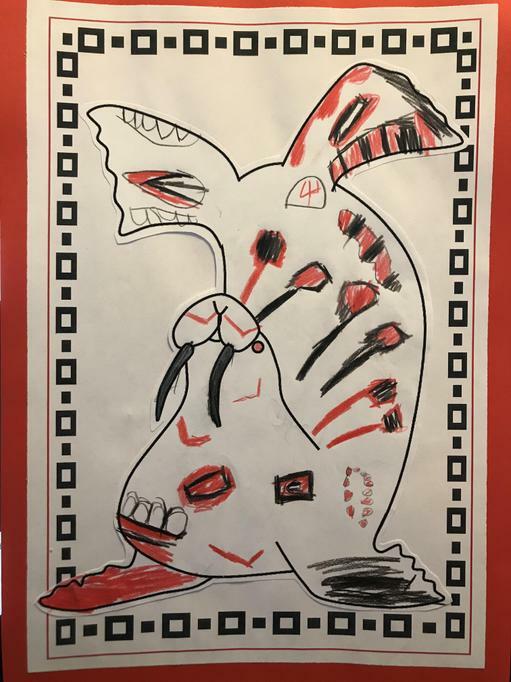 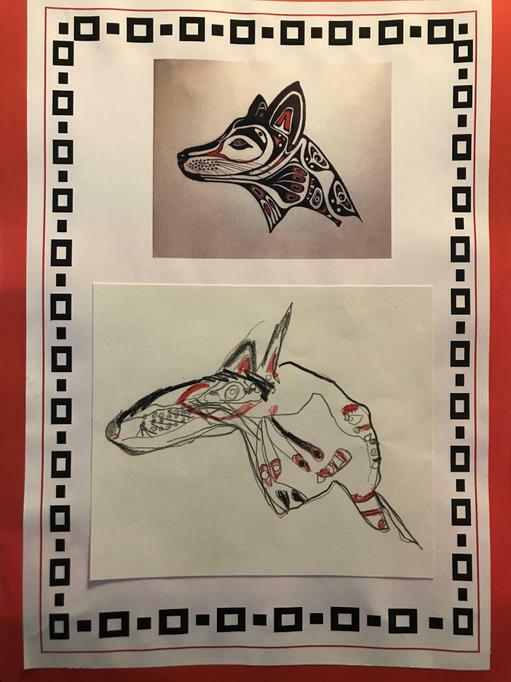 We re-evaluated our artwork, tried to improve it, and when we thought we had finished, swapped with a friend who had drawn the same item, and listened to, and then applied, their gentle suggestions of how to make it even better. 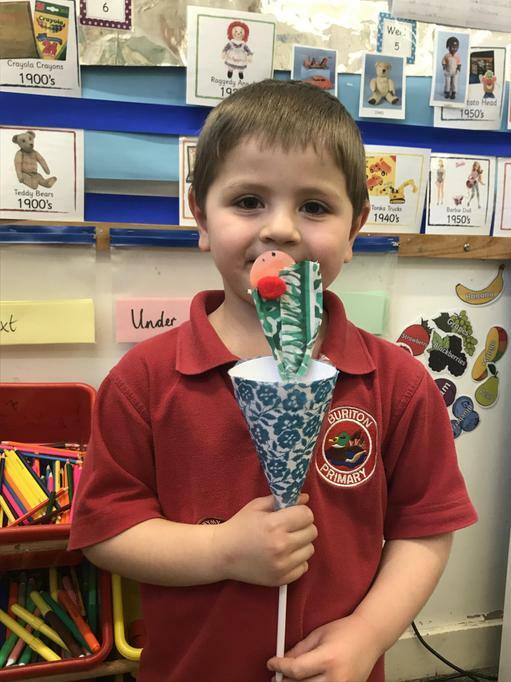 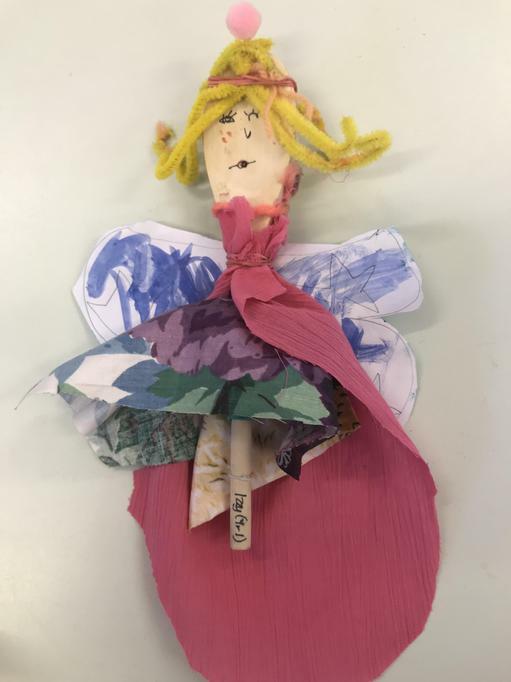 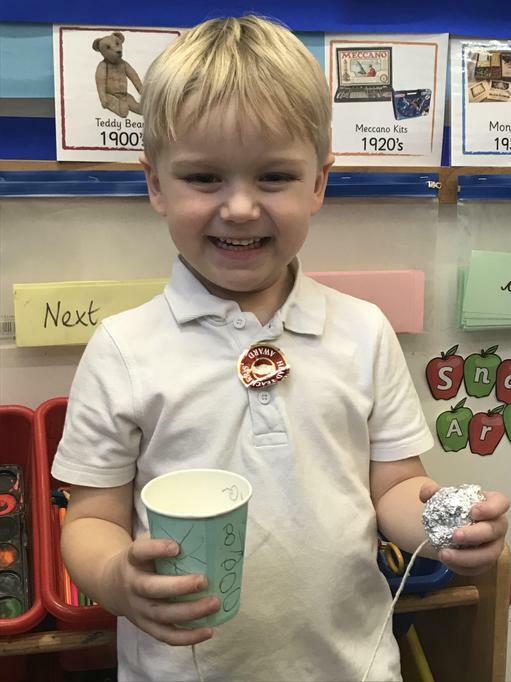 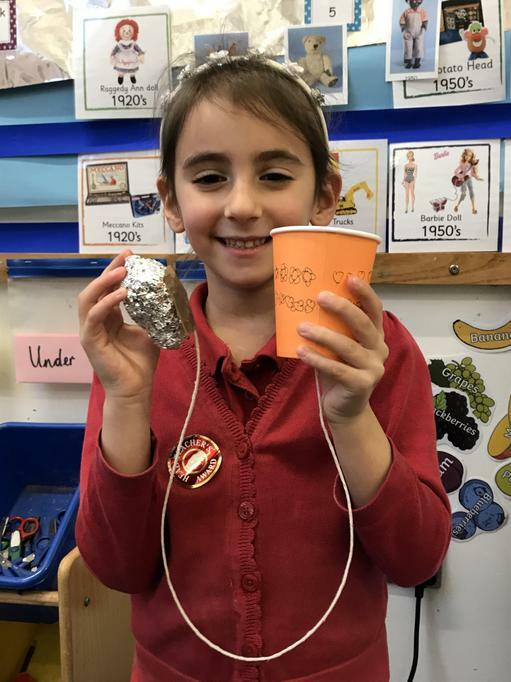 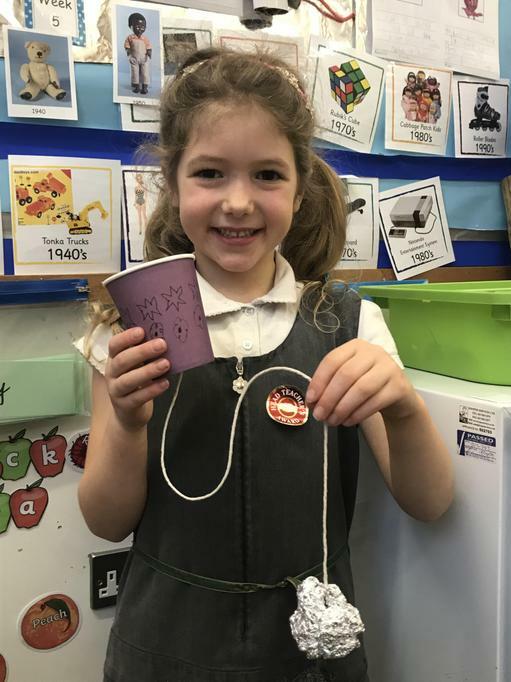 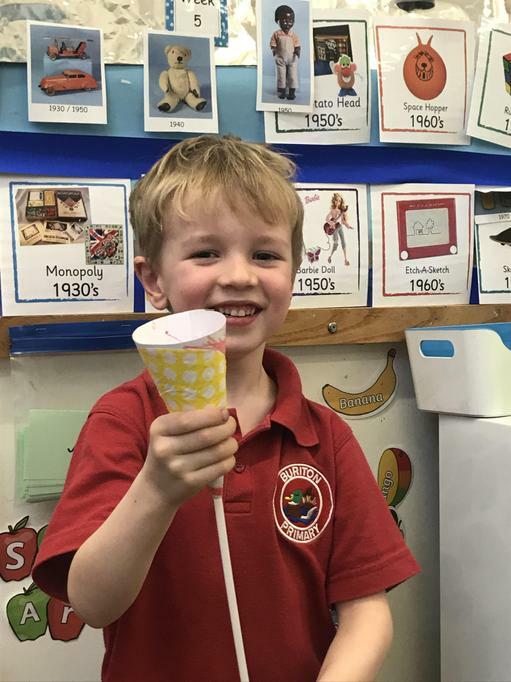 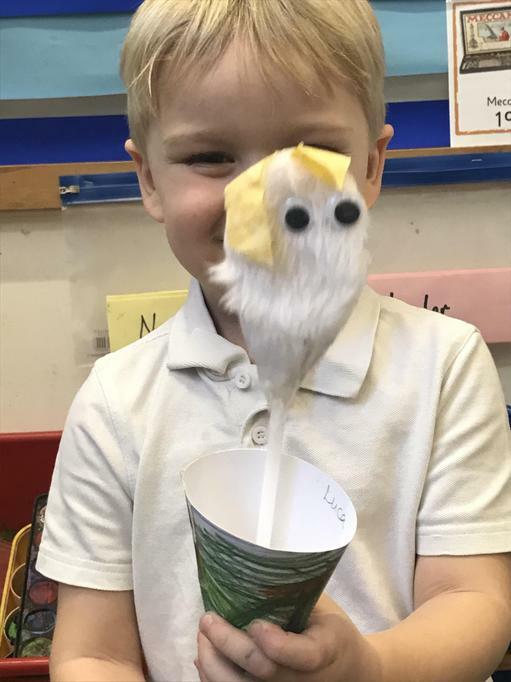 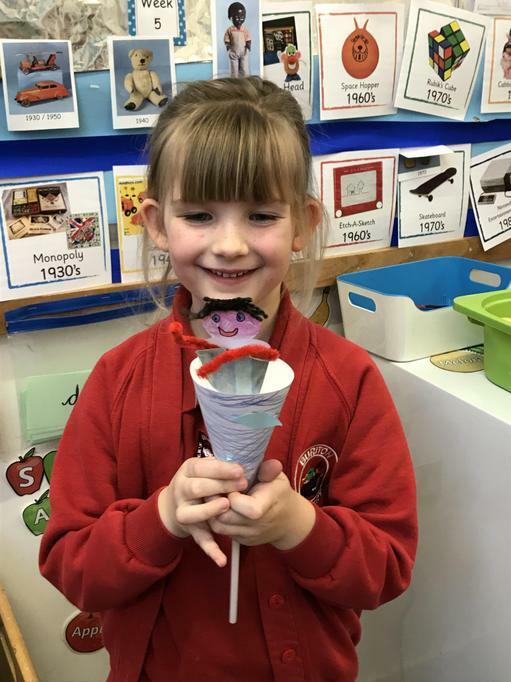 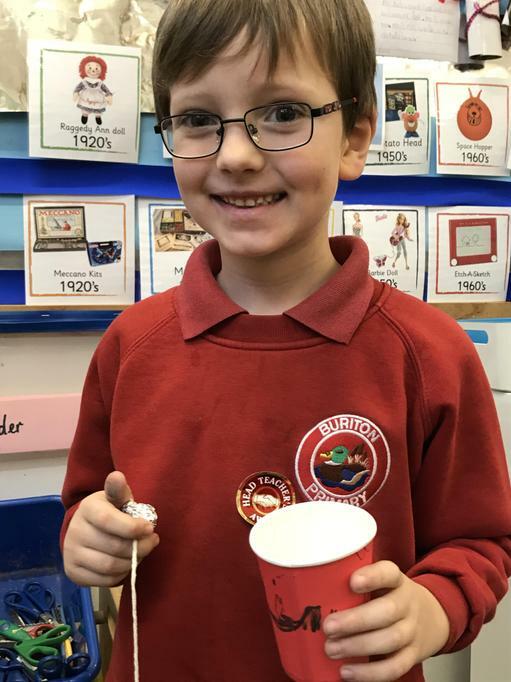 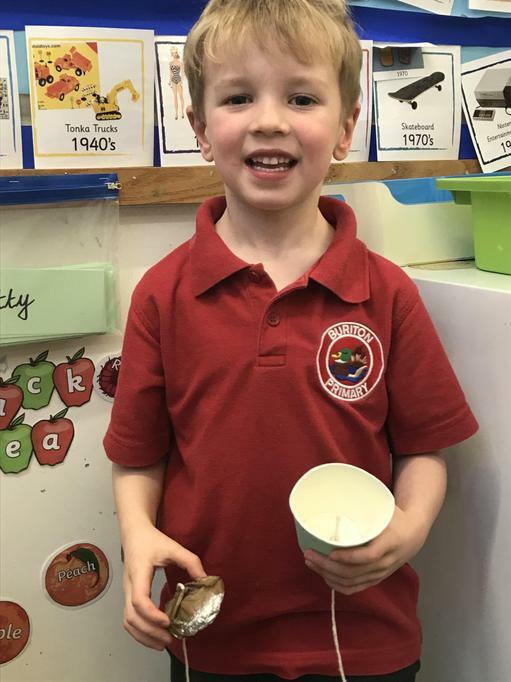 This week we worked together in mixed Year R and Year 1 groups to read the instructions for making a paper cup toy and carefully made our own toys. 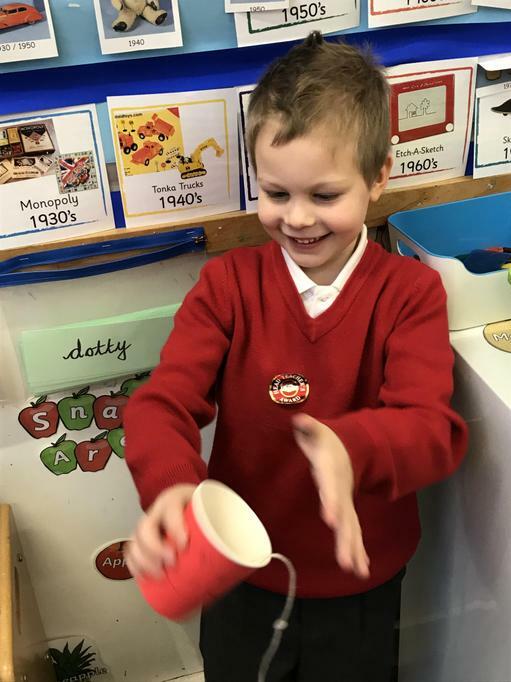 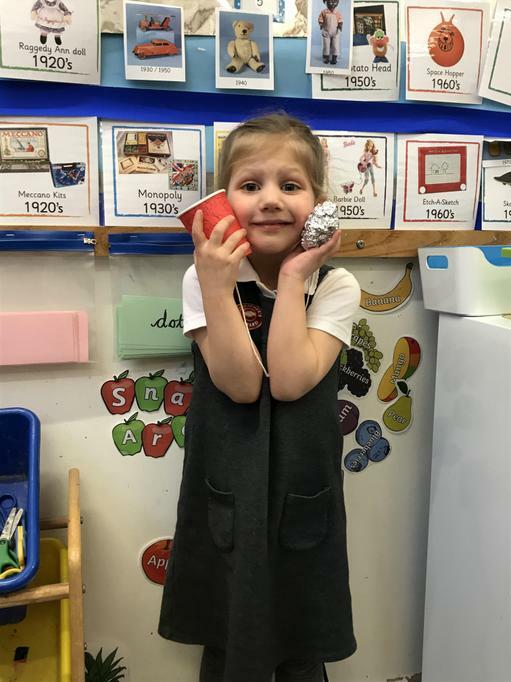 By working together in our teams, and helping each other at each stage of the ‘build’, we ALL made our own Cup and Ball game entirely independently. 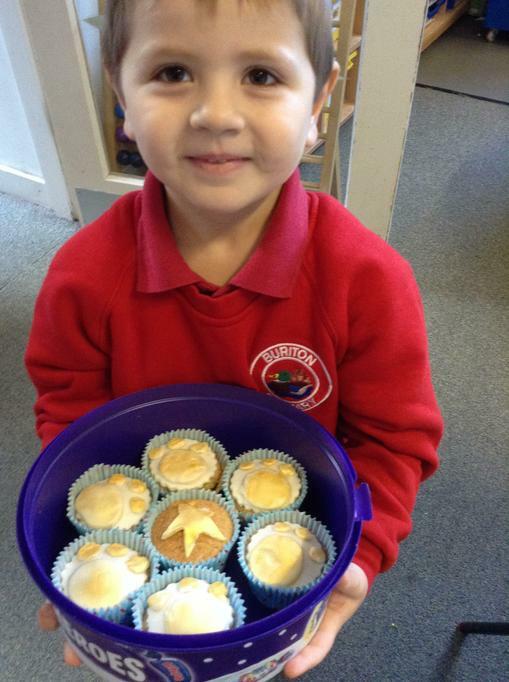 We were all so proud of our achievements! 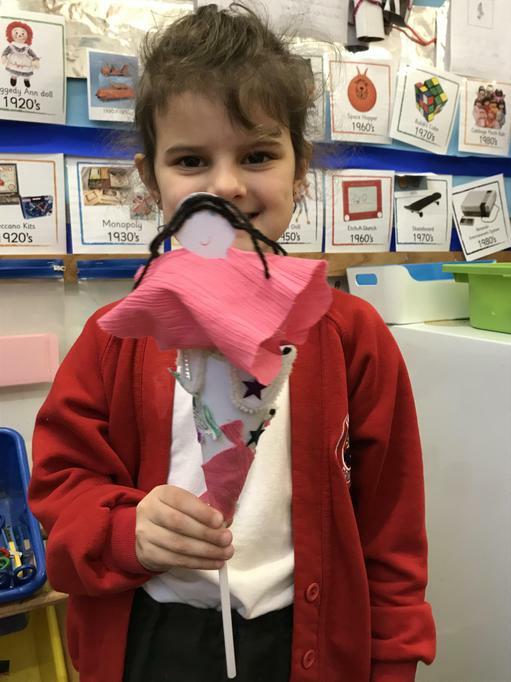 We also worked incredibly hard to make our pop-up puppets. 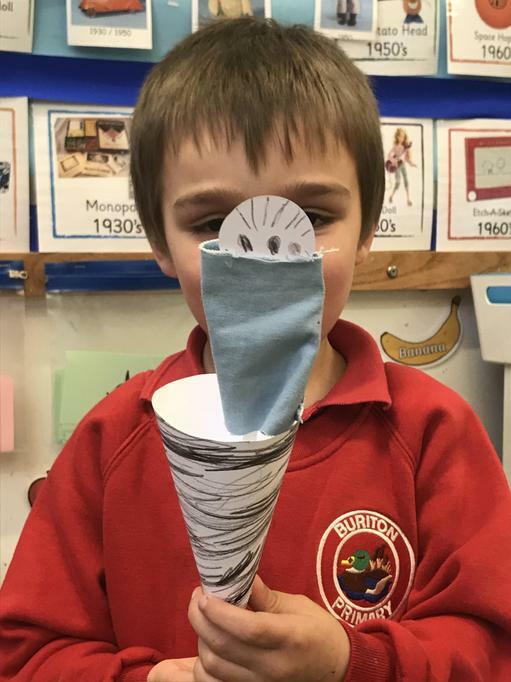 Miss Burrough rolled and stuck the cone for us, but otherwise we worked independently, trying to help each other when we got stuck, and support each other with kind ideas of how to improve our work. 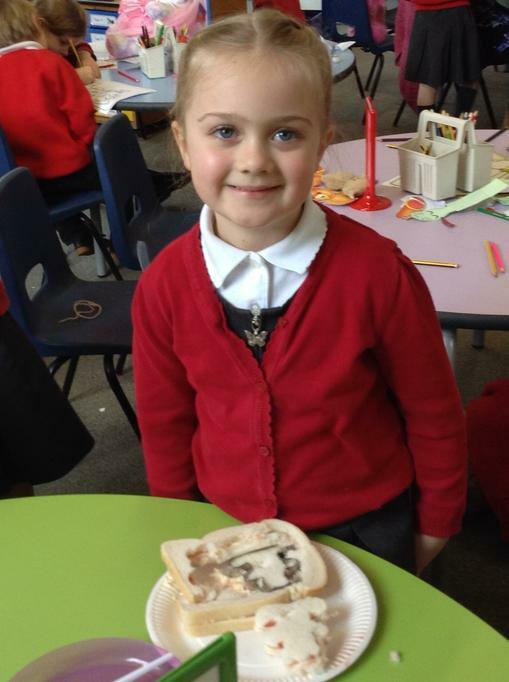 We will evaluate our products next week. 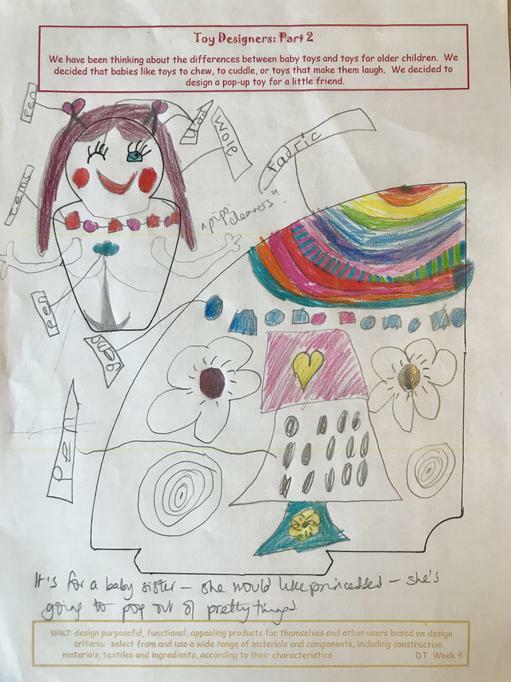 We have been thinking about the differences between baby toys and toys for older children. 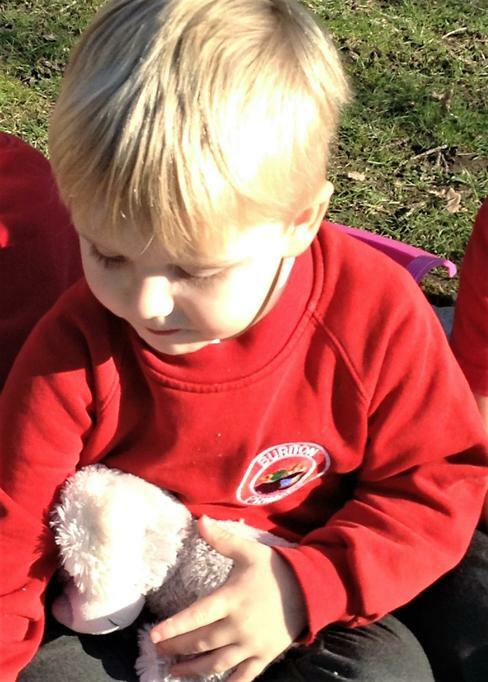 We decided that babies like toys to chew, to cuddle, or toys that make them laugh. 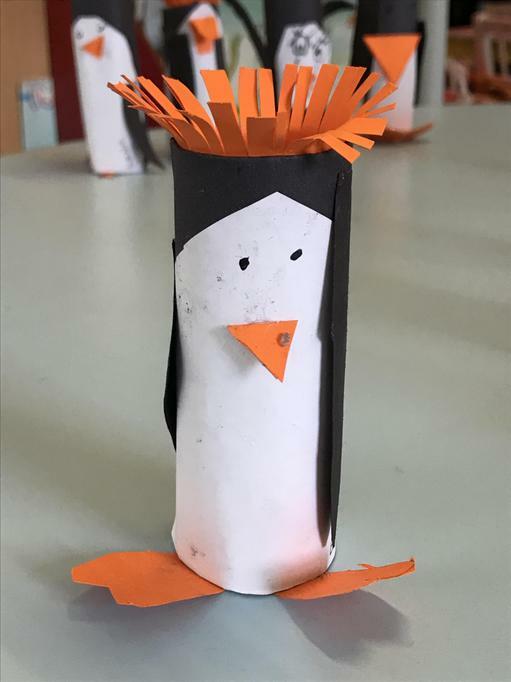 We decided to design a pop-up toy for a little friend. 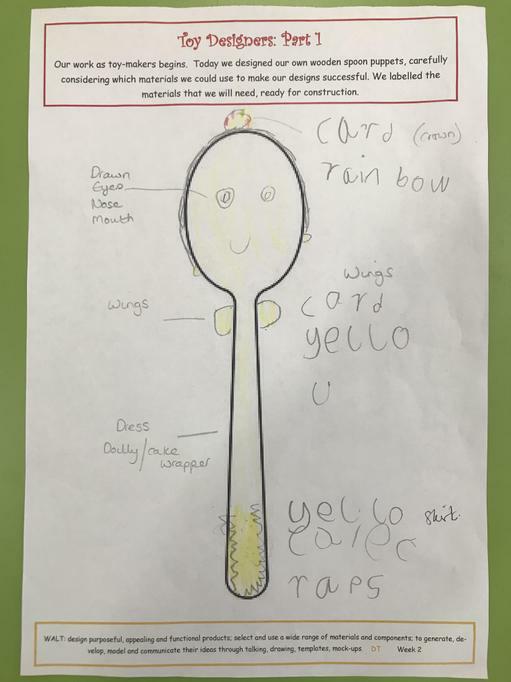 Can you spot your design? 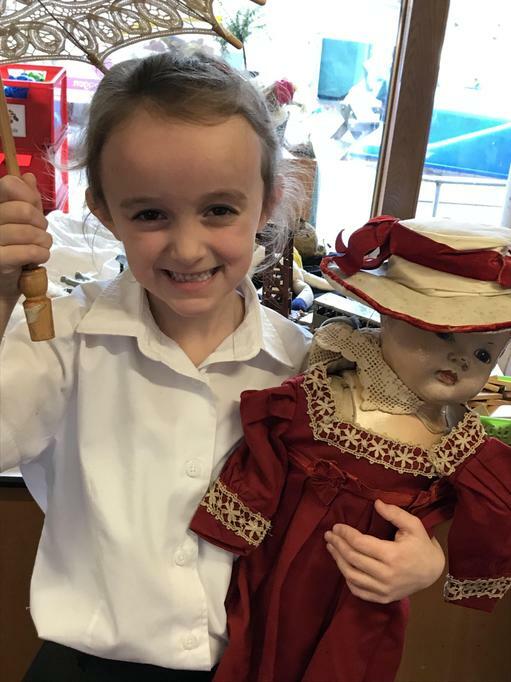 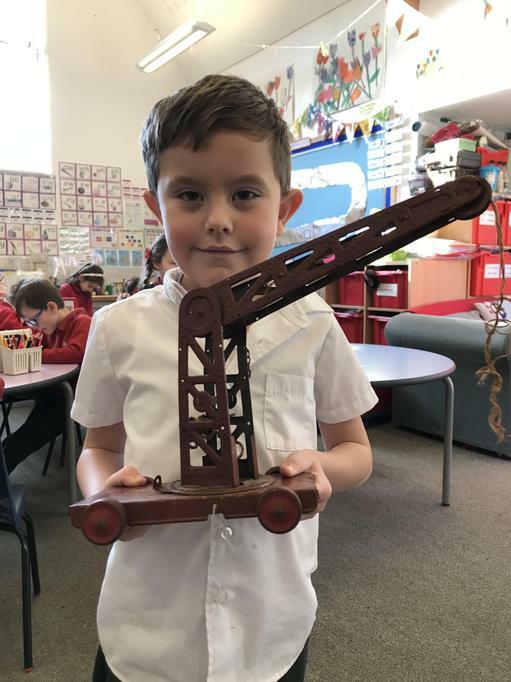 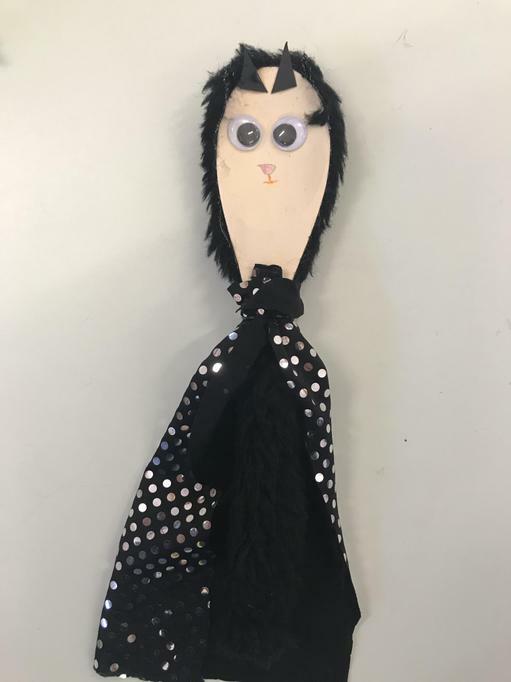 This week, Miss Burrough brought a Toy Museum to our class: some of the toys are Victorian, some from the 1920s and 30s, and a few from the 1950s. 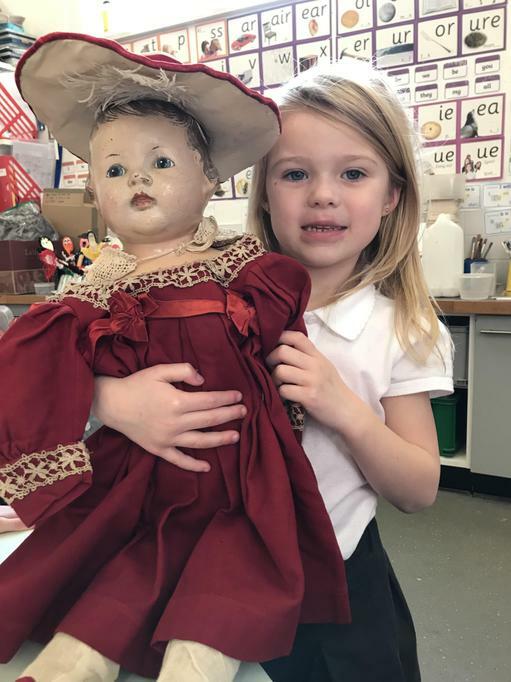 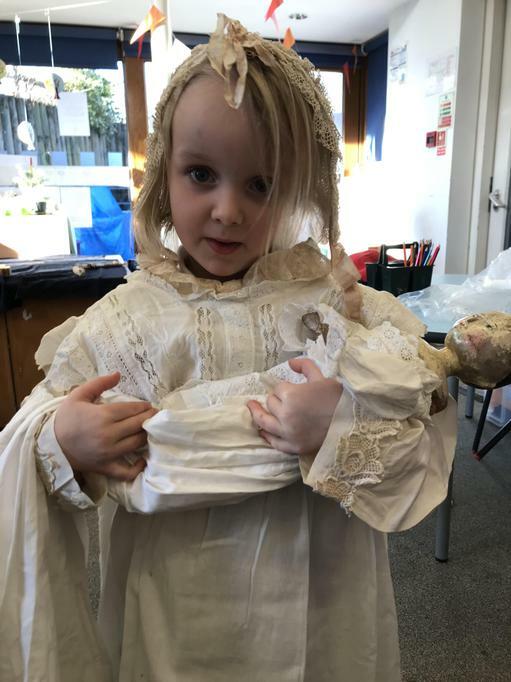 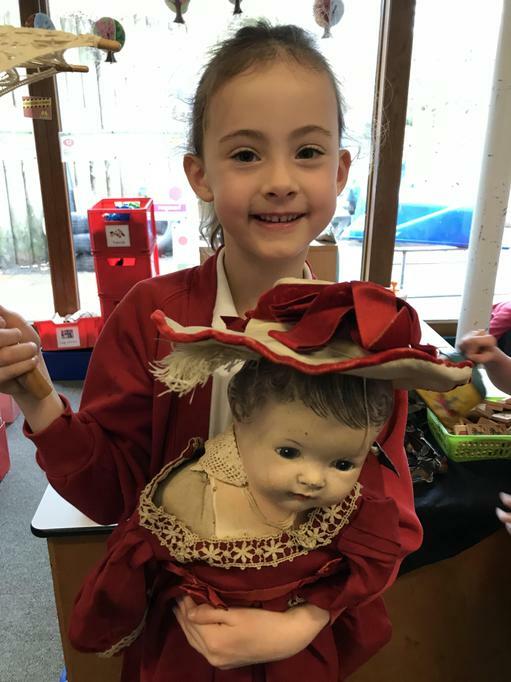 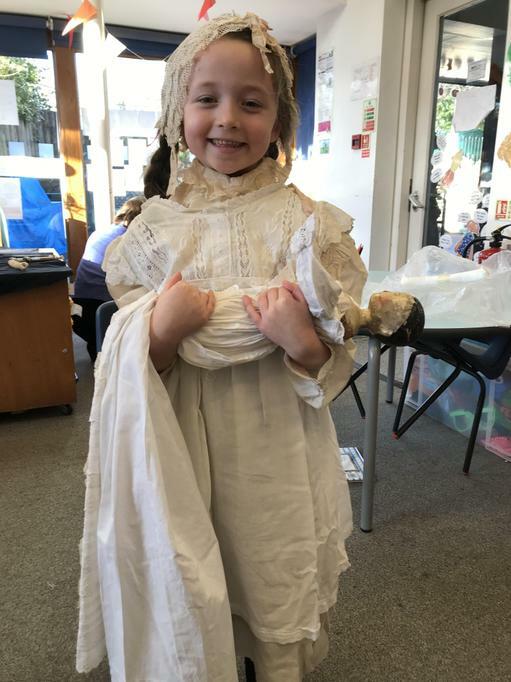 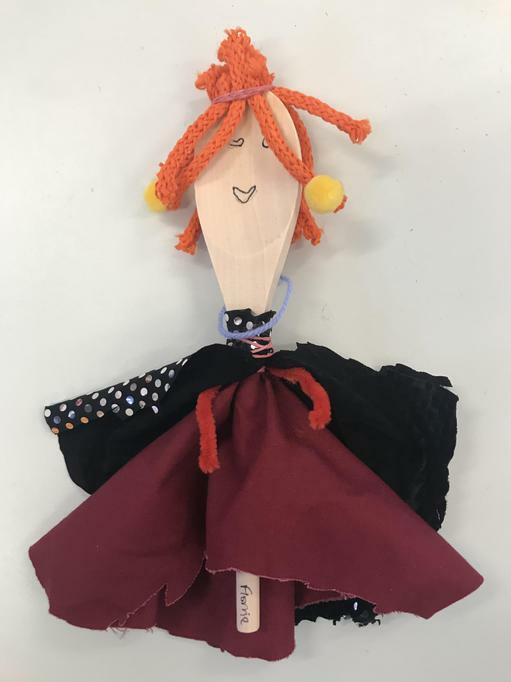 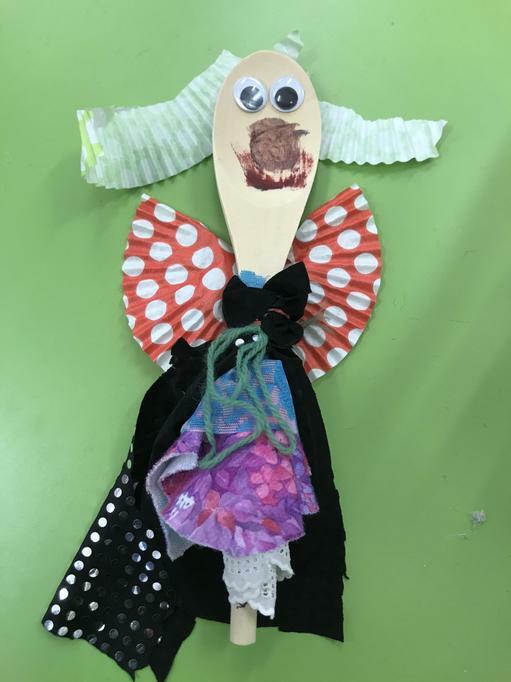 We were also lent an amazing Bisque-headed doll, which we were thrilled to see could wear the Victorian dolls' clothes, a Meccano set, and Mrs Tapster's much-loved Rupert Bear. 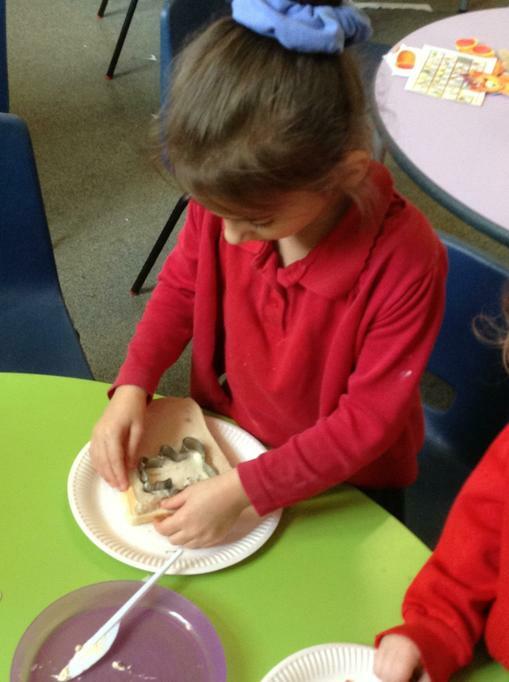 We studied the toys very carefully and observed the materials they were made of and how they moved. 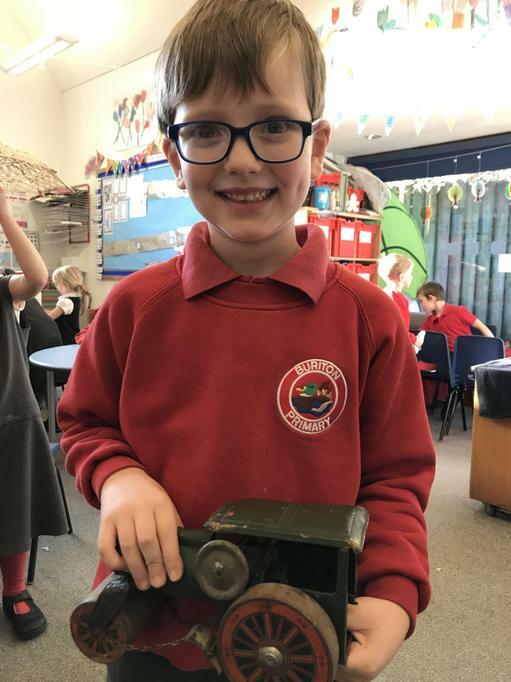 We were pleased to learn that children from long-ago liked to play with the same toys as us, such as farms, vehicles, dollies, books and skipping. 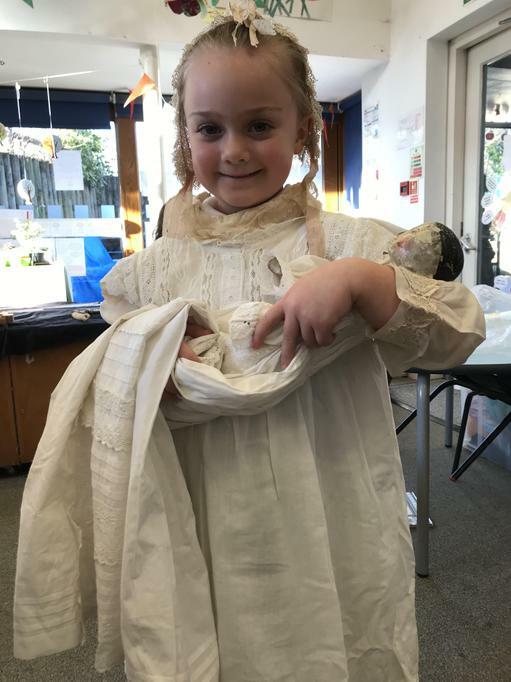 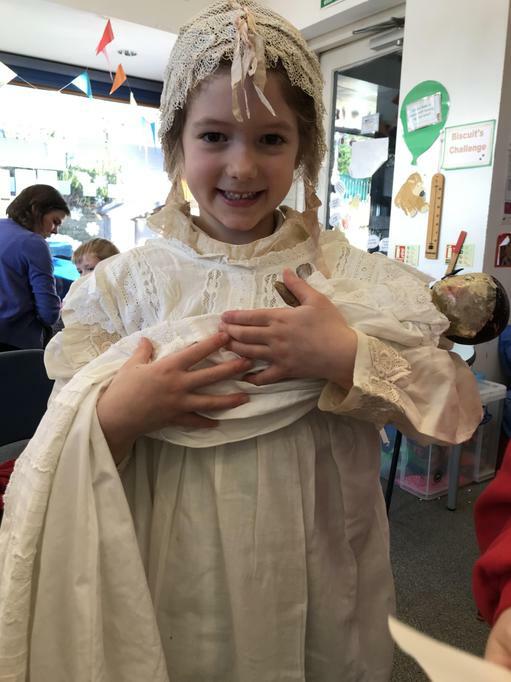 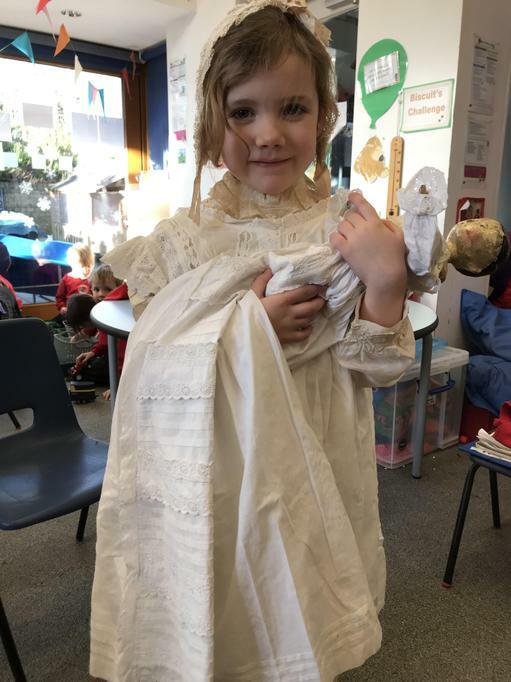 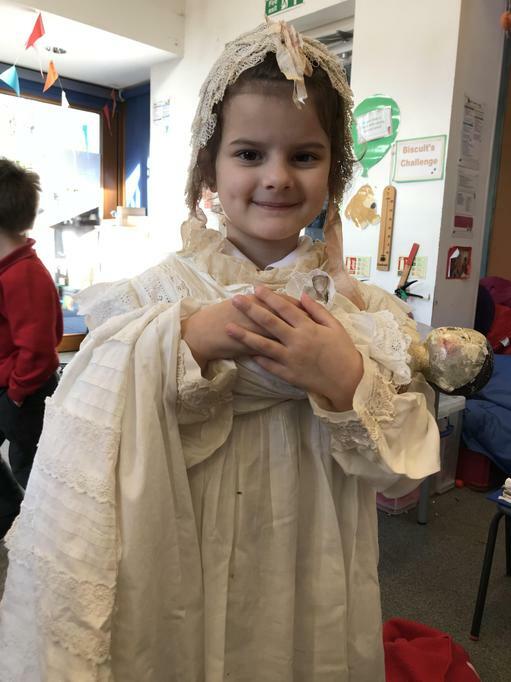 We chose the antique toy that we would have liked to play with if we'd lived long ago, and some of us chose to try on the Victorian Dress, pinafore and lace cap and pose with the wooden dolly, just like the little girl in the photograph. 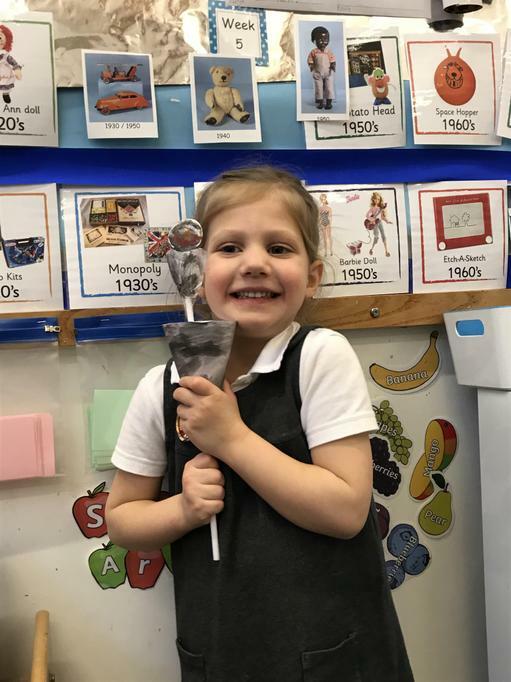 We played a game to make a timeline of the history of toys, focusing in particular on the changes in dollies, teddies and toy cars. 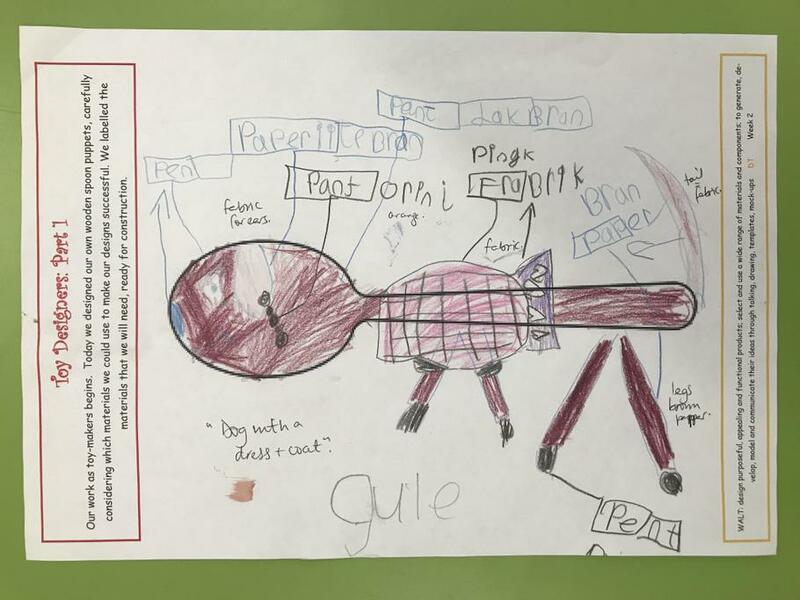 We used our knowledge to identify whether toys are old or new by looking at their materials and their styles. 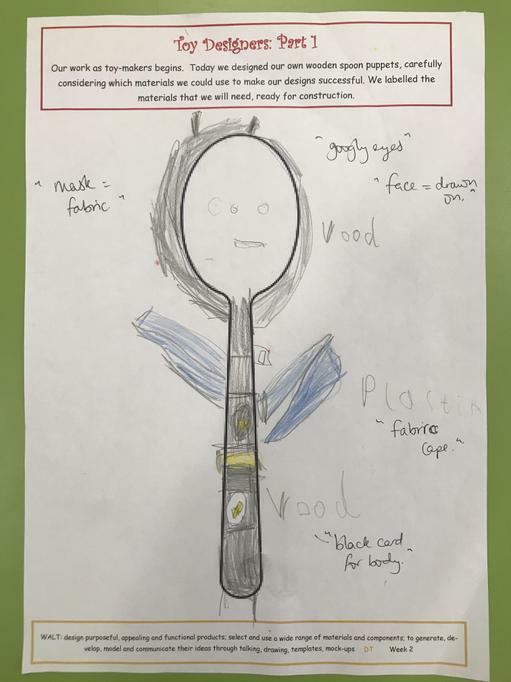 how we could improve it, and what we would change. 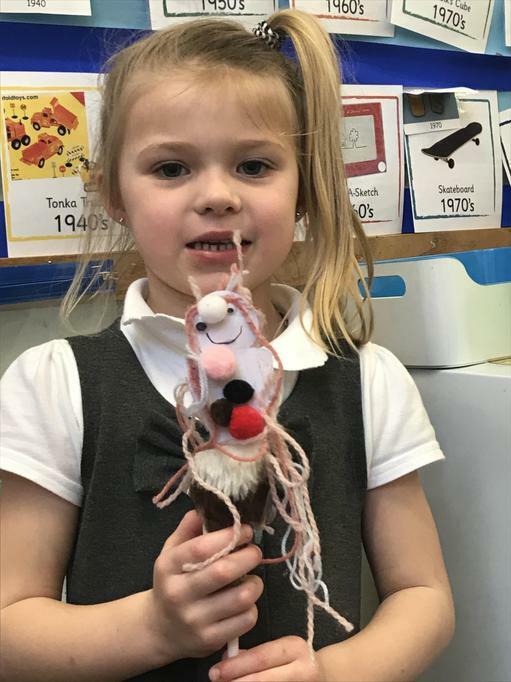 Our work as toy-makers begins. 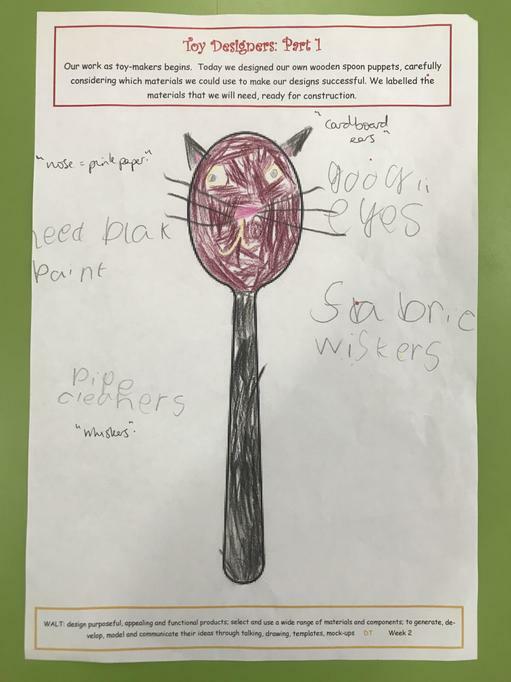 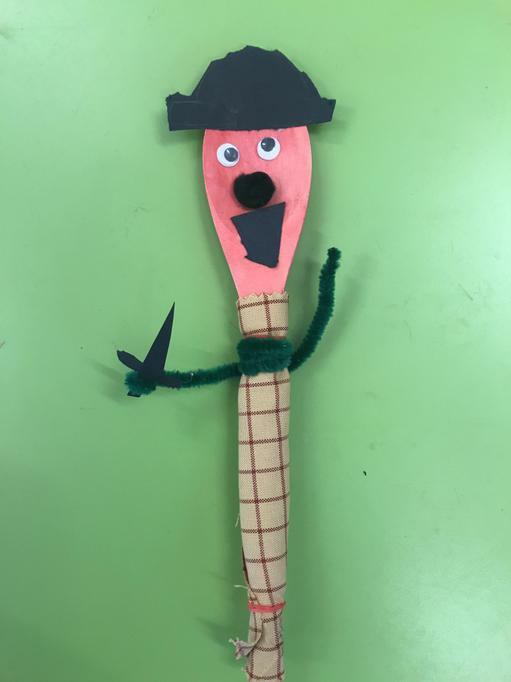 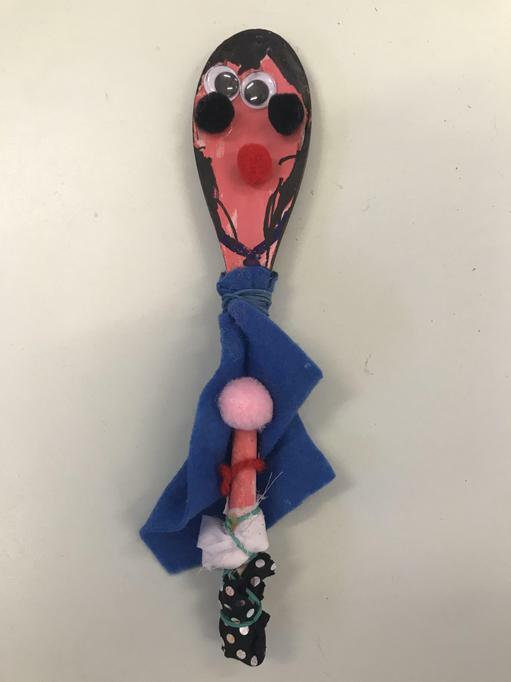 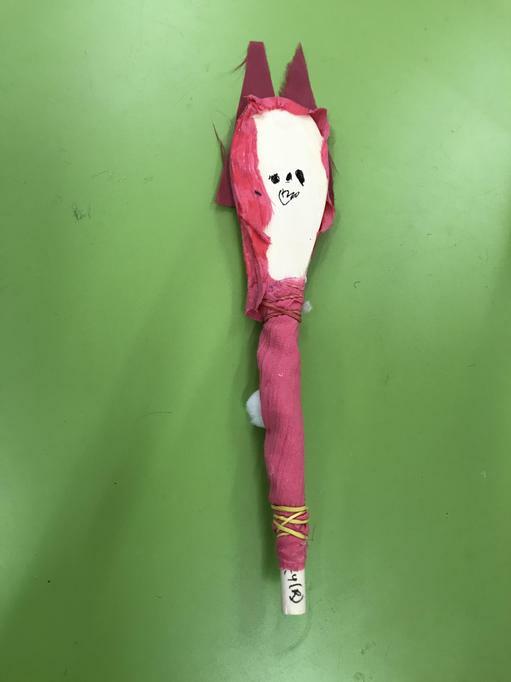 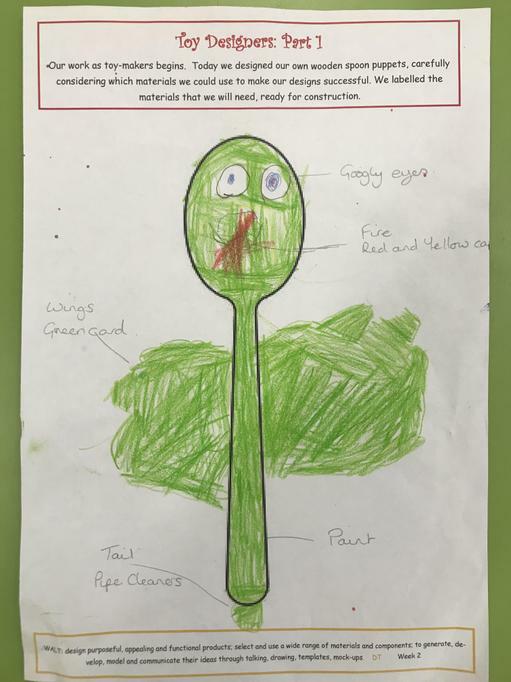 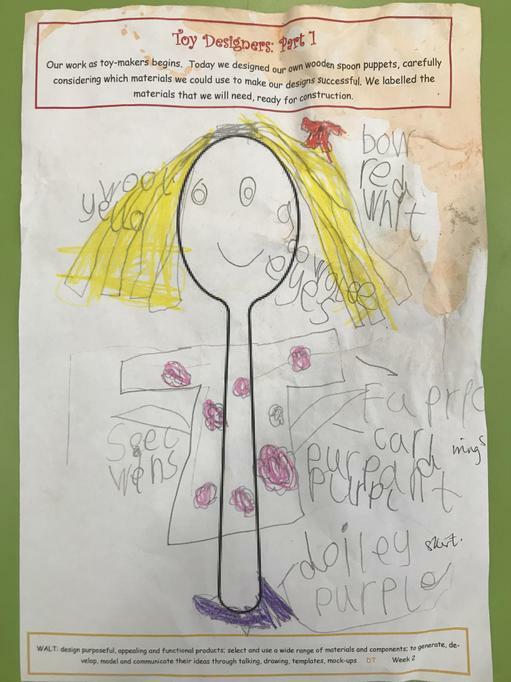 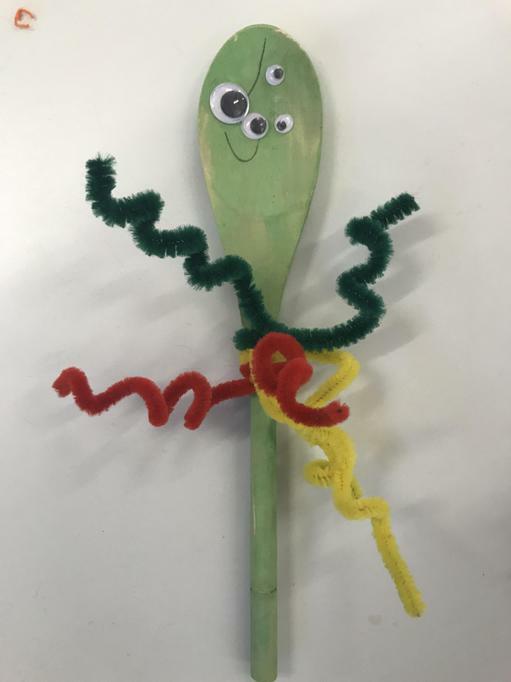 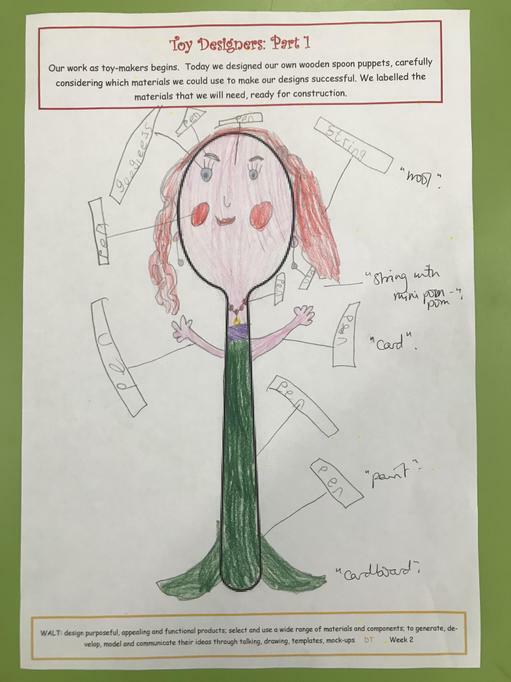 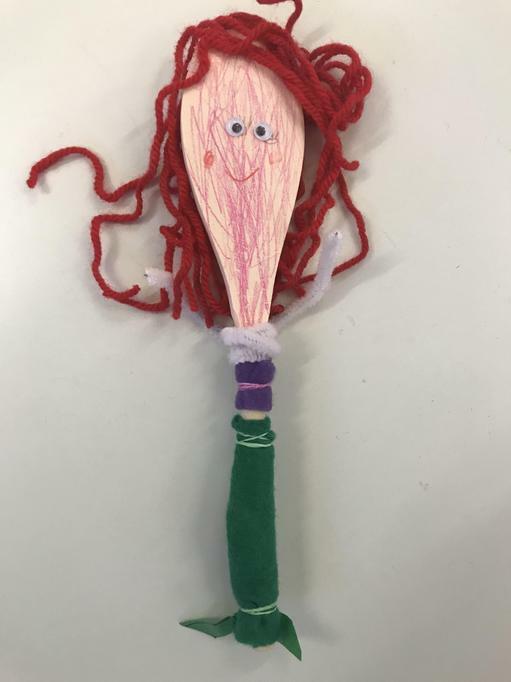 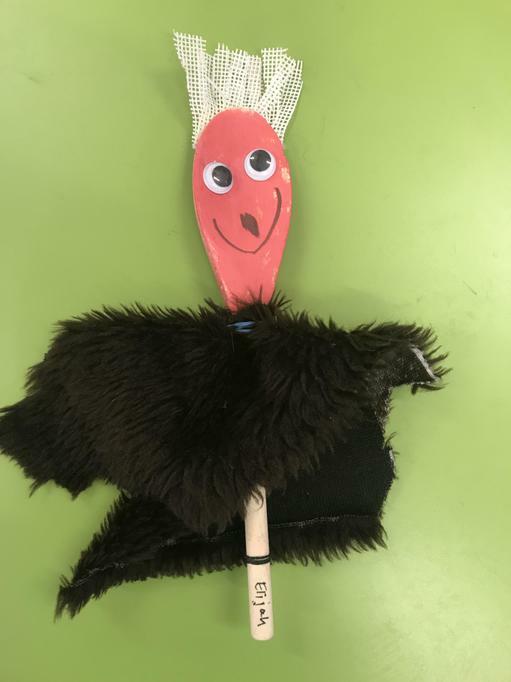 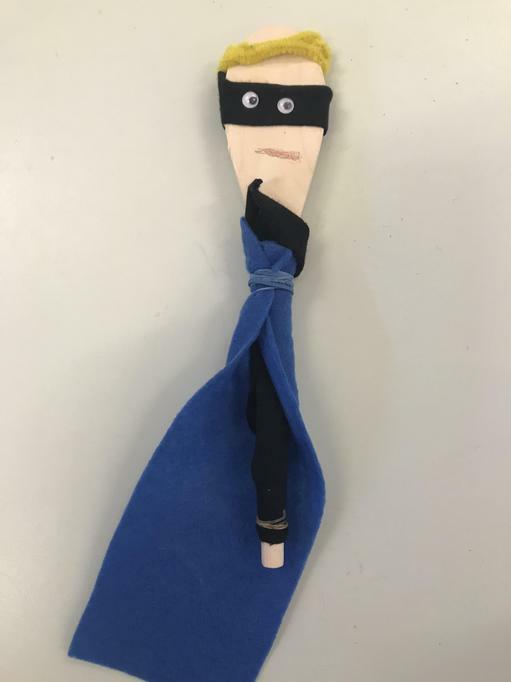 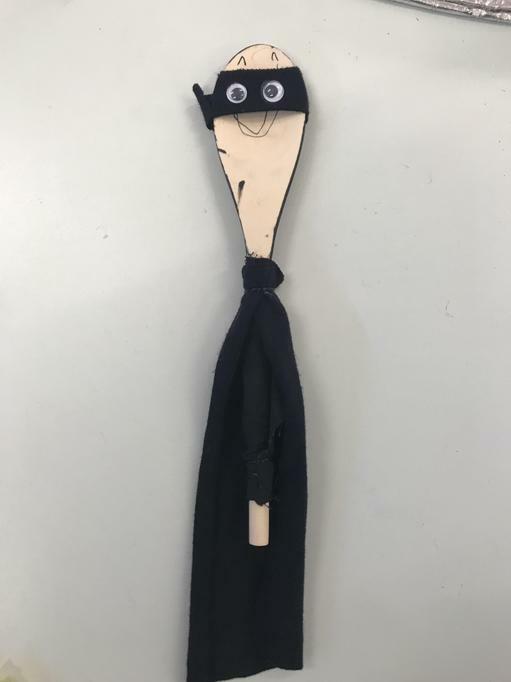 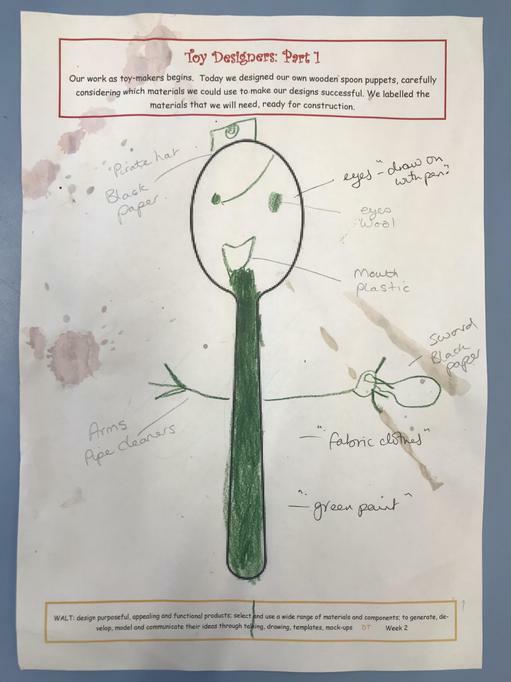 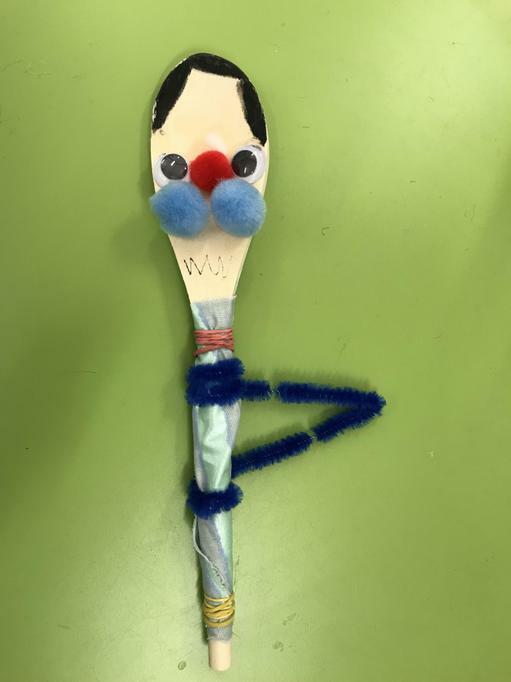 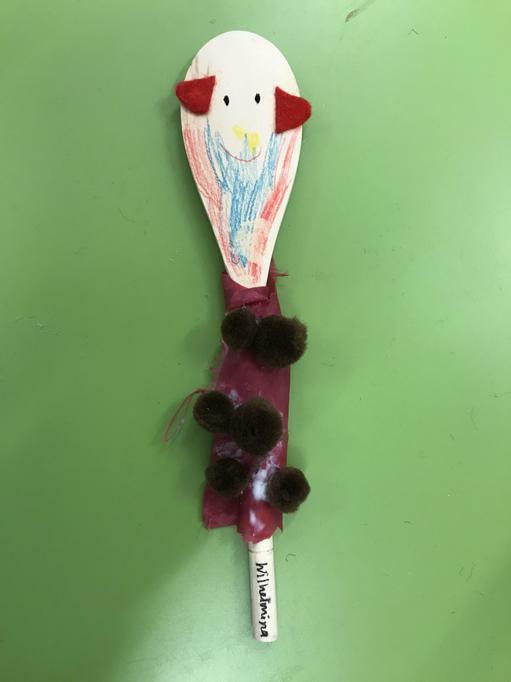 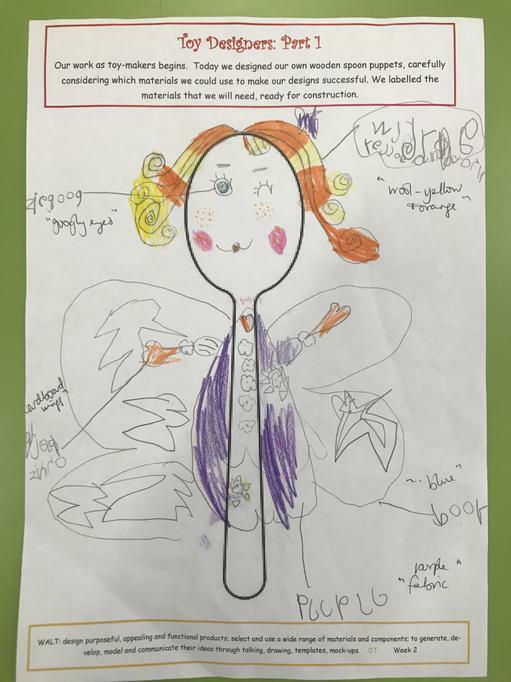 Today we designed our own wooden spoon puppets, carefully considering which materials we could use to make our designs successful. 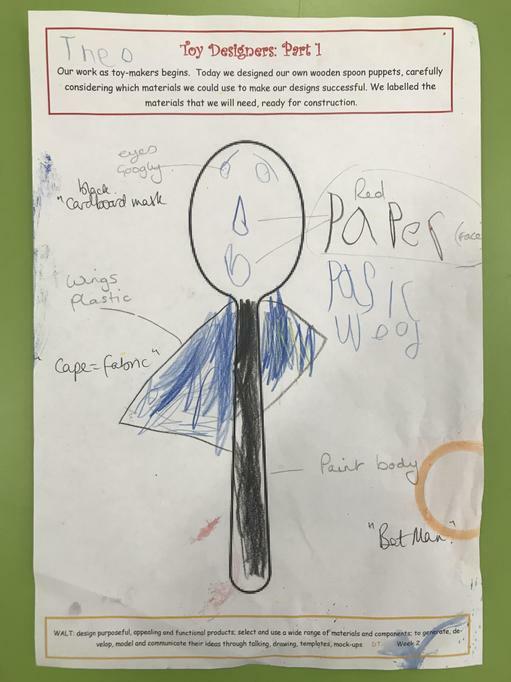 We labelled the materials that we will need, ready for construction. 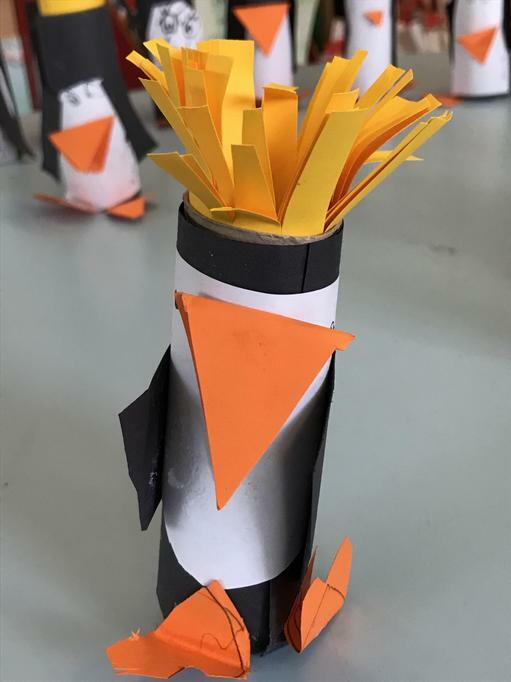 they are FANTASTIC!!!! 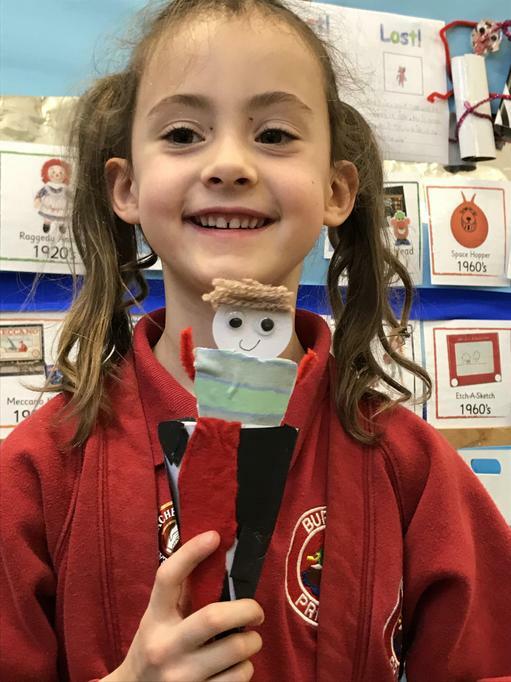 Can you spot your puppet? 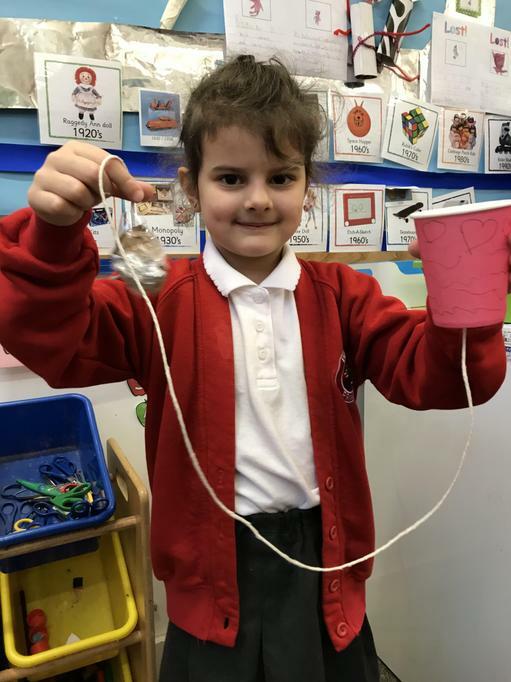 This week we became Scientists to find out what toys are made of and why, so first we had to explore and explain the properties of everyday materials. 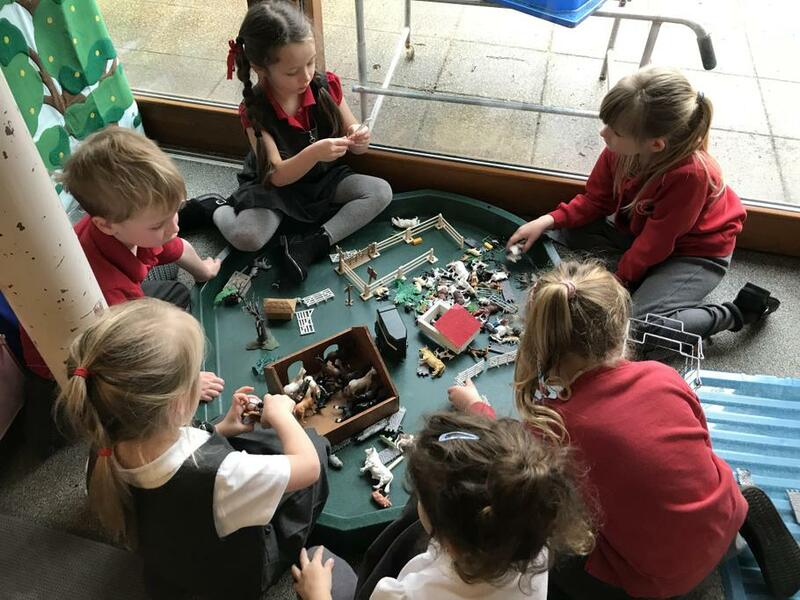 First we looked at some objects and worked together to categorise them by whether they were made of wood, plastic, metal, glass, fabric or stone. 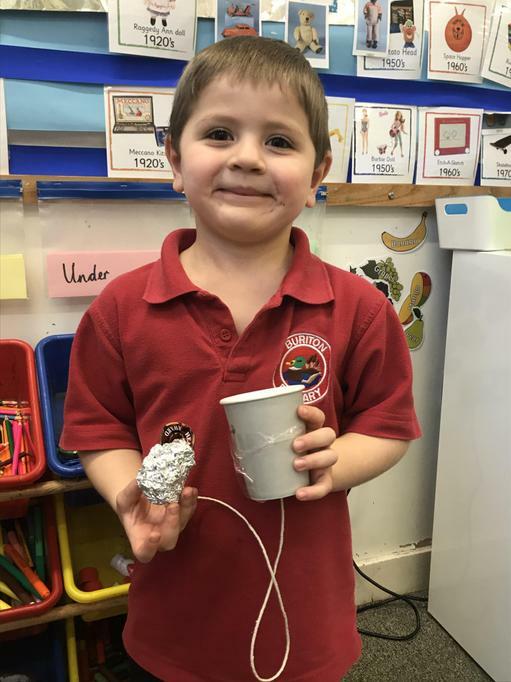 toy to identify its physical properties. 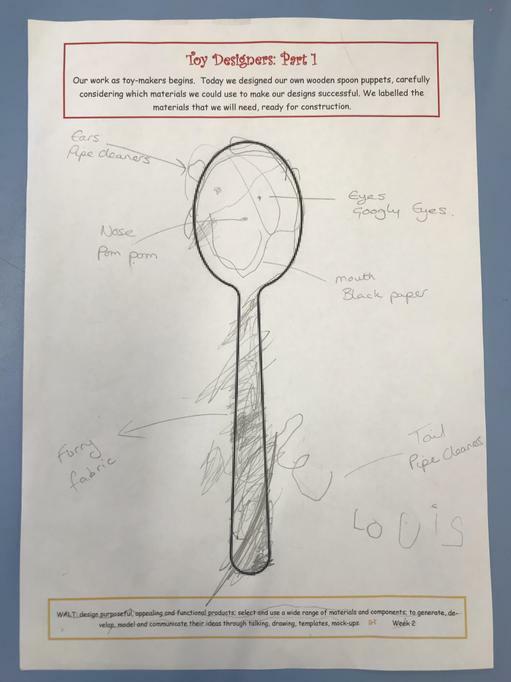 We looked closely at some toys and discussed the properties of the material they are made of and why it is suitable for that toy. 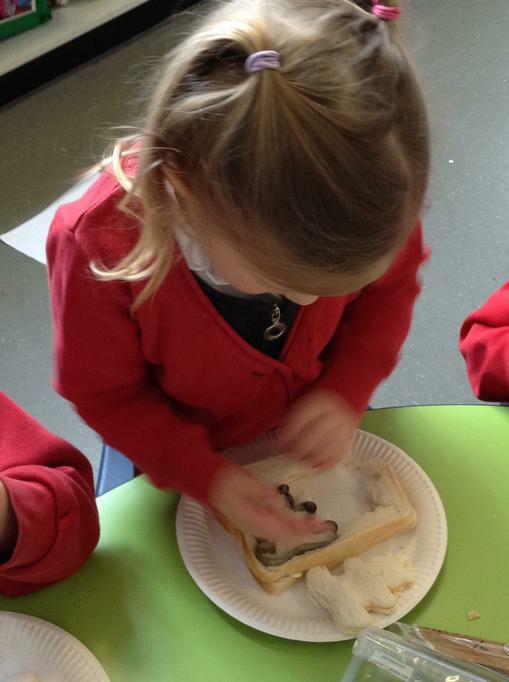 This half term our topic is Polar Lands - Brrrr!! 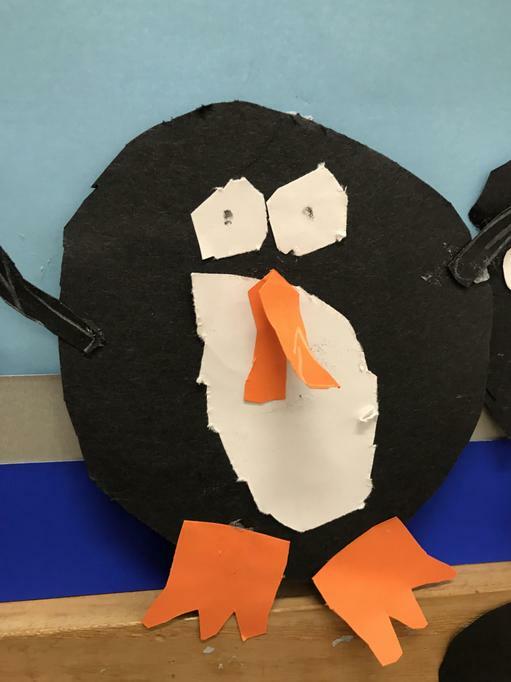 In this Topic we will learn about The Arctic and Antarctica. 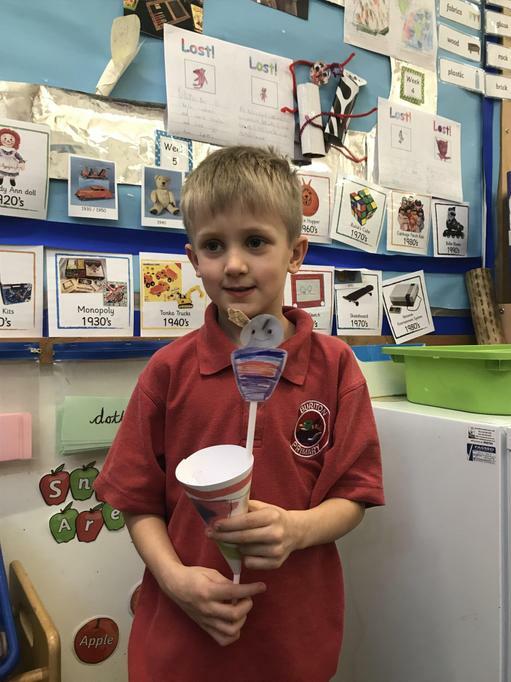 some of the explorers who have been to the South Pole. 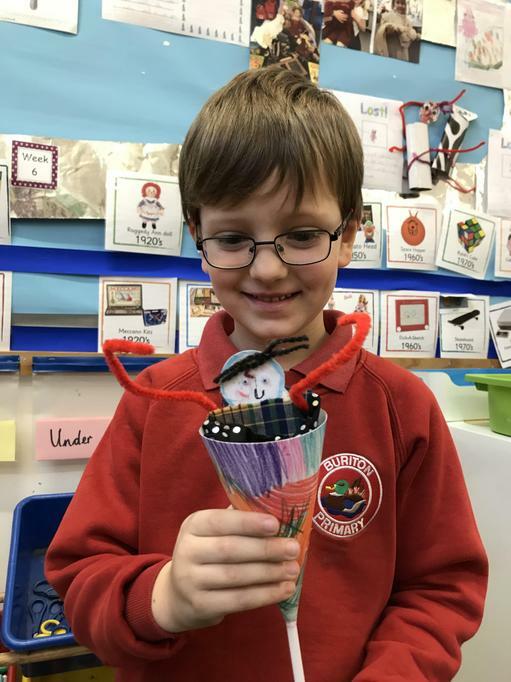 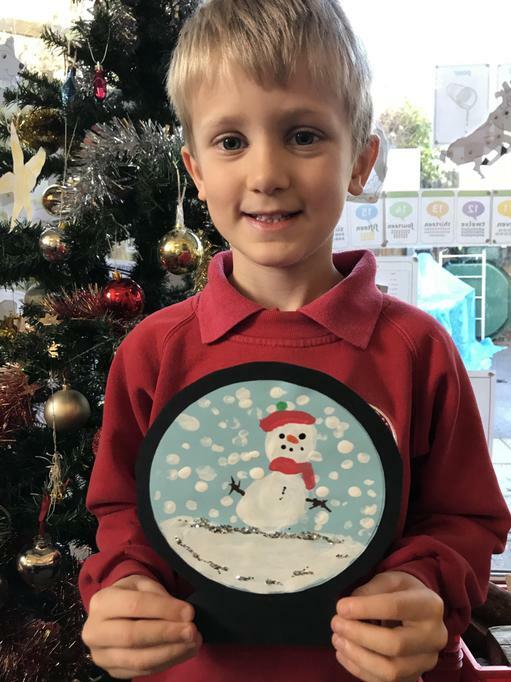 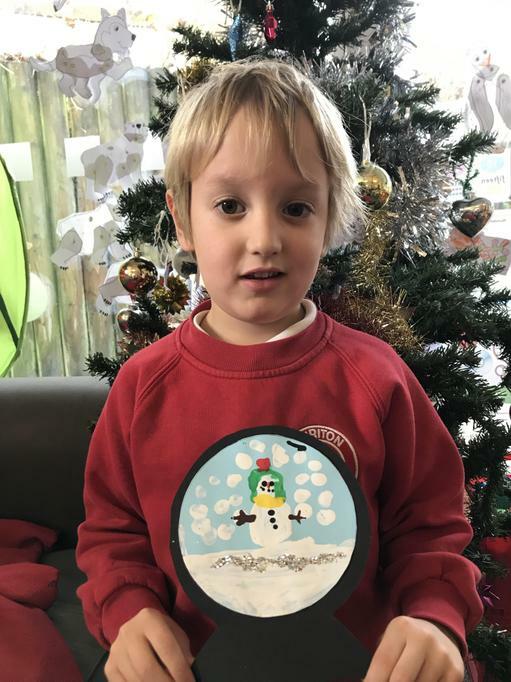 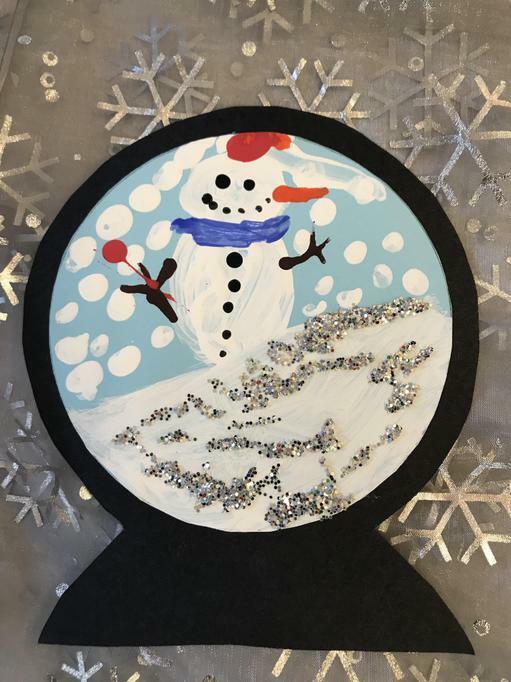 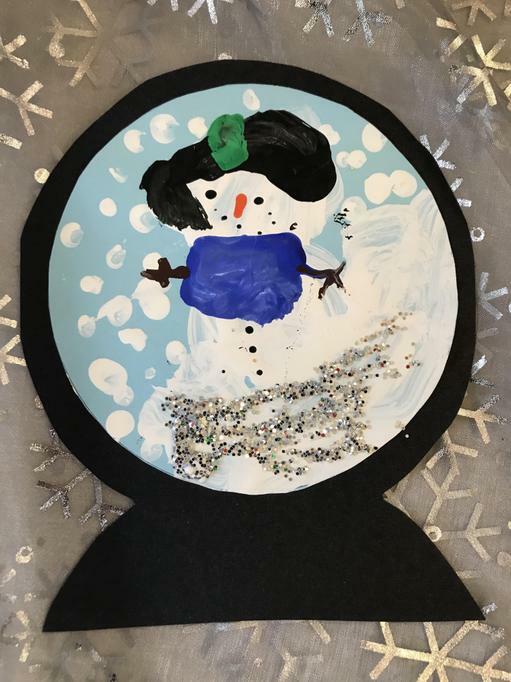 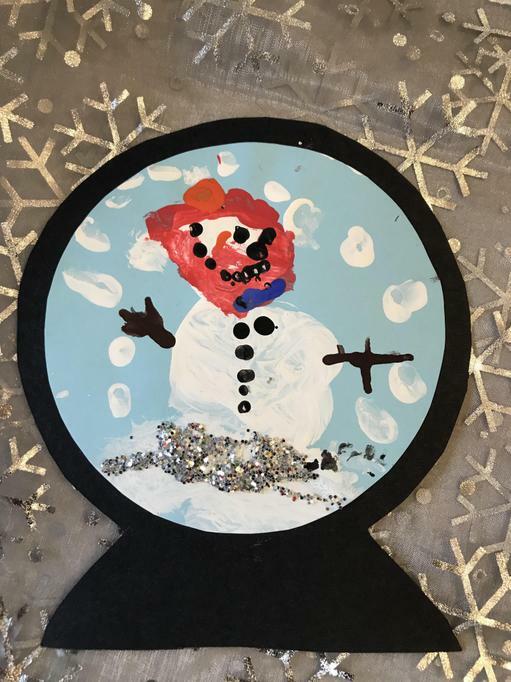 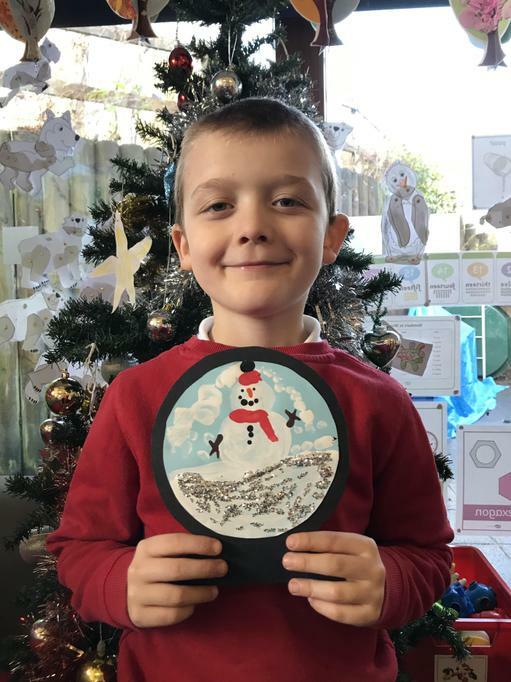 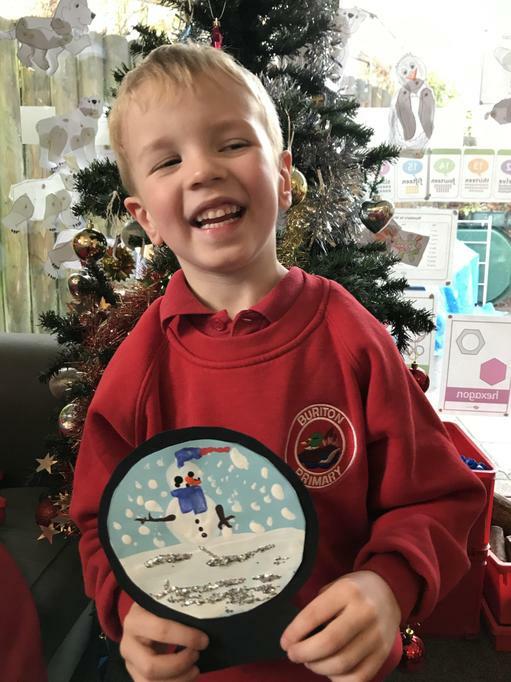 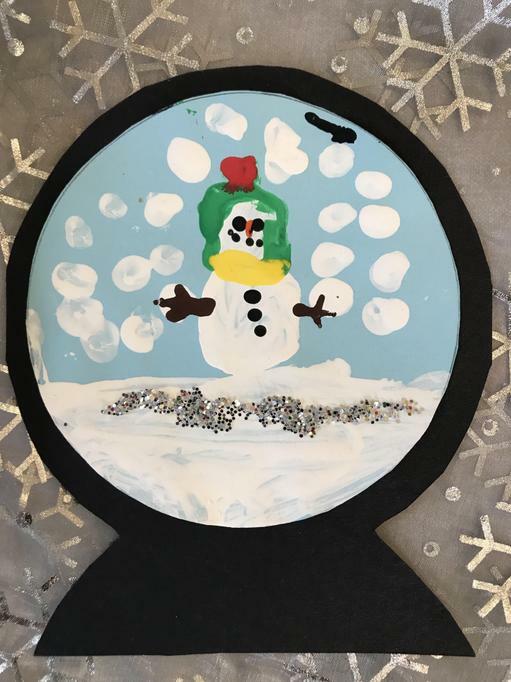 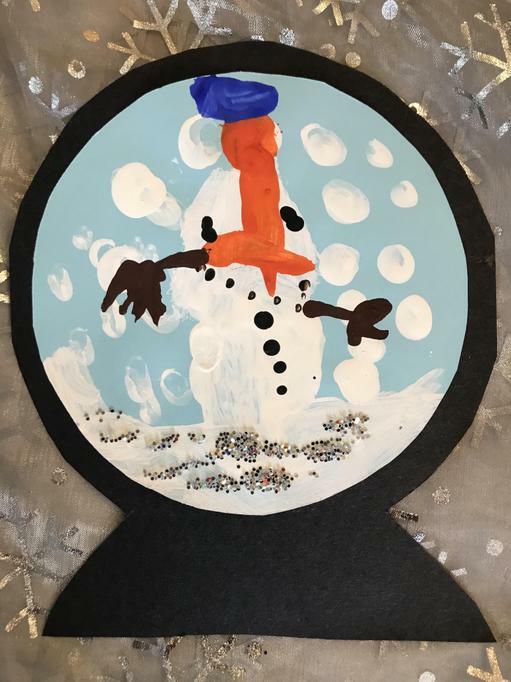 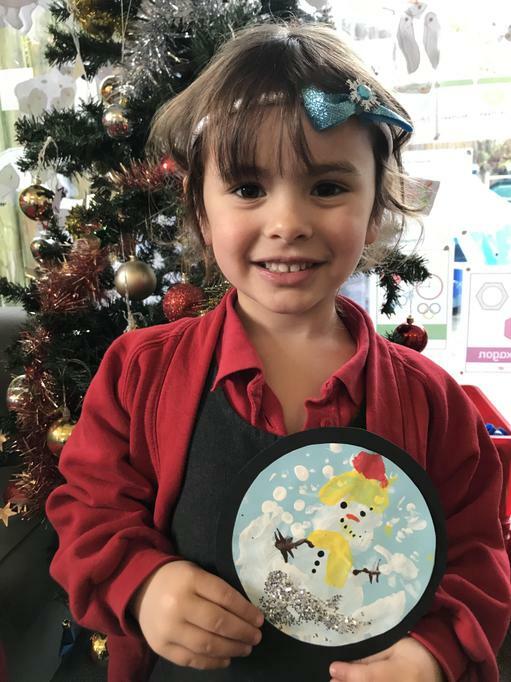 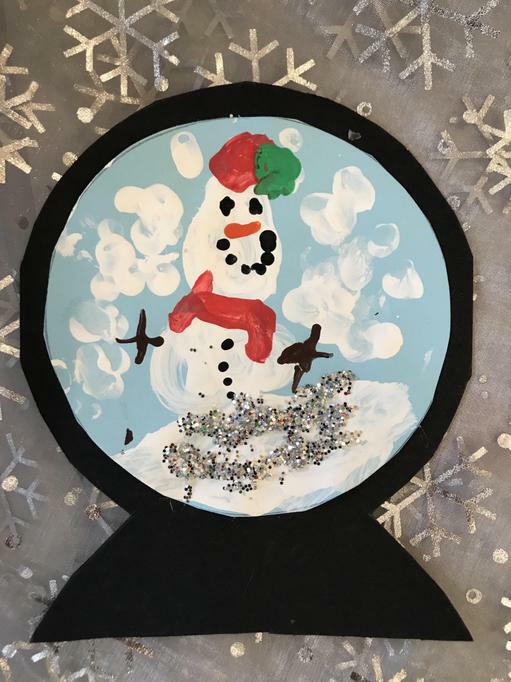 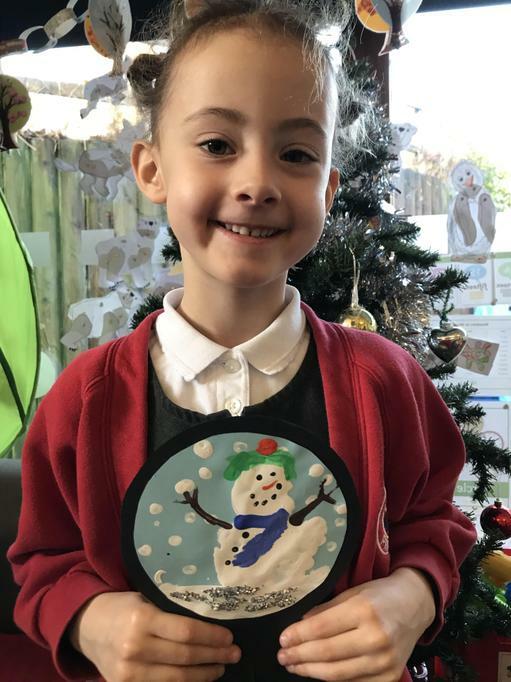 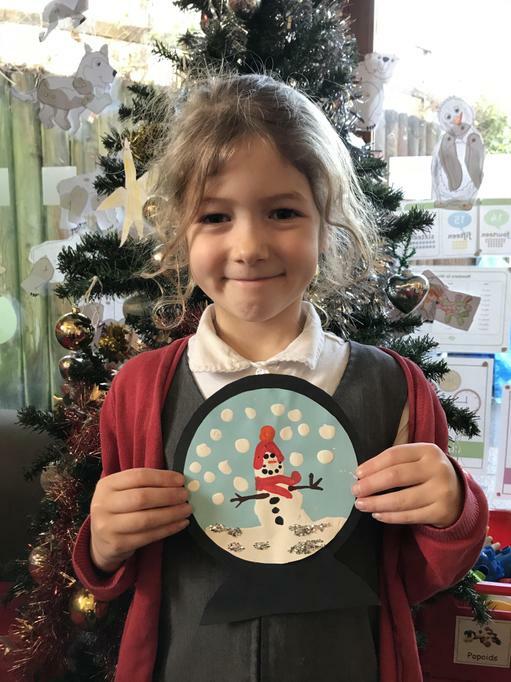 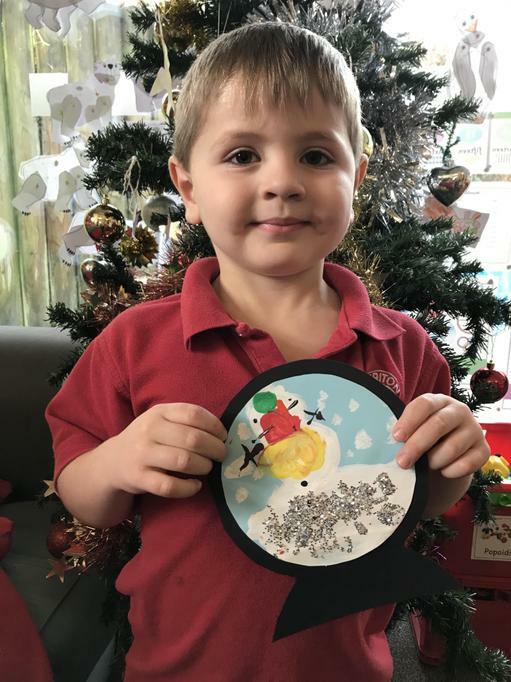 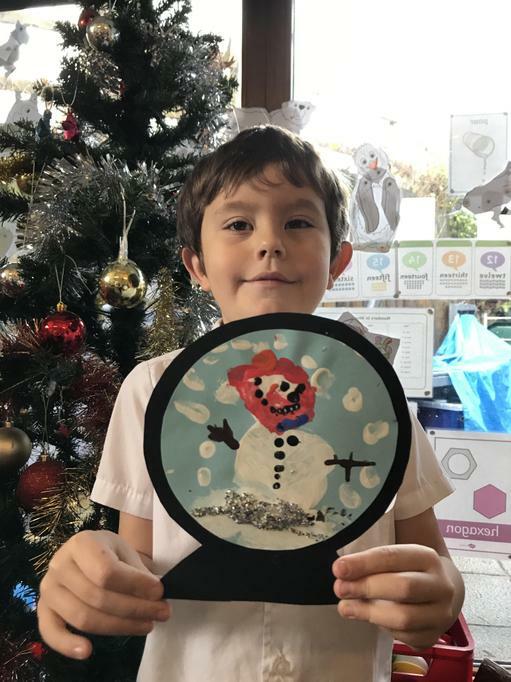 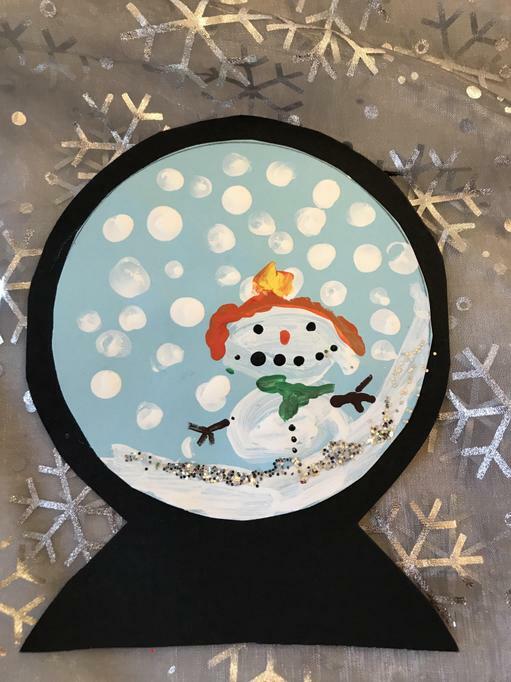 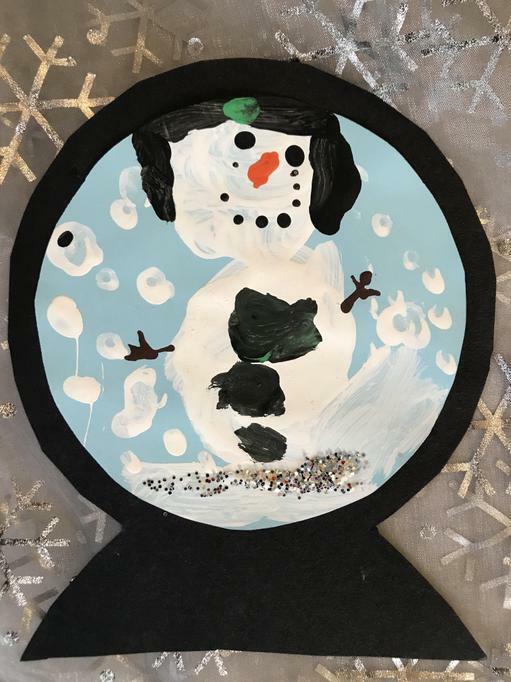 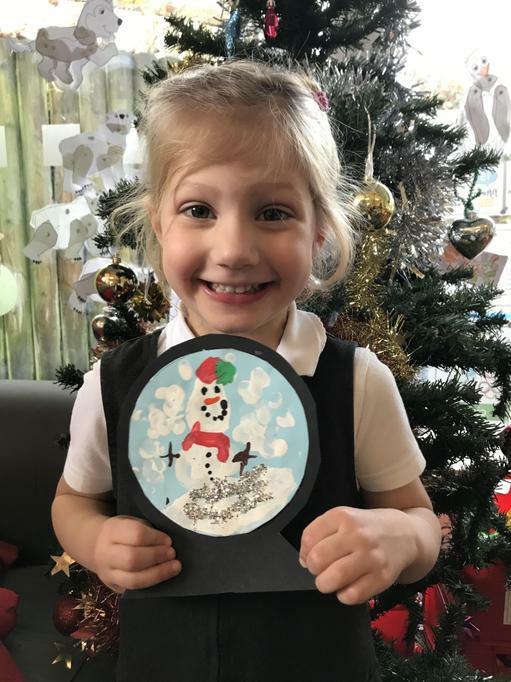 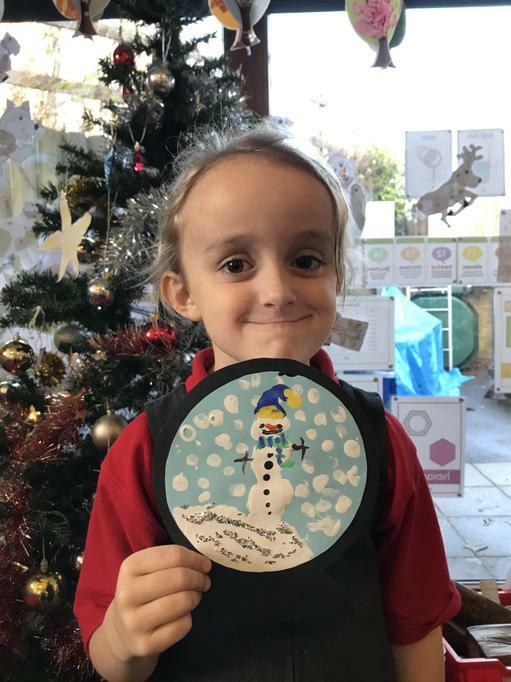 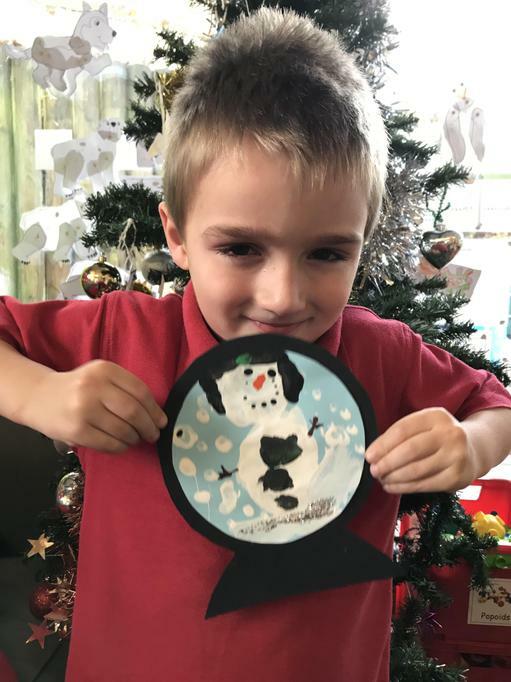 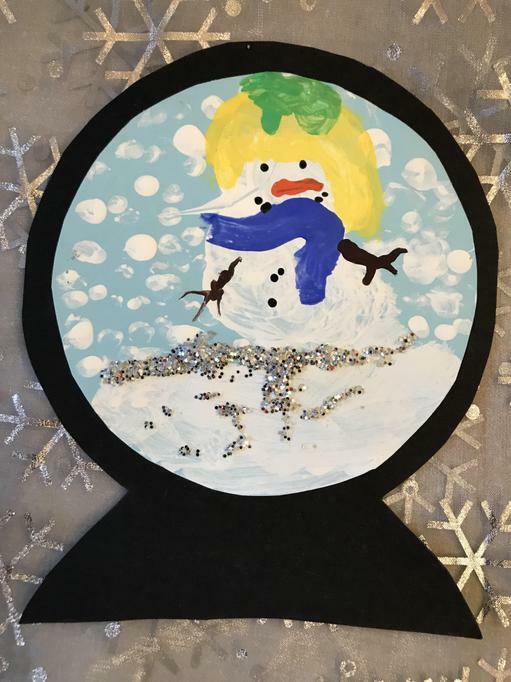 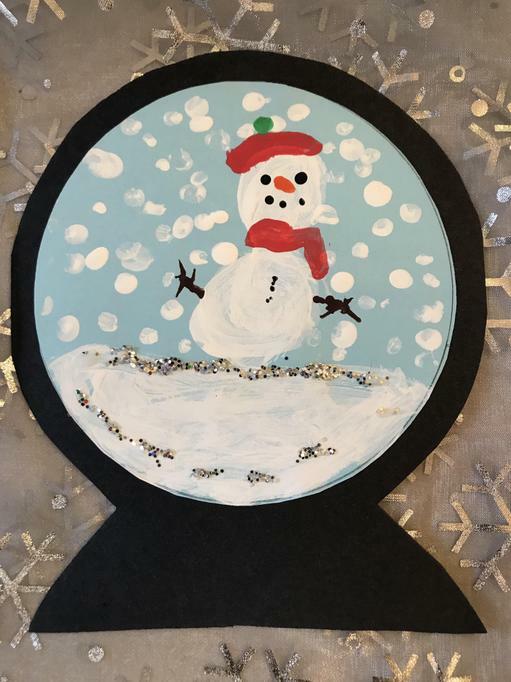 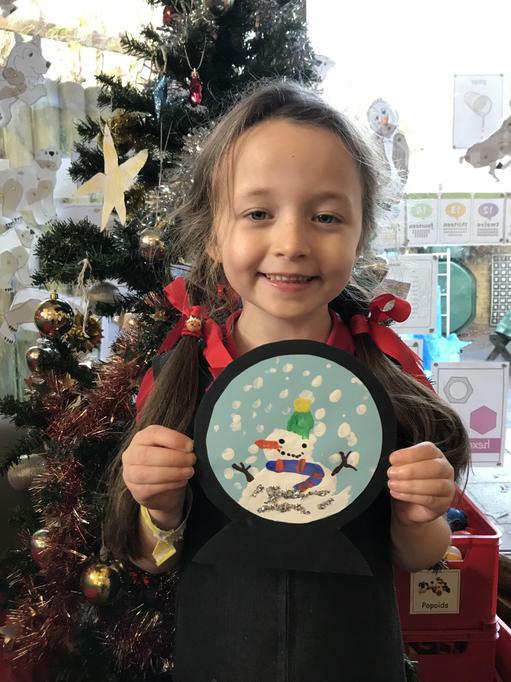 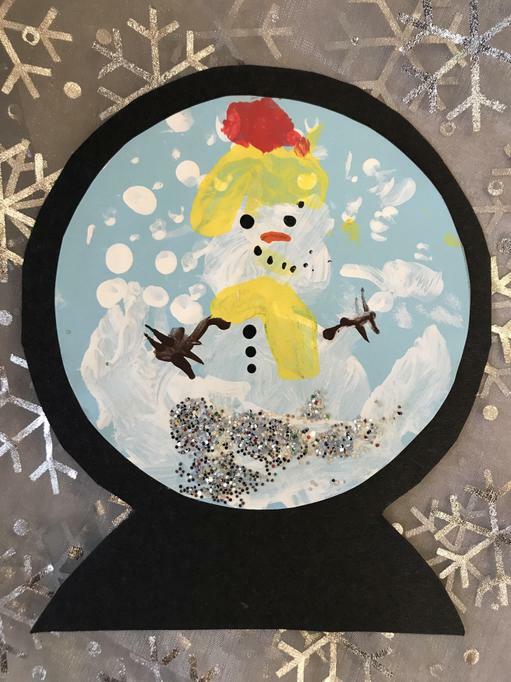 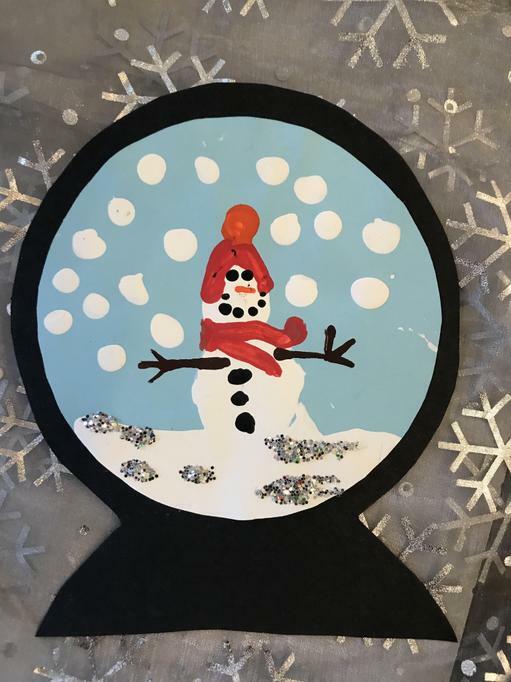 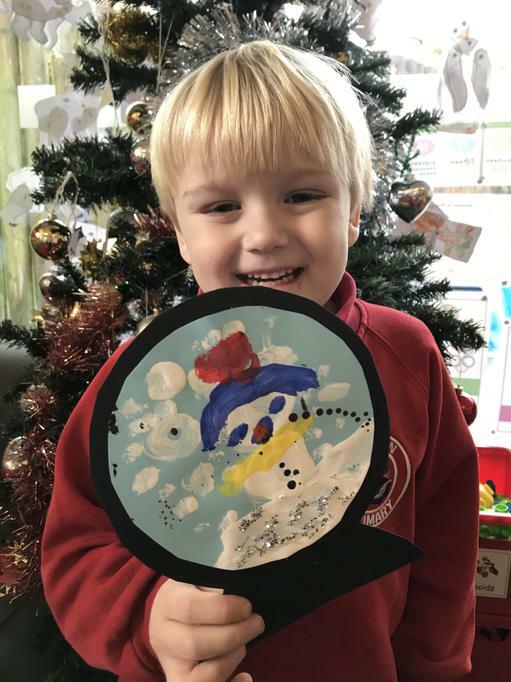 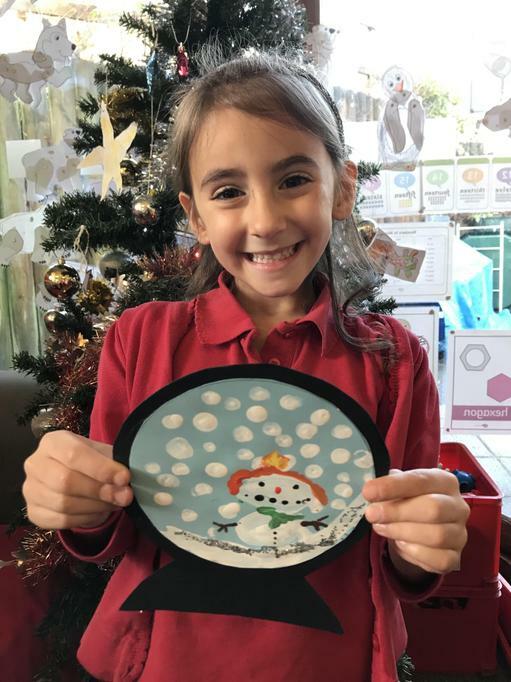 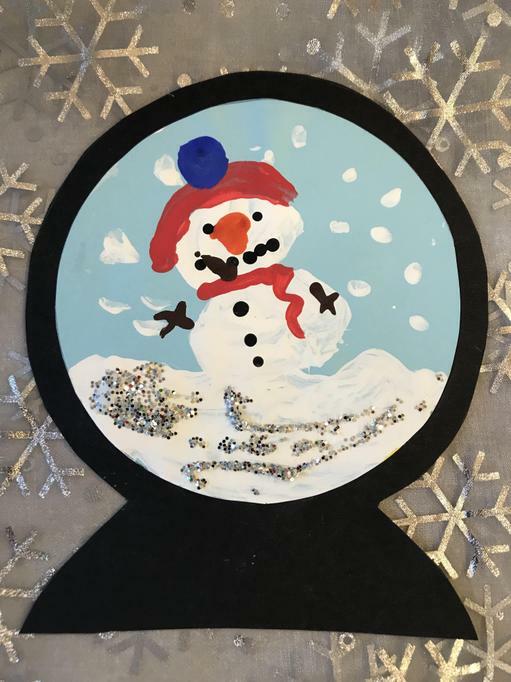 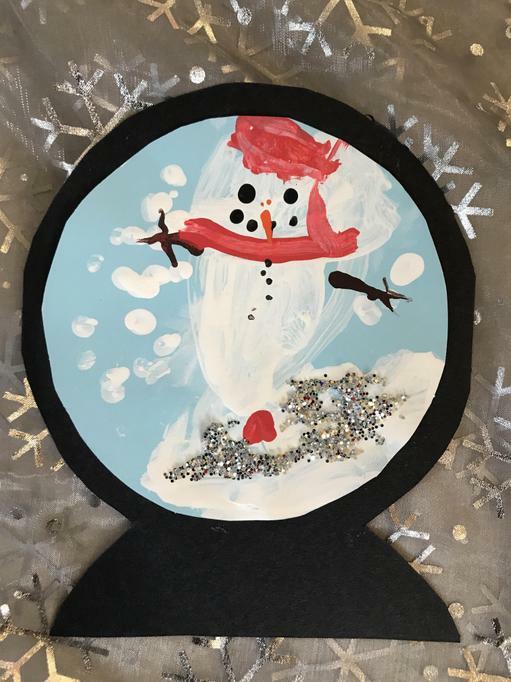 We will also develop our art skills to design and make a range of winter crafts. 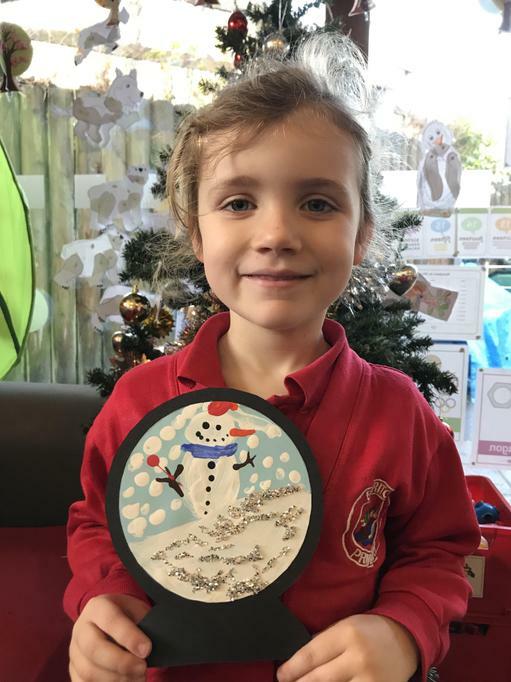 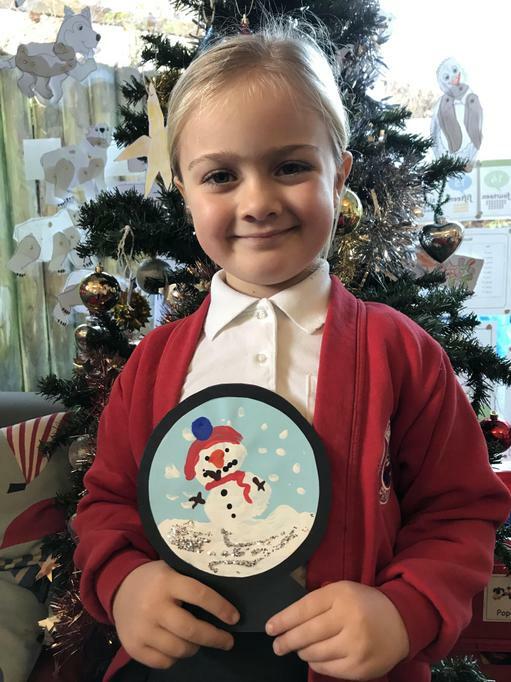 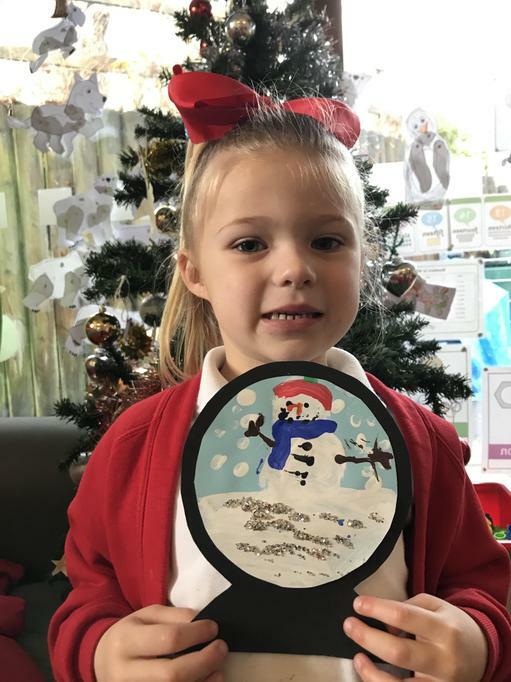 HAPPY CHRISTMAS to all the children in Diamonds Class, and all your families. 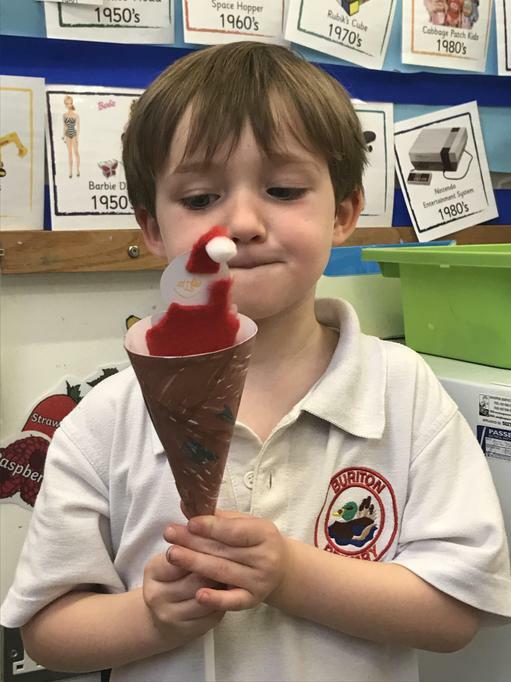 We've worked SOOOOOO hard this term, and we are SOOOO proud of you all!!! 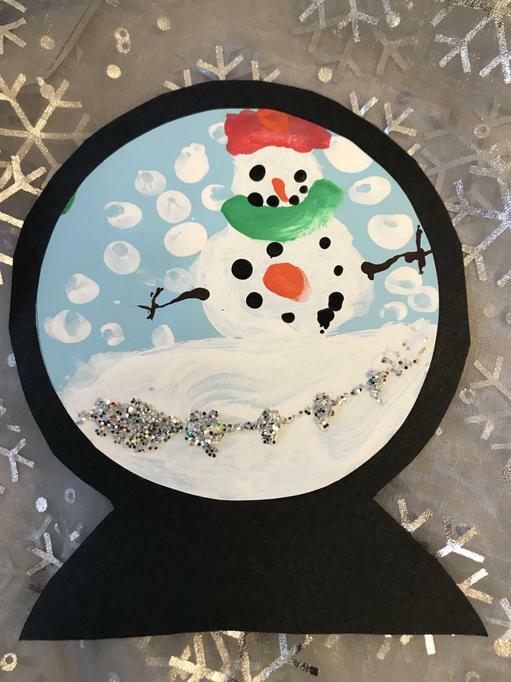 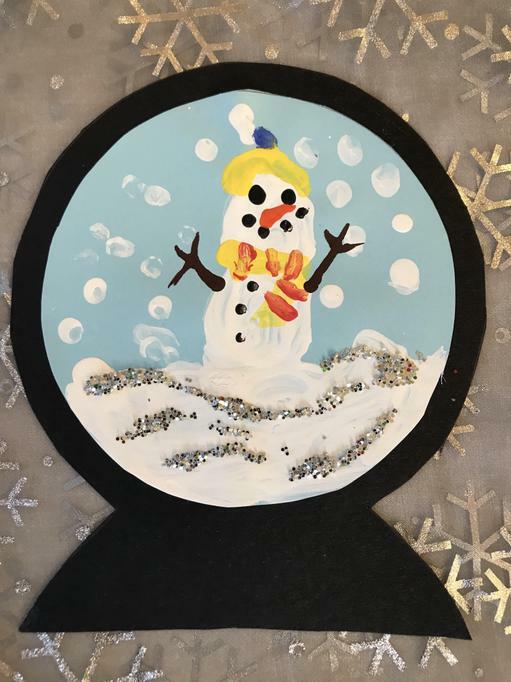 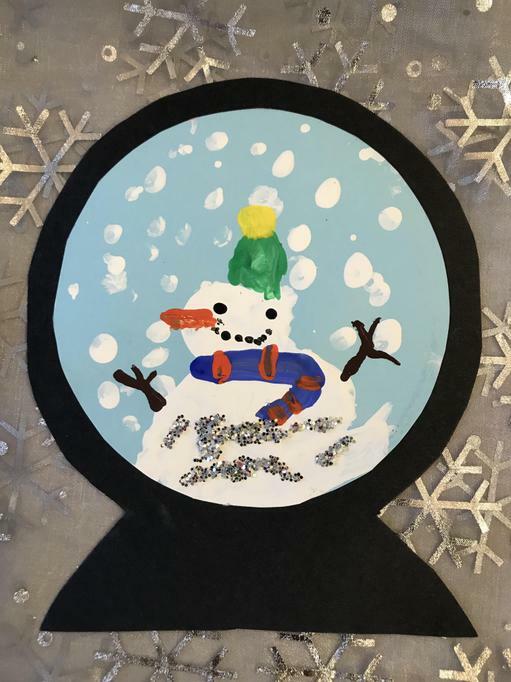 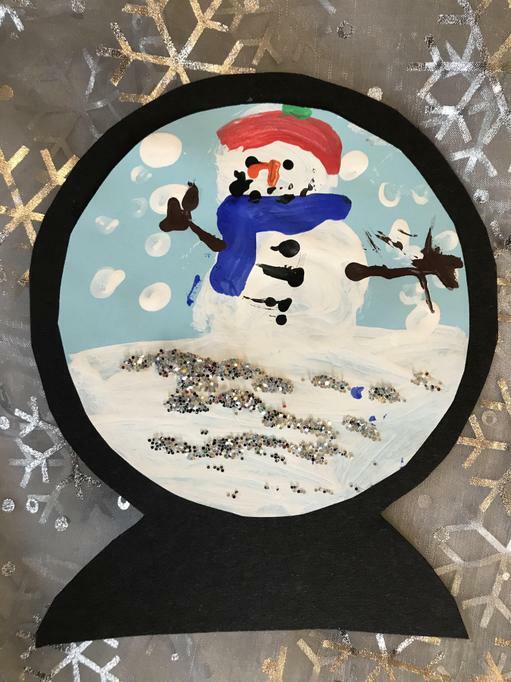 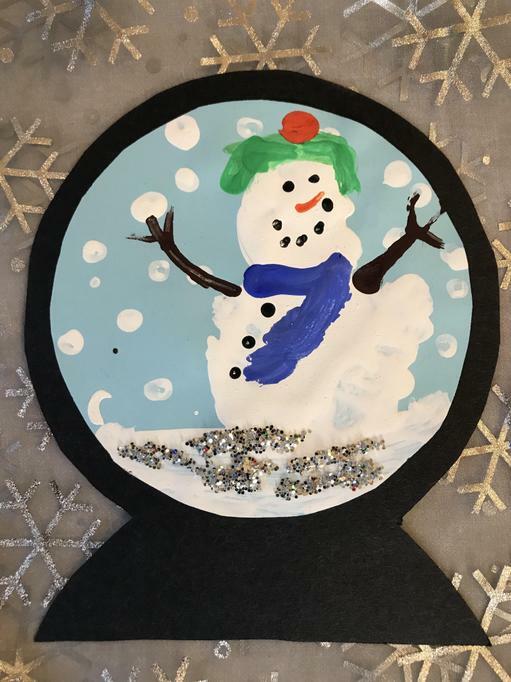 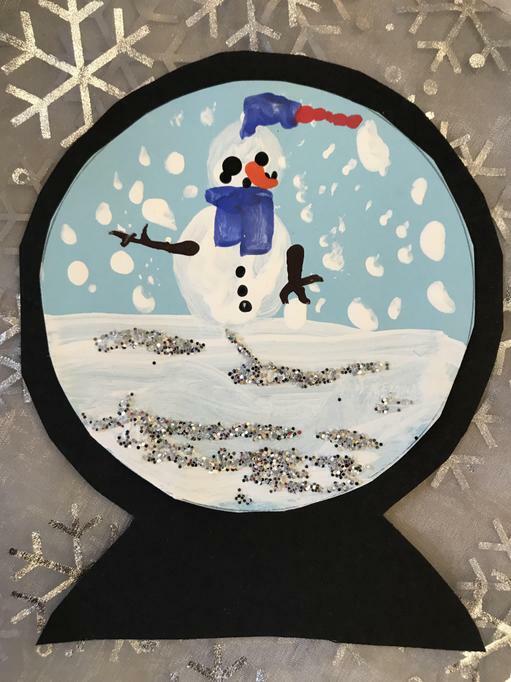 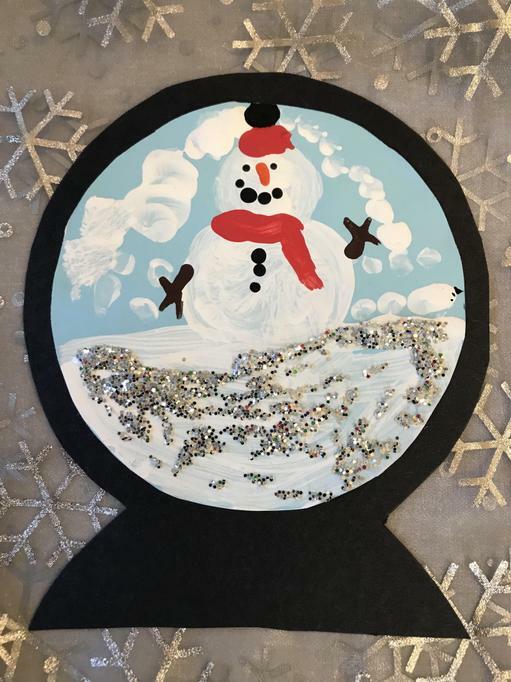 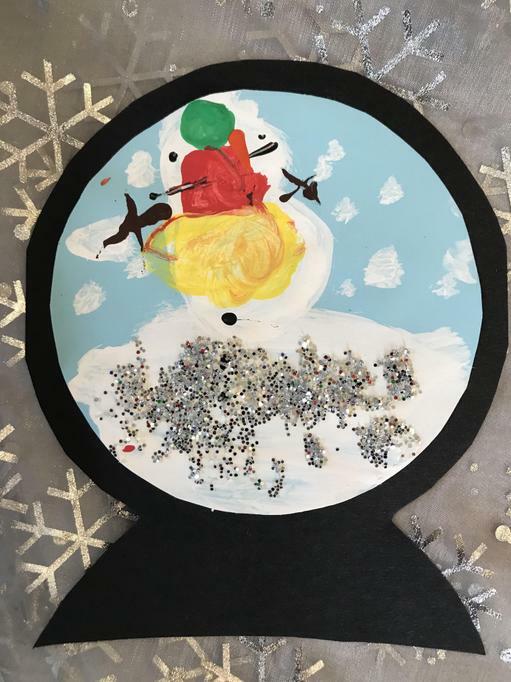 Here are the pictures of your Christmas Snow-globes and all your smiley Christmas faces -- Happy Holidays! 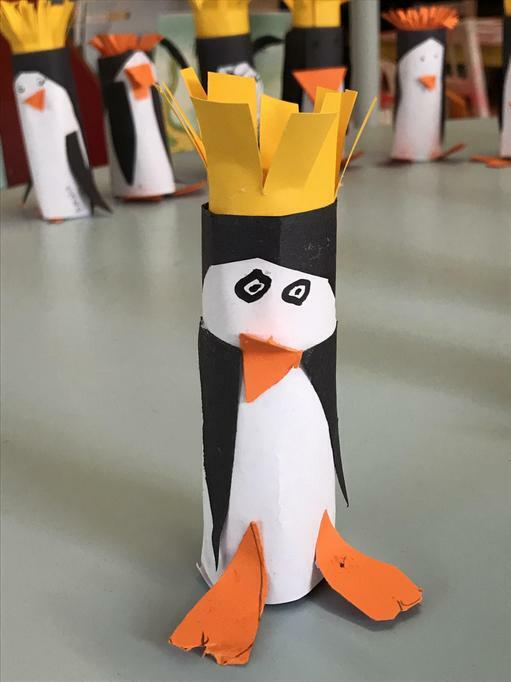 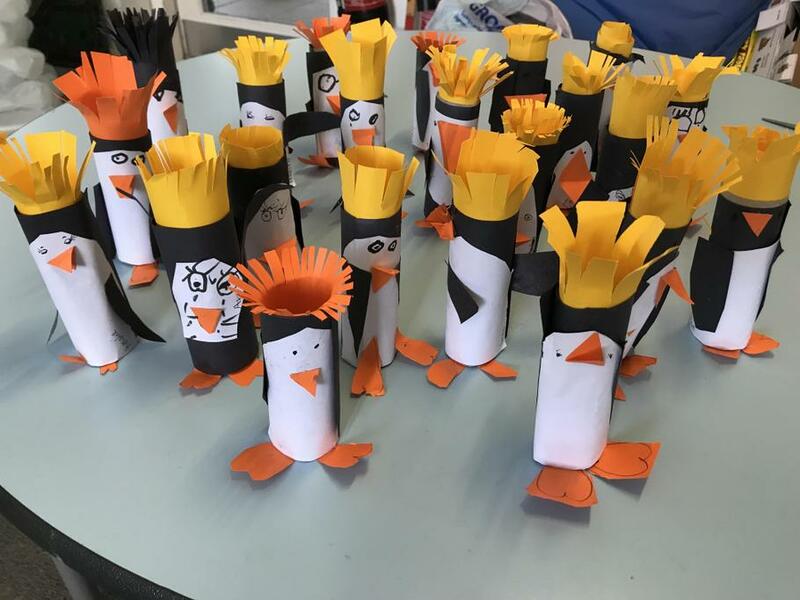 We hope you enjoy our Parade of Penguins! 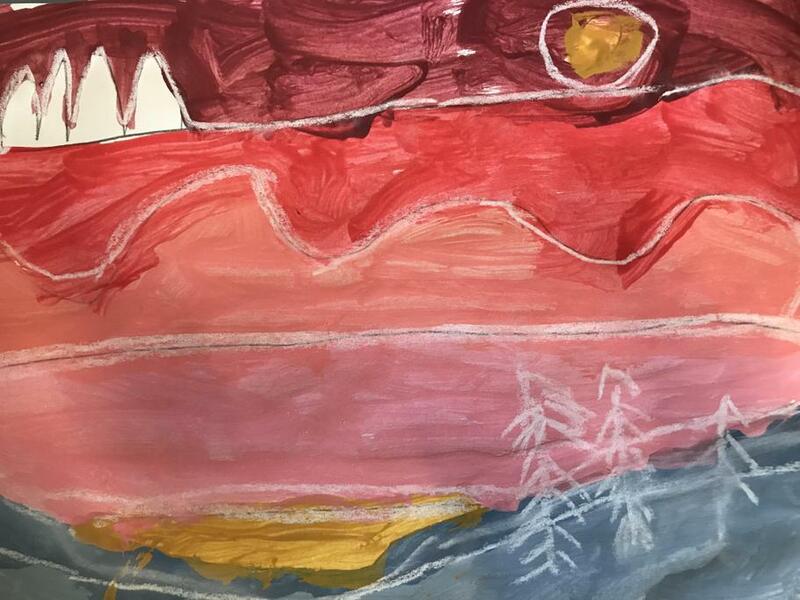 This week we studied the art of Ted Harrison, an artist who portrays the world of the Arctic circle in vivid, vibrant colours. 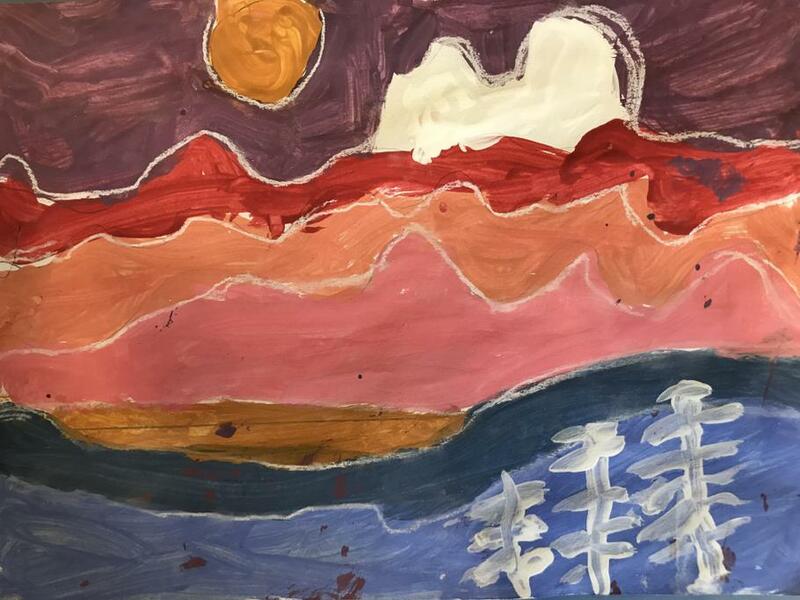 Ted Harrison was born in England in 1926, but moved to Canada in 1968, and his most famous paintings show the landscape and culture of the Yukon in Canada's Arctic circle. 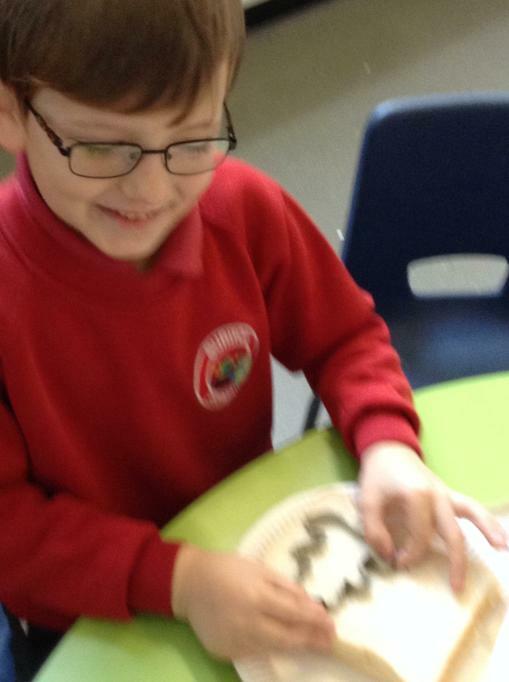 We learnt how to mix our own colours and to modify their shades and tints by using black or white. 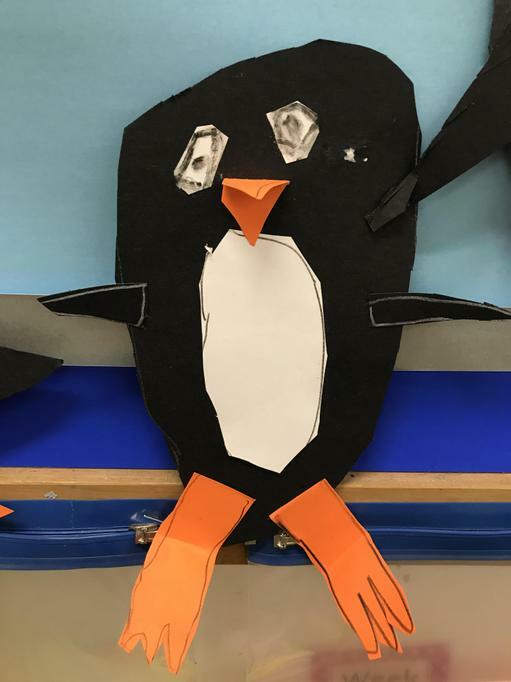 we worked on improving our fine-motor and concentration skills by carefully colouring our beautiful Polar animals in a myriad of wonderful colours. 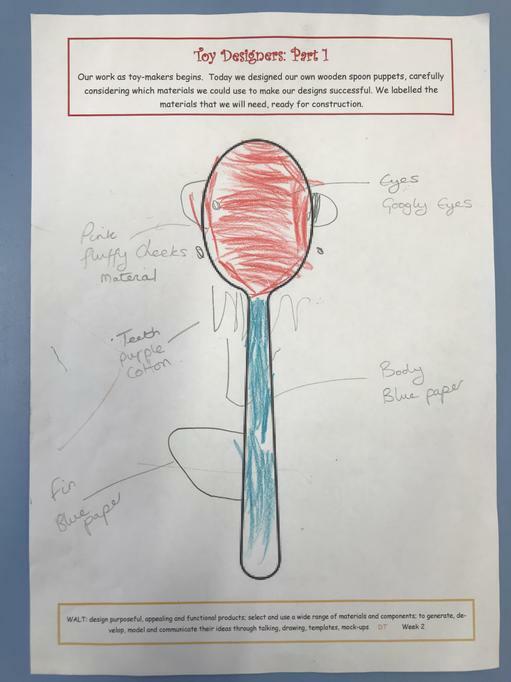 We learnt that the colours of our pencils can be blended to create graduating shades, and that the pressure we apply also changes the effect. 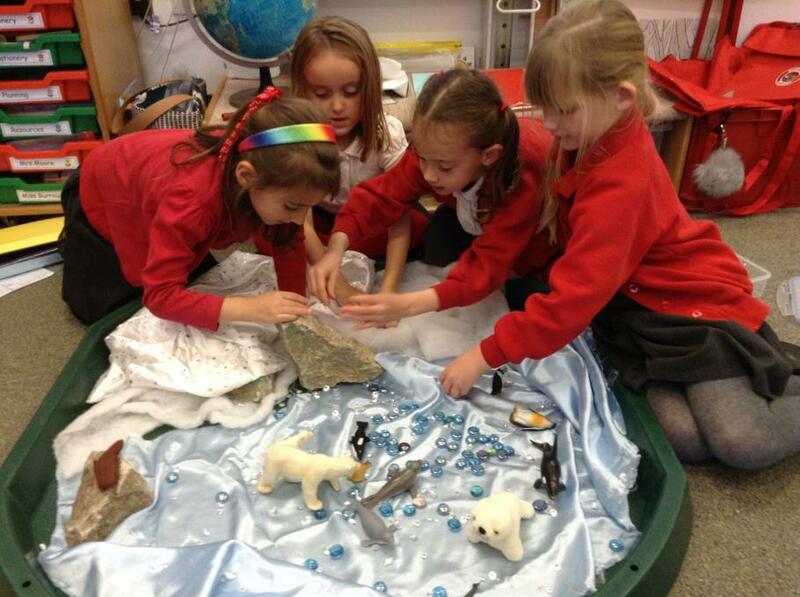 This week we have been learning about the Inuit people who live in the Arctic circle. 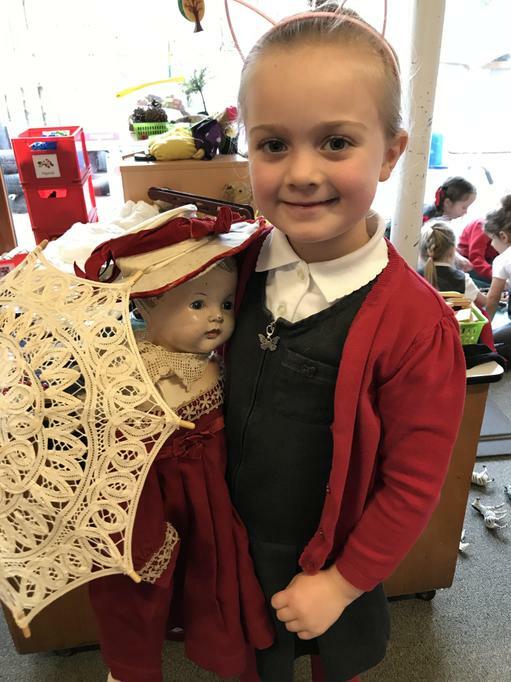 We have learnt about their modern-day and traditional lifestyles, and about some of the special clothes they wear to keep themselves warm. 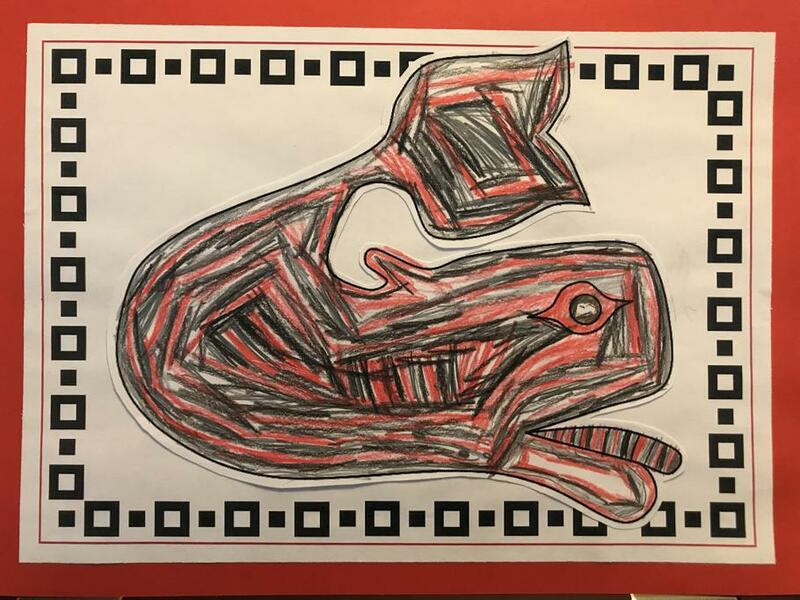 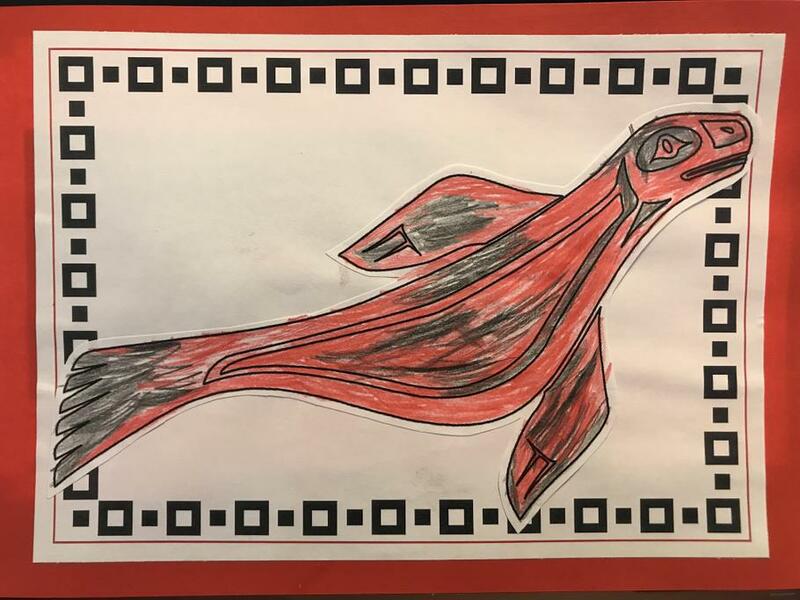 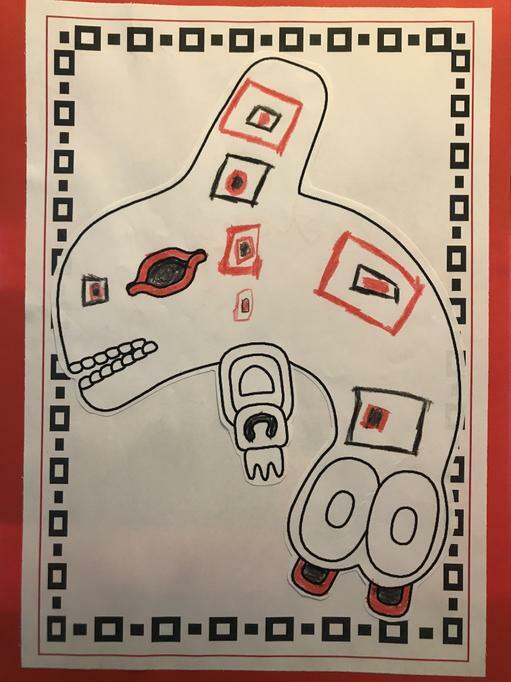 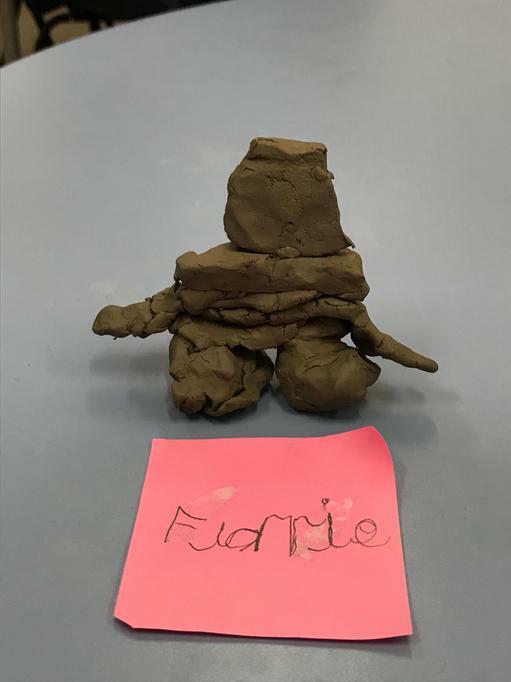 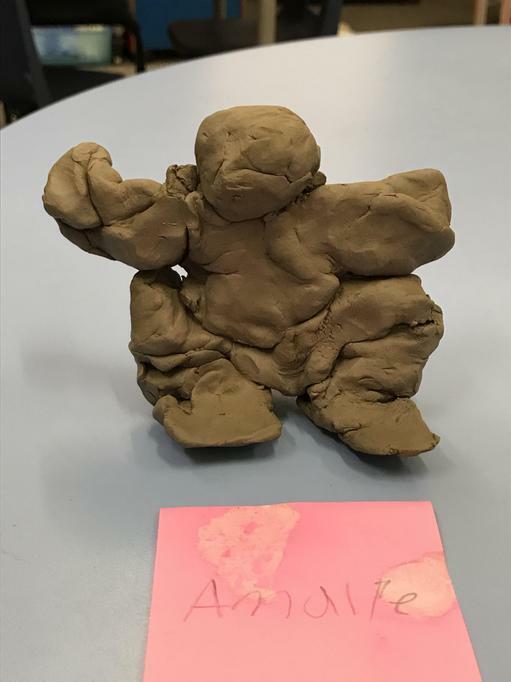 Some of us decided to colour an Inuit, and some decided to challenge themselves to make their own figure. 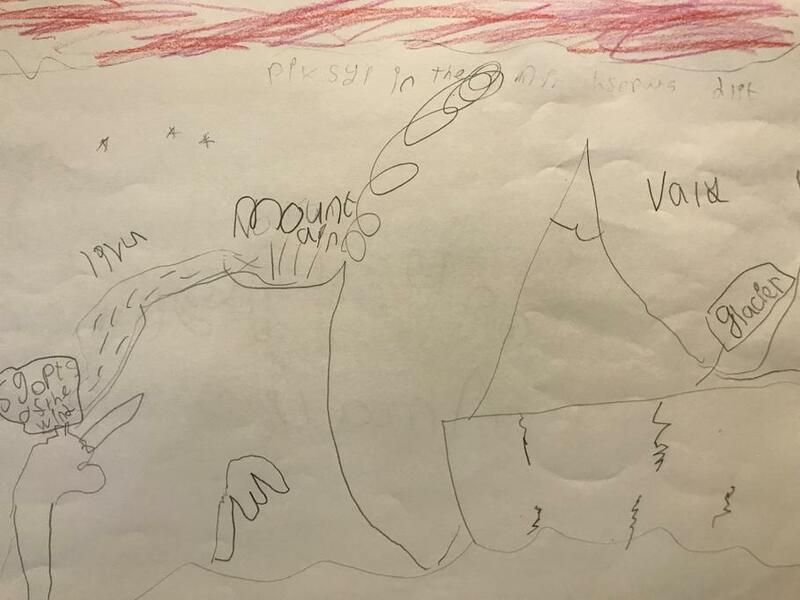 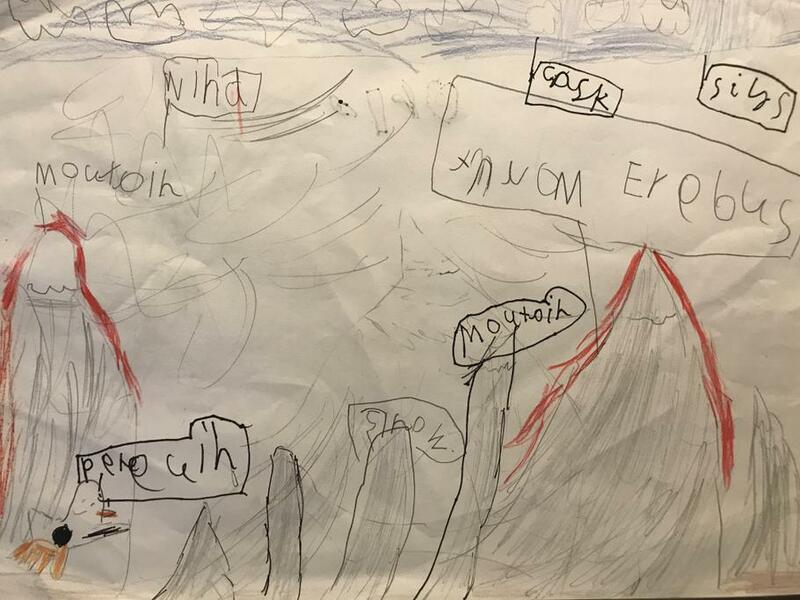 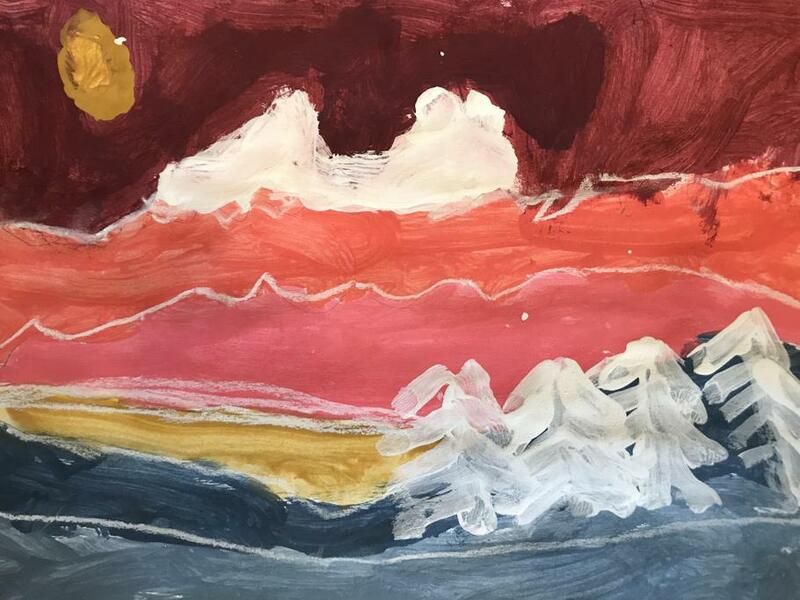 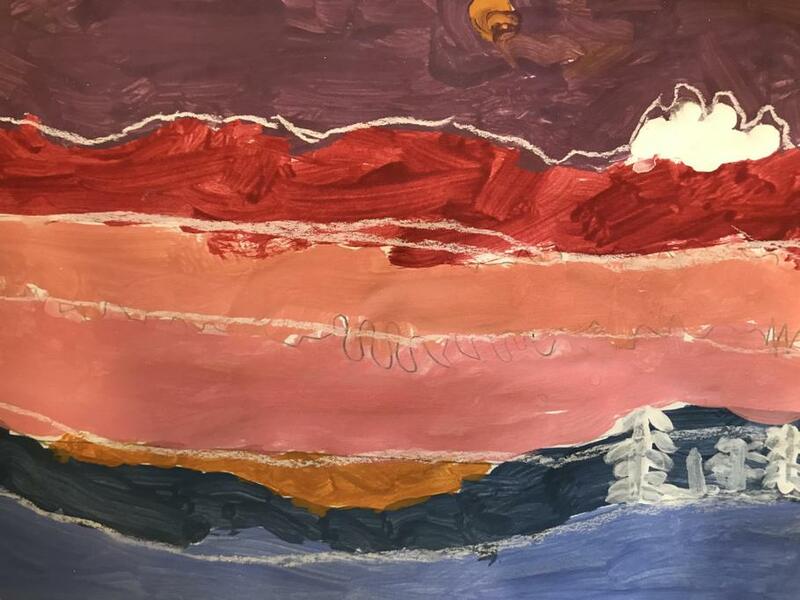 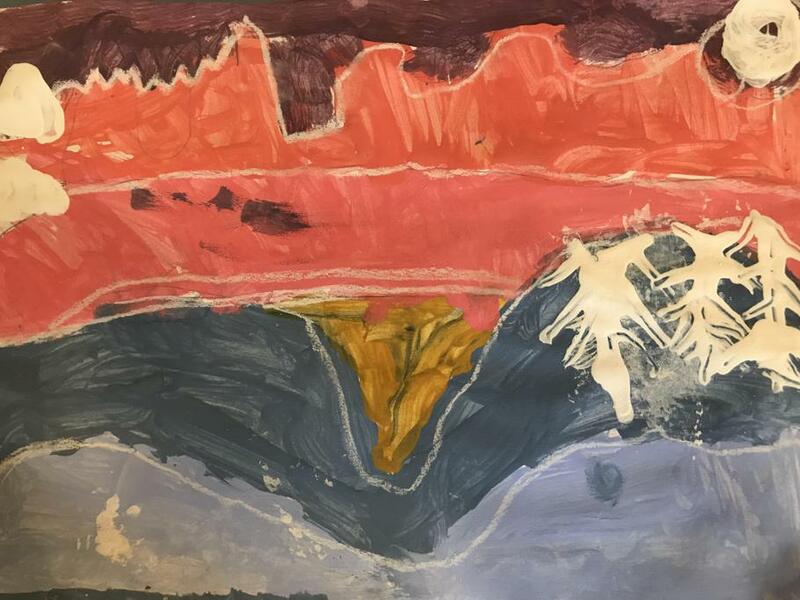 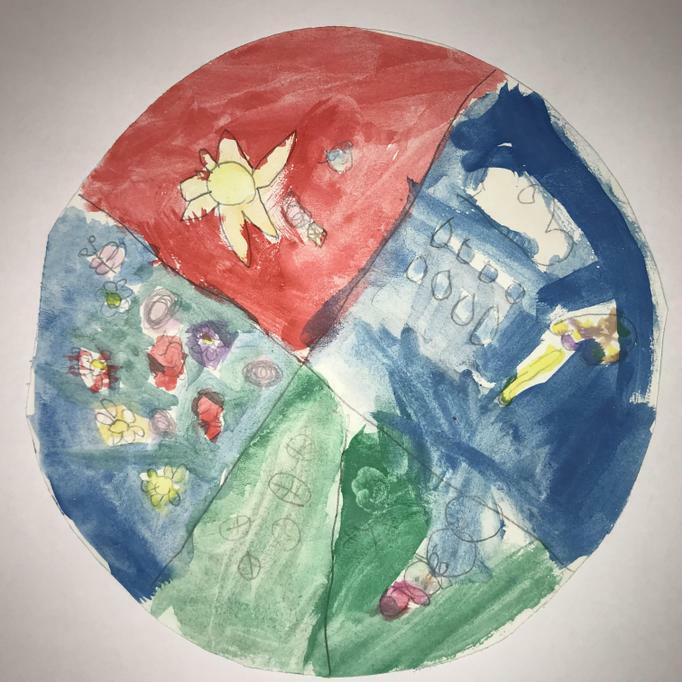 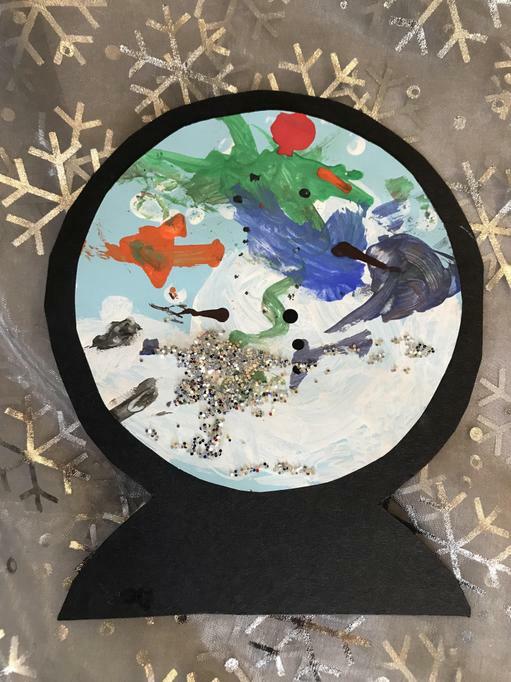 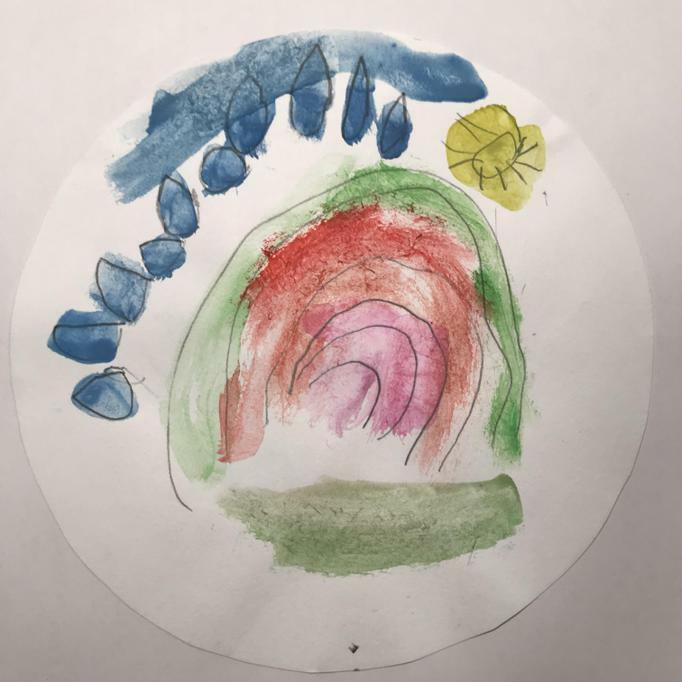 Some children took their artwork an extra step and made an Arctic landscape collage for their person to live in. 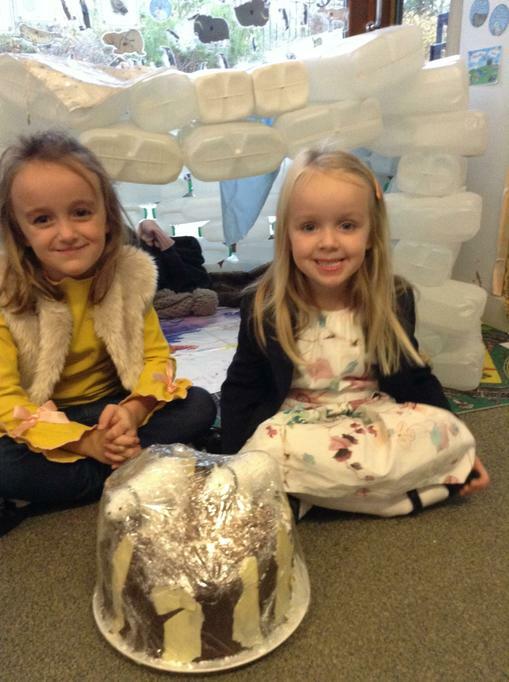 Our igloo is finished, just in time for Inuit week!!! 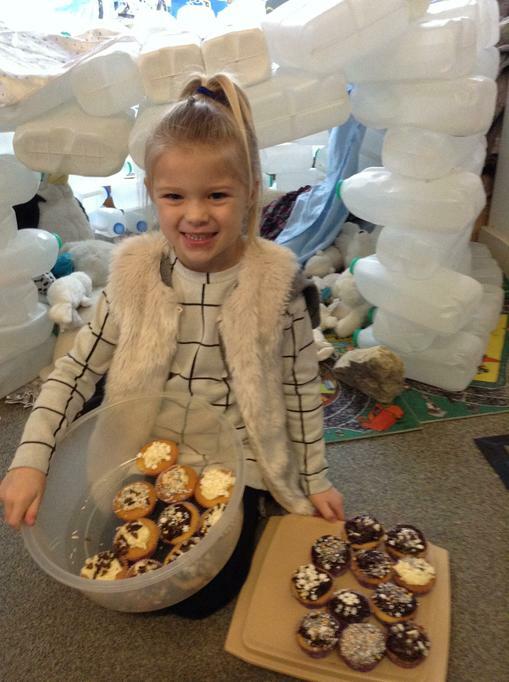 Thank you so much for all the milk-drinking and bottle-recycling you've done -- the igloo was made out of about 300 bottles in total!!! 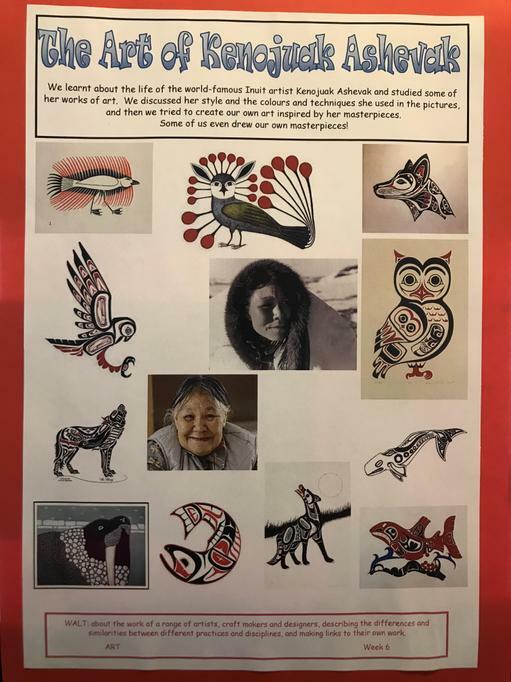 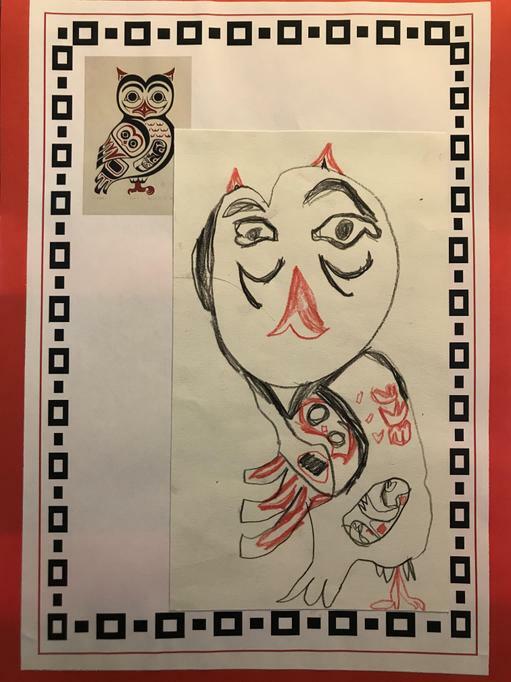 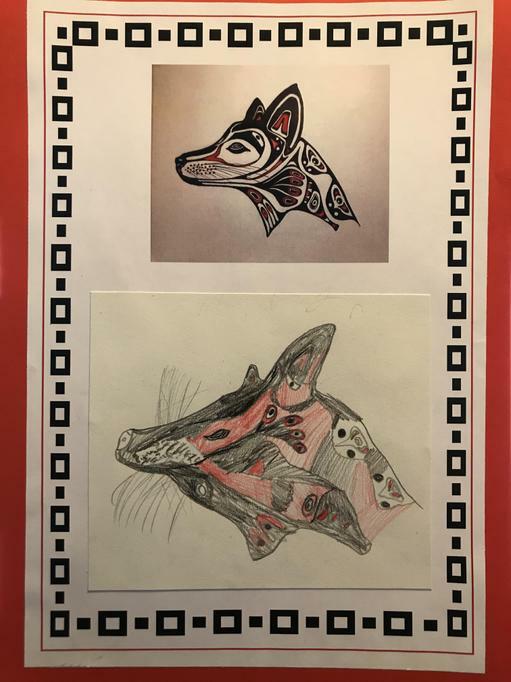 We also learnt about the life of the world-famous Inuit artist Kenojuak Ashevak and studied some of her works of art. 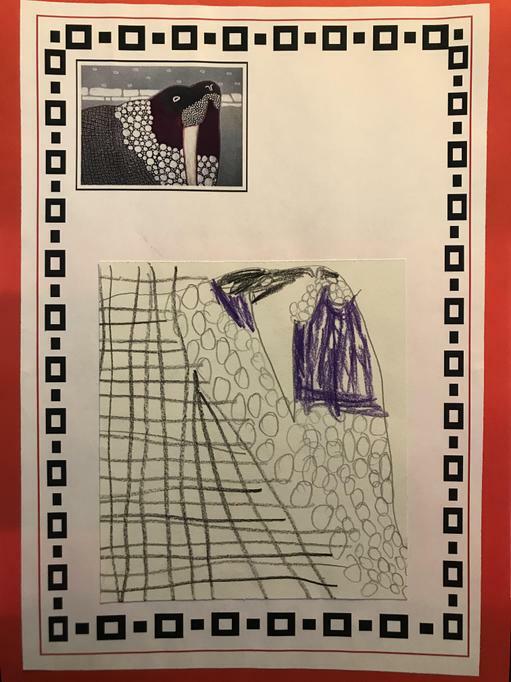 We discussed her style and the colours and techniques she used in the pictures and then we tried to create our own art inspired by her masterpieces. 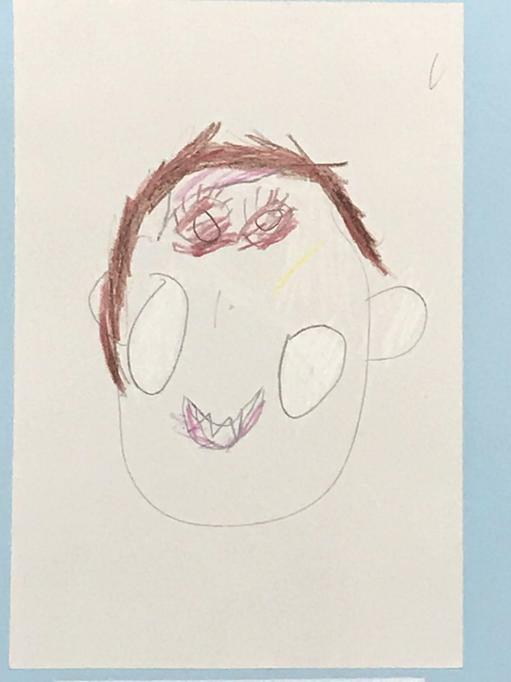 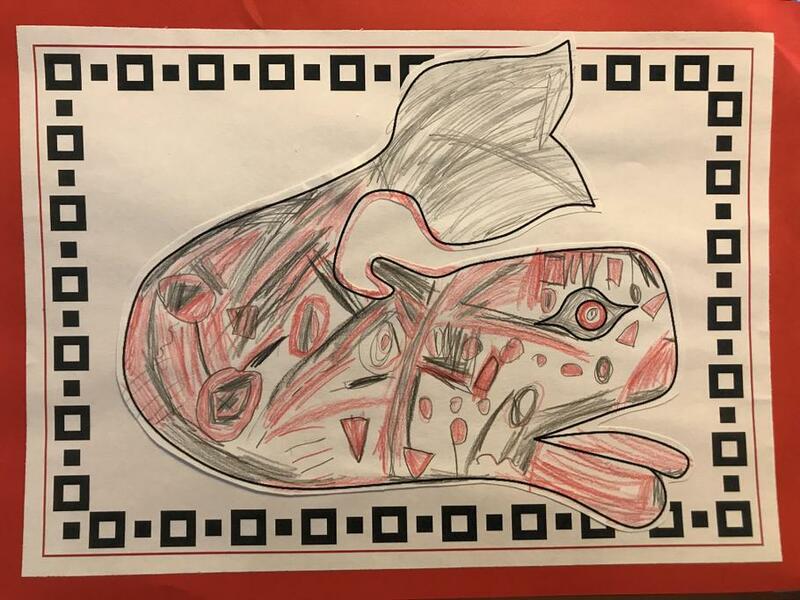 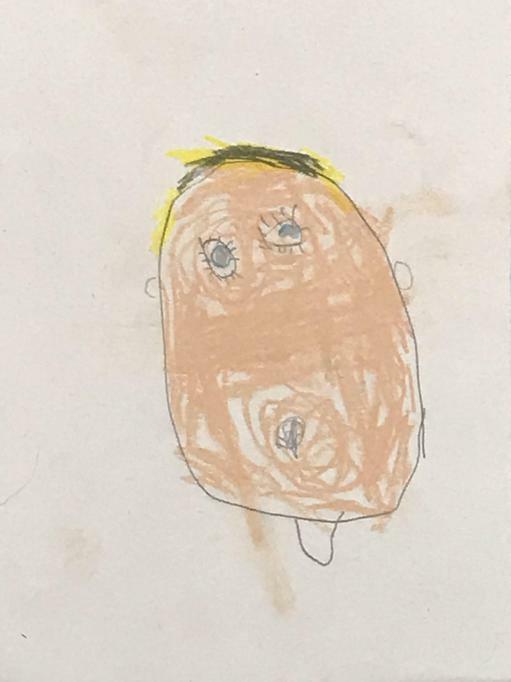 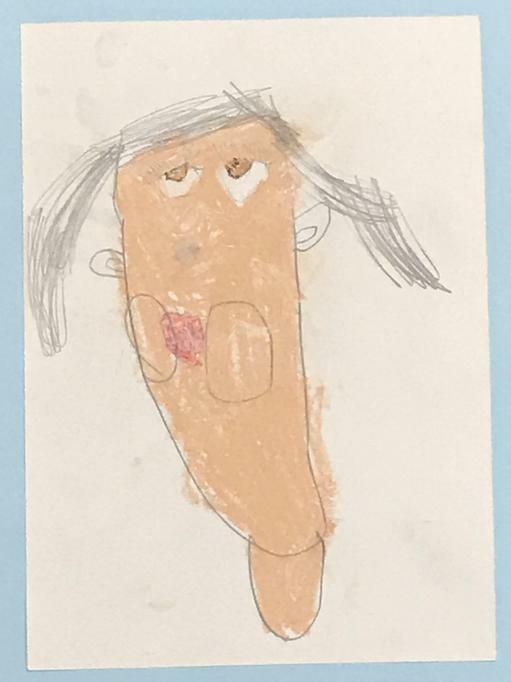 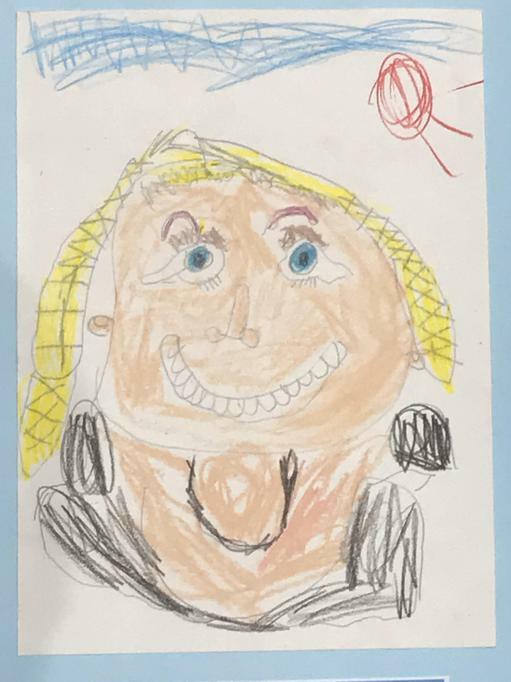 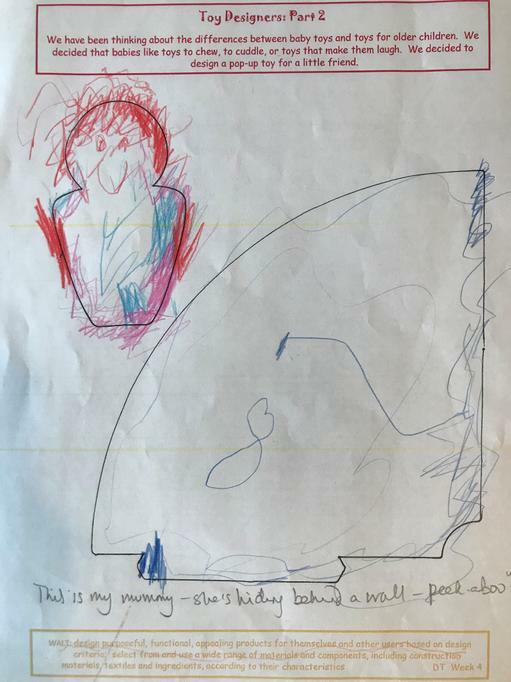 Some of us even drew our own masterpieces! 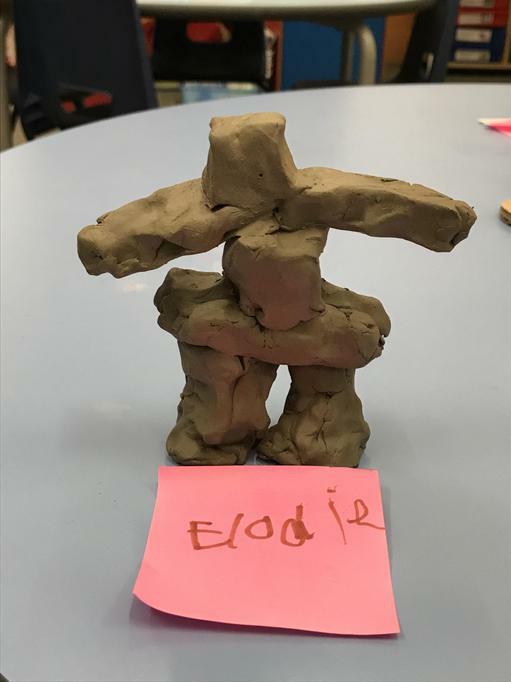 We learnt about the Inuksuit that are made by the Inuit people. 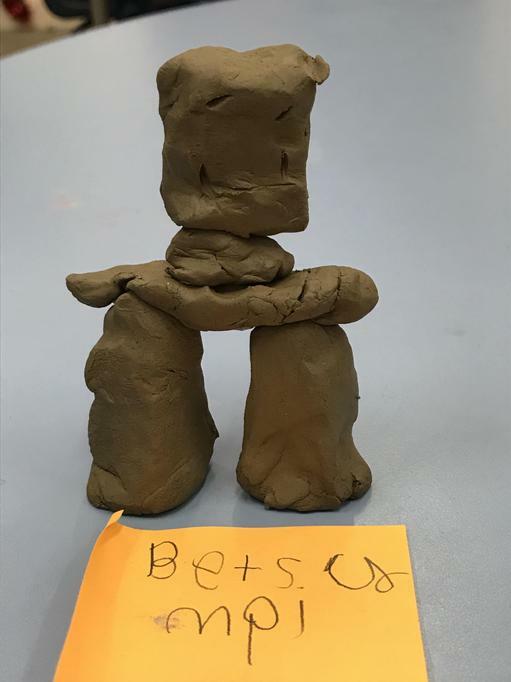 Inuksuit are placed throughout the Arctic landscape as "helpers" to the Inuit: they are used as hunting and navigational aids, to show where good hunting can be found, where food is stored, or a good route to take. 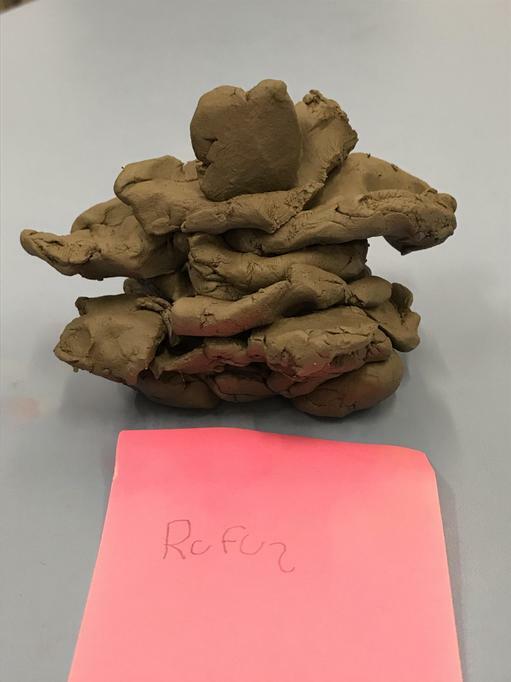 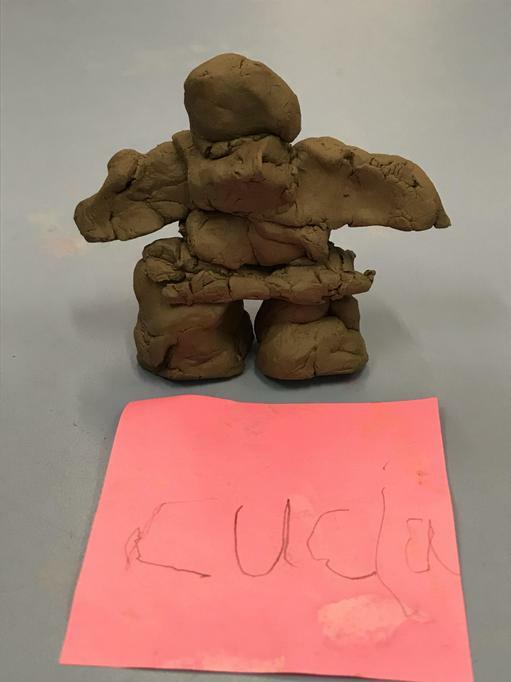 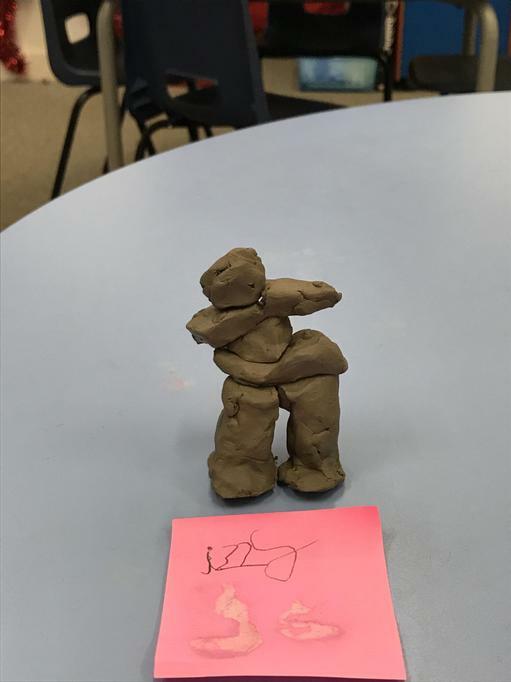 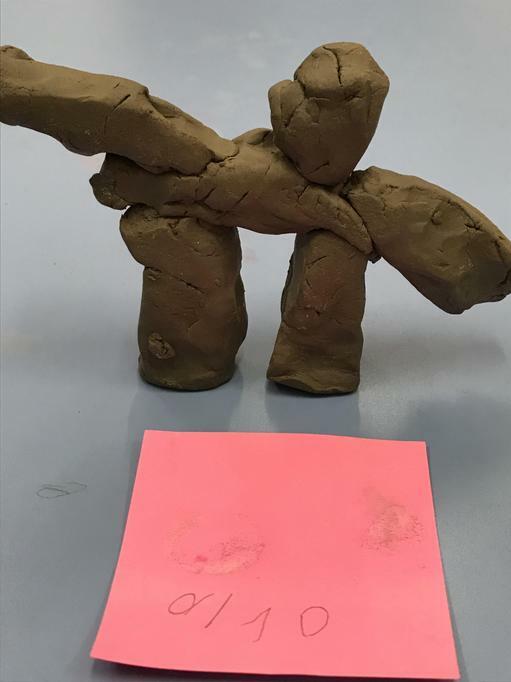 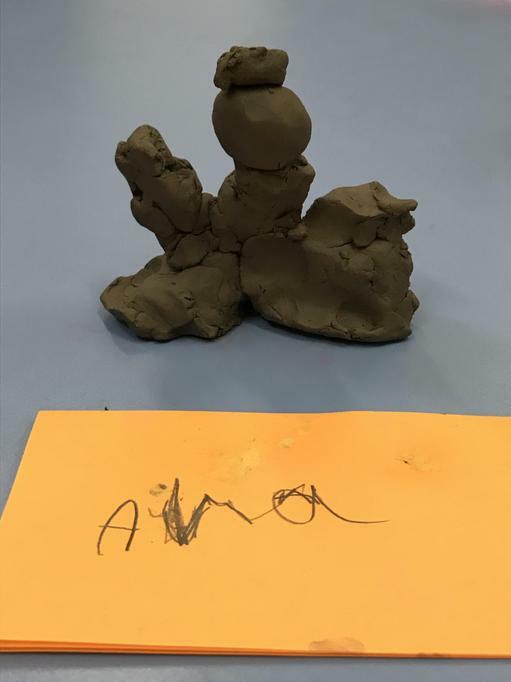 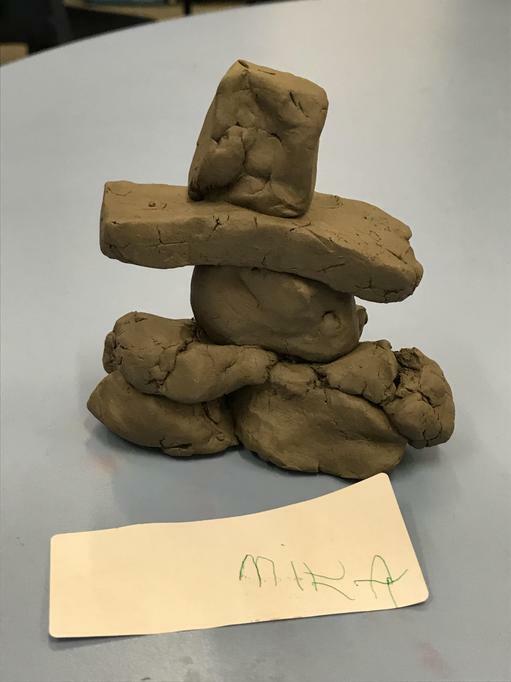 We studied images of the Inuksuit and used clay to make our own Inukshuk. 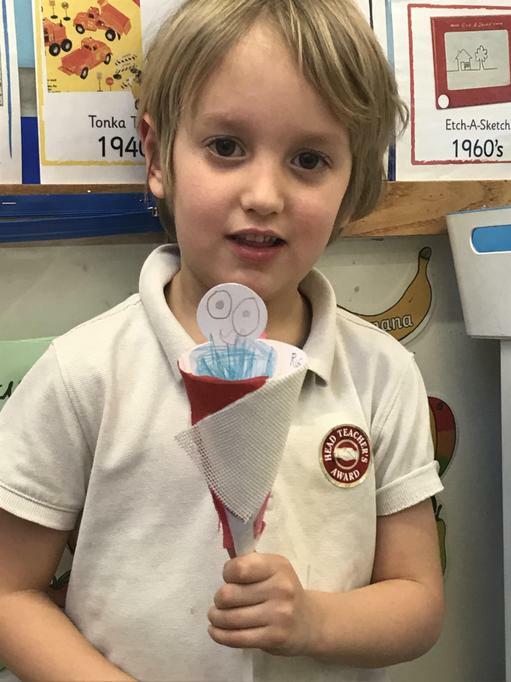 We learnt about the journey to the bottom of the world, about the scientific aims of the expedition, about the equipment and supplies they took, about the geography of the Antarctic and the route to the South Pole taken by Captain Robert Falcon Scott and his heroic team, Capt. 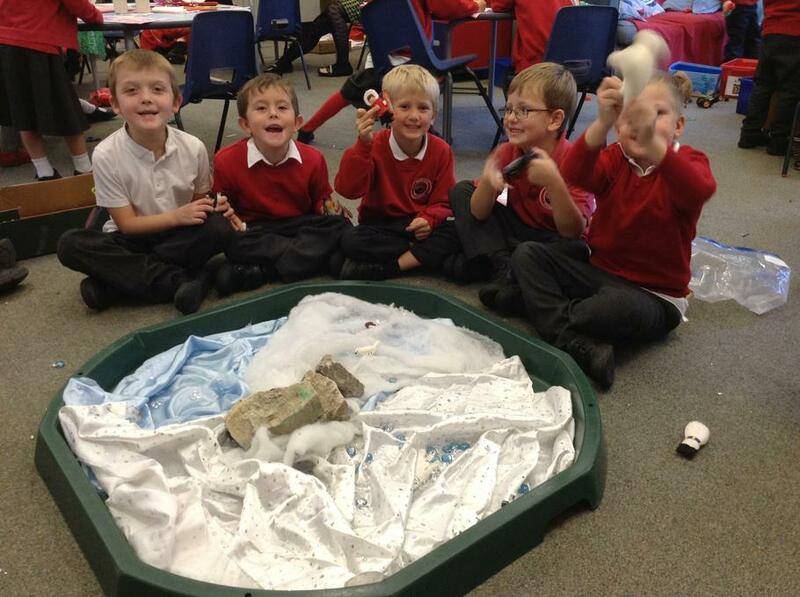 Lawrence Oates (our local hero), Edward Wilson, Henry 'Birdie' Bowers and Edgar Evans. 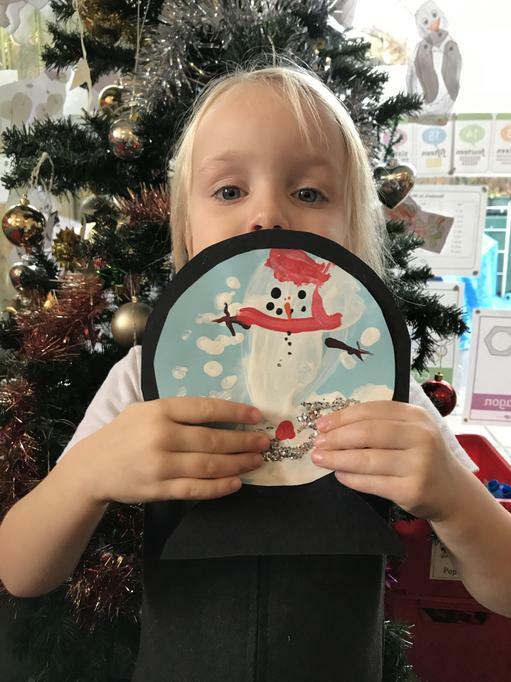 Today we went on a Polar Expedition of our own! 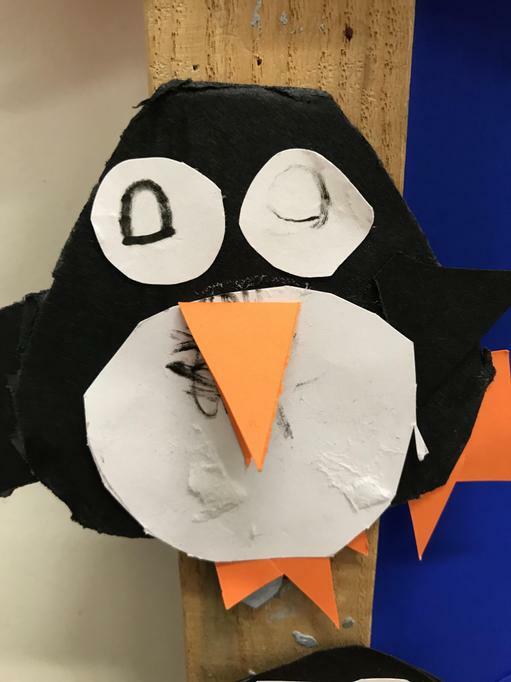 After days of careful planning, we were confident that we could be the first ever explorers to reach the southern-most point of the Earth: the South Pole. 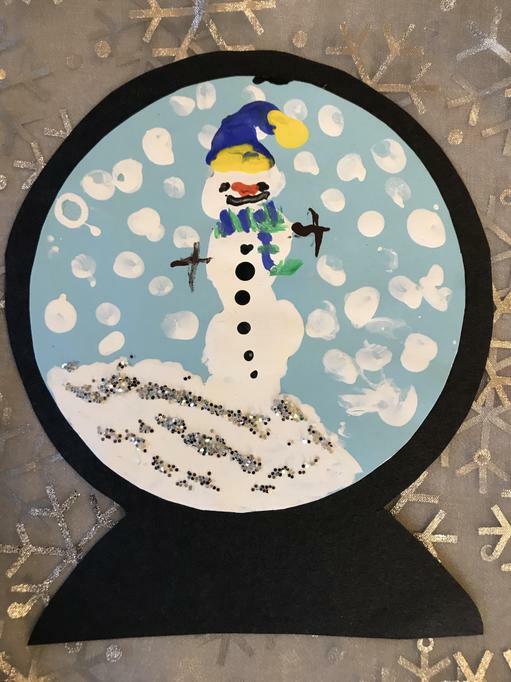 After days of adverse weather conditions, we were ready to depart. 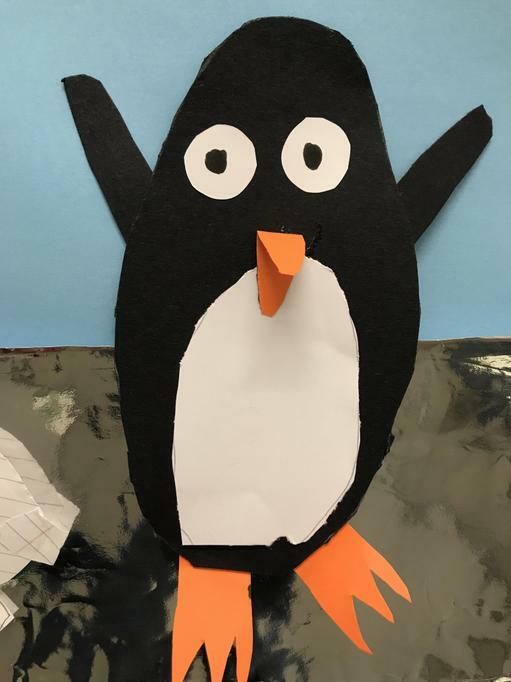 We were full of optimism as we set off from the Ross Ice Shelf on our incredible journey: our provisions were packed, our plans all complete… we KNEW we could work together and achieve our aim of conquering the South Pole. 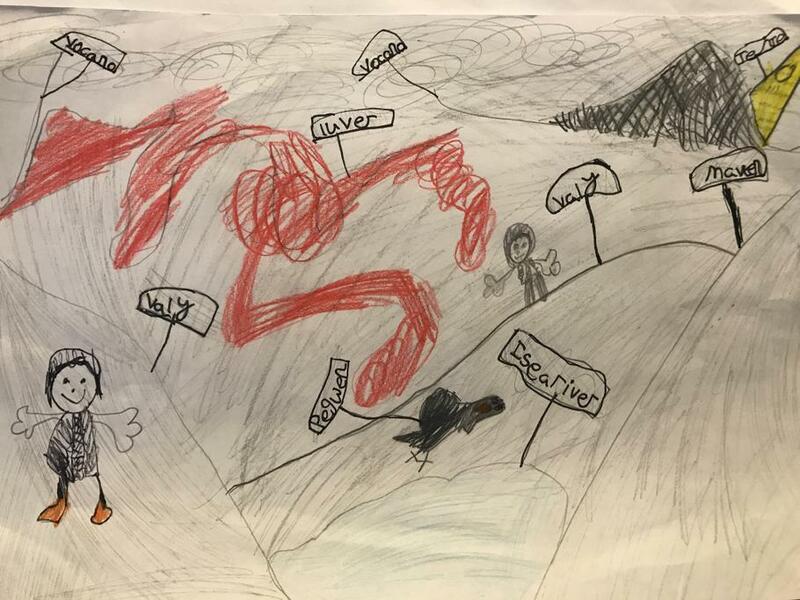 Next we were faced by the Beardsmore Glacier: It was terribly difficult to cross, and many of us nearly fell down crevasses several metres deep, and were only saved by the bravery of our team-mates. 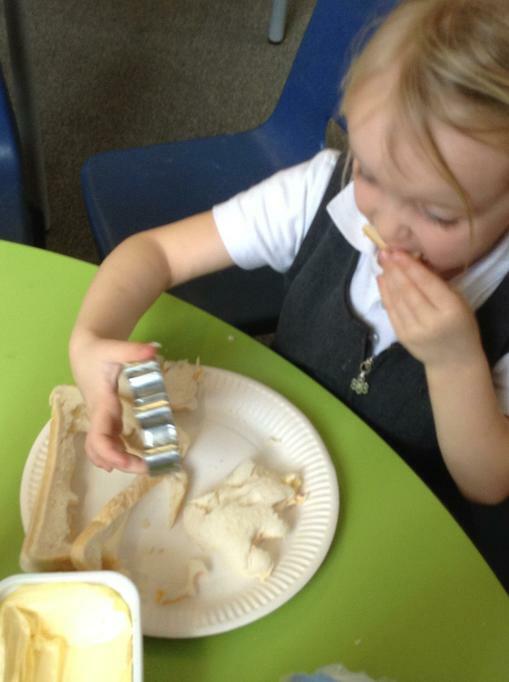 Then disaster struck!! 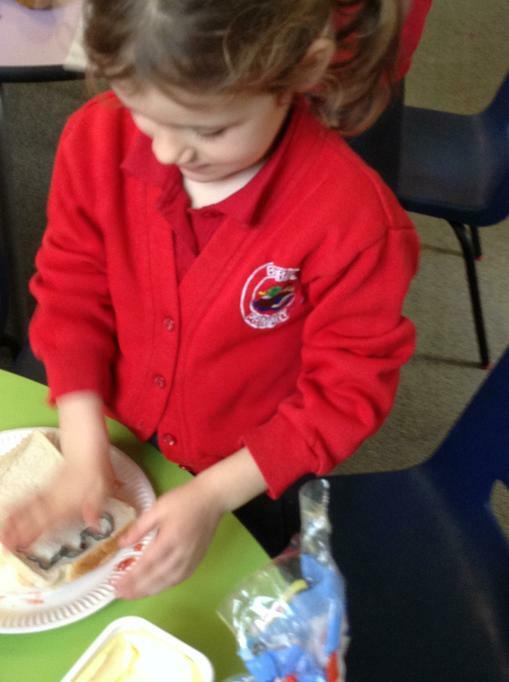 We realised that we had lost a ration of food, and someone might perish through lack of food. 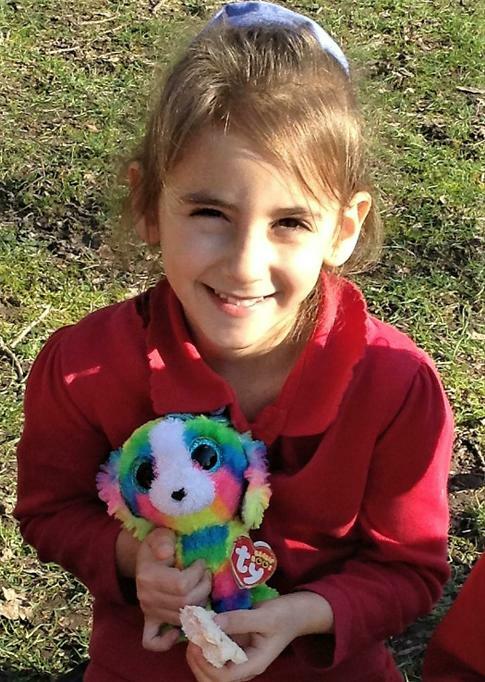 Mika was INCREDIBLY brave and headed off into the snow to find it, urged on by all the teams. 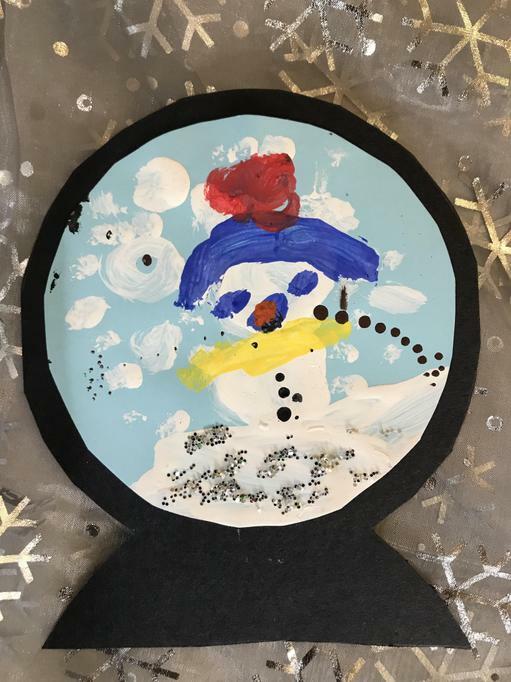 We set off again: this time we had to face the polar ice cap—300 miles of barren snow and ice. 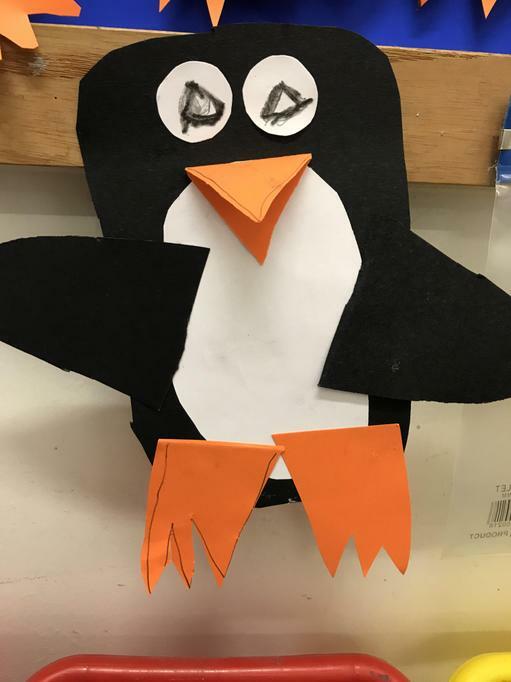 The terrain was harsh and unforgiving, and we were battered by the endless Antarctic winds. 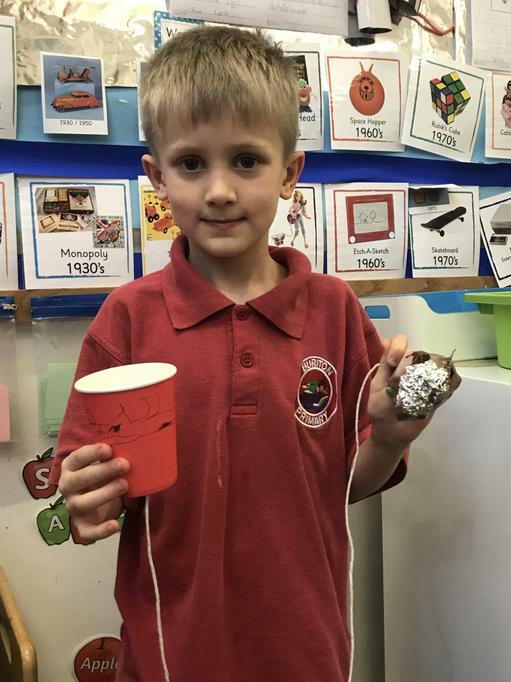 We remembered, though, to leave rations at carefully-placed food depots, to sustain us on our return journey, Like Scott, we had biscuits and raisins amongst our provisions. 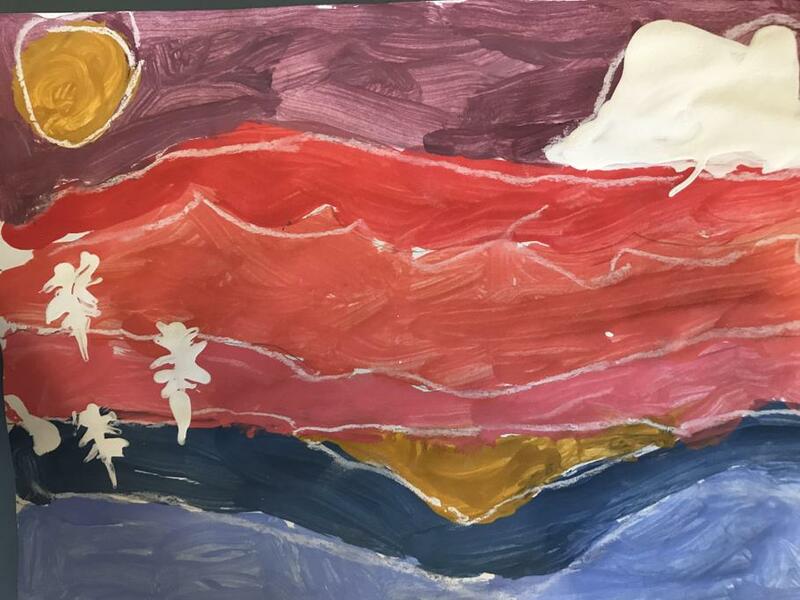 As we neared the South Pole, we saw a tent, and a flag: this is the moment we realised that we had been beaten to the South Pole, and that this was not the Union Flag, but the flag of the Norwegians. 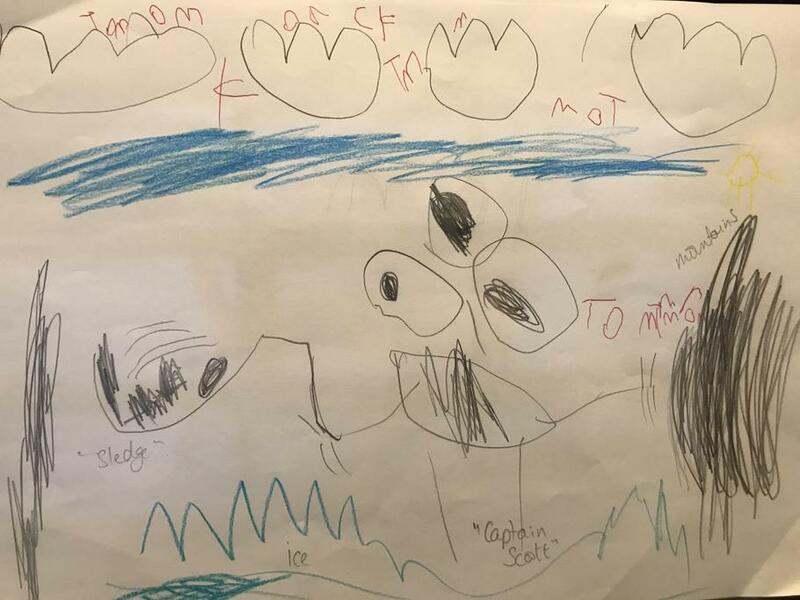 They had left a letter, which Elodie read for us: “Dear Captain Scott, we got here first.” It was signed Roald Amundsen. 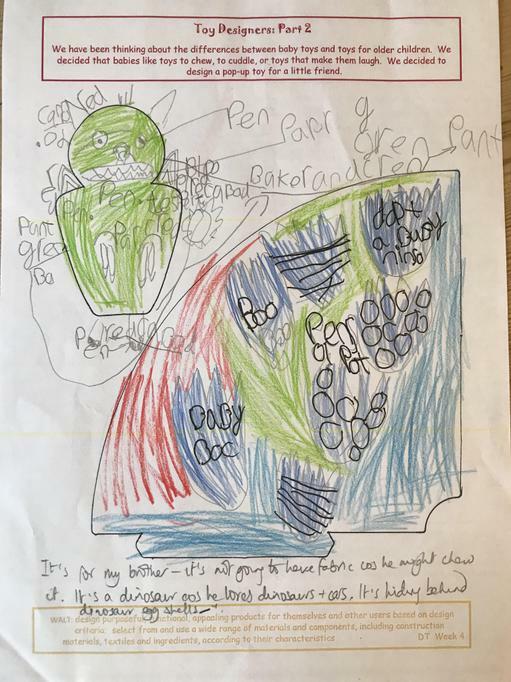 At this point, even our equipment began to fail: our camera ran out of batteries, we were exhausted and frost-bitten, we had no choice but to sadly turn and trudge off on our 800-mile return journey. 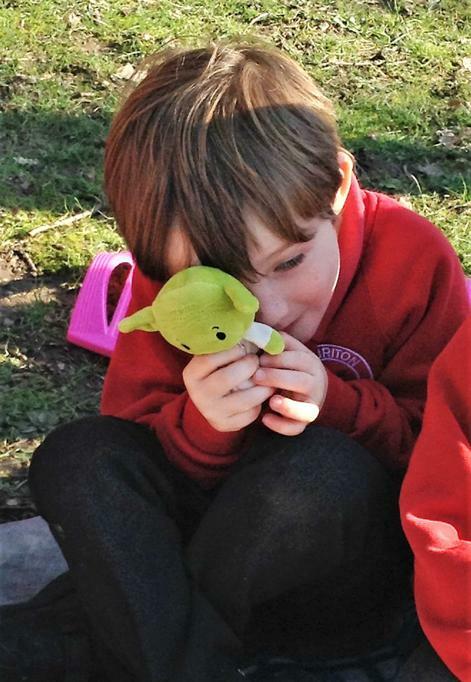 We were disheartened, but the teams supported and comforted one another brilliantly, and constantly encouraged each other to keep battling on. 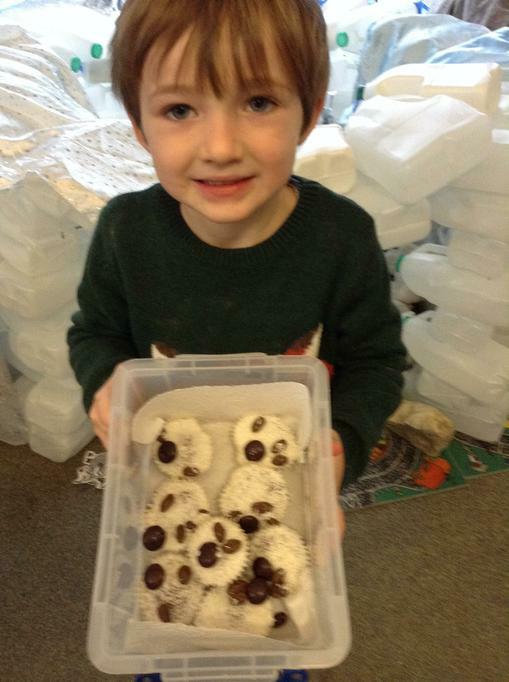 I am happy to report that we made it to our raisin food depot, where we stopped to refuel and rest our weary feet, and we even reached our biscuit depot: we conserved these rations until we finally made it back to Base Camp, exhausted, but alive. 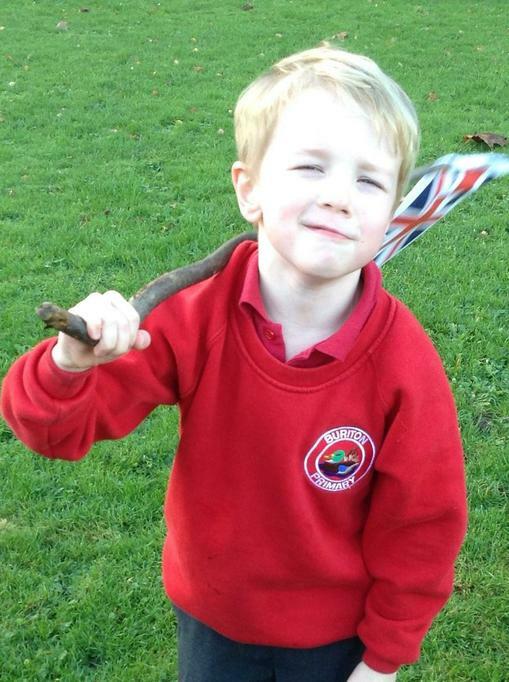 We had conquered the Pole, and even though we weren’t the first, our bravery and heroism will make us famous for ever. 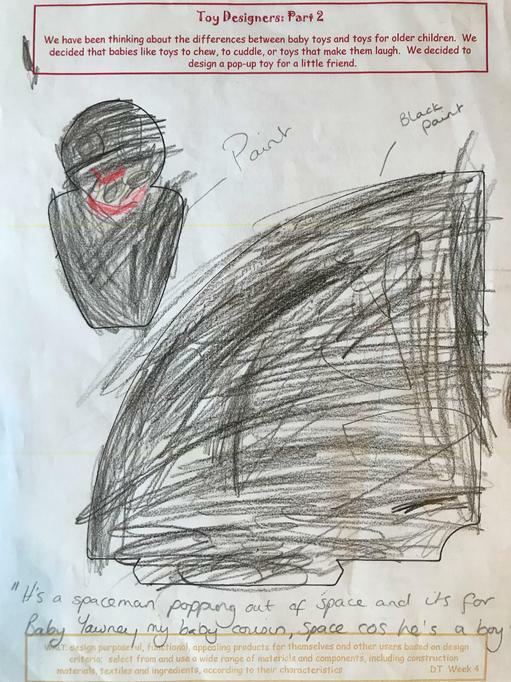 When we got back, we found out what happened to Captain Scott and his team . 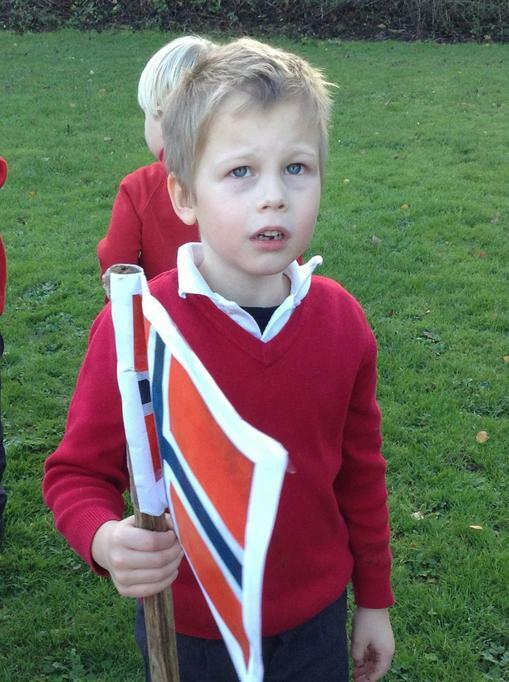 . .
but they too had been beaten in their race, by a team led by Norwegian Roald Amundsen. 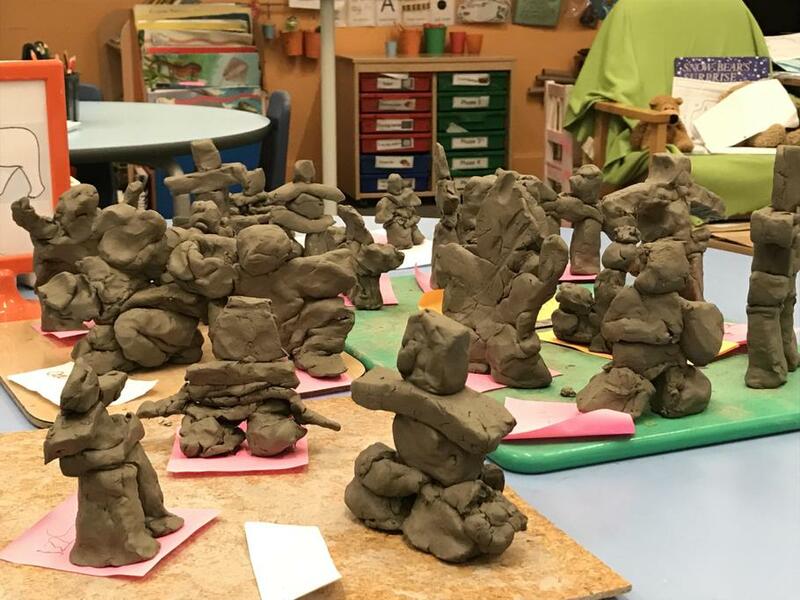 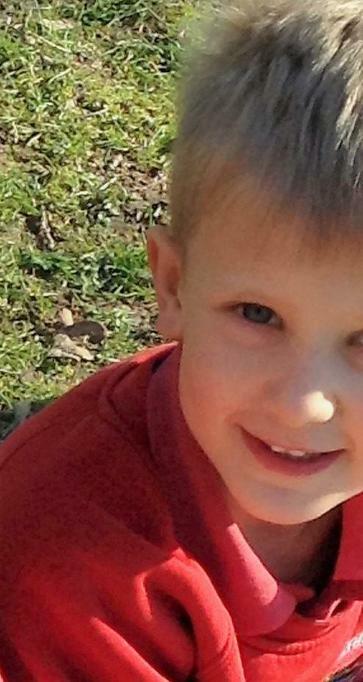 Sadly, Captain Scott and his team died before they could make it back to their Base Camp. 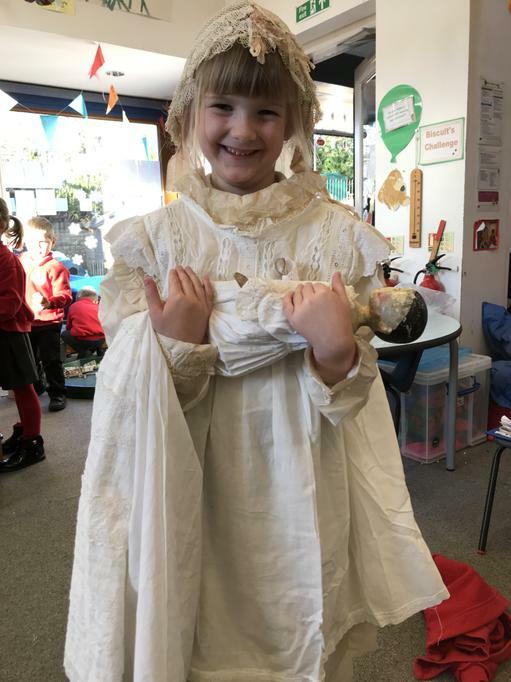 Scott and Amundsen are still remembered today for their historic achievements. 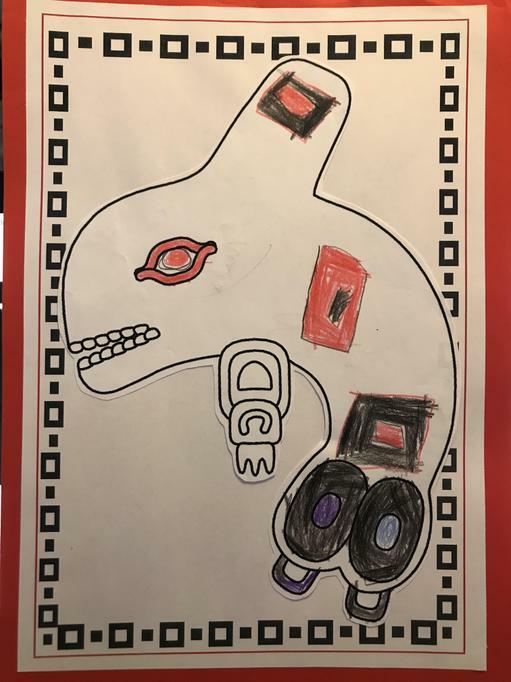 Week 4. 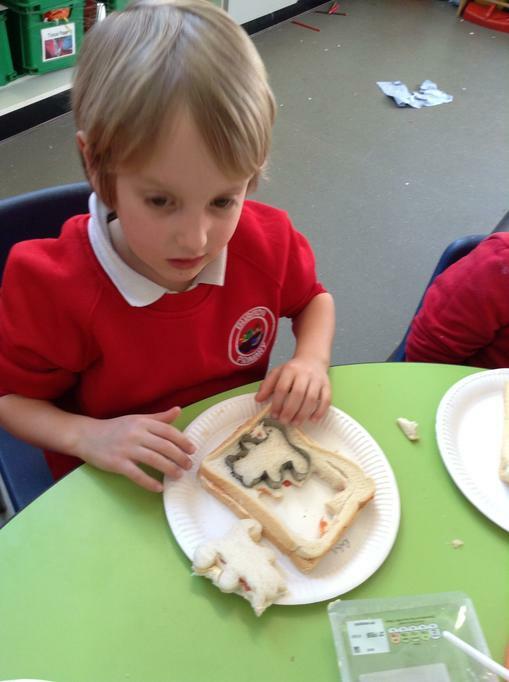 This week we have been focusing on the bodies of our Polar Animals. 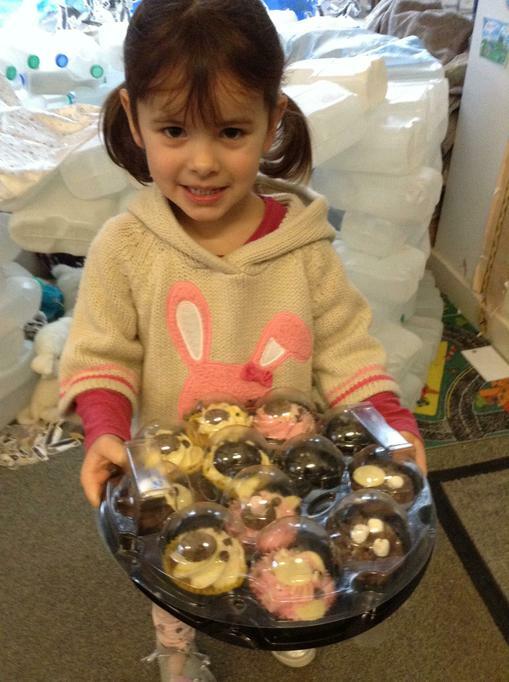 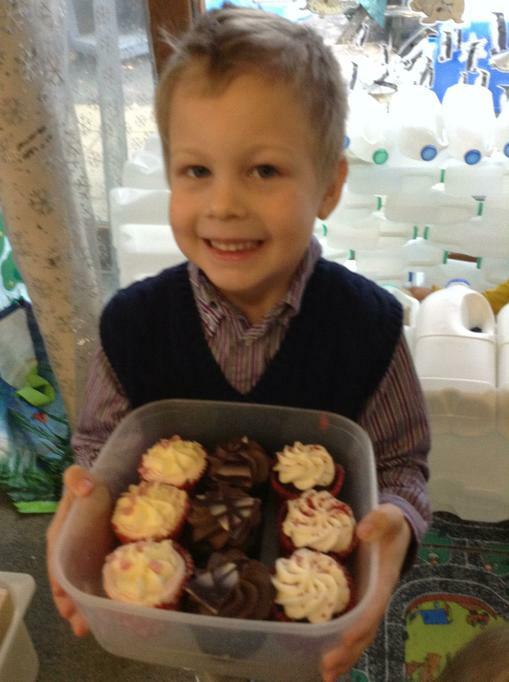 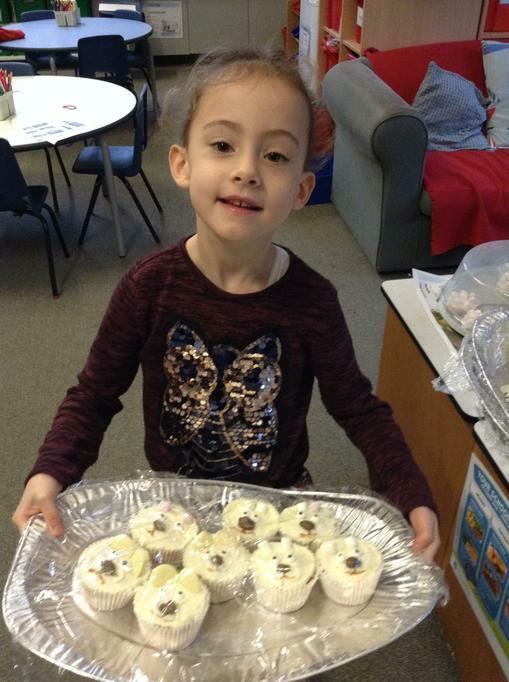 We held a very successful cake sale and raised a huge £79.66!!!!!!!! 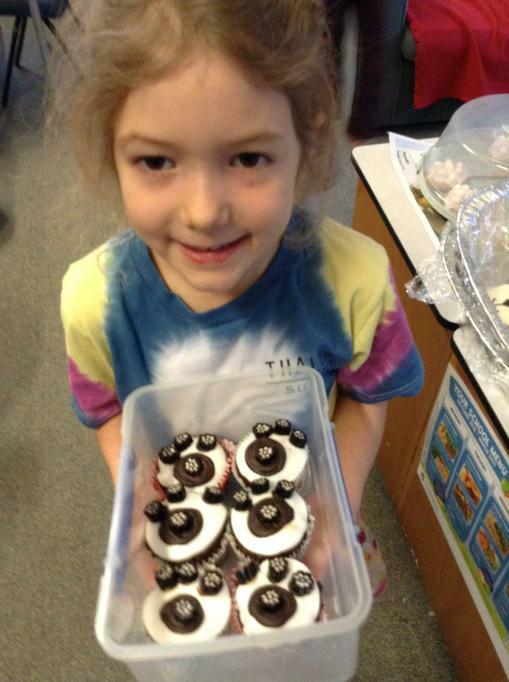 Thank you very much for all the baking and buying! 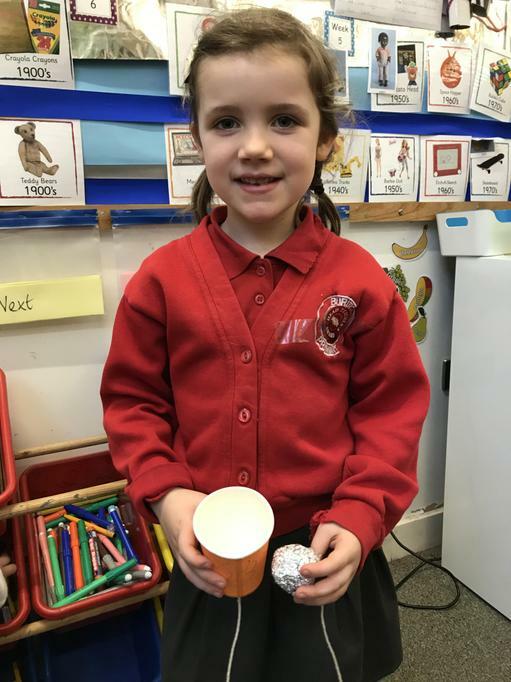 to keep warm, and making fires for cooking and heat. 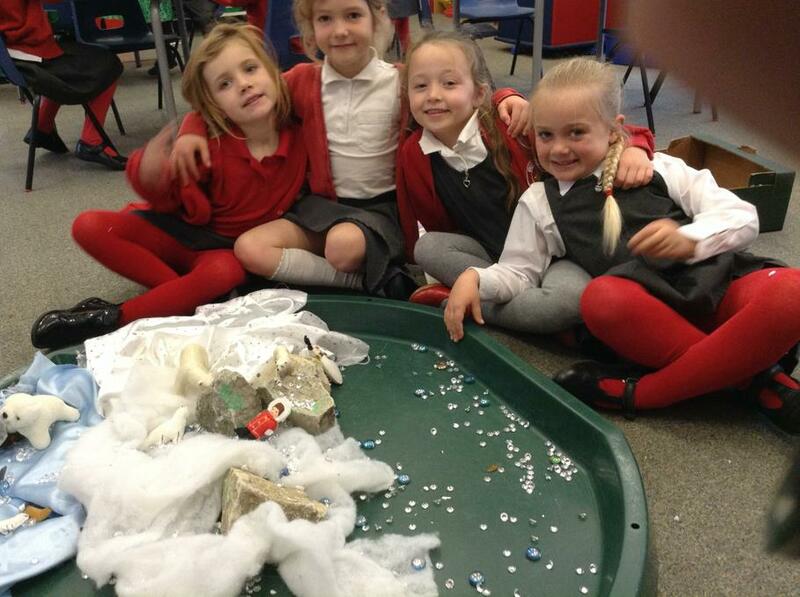 Please keep the milk-cartons coming - soon our igloo will have a roof too! 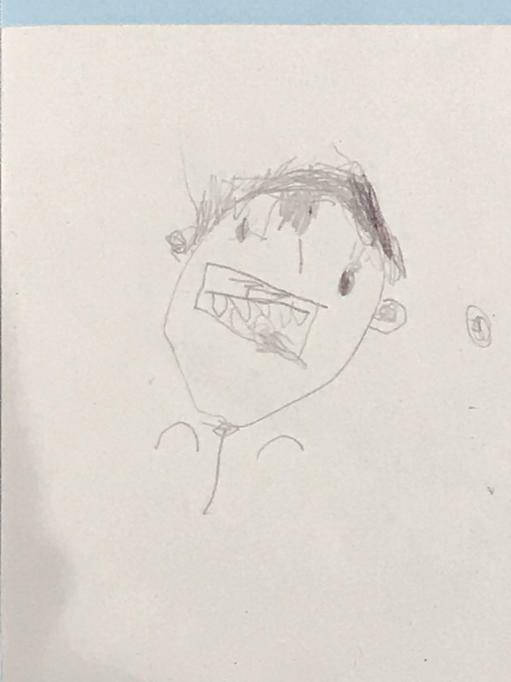 WEEK 3. 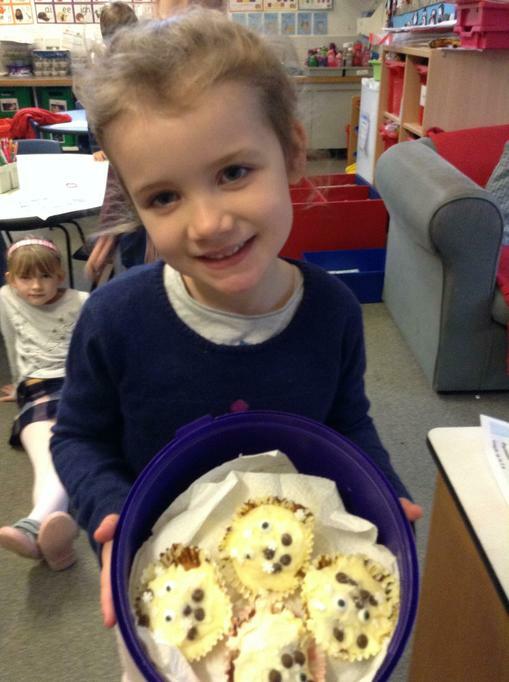 This week it's Polar Bear week! 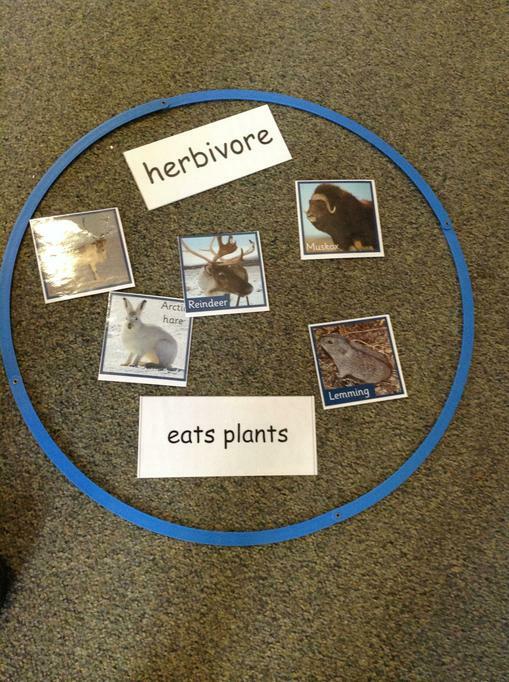 We've watched videos of these amazing creatures and learnt lots of facts about them. 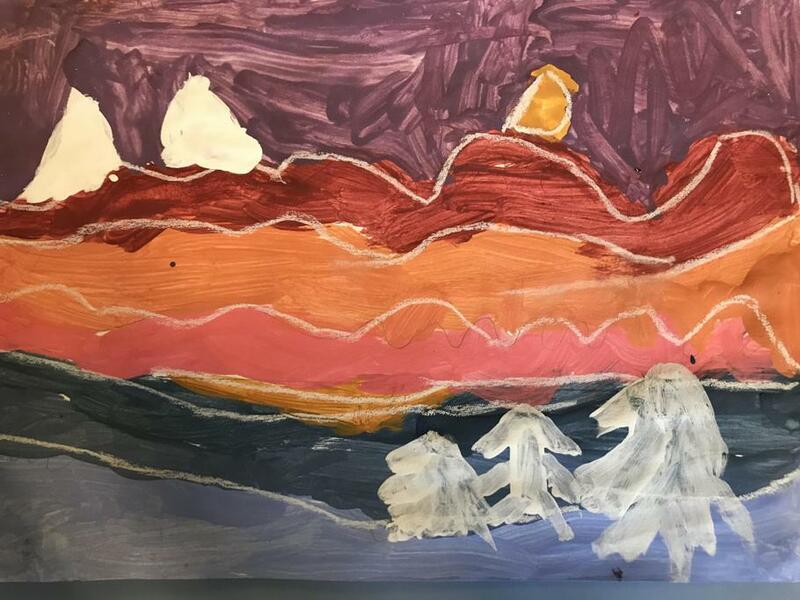 We tried to draw Polar Bears on the computer - we may have another go at this ;-) - and painted some beautiful observational artwork. 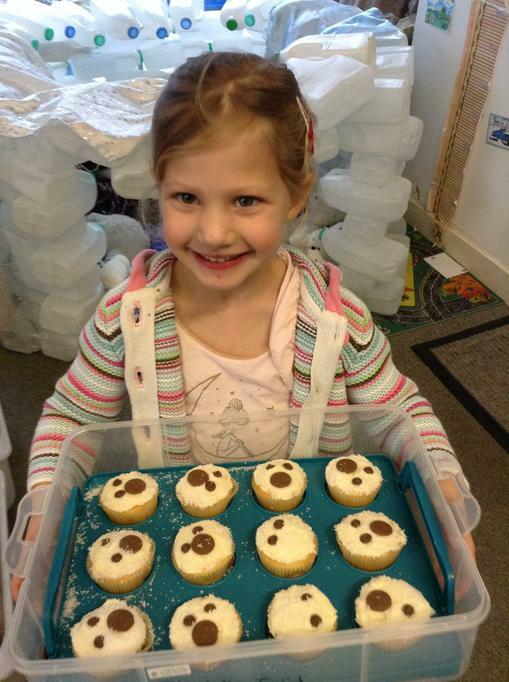 We were also invaded by split-pin Polar Bears! 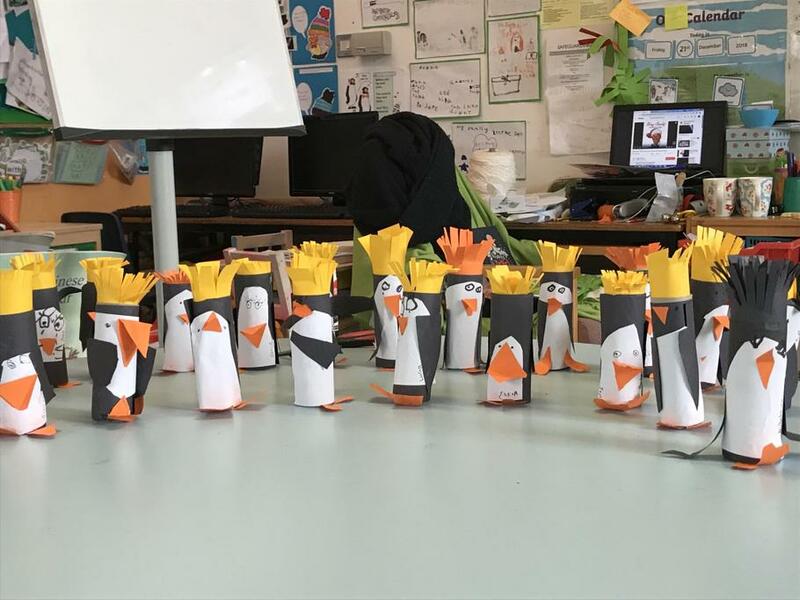 How many can you count? 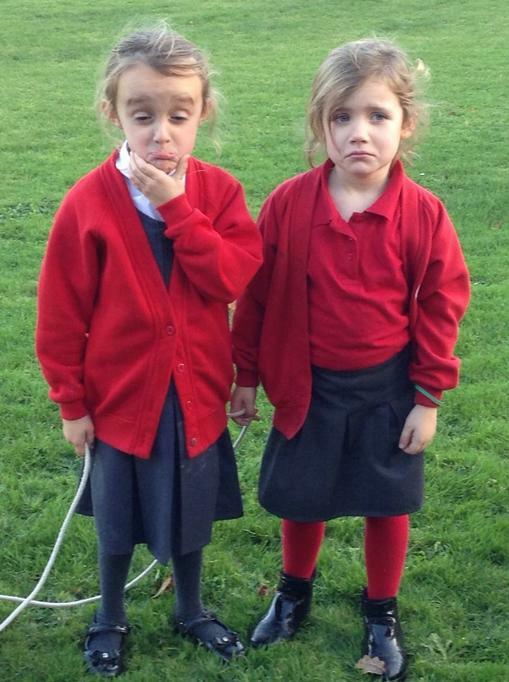 Friday 23rd November at 3:20pm. 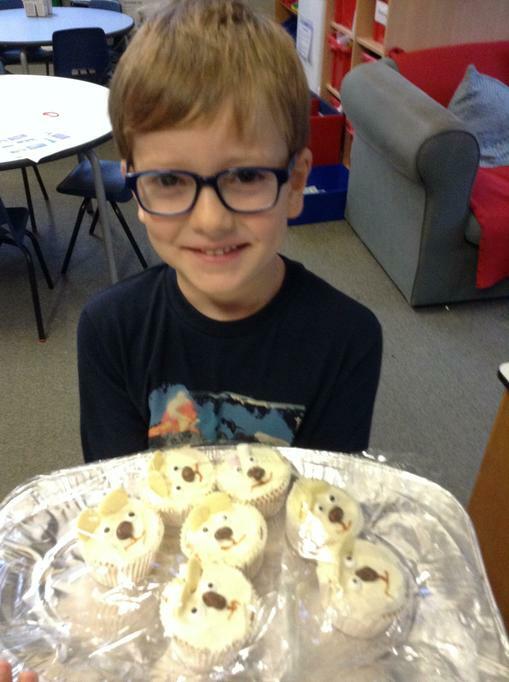 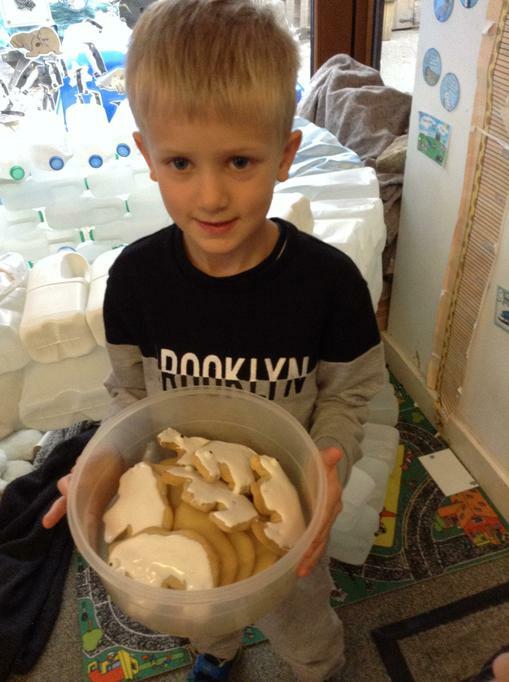 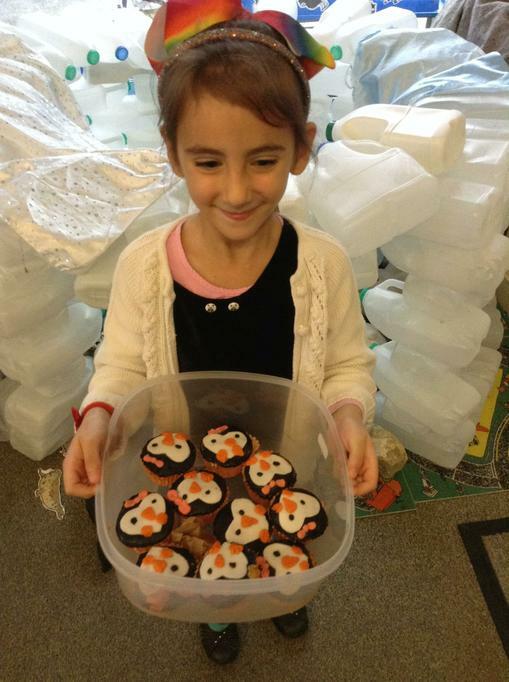 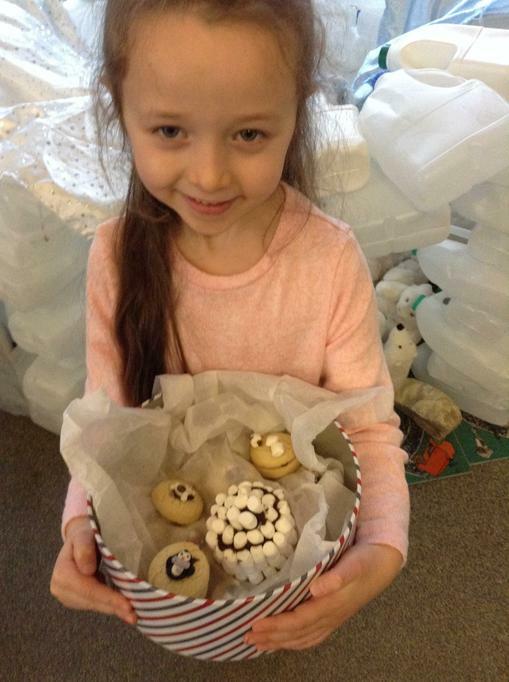 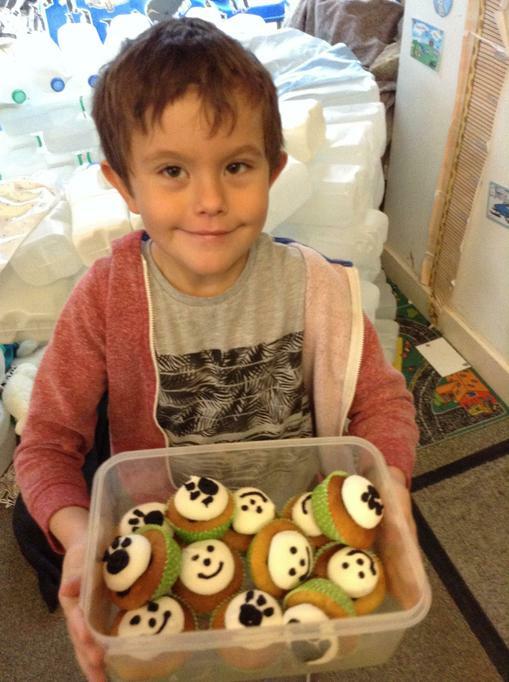 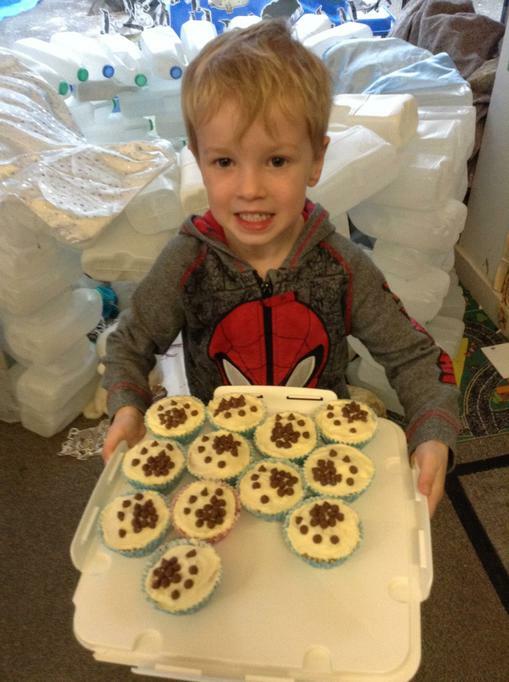 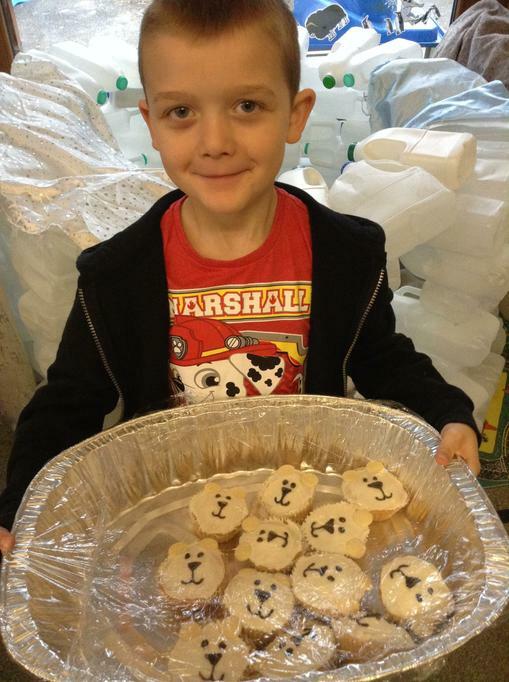 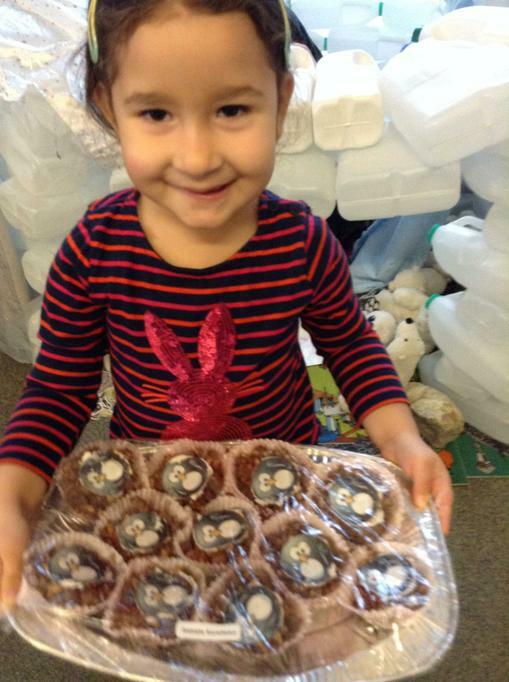 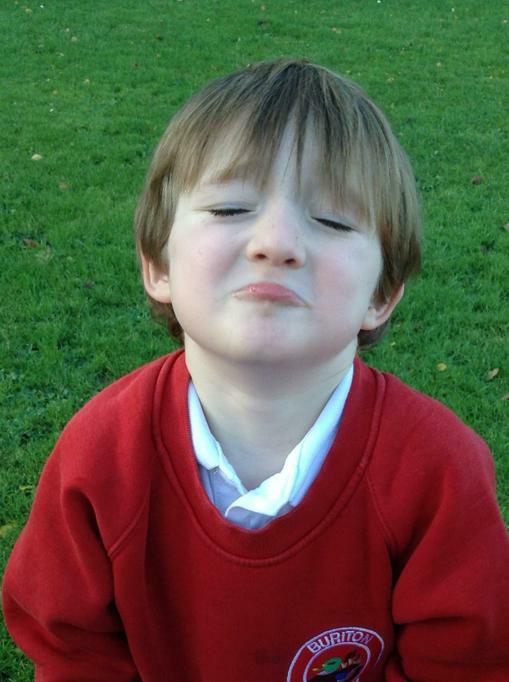 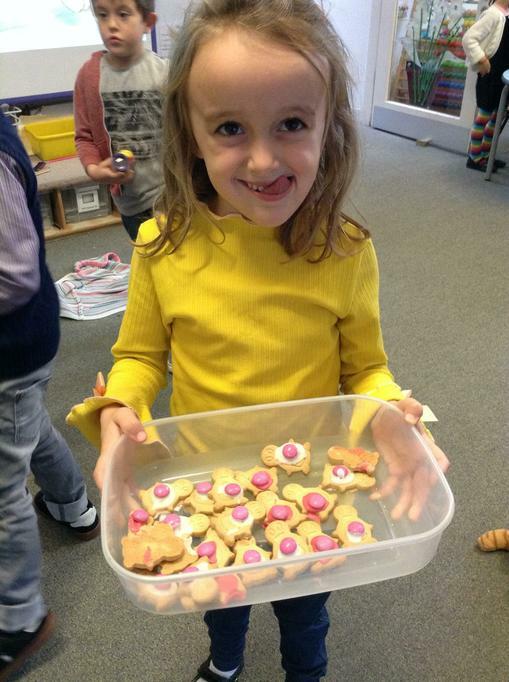 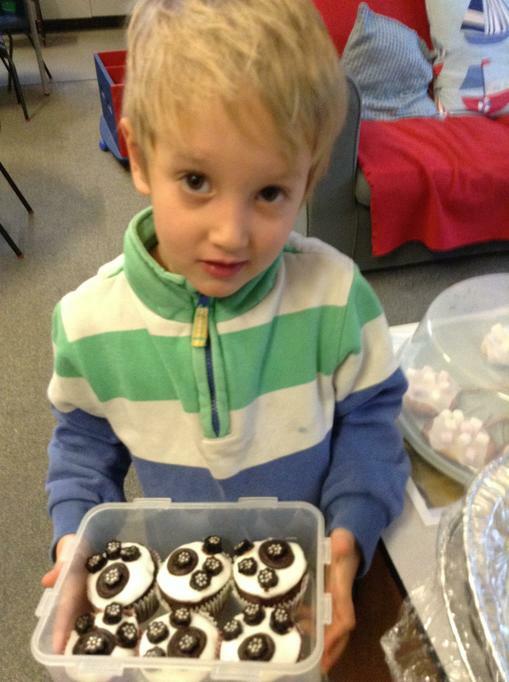 The children will be baking Polar-inspired cakes for their homework, so please support us! 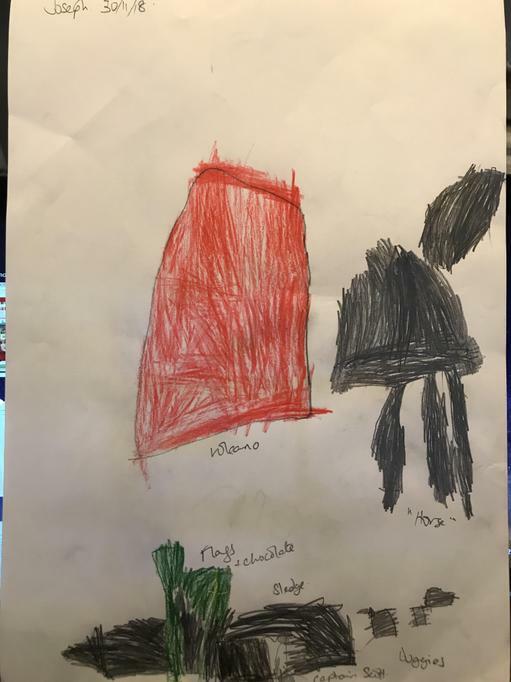 WEEK 2. 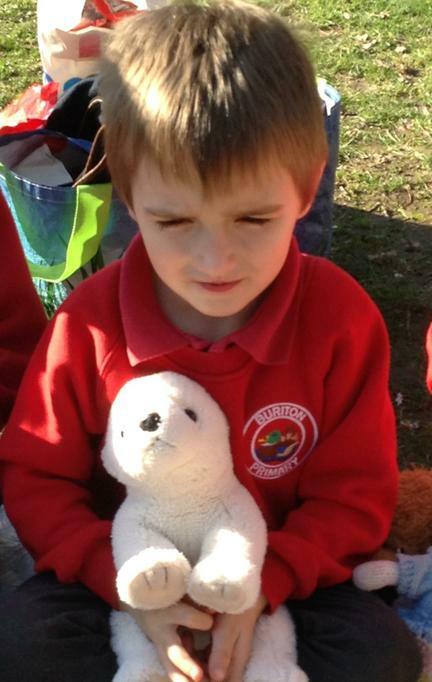 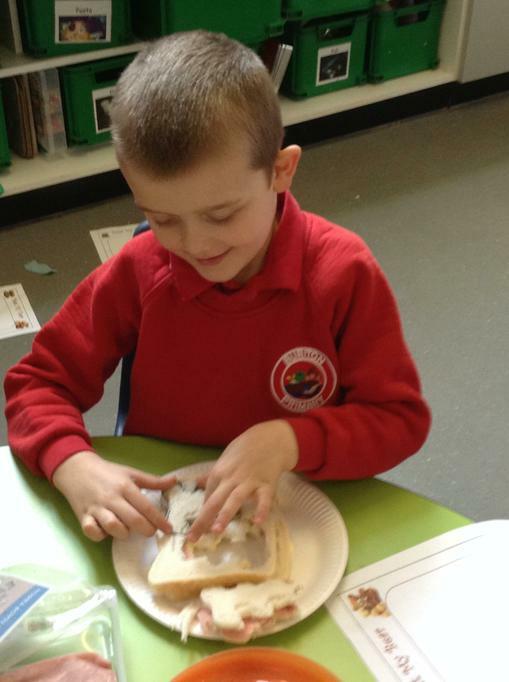 This week we have been learning about Polar Animals. 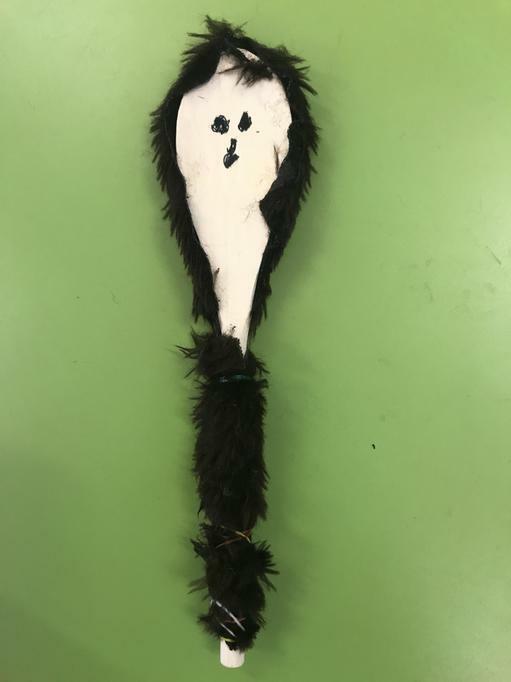 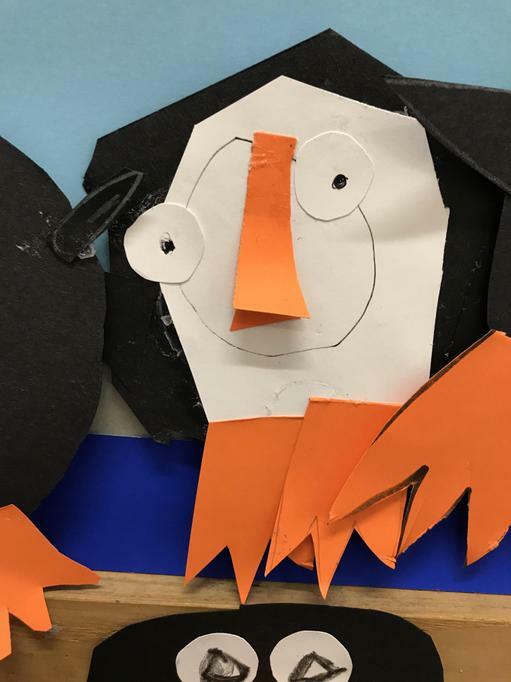 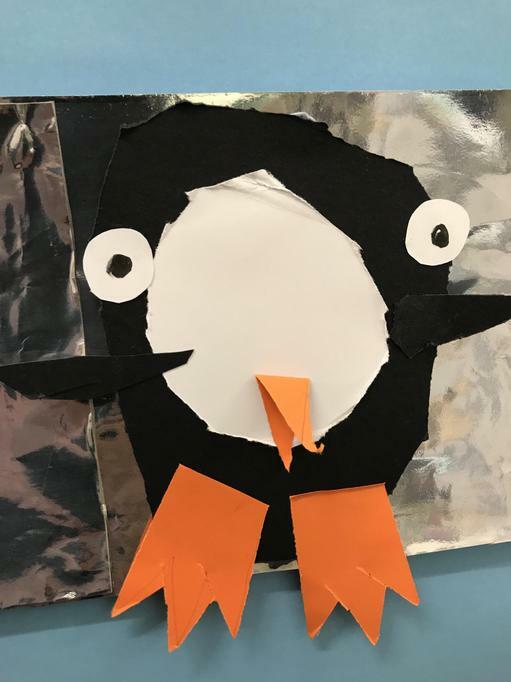 We have learnt a song about the North and South Poles (if you want to practice, here's the link: https://www.youtube.com/watch?v=QF01mBSB8rY - just control and click). 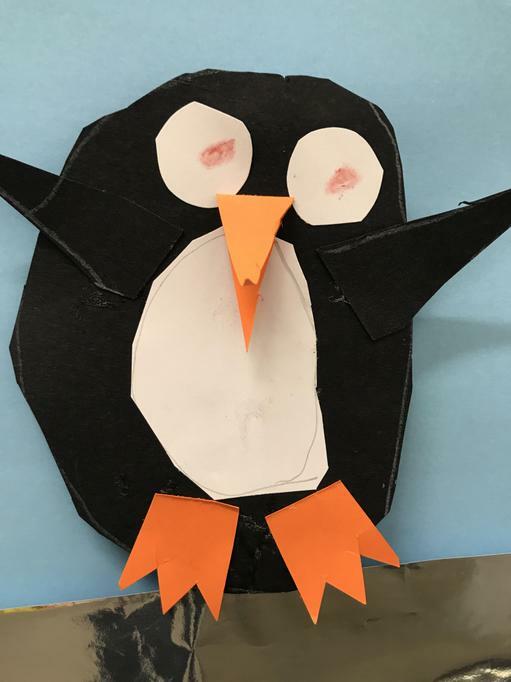 We have also sorted animals into Arctic and Antarctic creatures, and researched individual animals to write our Polar Animal Fact Files. 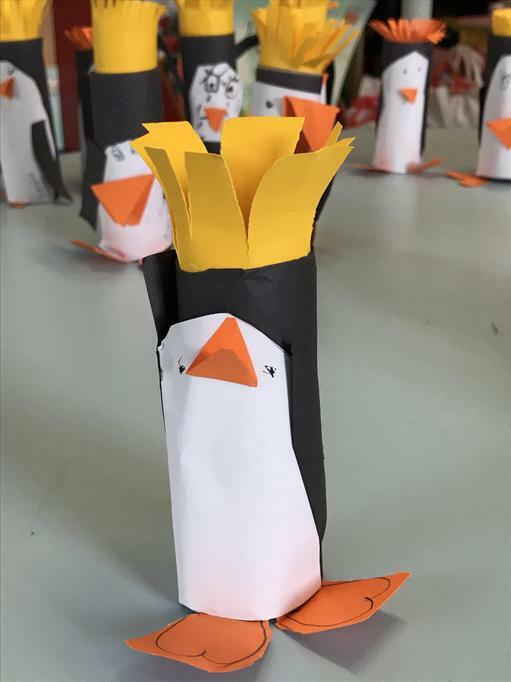 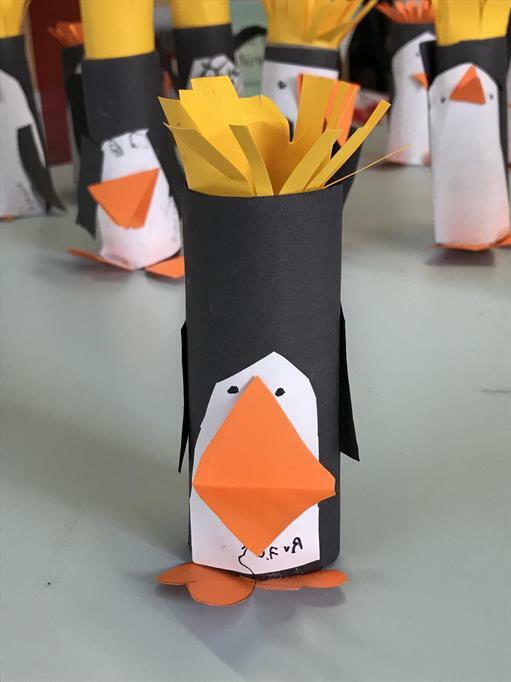 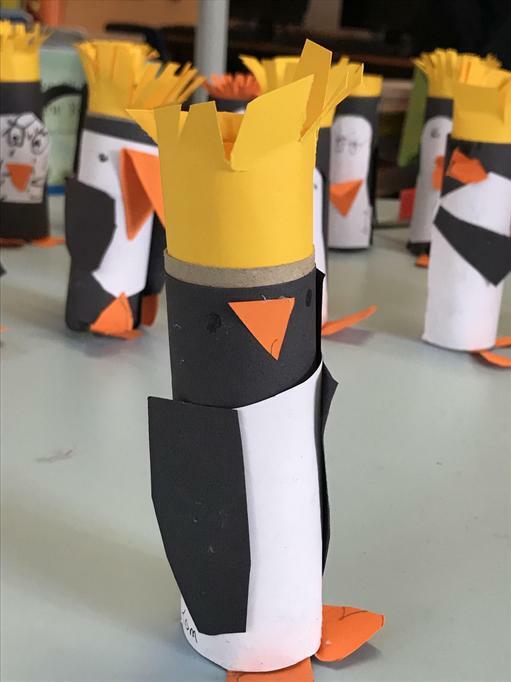 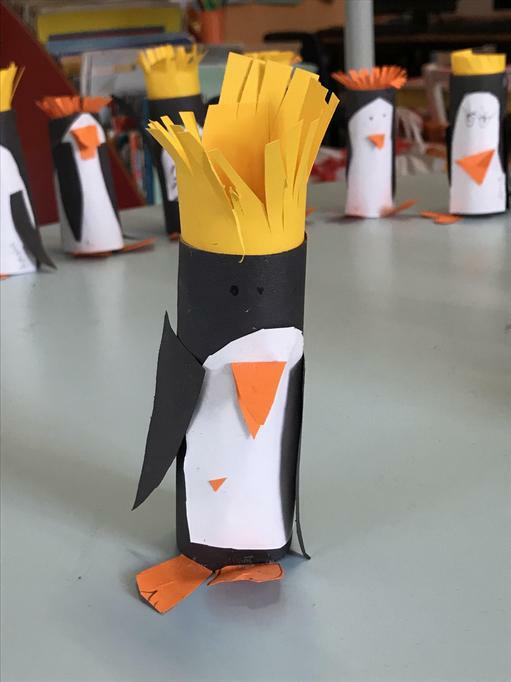 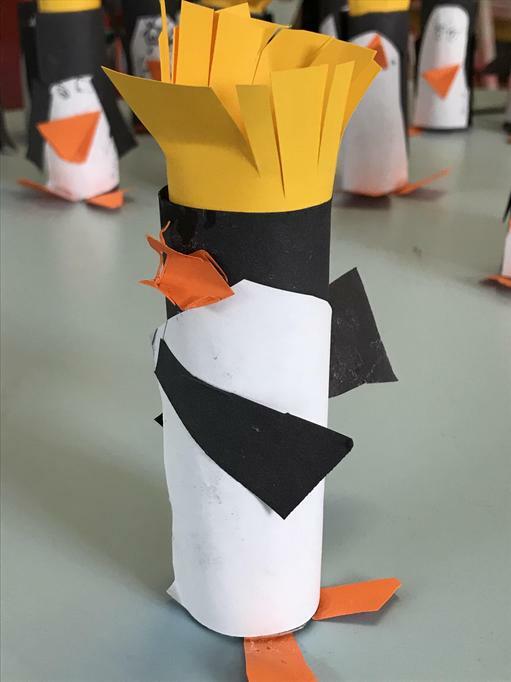 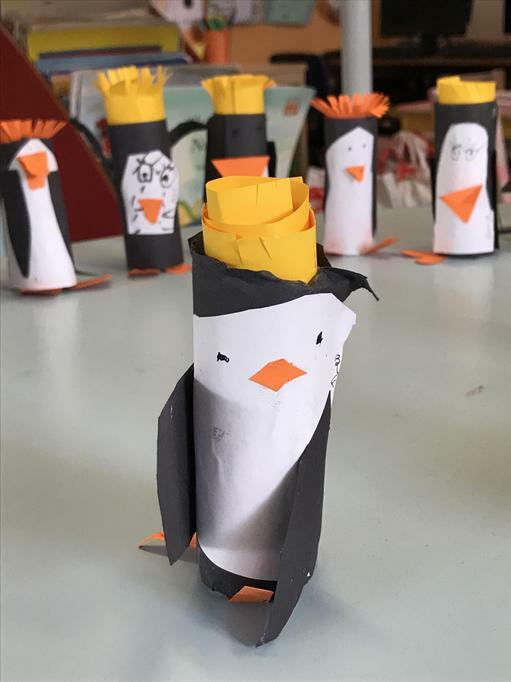 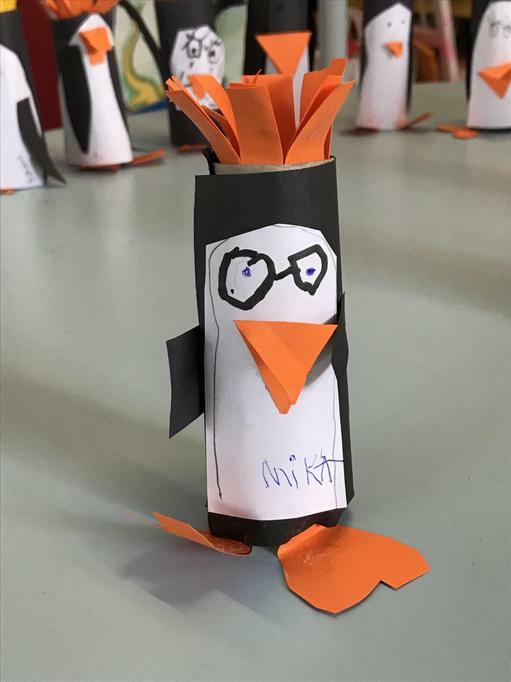 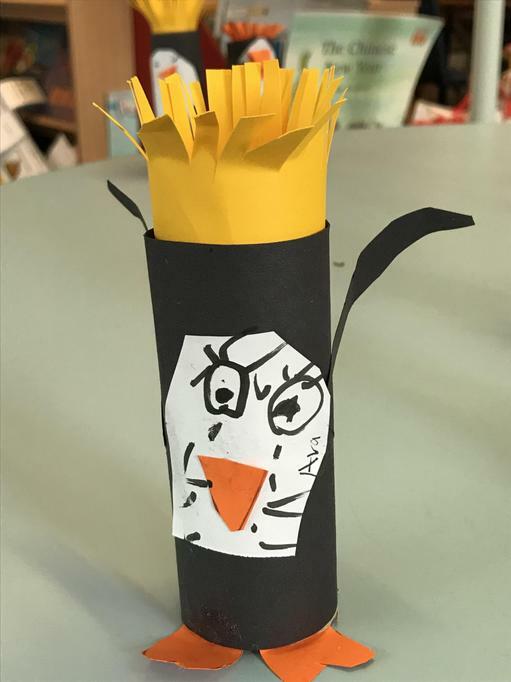 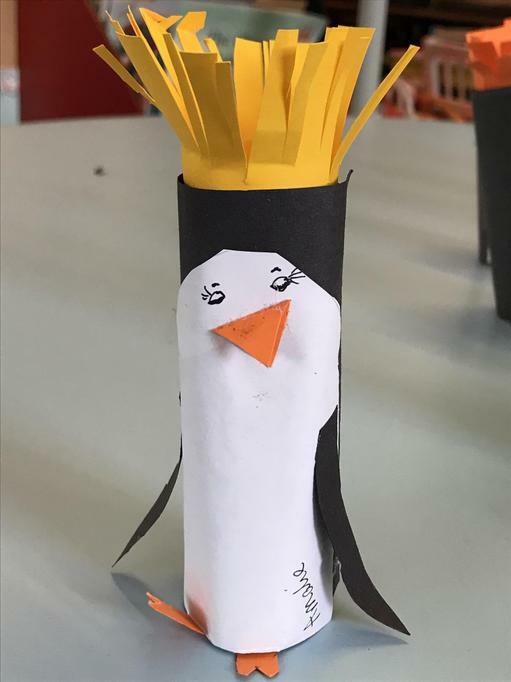 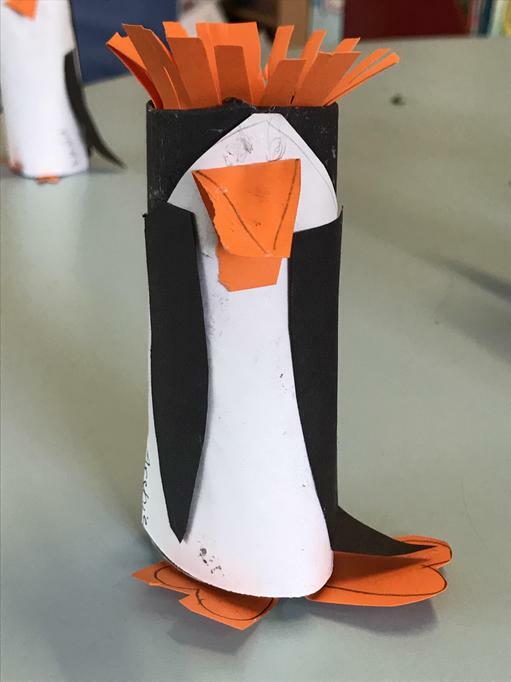 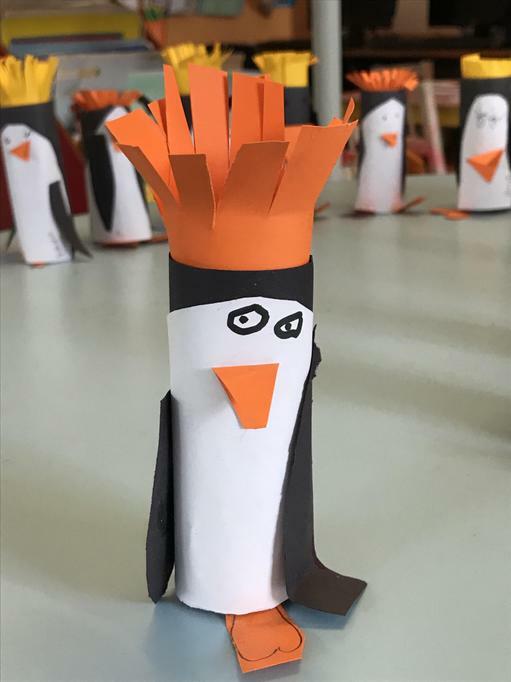 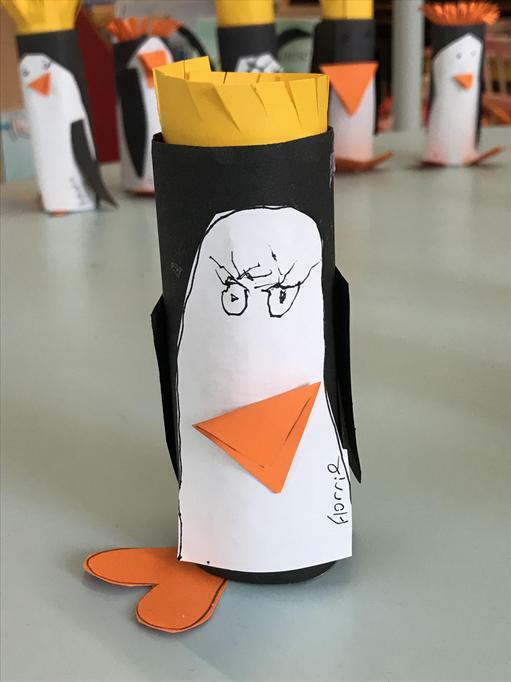 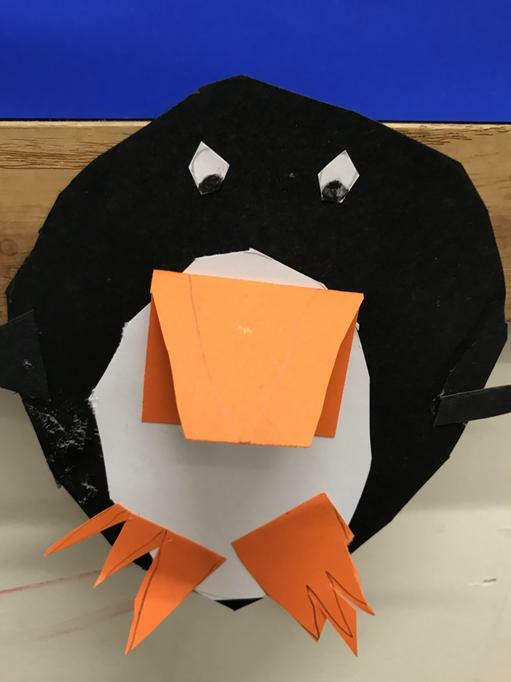 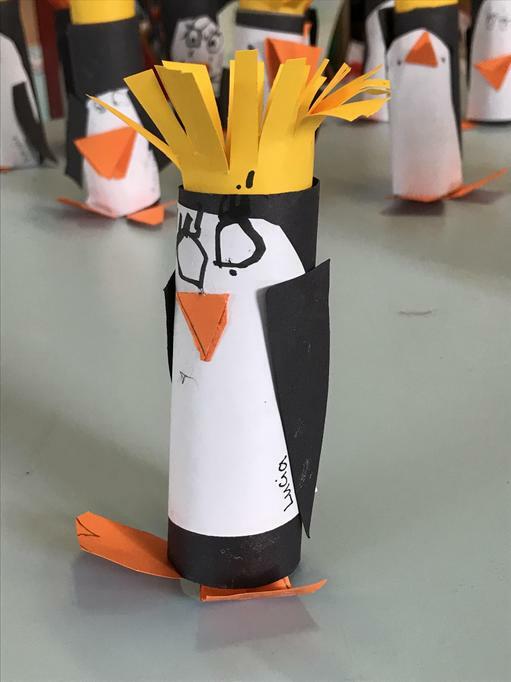 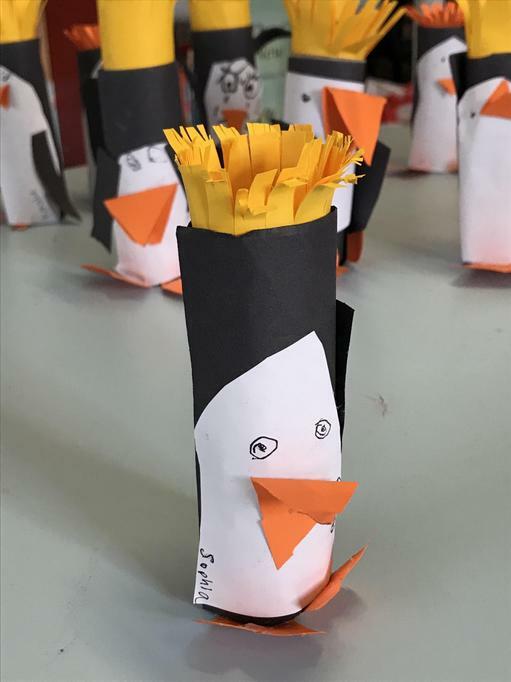 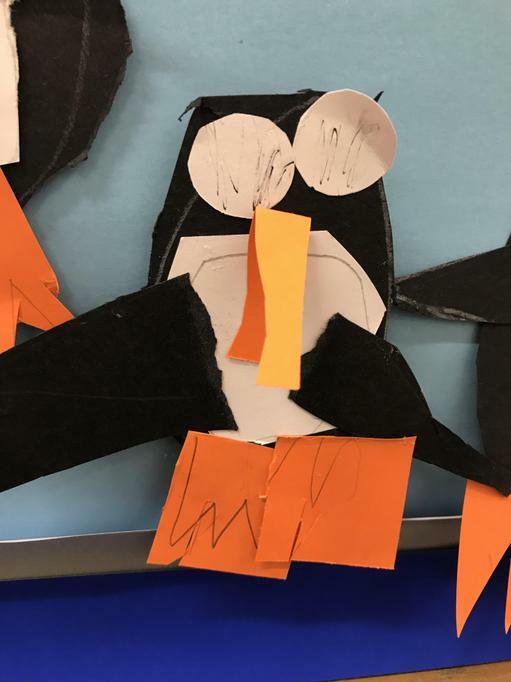 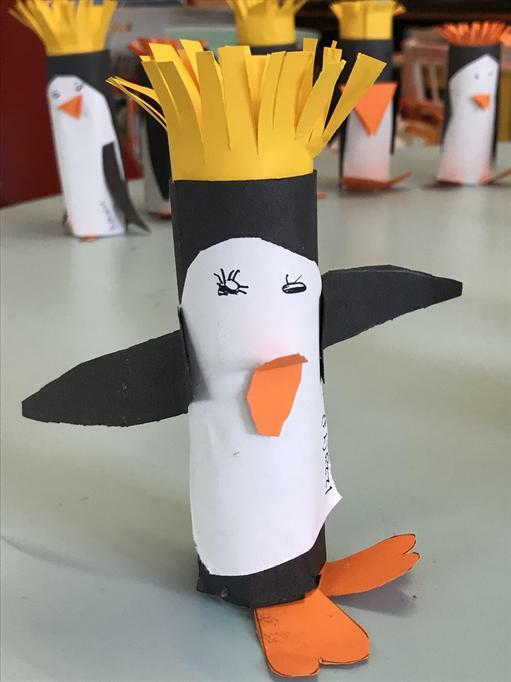 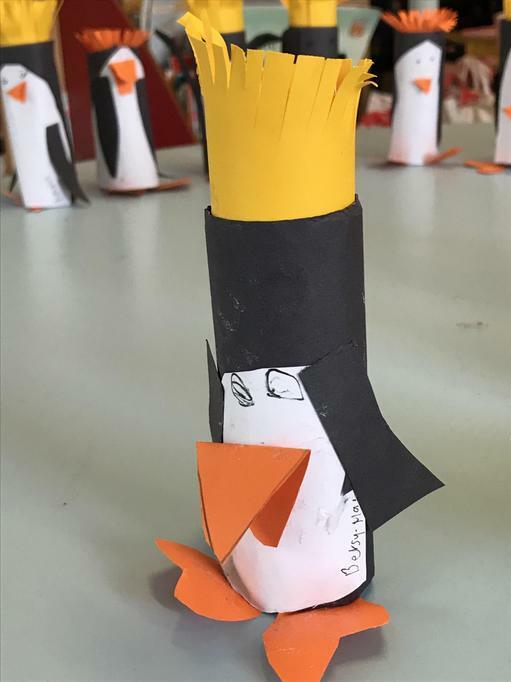 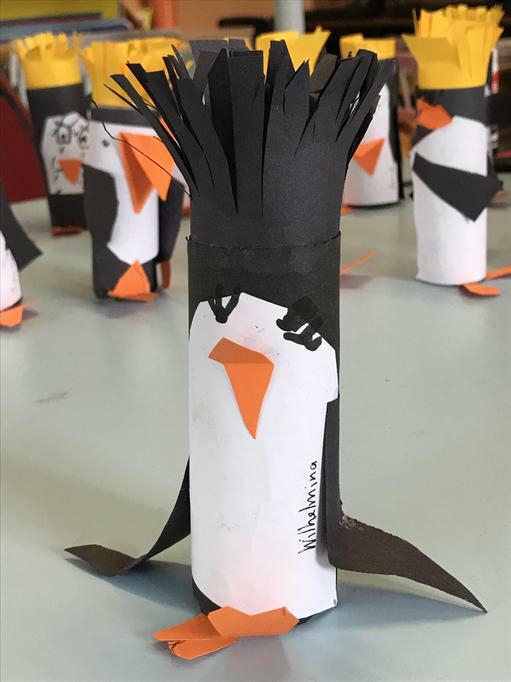 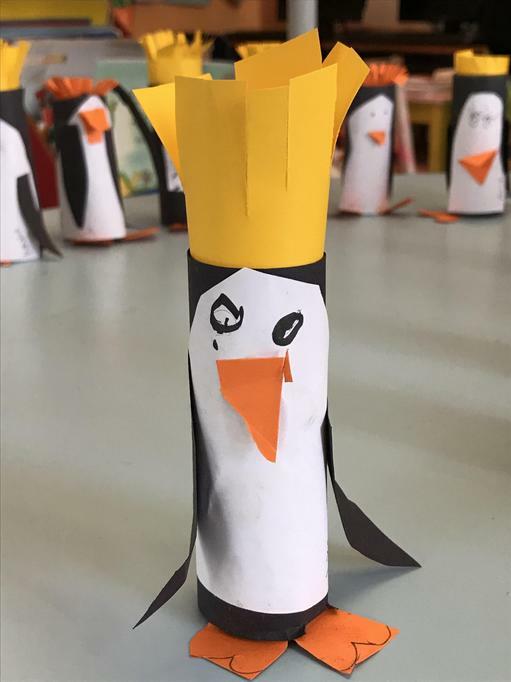 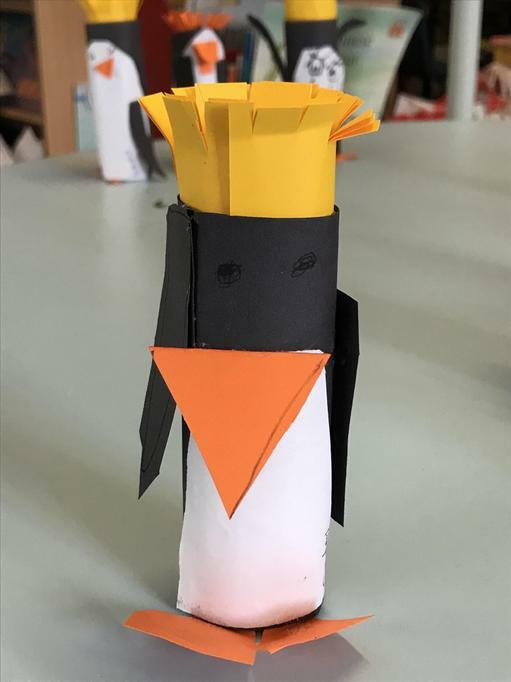 We've also worked really hard to make some very cheeky penguins! 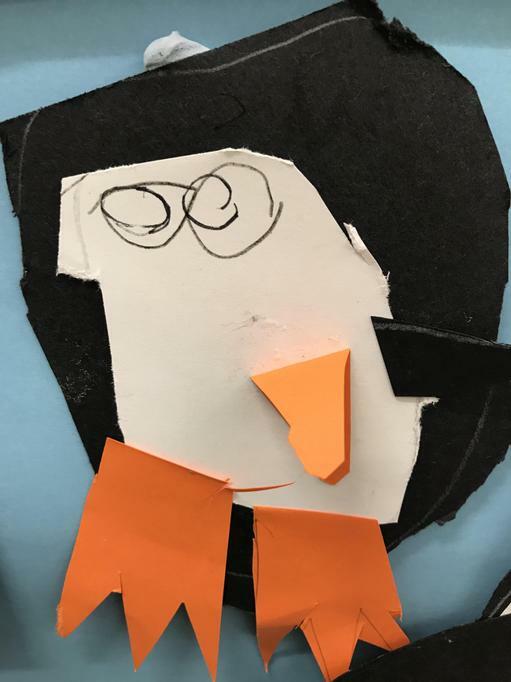 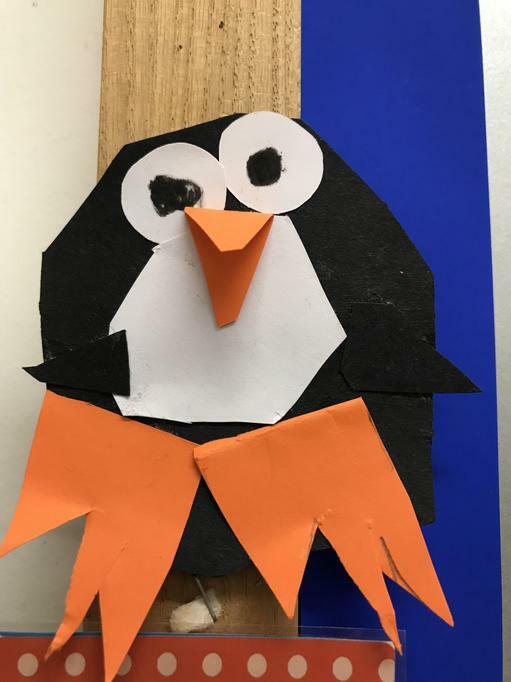 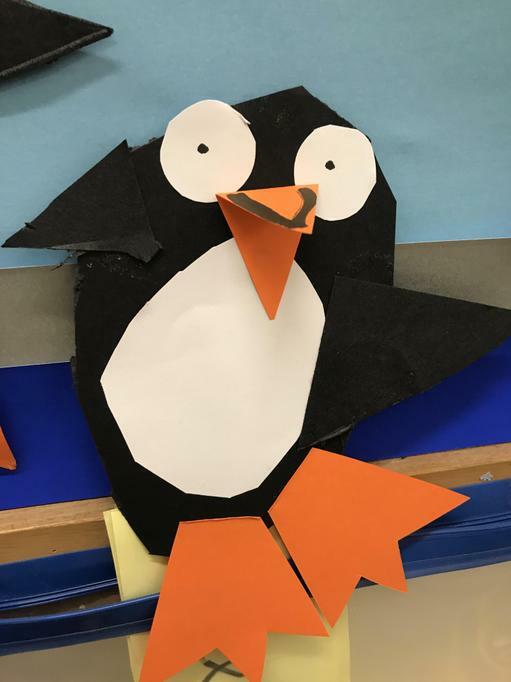 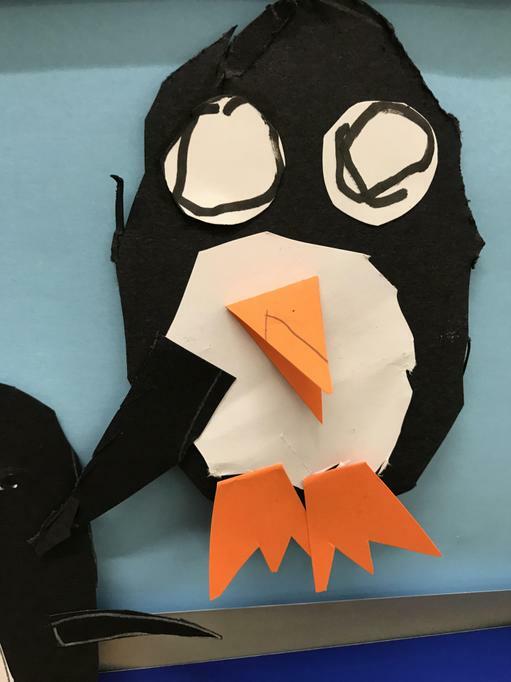 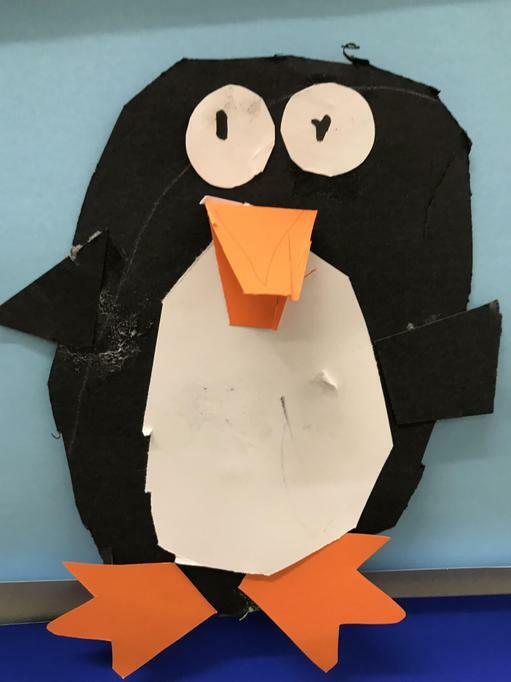 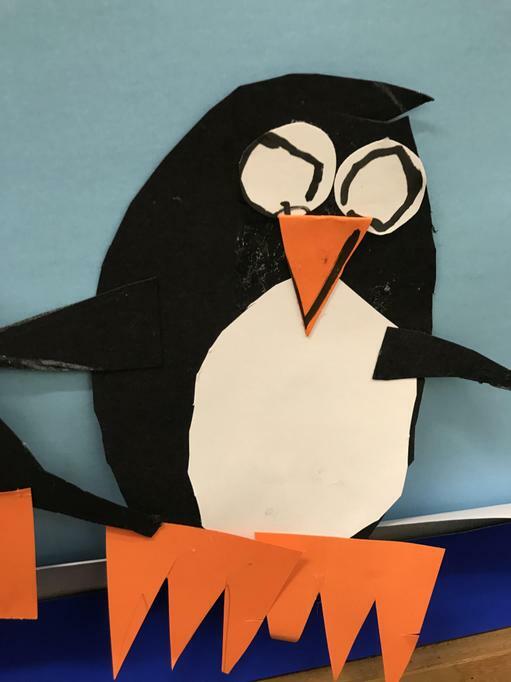 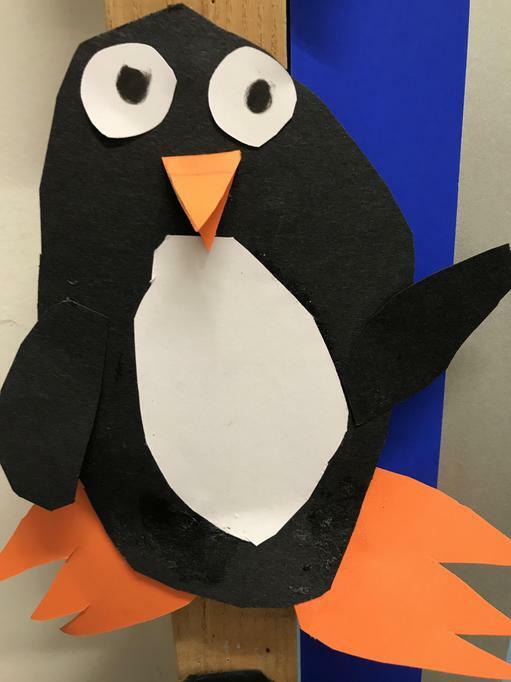 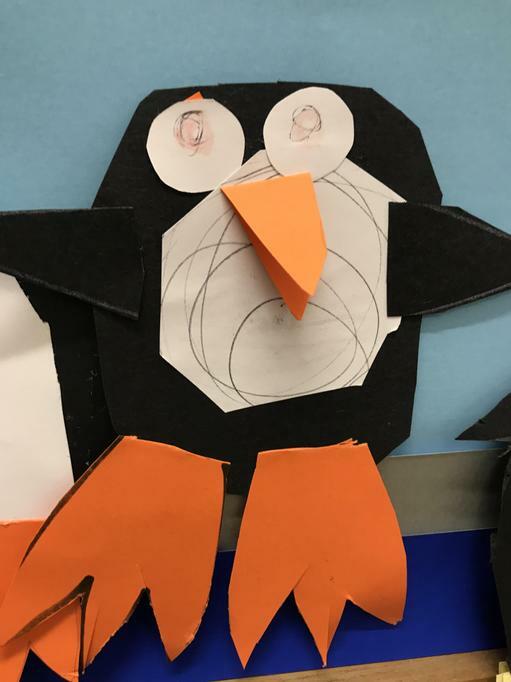 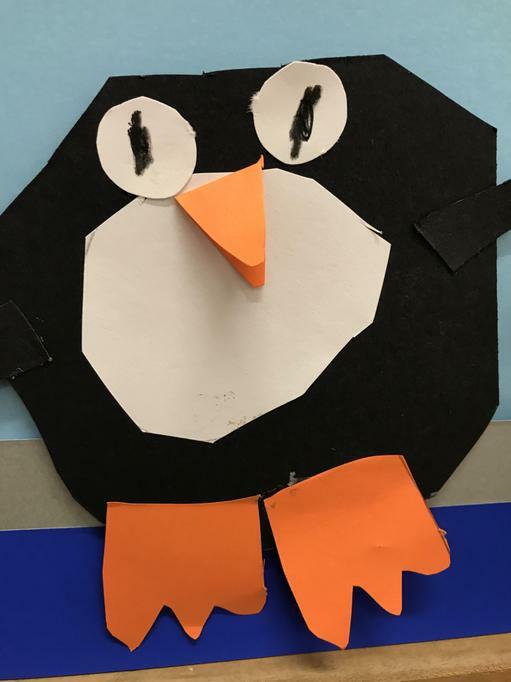 The Year Rs had a go at drawing a penguin on the computers! 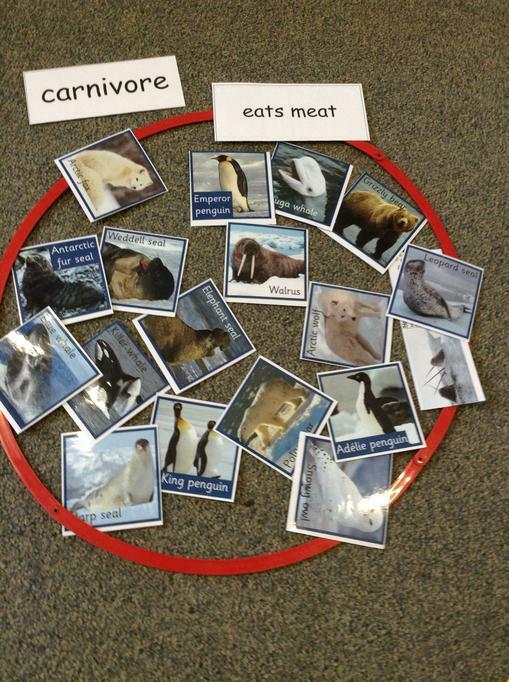 Polar animals facts of their own. 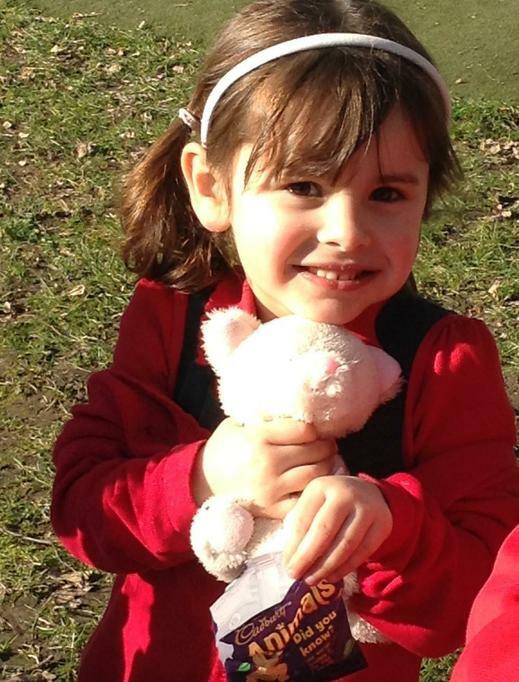 at ‘the top’ of the world . 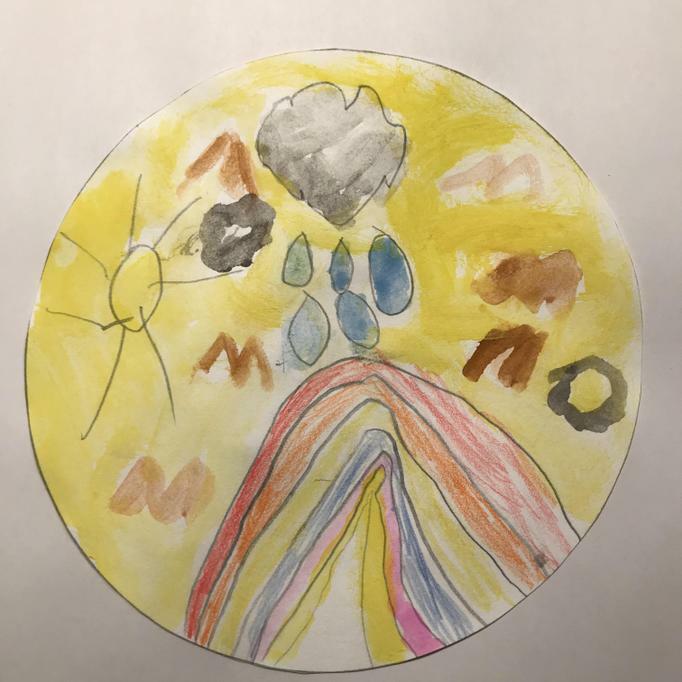 . .
at ‘the bottom’ of the world. 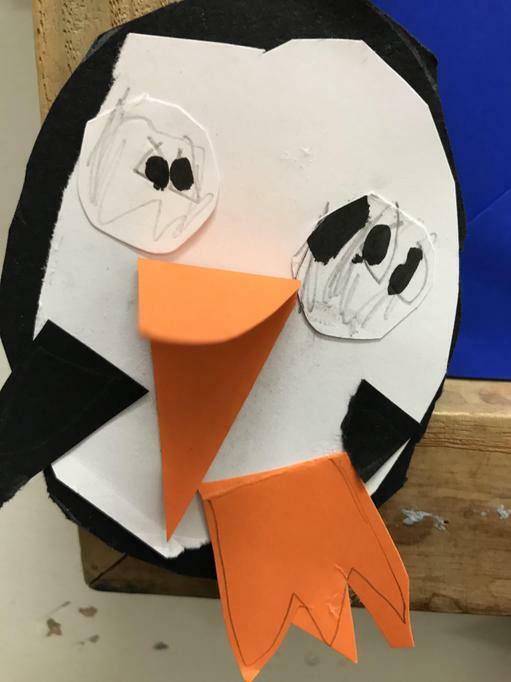 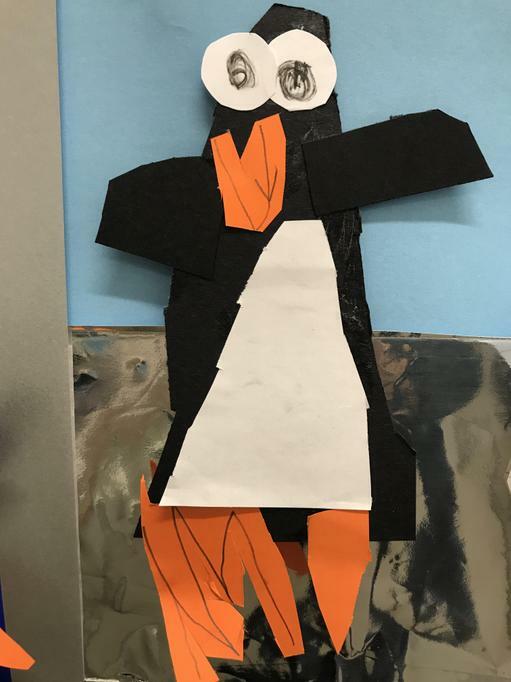 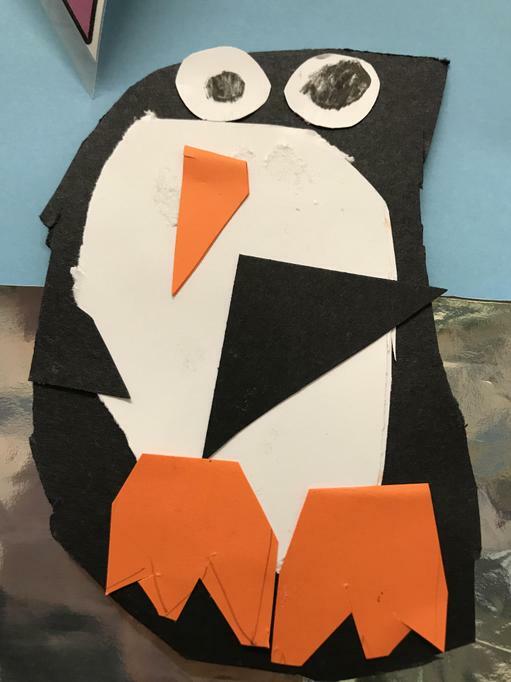 After watching clips from The Frozen Planet and studying photographs of the Arctic and of Antarctica, we made our own versions of Antarctica and identified and named the physical features of Polar landscapes: we could name mountains, valleys, oceans, glaciers, icebergs and the ice sheet, and also included lots of snow and ice! 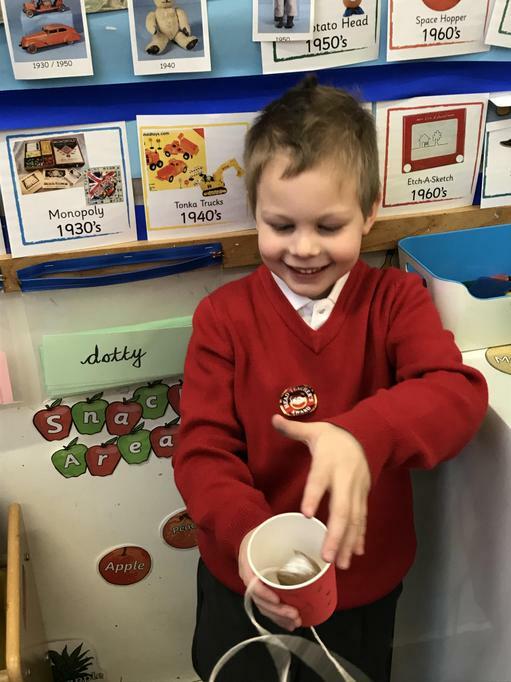 We used our senses to explore ice! 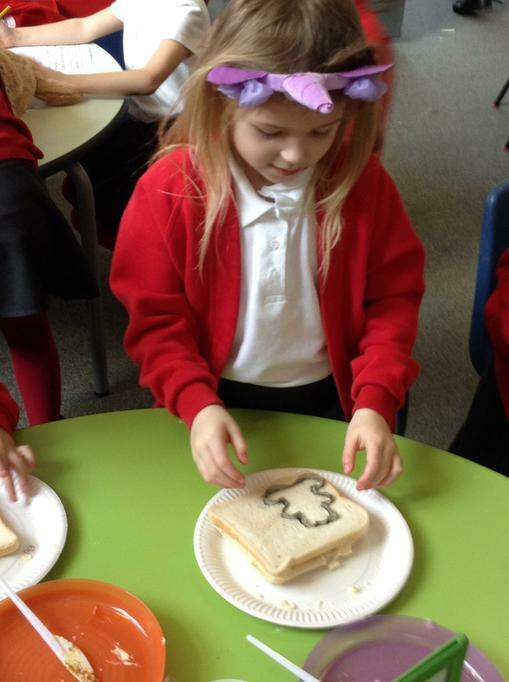 We tried to describe how it looks, sounds, smells, tastes and feels. 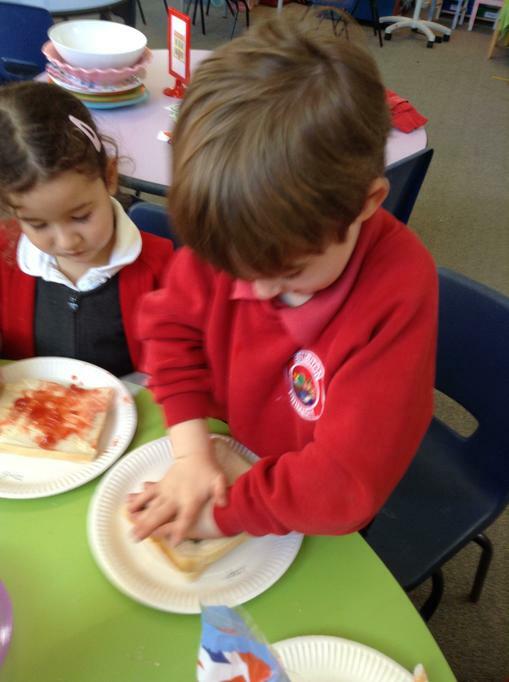 We tried crunching it and warming it with our hands to try to make it melt. 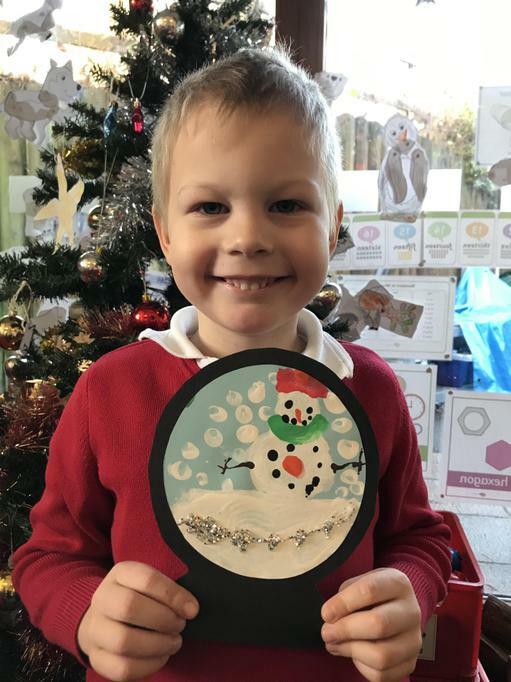 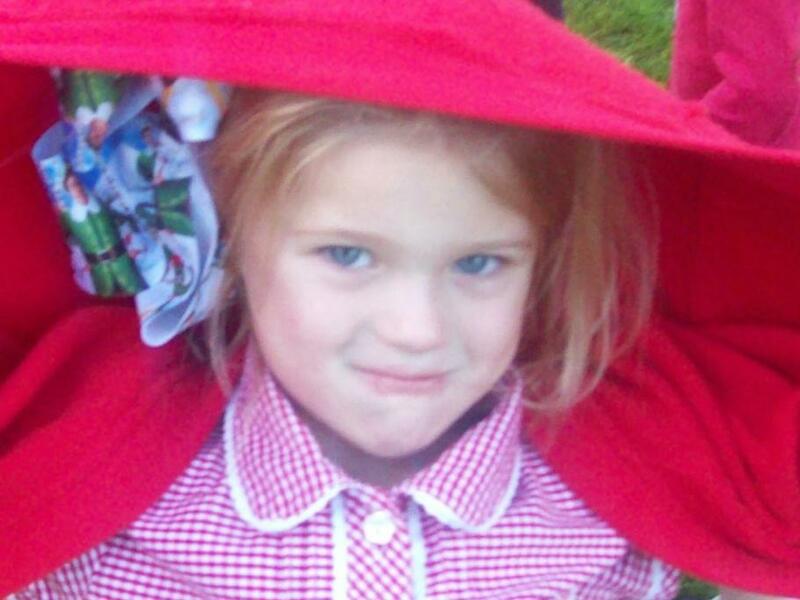 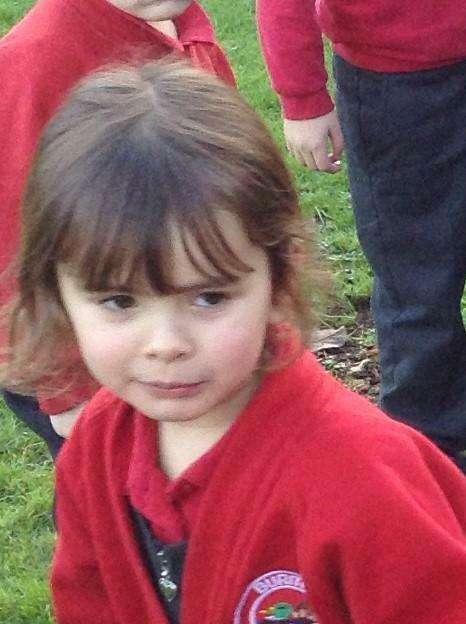 This half-term our topic is Weather and the Seasons. 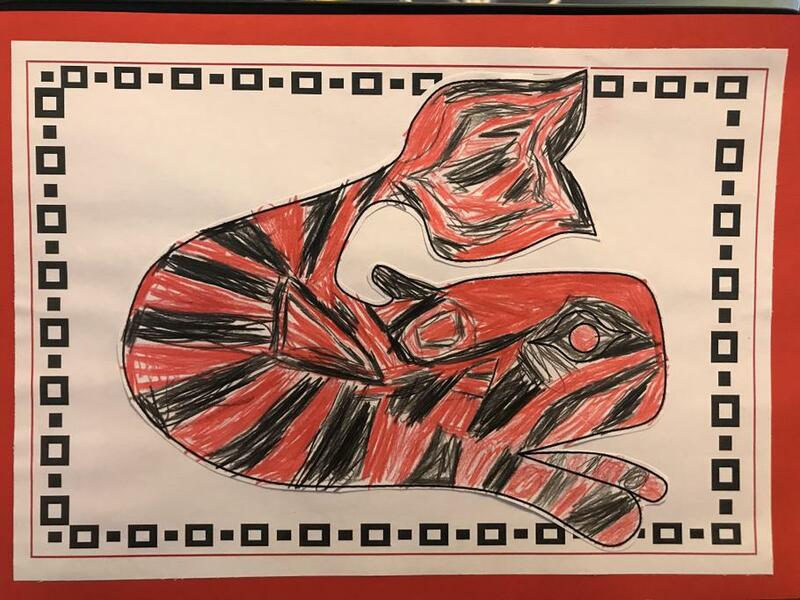 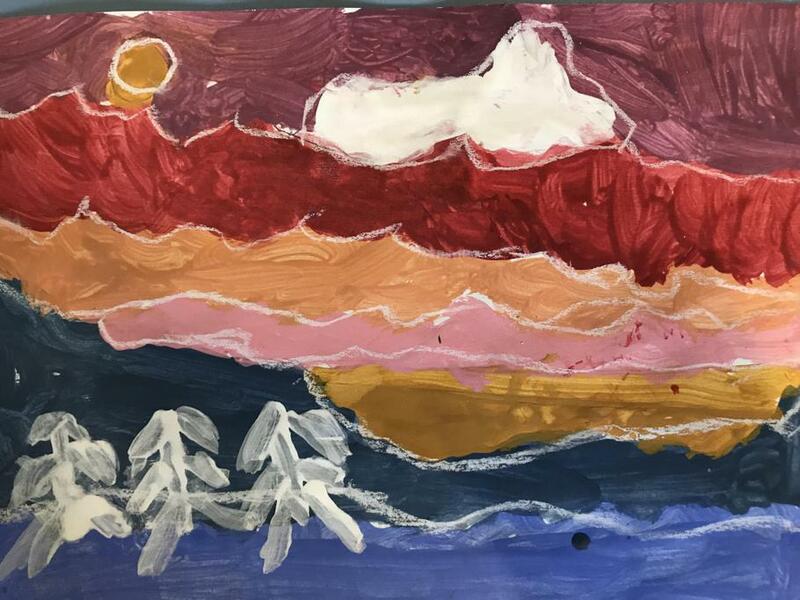 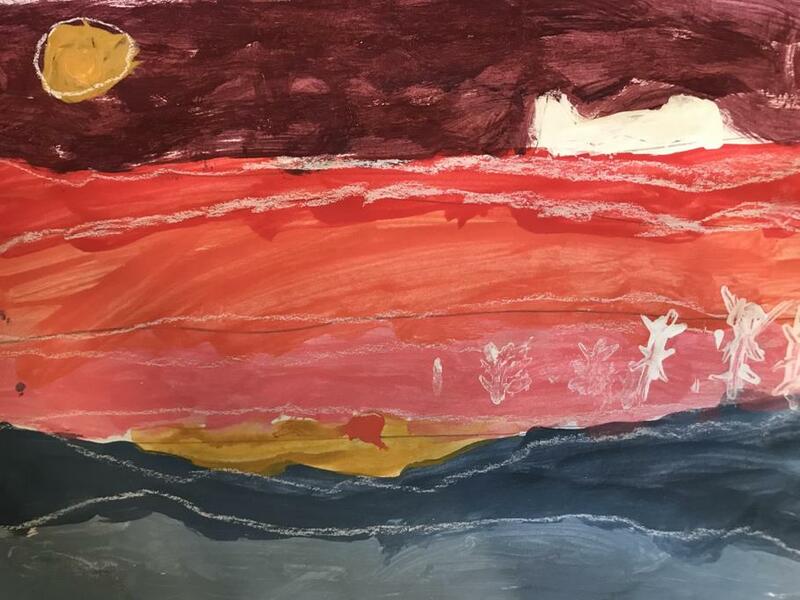 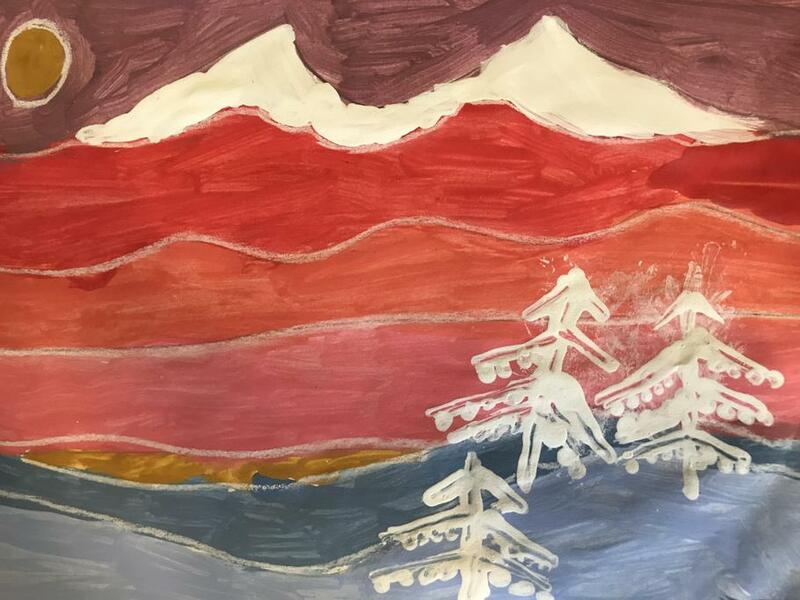 Week 7: To finish off our topic, we painted a picture for the front of our topic books. 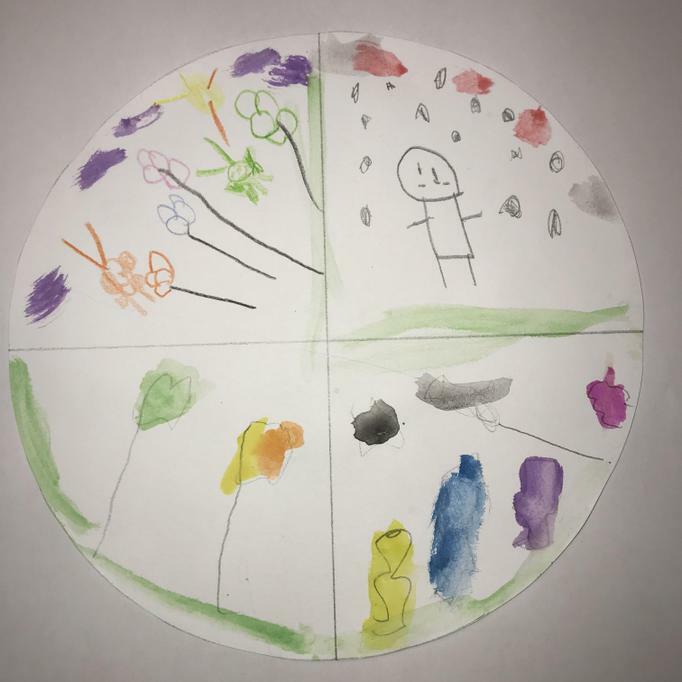 Some of us chose a type of weather, some chose to paint the seasons. 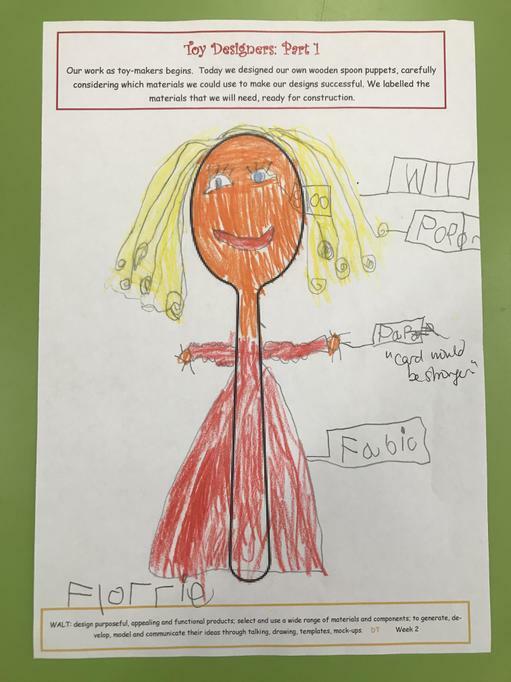 Week 7: We talked about how we are similar to, and yet different from our friends. 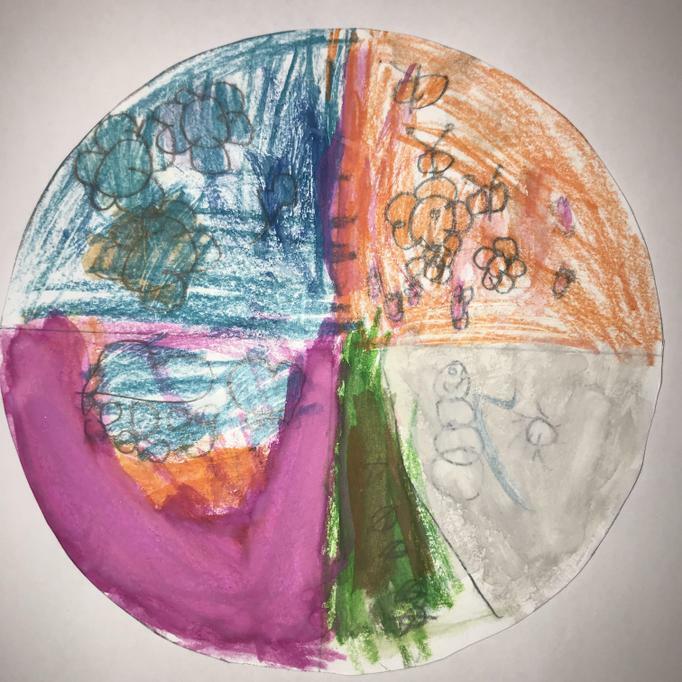 We realised that, just like the beautiful leaves we had collected for our homework, we are each unique, and each special. 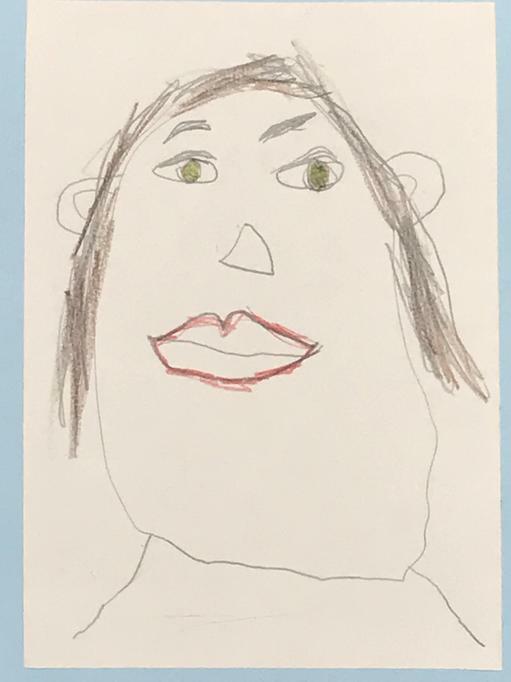 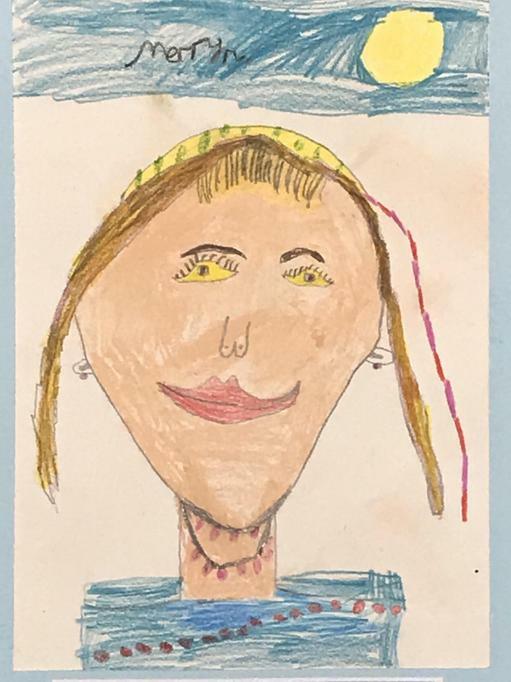 We studied a photograph of ourselves and used mirrors to study our own individual faces, and drew our self-portrait. 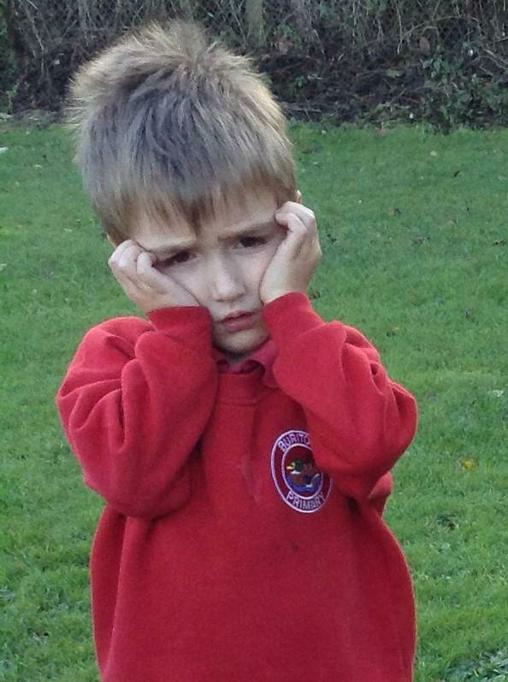 Week 6. 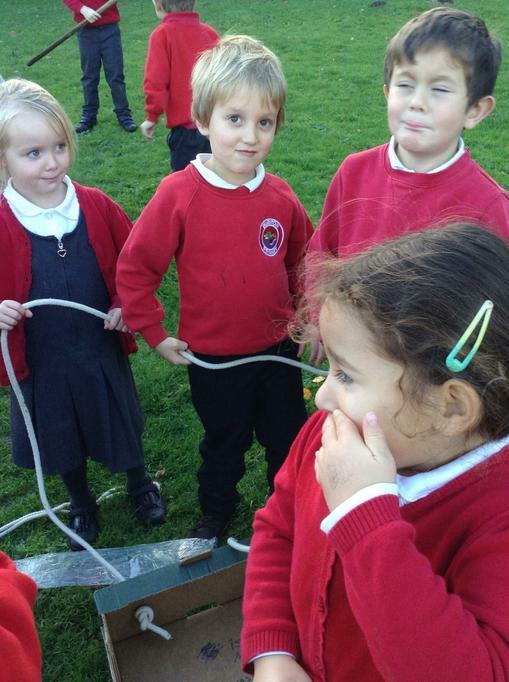 We learnt about the seasonal changes that happen to an apple tree throughout the year. 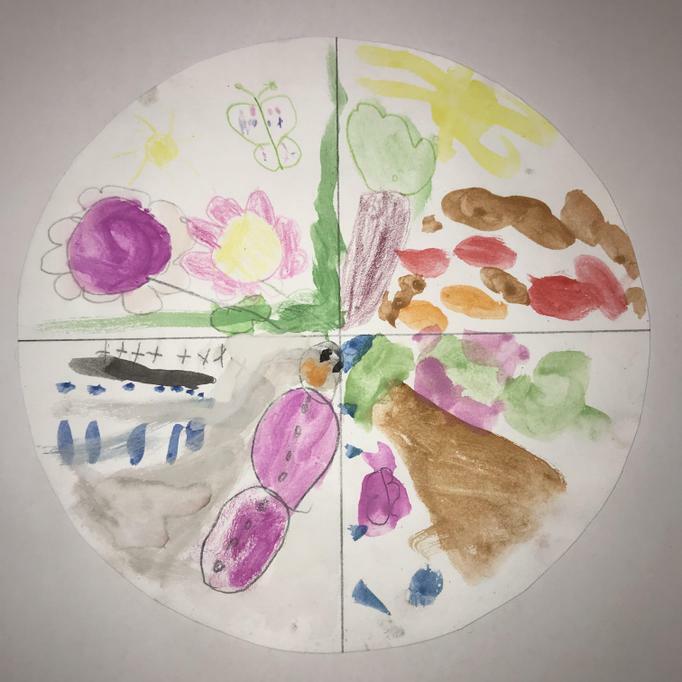 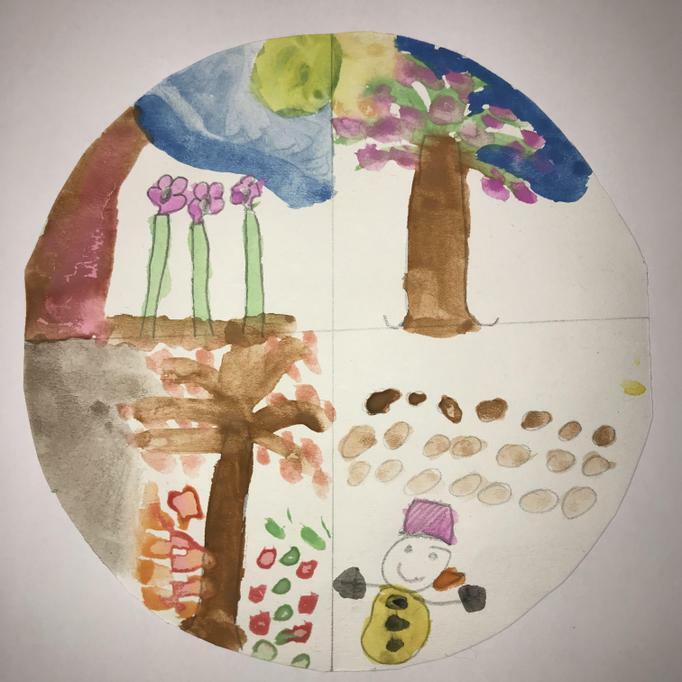 We then used a variety of techniques to make our own beautiful changing apple tree, and talked about the seasonal differences. 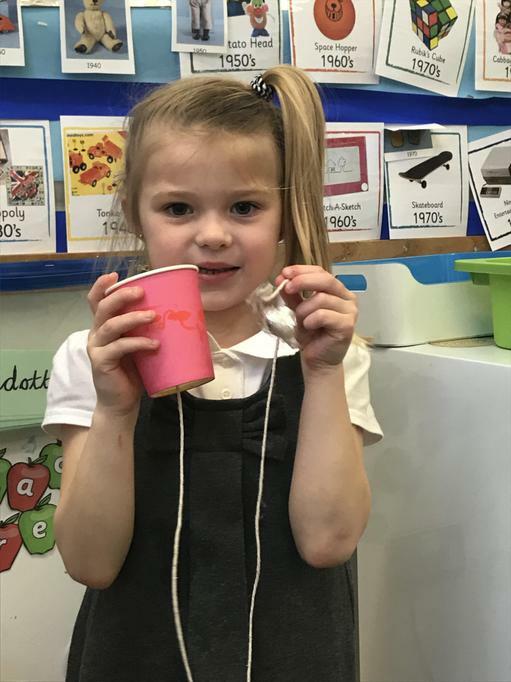 Week 6: As the trees begin to change to their Autumn colours, we have been learning about evergreen and deciduous trees. 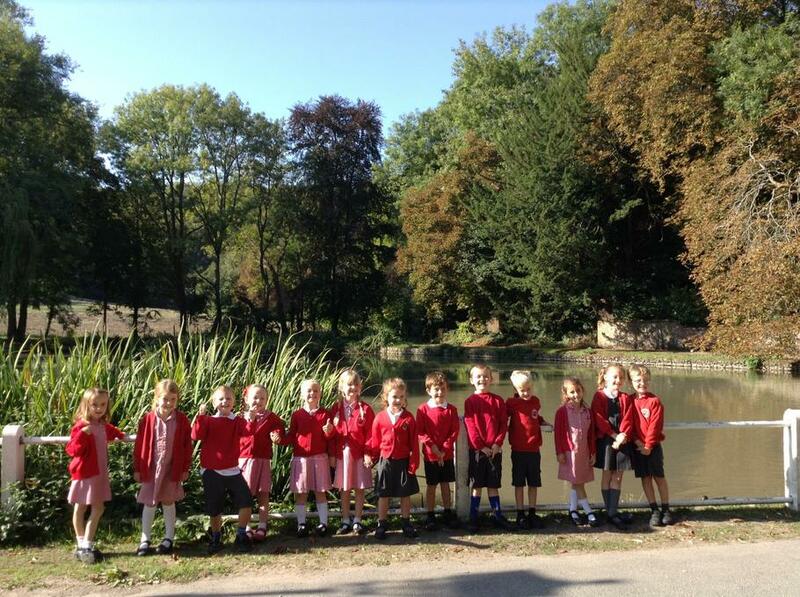 We went on a tree hunt around our meadow to try to identify the trees by examining their leaves and fruit. 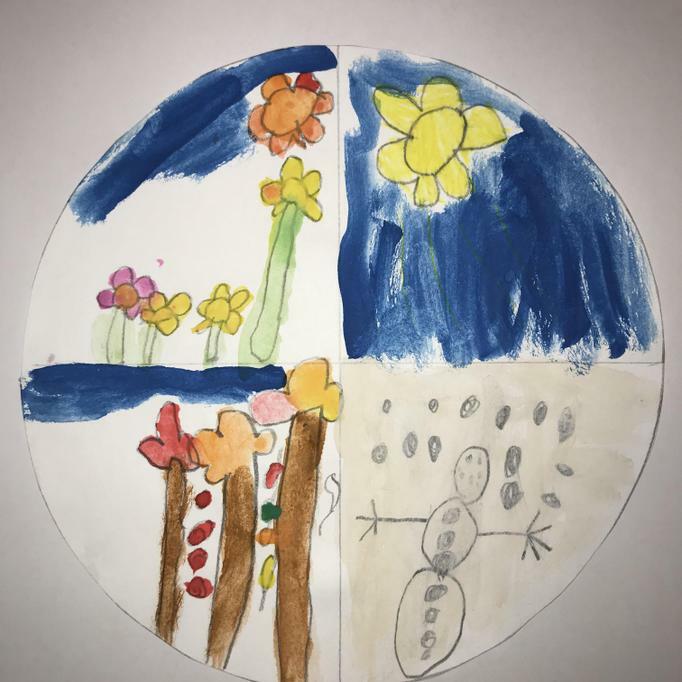 Week 5: This week we have been exploring the weather associated with different seasons. 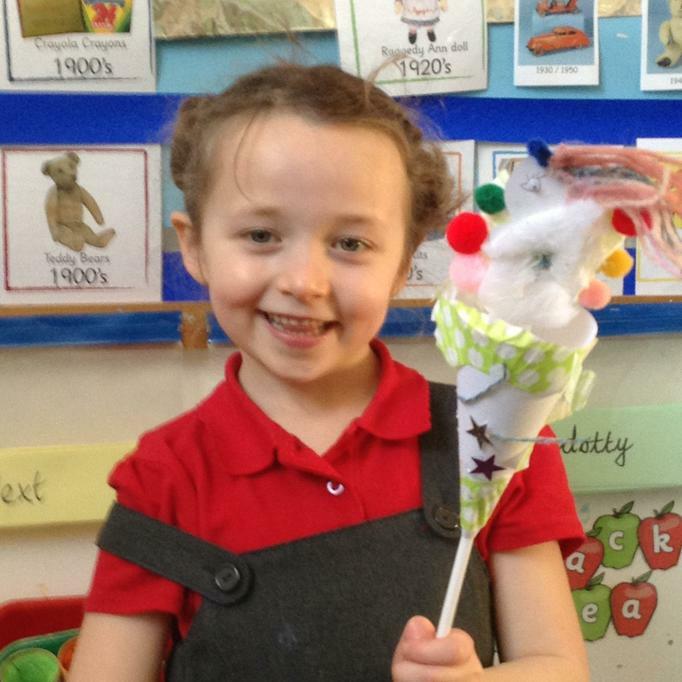 We have made Seasons Spinners, and dressed teddies according to the weather and the seasons. 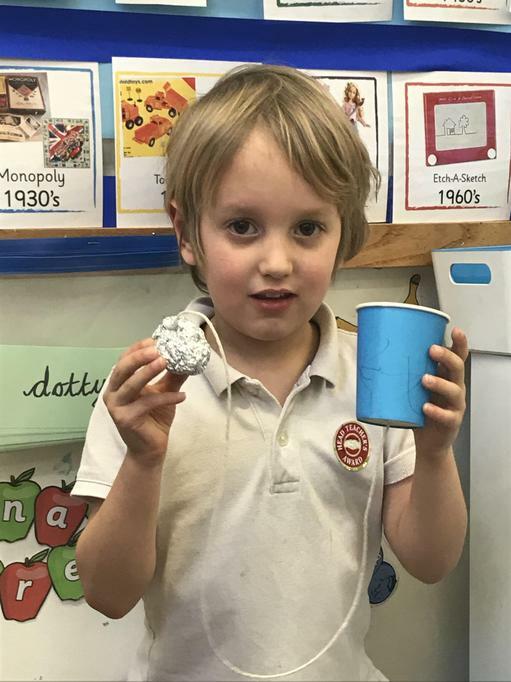 Week 5: As part of our Harvest celebrations, Diamond Class visited Pizza Express to find out where some food comes from and to make our very own pizzas! 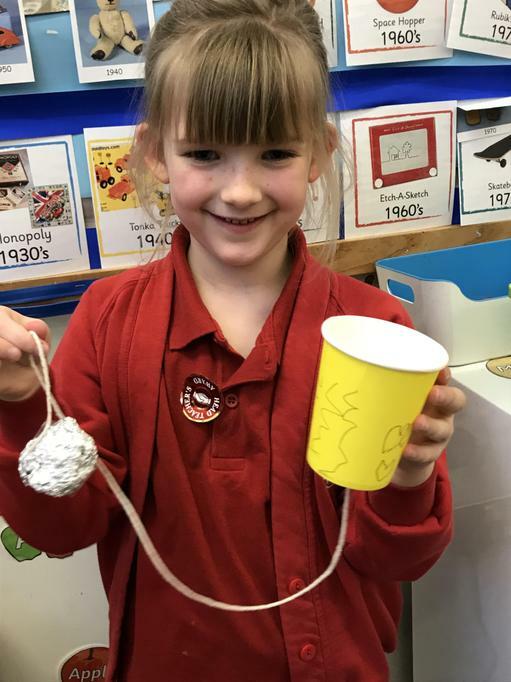 This week we have been learning about weather forecasts, making a bar-chart to record the weather we have observed, and making weather wheels to record the weather each day. 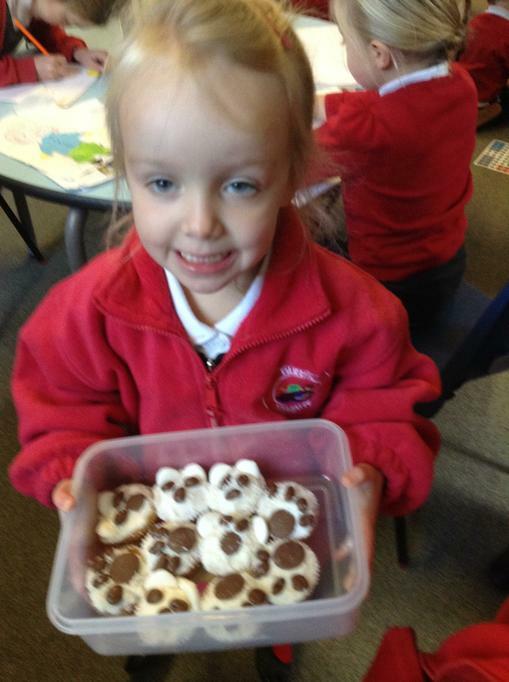 Week 4: We also learnt about clouds and about different cloud formations! 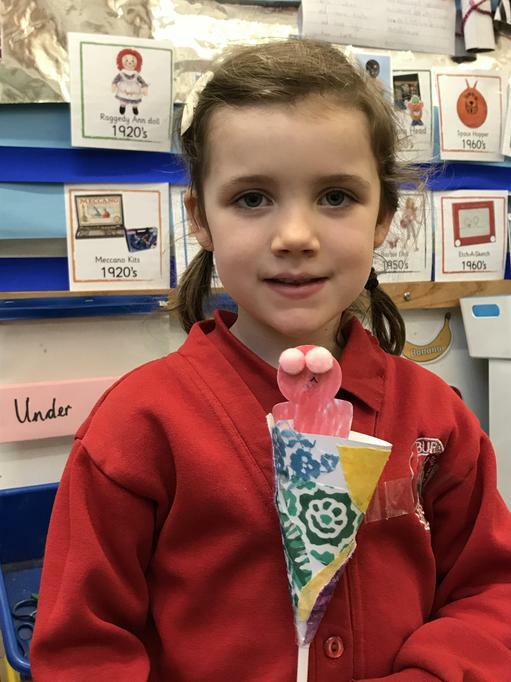 Look at our amazing weather mobiles!! 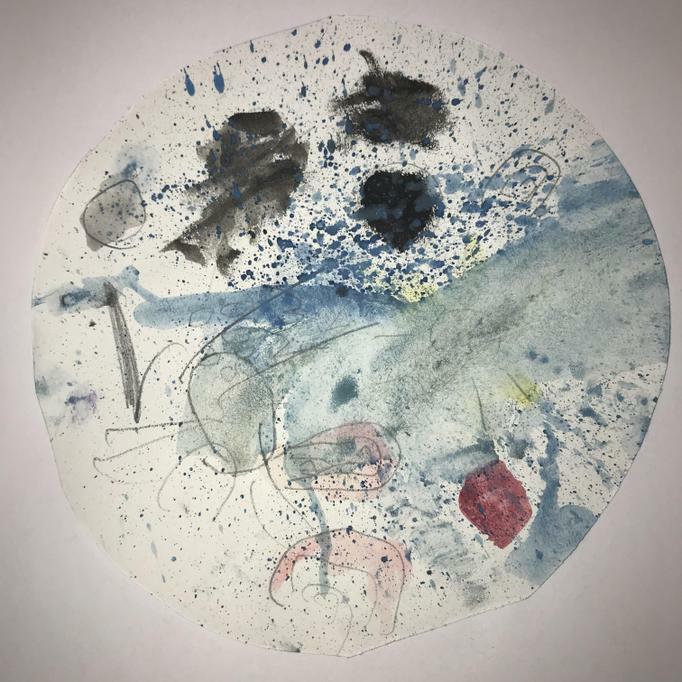 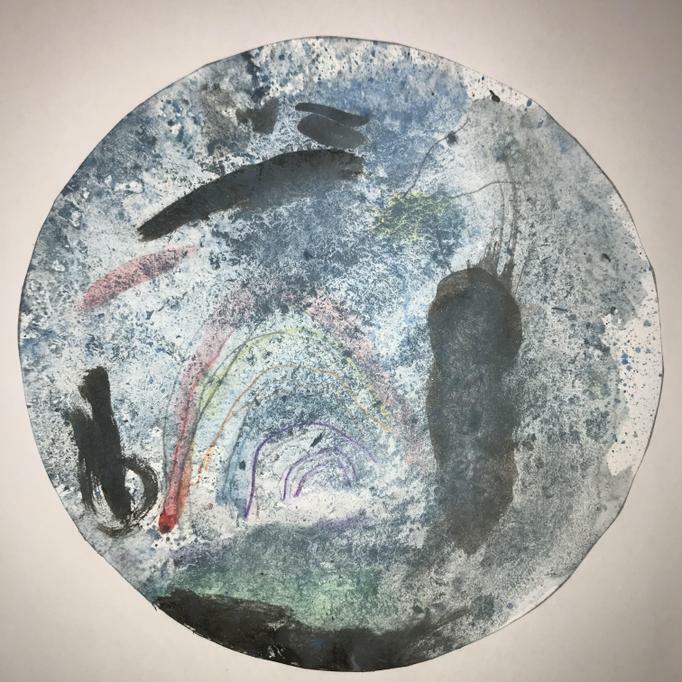 We mixed our own secondary colours; used watery water-colours for the raindrops; used fiery, sparkly glitter for the hot, burning sun, and painted our fluffy clouds using sponges. 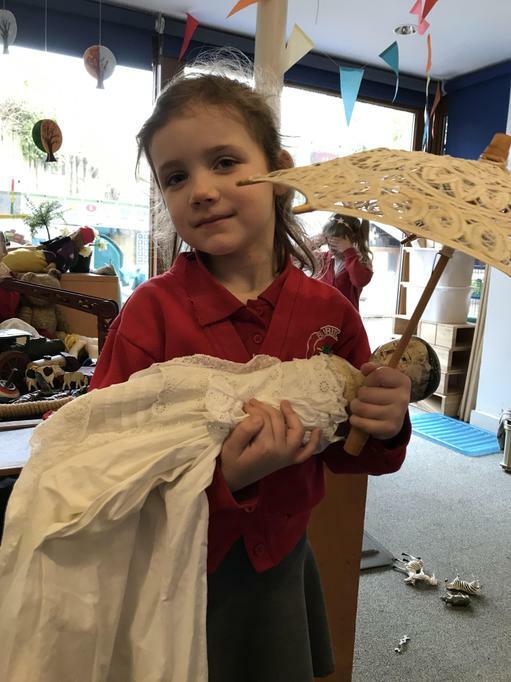 This week in Topic time we've been exploring the rain. 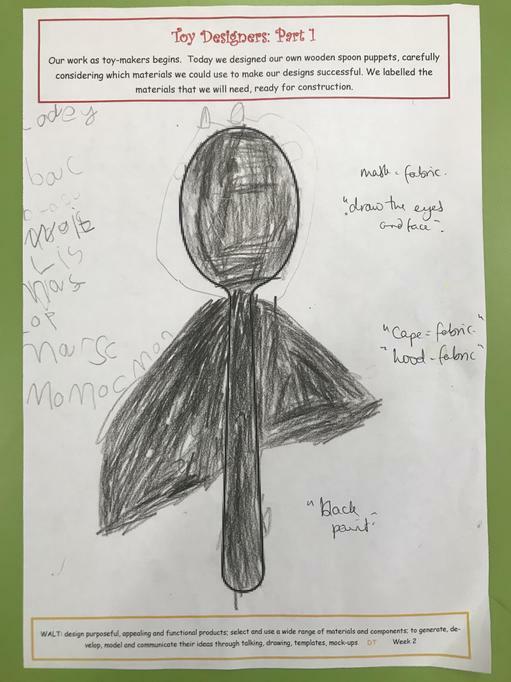 First we designed umbrellas to hide under on a rainy day -- they kept us dry and protected us from the paint-splatter rain! 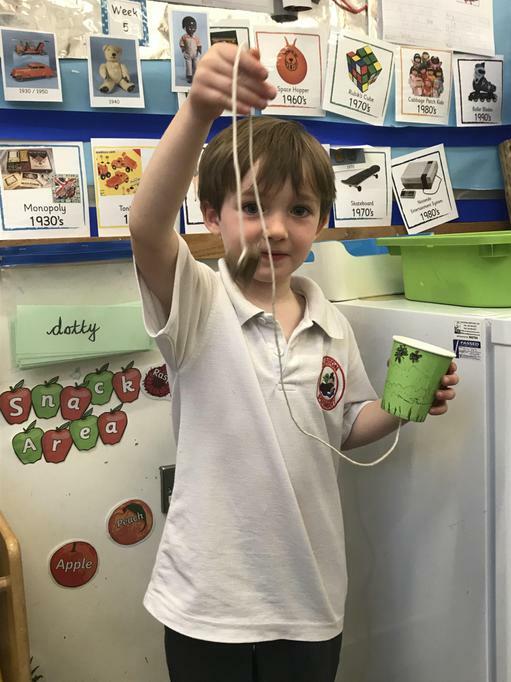 Secondly, we experimented with a shaving-foam cloud and food-colouring 'water vapour'. 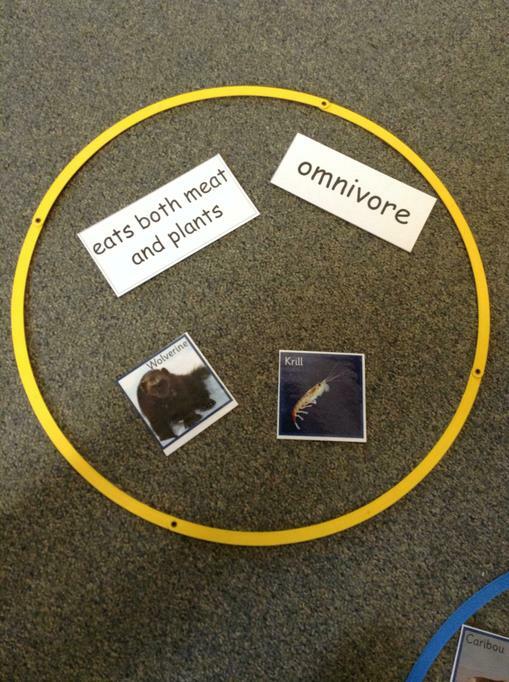 We tried to predict what would happen and recorded our findings. 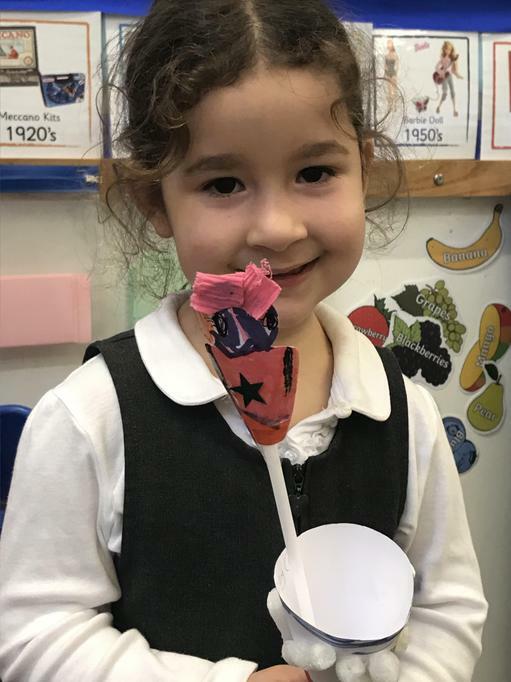 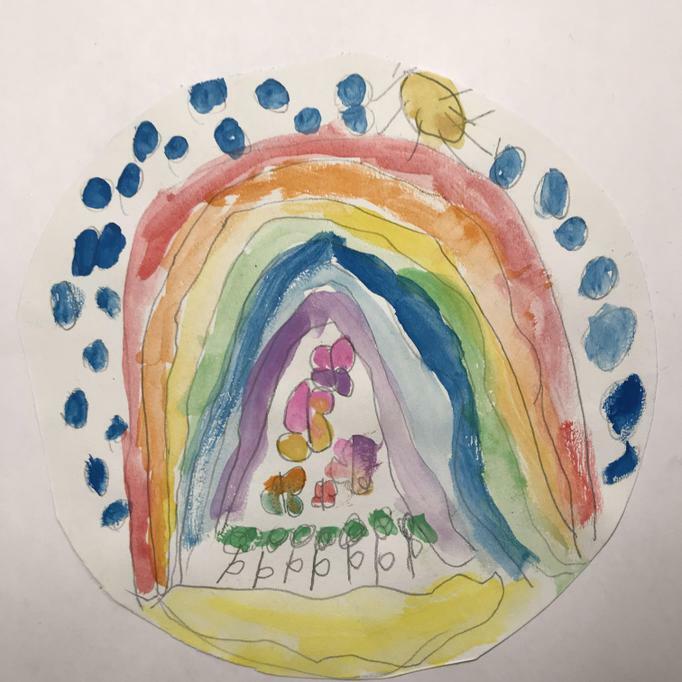 Week 2: This week we used our colour-mixing skills to create the most beautiful rainbows -- these are stage one of the weather mobiles we are going to create. 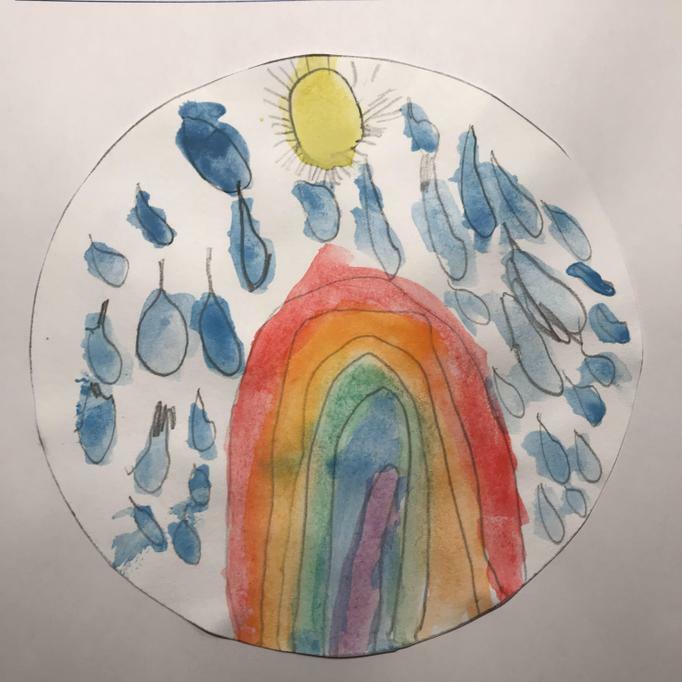 Week 2: We listened to some amazing music inspired by the weather - including Sun Arise, Kiss the Rain, Cloudburst, Fog, and the storm and 'Winter' from The Four Seasons - and tried to match the music to the weather, and give reasons for our ideas. 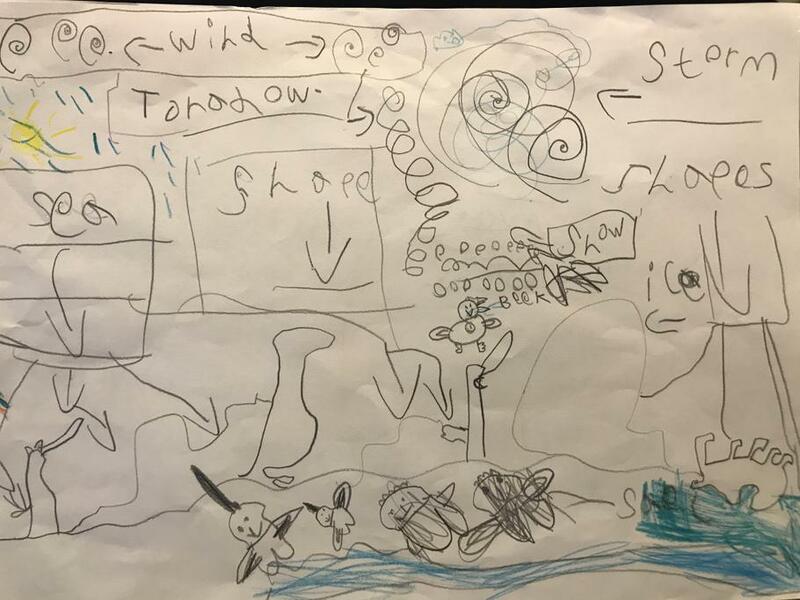 We got especially excited by the storm music! 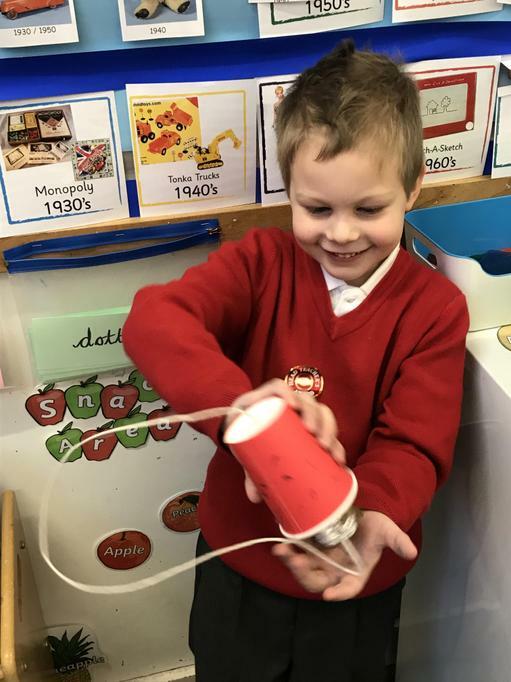 We then used percussion instruments to compose our own weather music. 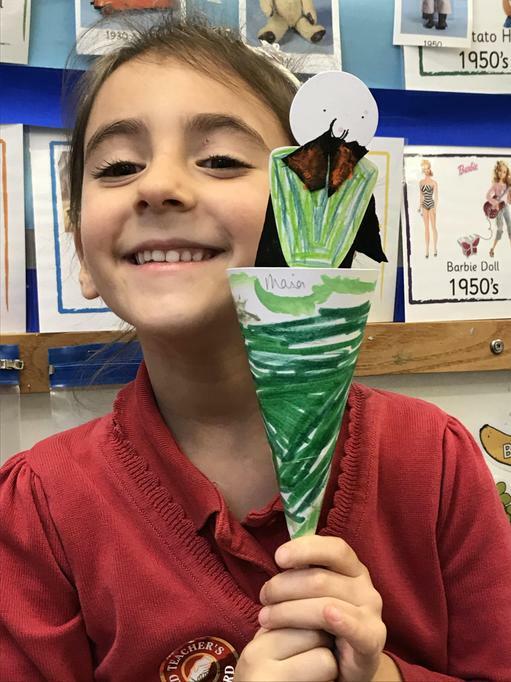 We explored the amazing wind sculptures of Anthony Howe and then examined some portrayals of the wind in art. 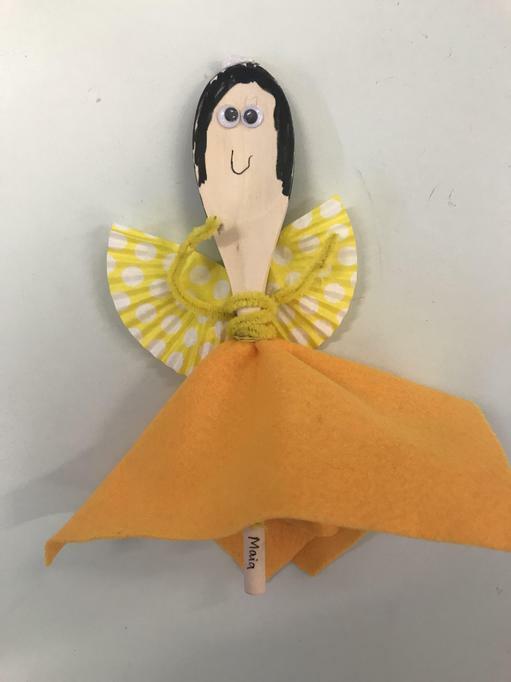 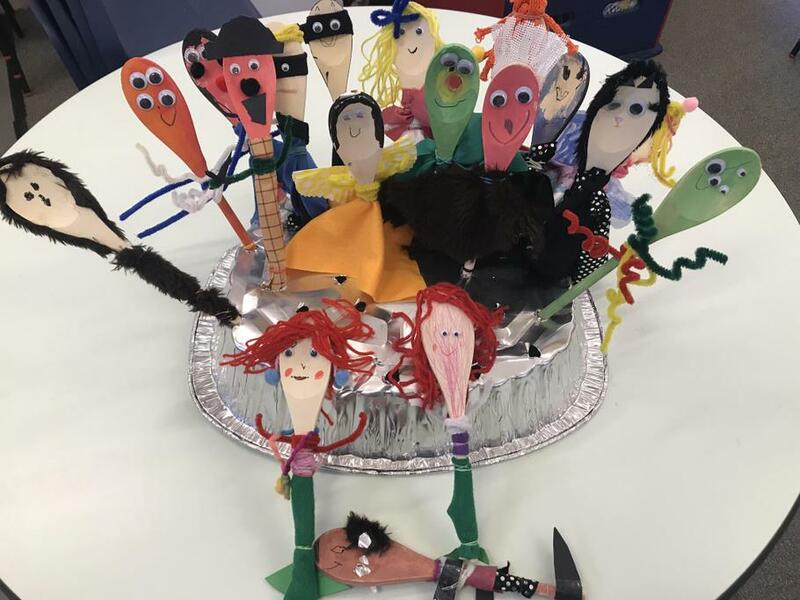 We let our imaginations ride the wind to create our own wind art, and then turned it into our own moving wind sculptures.. We will use our beautiful twirling wind spinners to monitor the speed of the wind. 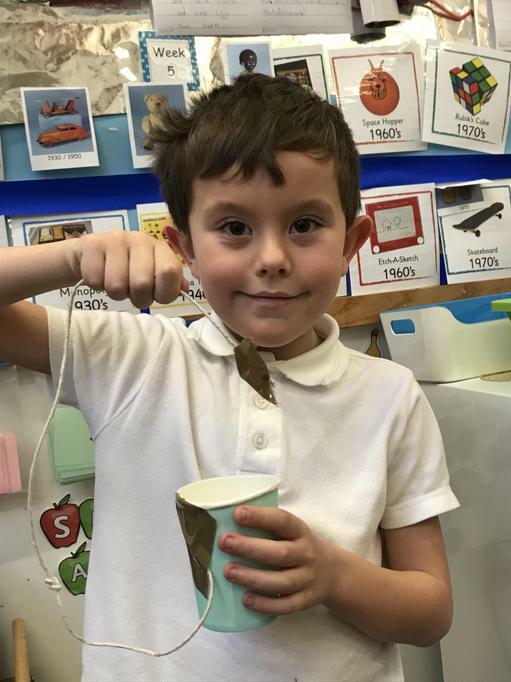 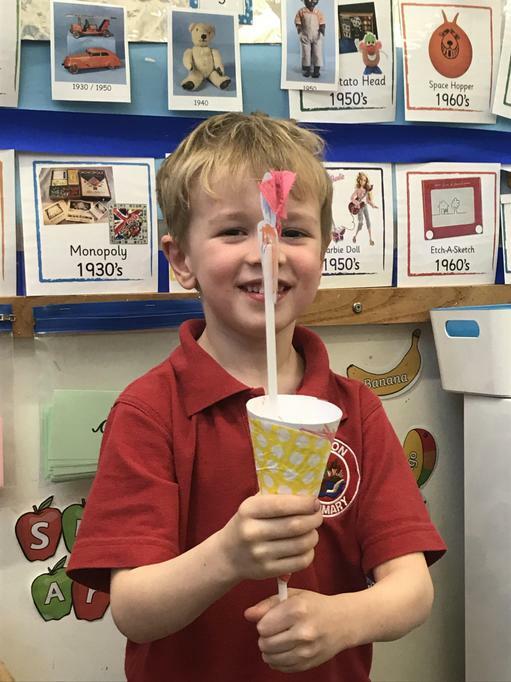 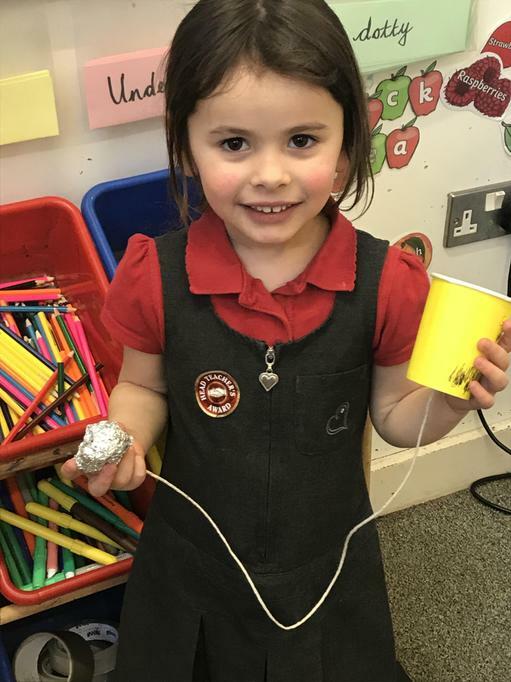 We learnt about the wind at its properties, and experimented to find out which materials could be blown by the wind: we made predictions first, and then tested our theories with Mrs Brown's fan! 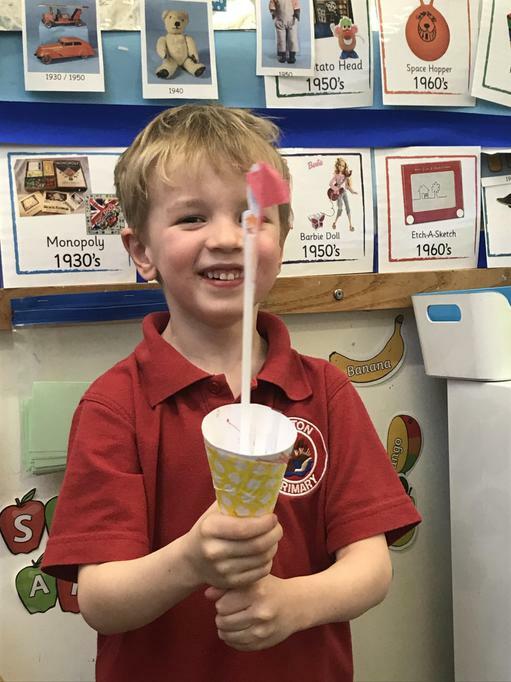 We watched an animation about wind speed and wind direction and learnt about anemometers and windsocks. 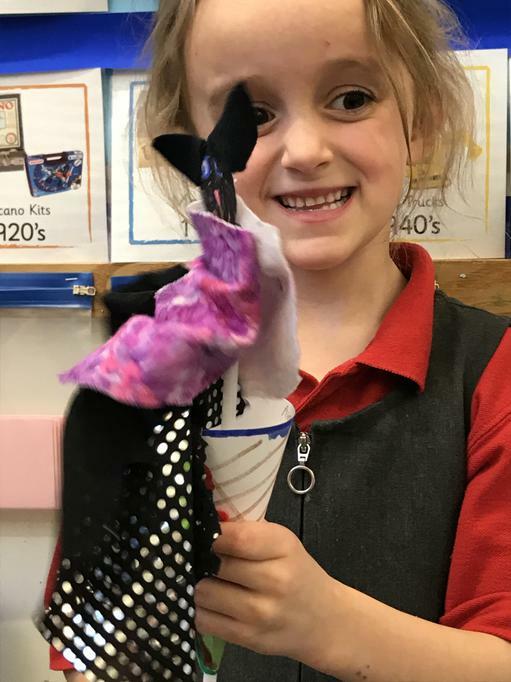 We ordered a simple version of the Beaufort Scale and made our own windsocks to monitor the direction of the wind. 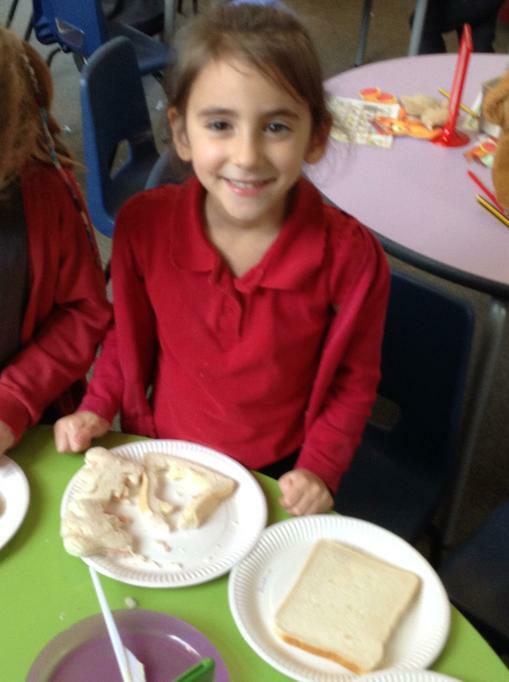 During British Values Week, we learnt about Buddhism, Hinduism, Judaism and Islam. 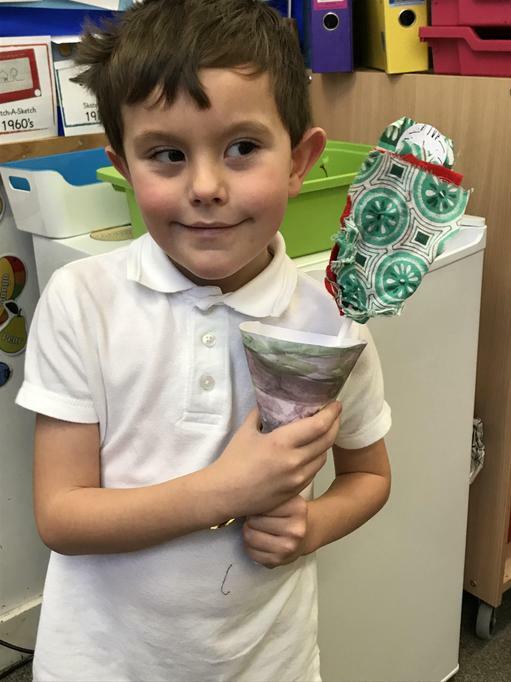 We really enjoyed making Wesak lanterns to celebrate the birth of Buddha and Tibetan Prayer flags. 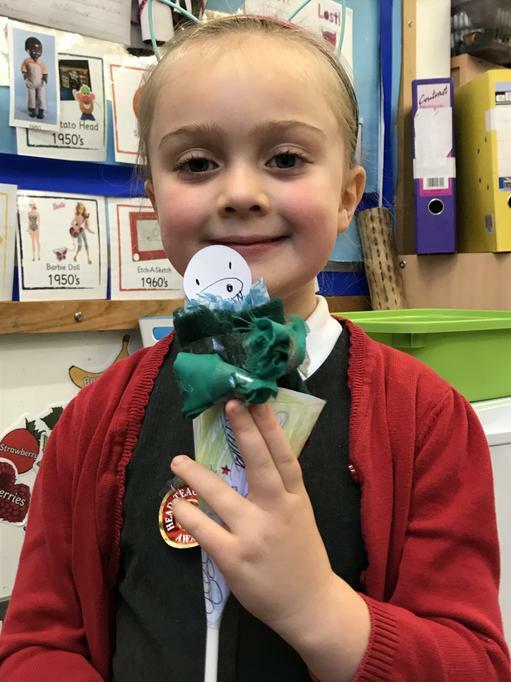 The whole school each wrote a prayer for the world on a flag and they have been hung up so the the prayers can be carried away on the wind. 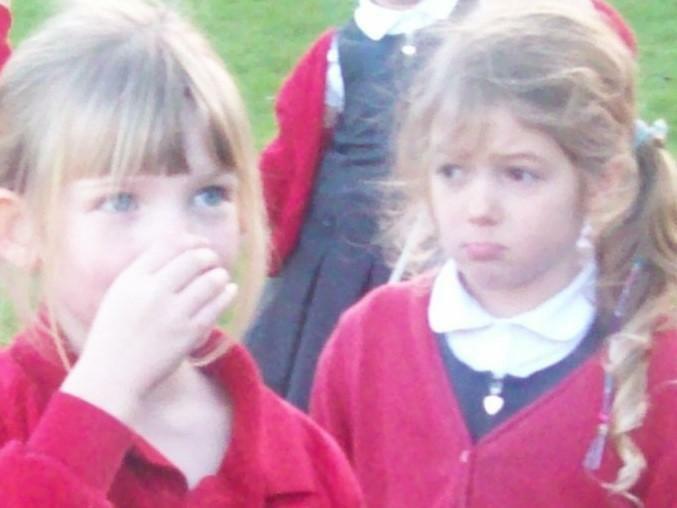 The children were also surprisingly good at Meditation! 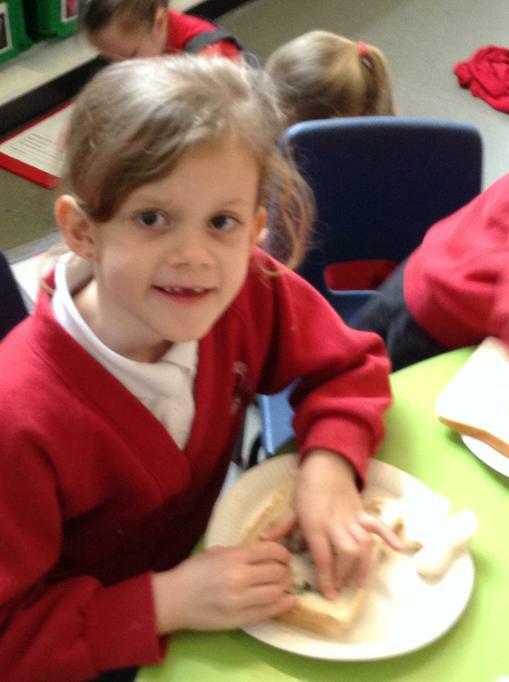 We found out about Mary Anning and her interest in fossils. 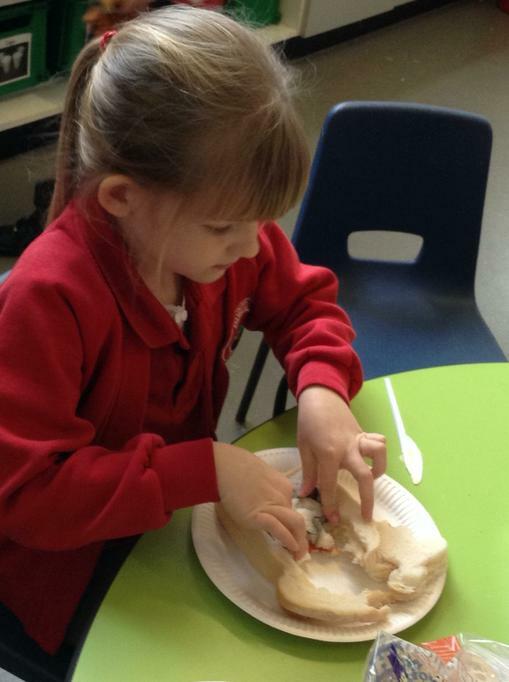 We then made our own "fossils". 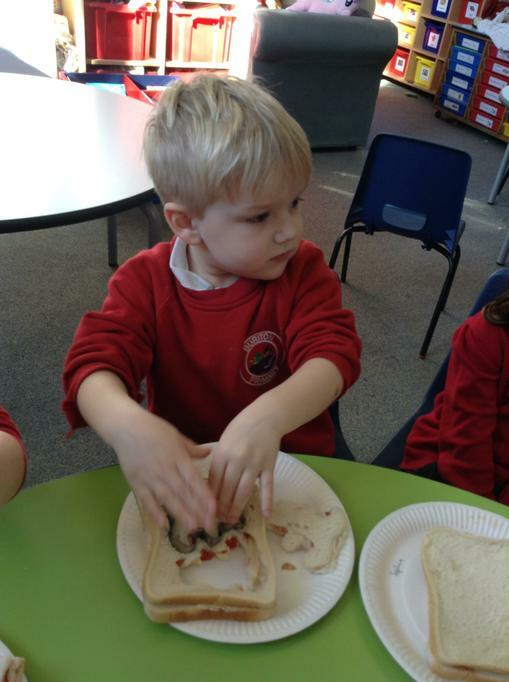 We have been learning about the different structures of dinosaurs. 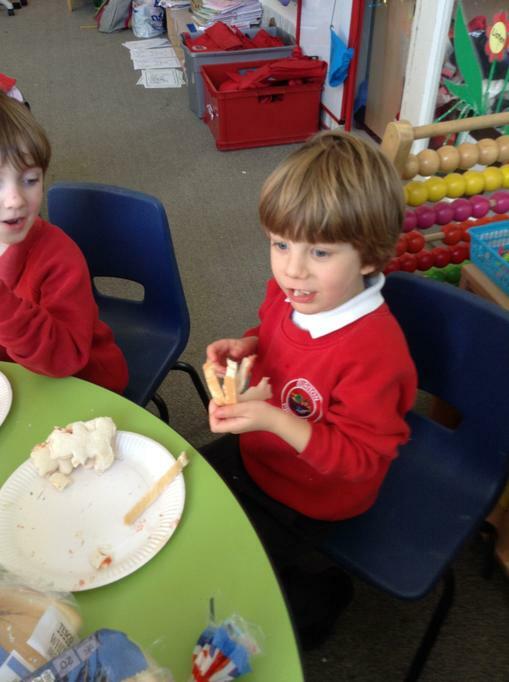 We studied the Stegosaurus skeleton and each made a different bone. 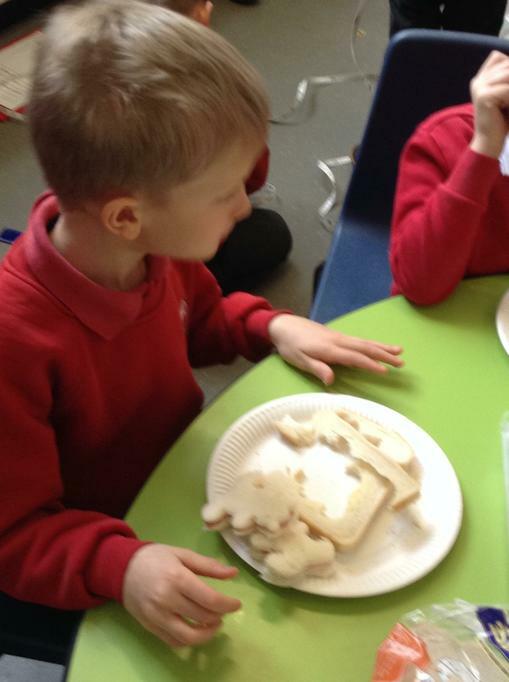 We then "excavated" the bones and reconstructed the Stegosaurus! 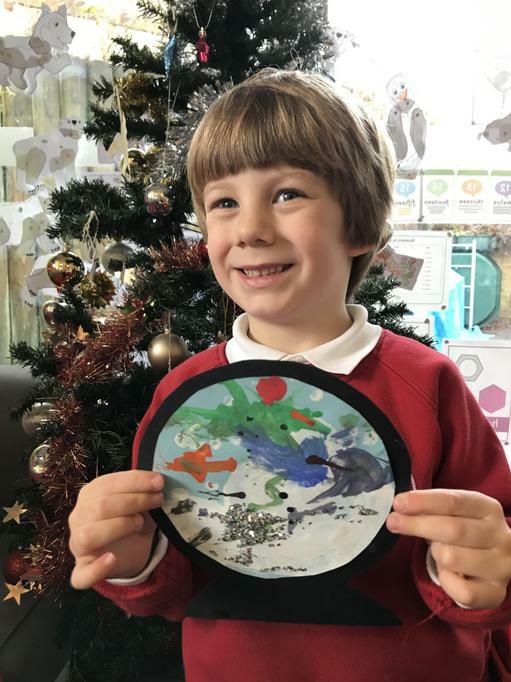 We have been experimenting with bubble wrap to give our dinosaur paintings different textures. 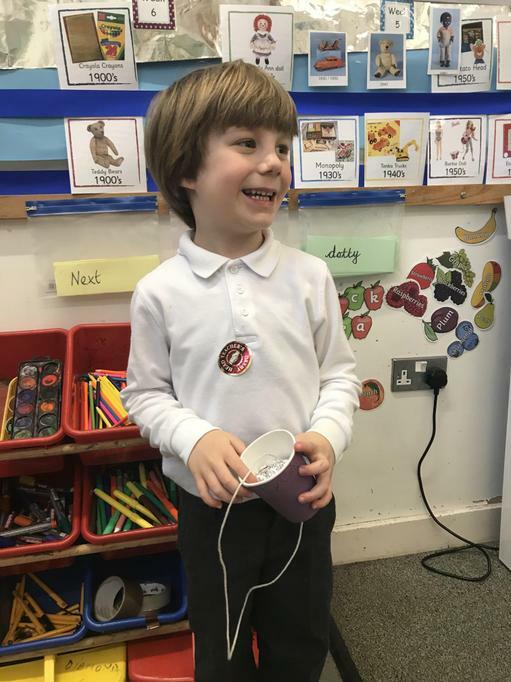 The children have been using their computing skills to program the dino bee-bots to reach the ammonite before the T-Rex can catch them! 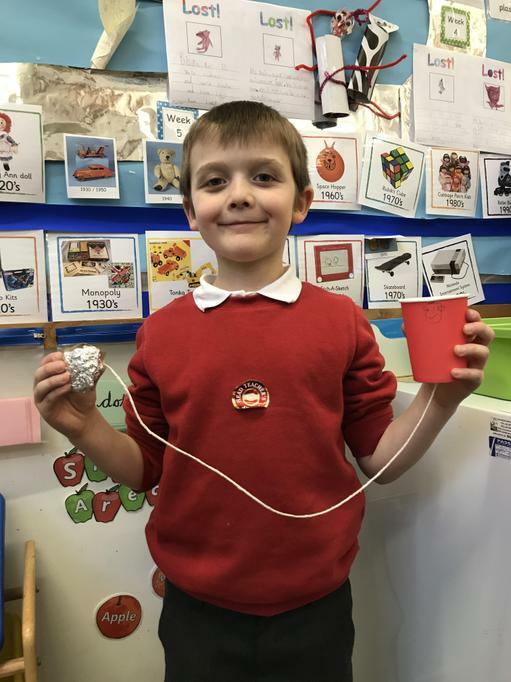 This week we found out about Guy Fawkes and made our own firework creations using a range of different skills and materials. 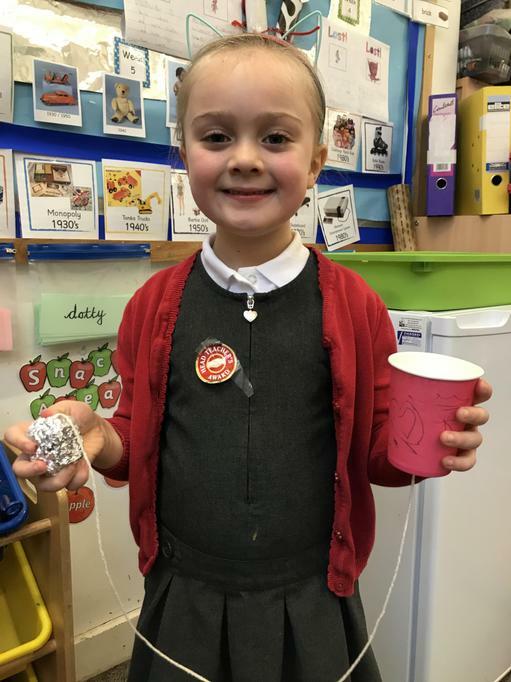 As part of our topic this half term "Light and Dark", Diamond class found out all about Diwali and how it is celebrated. 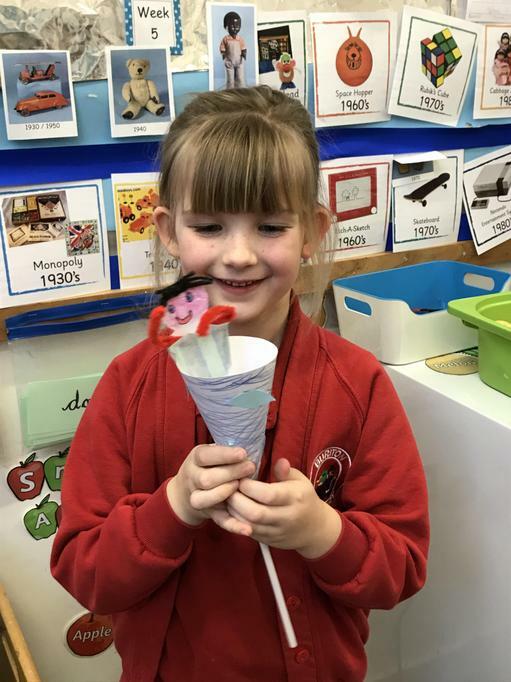 We each made our own diva lamp to take home. 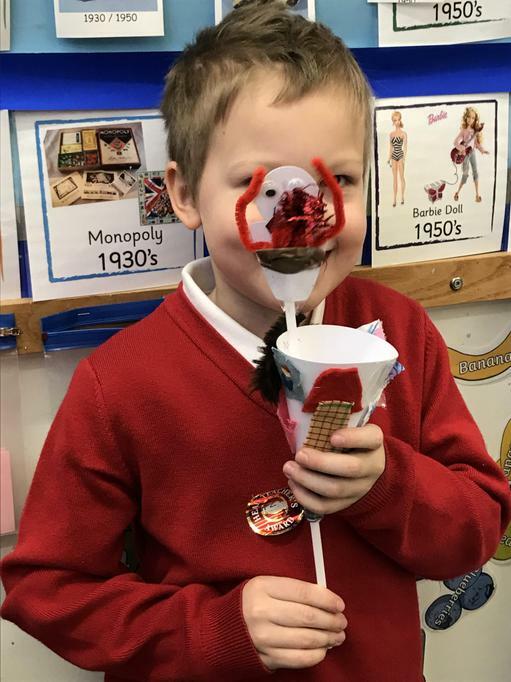 Diamond Class have been learning how to mix paints to create different colours. 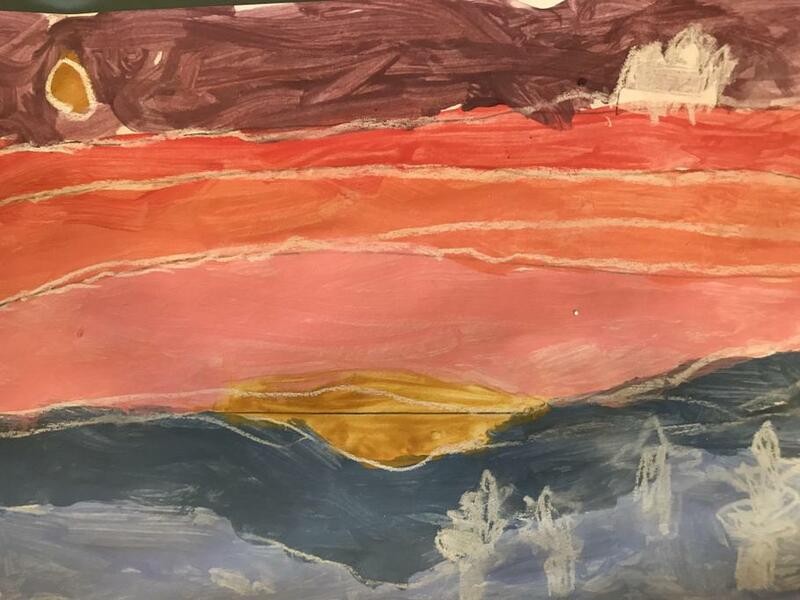 We then created our own paintings in the style of Mondrian. 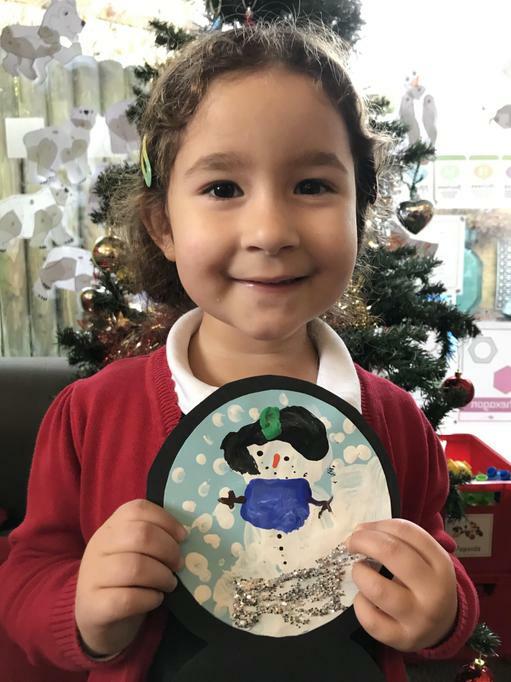 We have also used mirrors to help us draw a picture of ourselves. 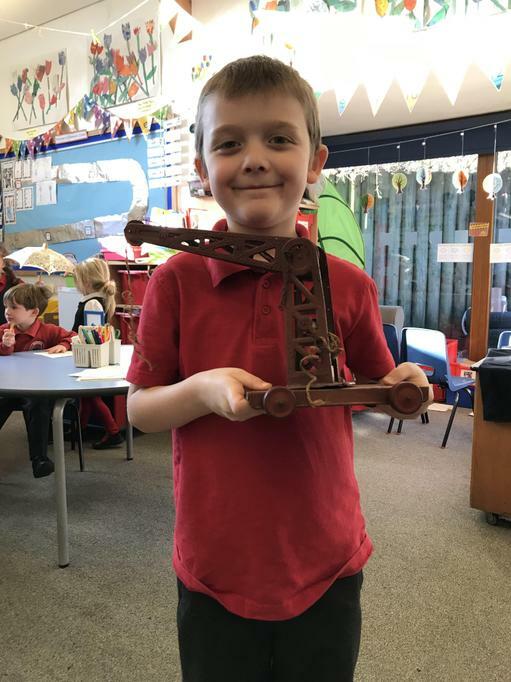 Diamond Class were very lucky to have a visit from Mr Jones who told us all about life in Dominase, Africa. 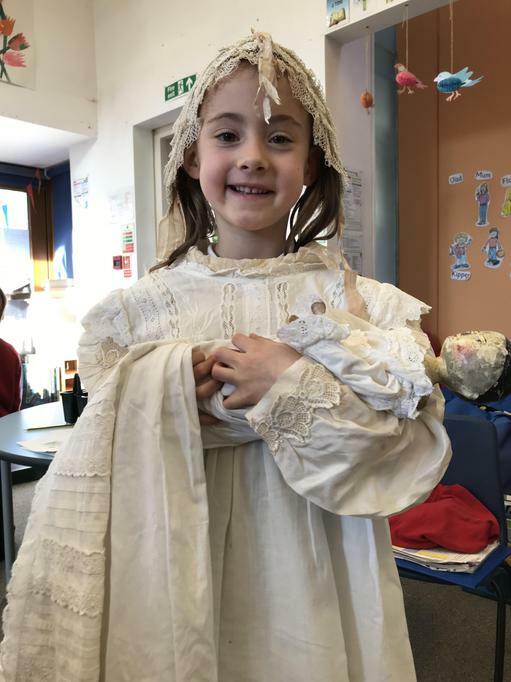 We even got to try on some African clothes. 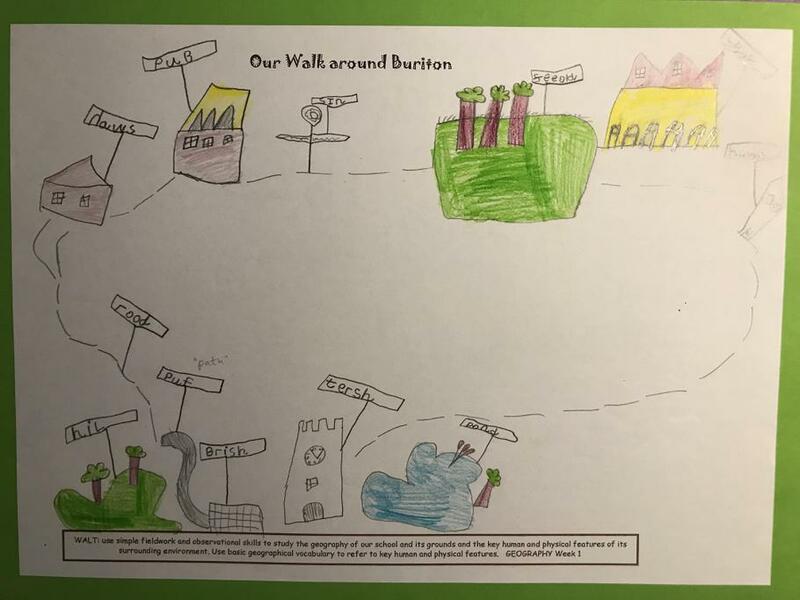 We went on a walk around Buriton village to help us learn about our local environment. 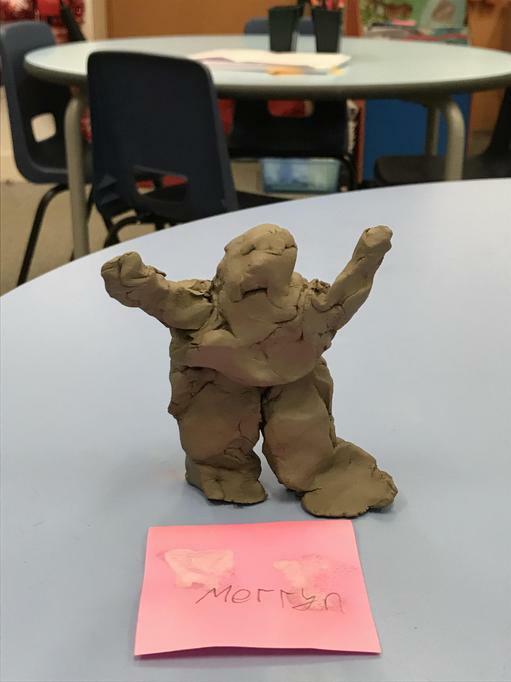 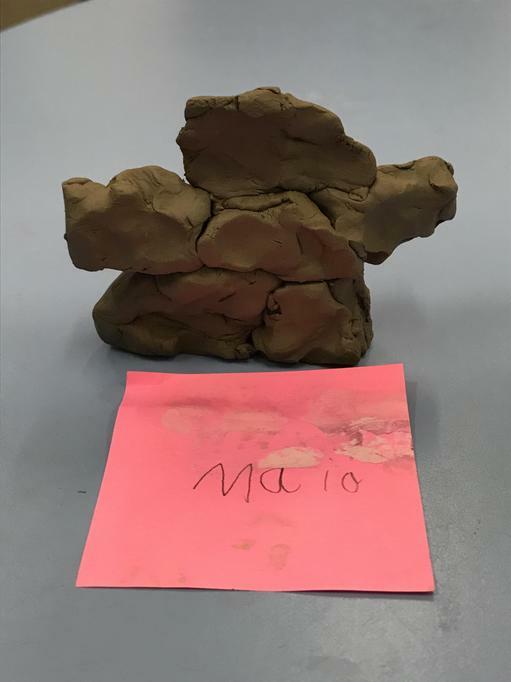 As part of our topic "Ourselves and Our World", we made mud tree self-portraits. 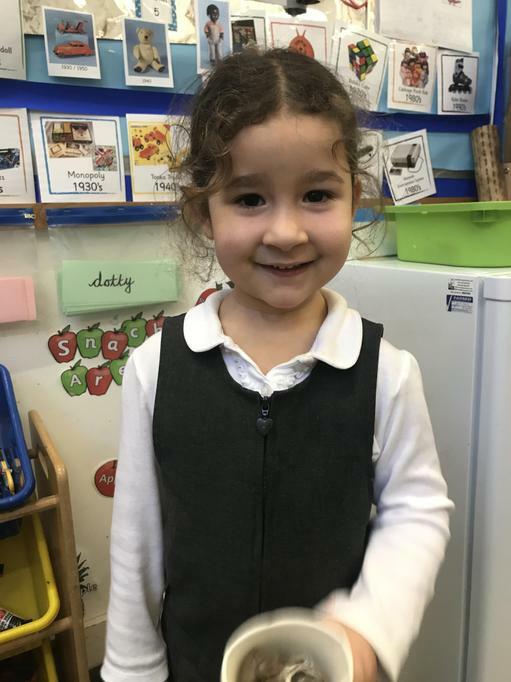 Our new Reception children have all settled in really well. 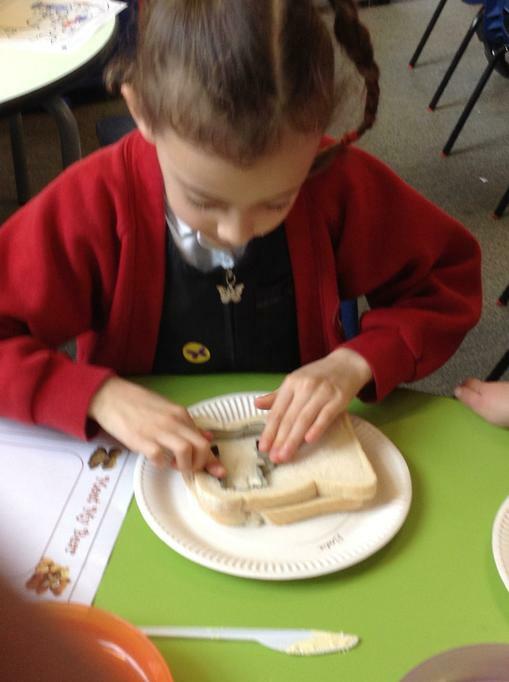 This week Diamond Class went on a school trip to Dell Quay. 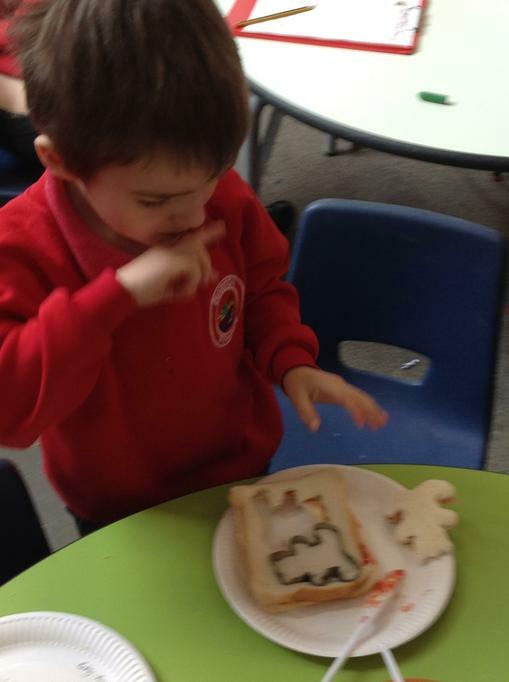 In the morning we made crab homes, hunted for natural "treasure" and made beach sticky pictures. 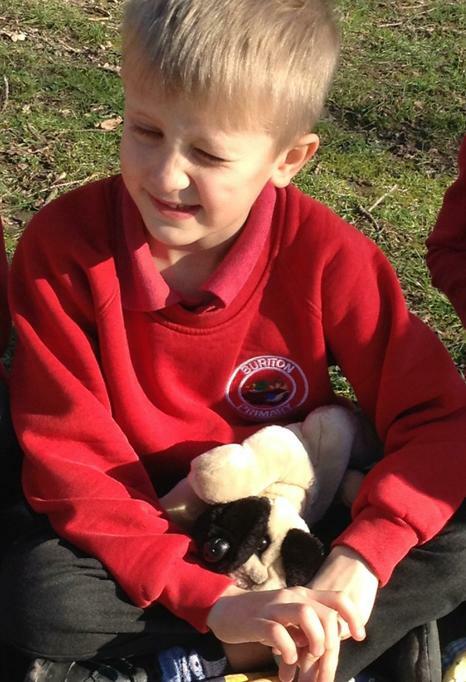 After lunch we then went pond dipping and found creatures hidden under logs and in the long grasses. 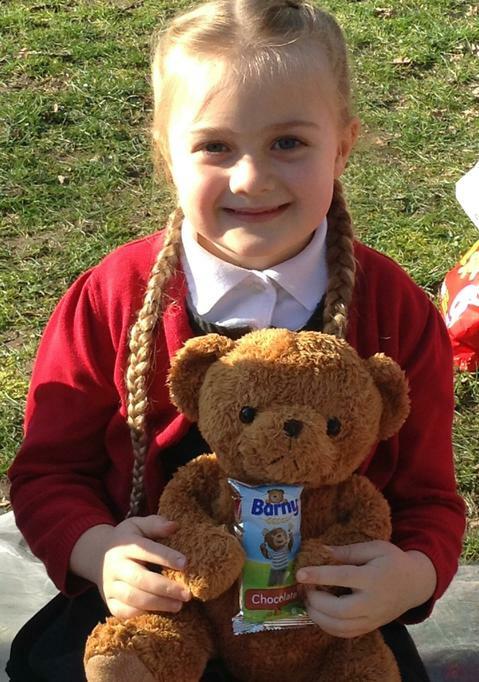 It was a fantastic day with fantastic weather! 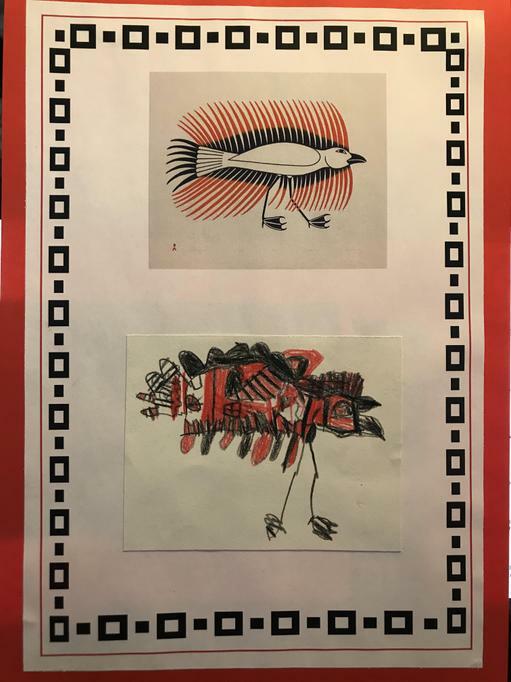 This week we have been learning about the work of the artist Ted Harrison. 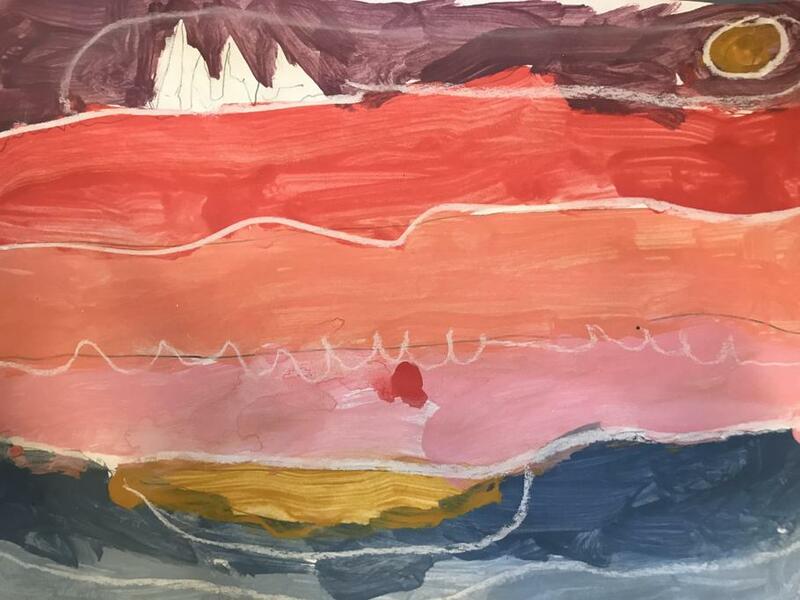 We have looked at his paintings and the Year 1 children used his work as an inspiration for their own masterpieces! 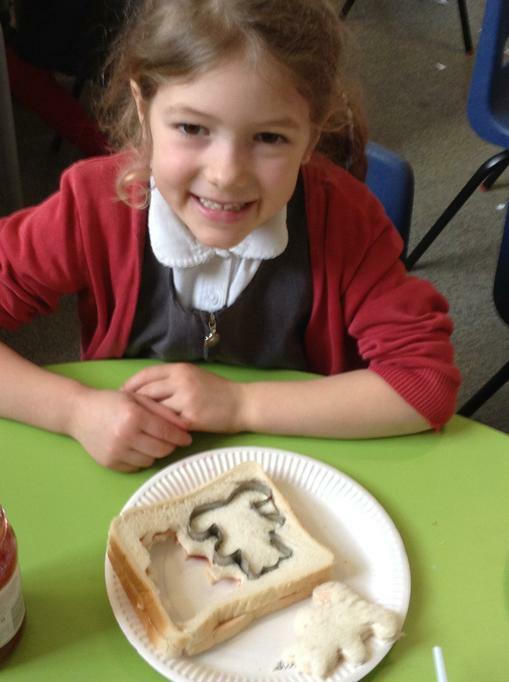 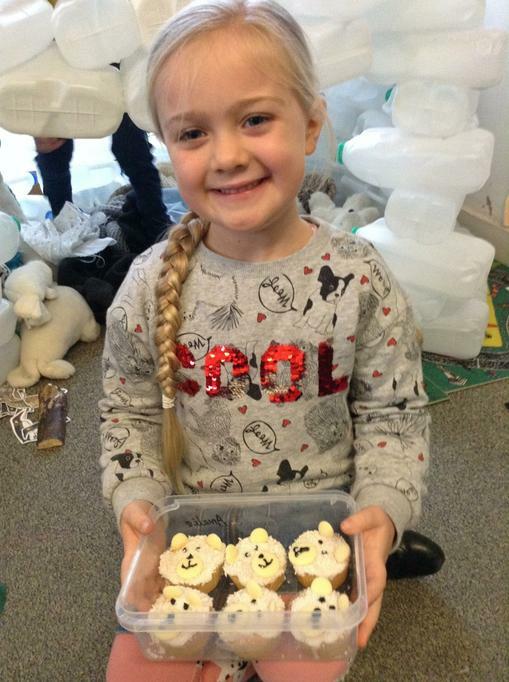 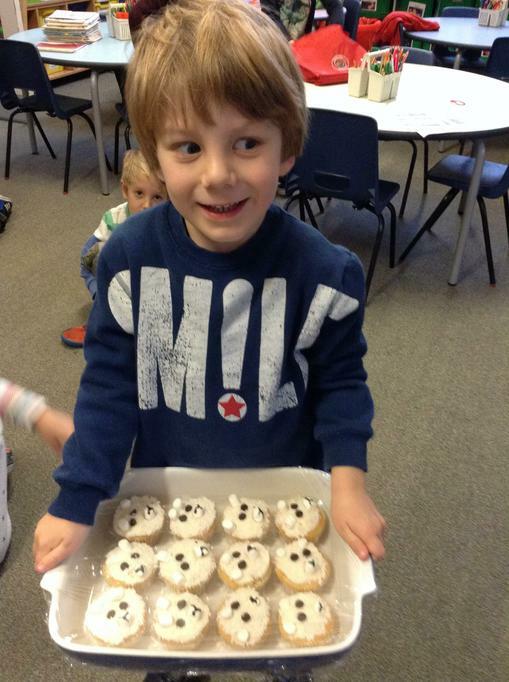 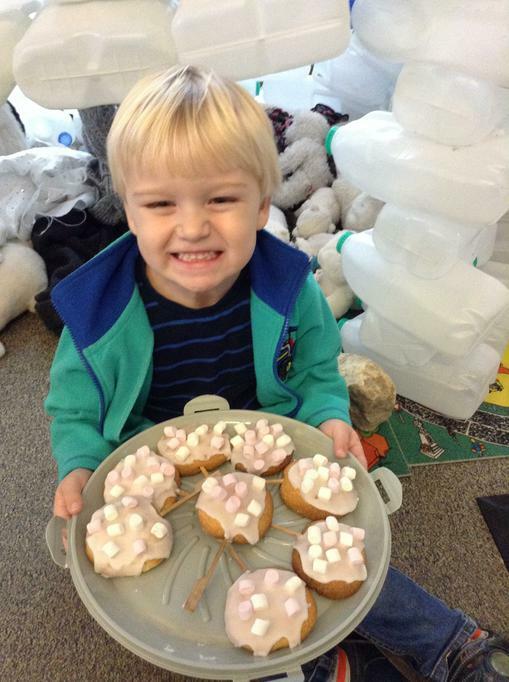 We would also like to thank Miss Slack who very kindly made Diamond Class a fantastic polar bear cake to celebrate! 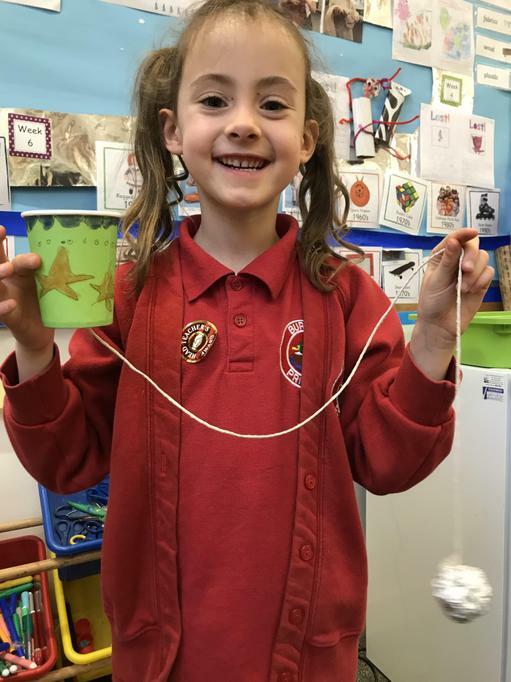 Today Diamond class had some very exciting visitors! 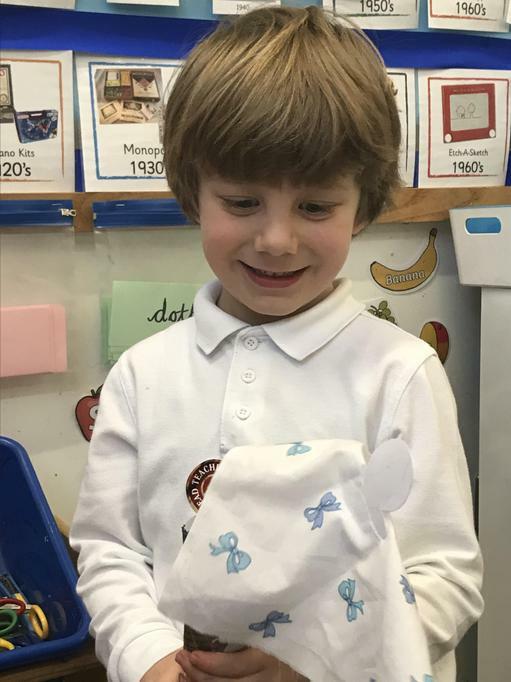 Mrs Shanks came into school to talk about her role as a vet. 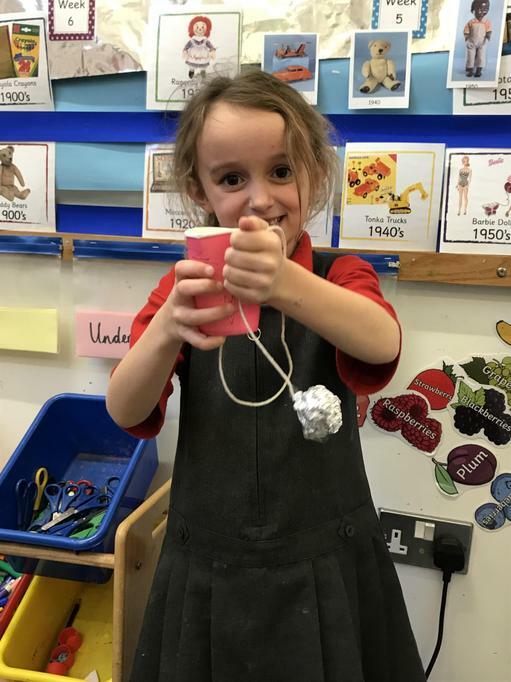 She brought Bess the dog with her and the children really enjoyed learning all about being a vet and even got to use a stethoscope to listen to Bess's heart. 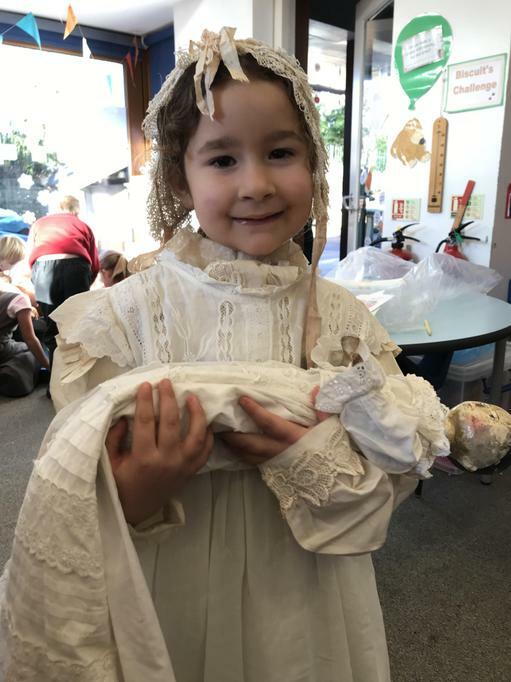 We visited the local Church and found out all about Christianity! 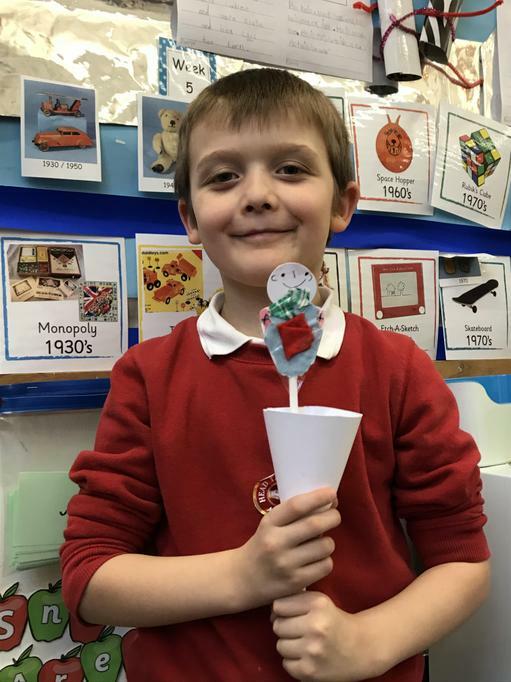 We went to the Town Hall and even met the Mayor! 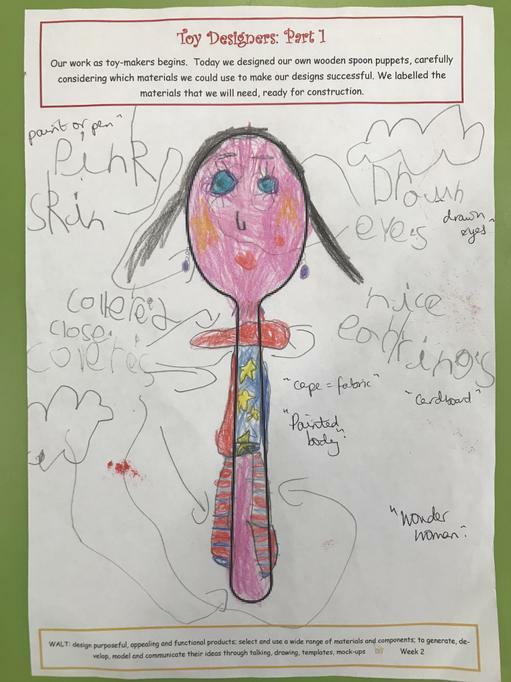 We have been drawing self portraits and thinking about what we are good at. 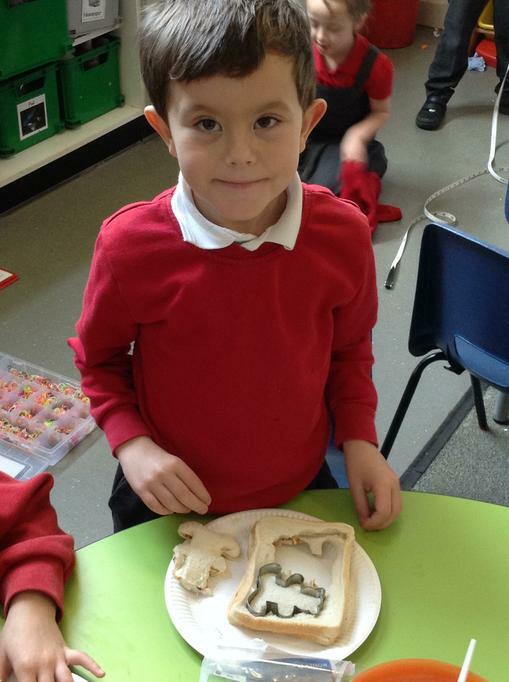 It's great to celebrate our individuality! 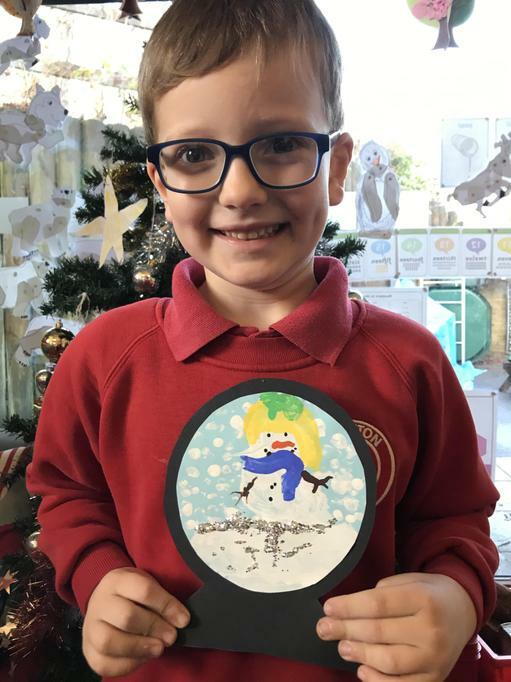 We were inspired by the stained glass windows in the Church so we created our own! 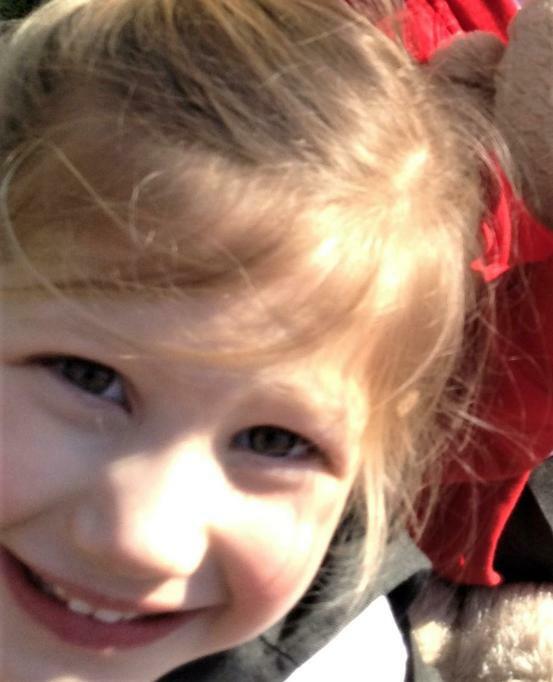 They're beautiful, especially when the sun shines through them!